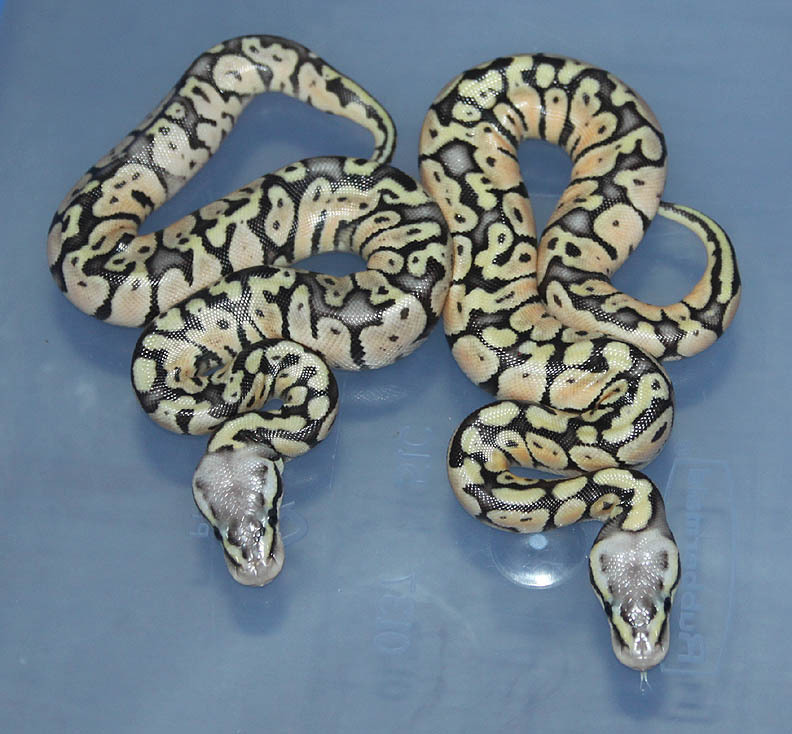 Description: Pastel DH OG/GS 1/11 x DH OG/GS 1/07. 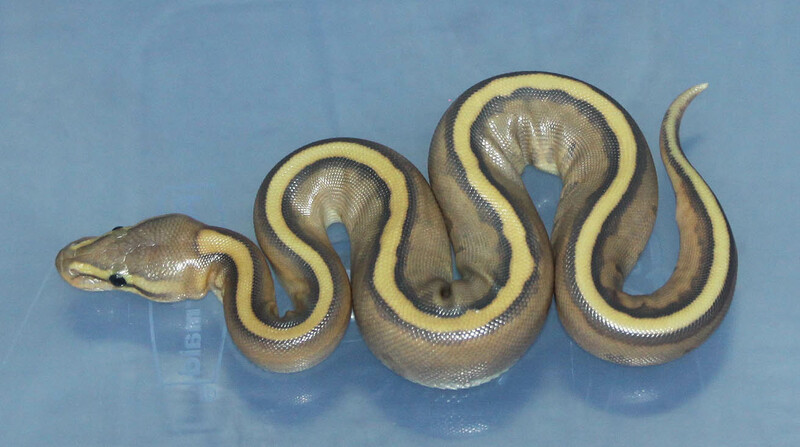 I finally have an Orange Ghost Genetic Stripe male! 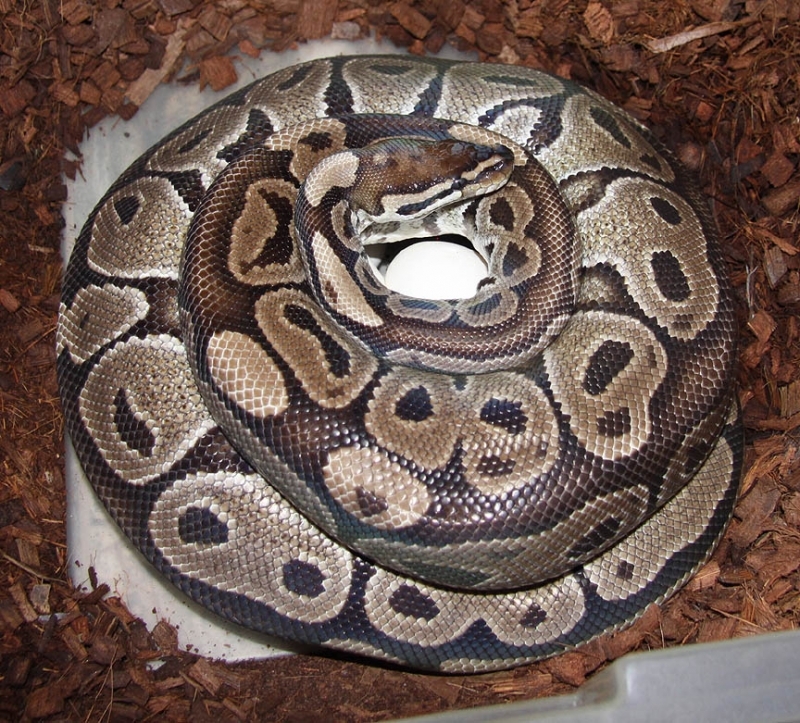 I produced a male in 2010 but, unfortunately he was dead in the egg :( I produced a female in 2011 but I've been waiting for another male. 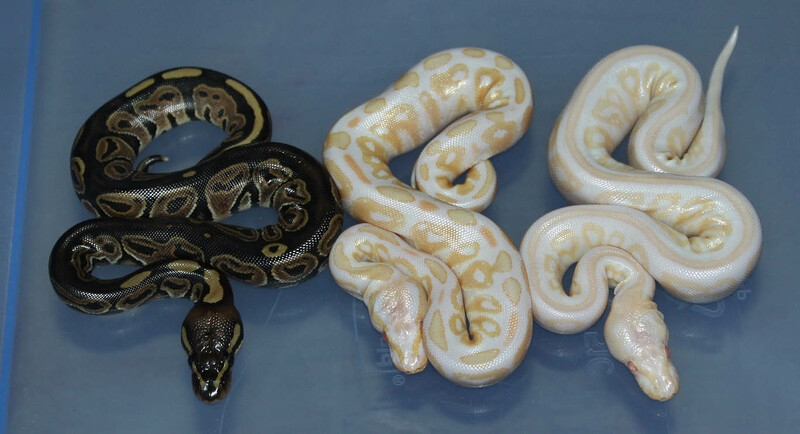 These guys have been a long time in the making for me! 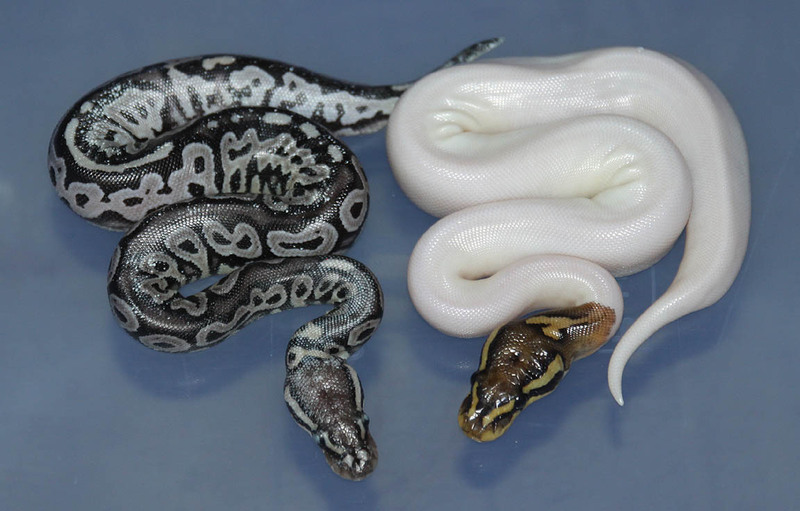 The Orange Ghost Genetic Stripe was the first one to crawl out of the egg and is in shed in these pics. 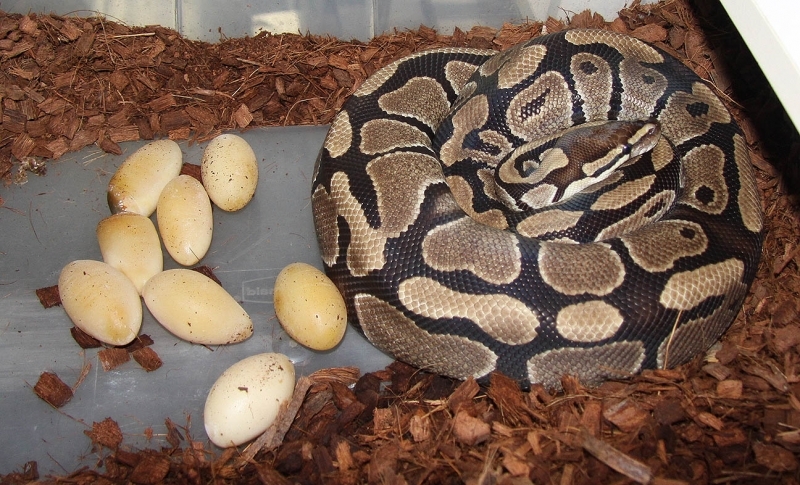 If you are interested in animals from clutch #201 please email or call 519-824-7377. 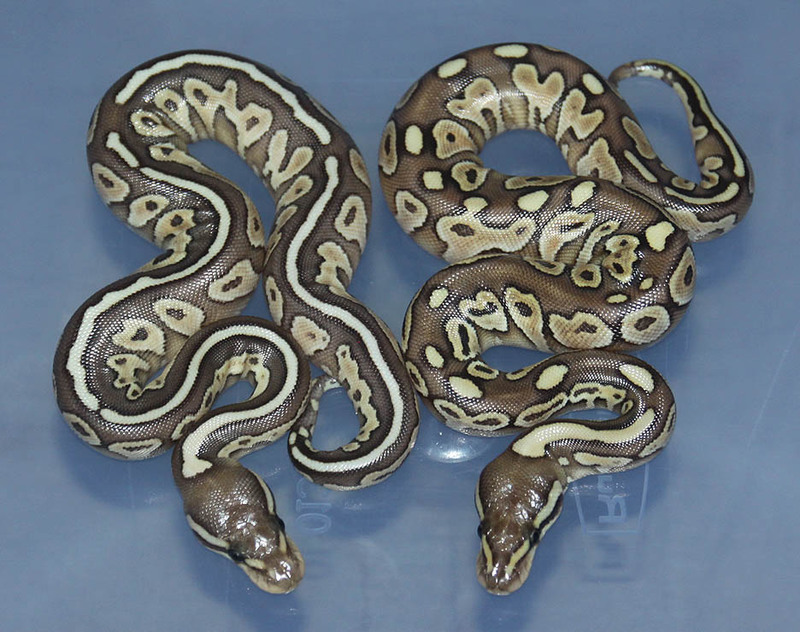 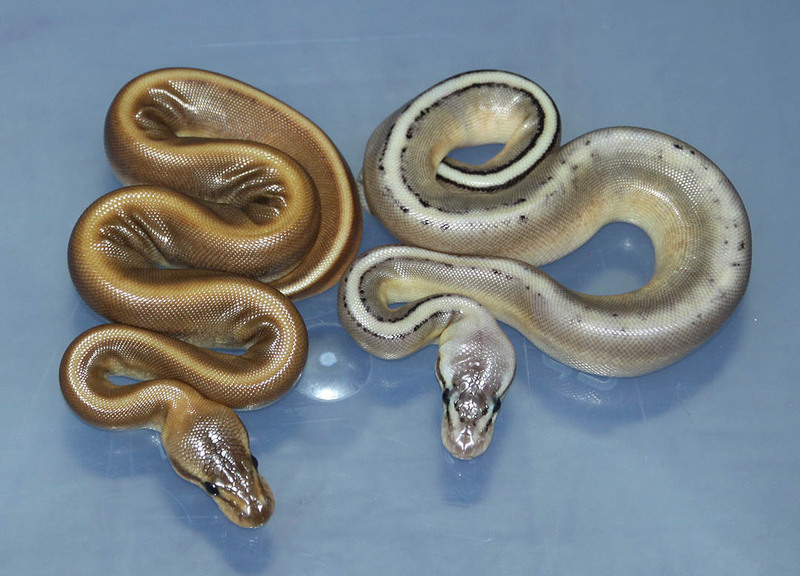 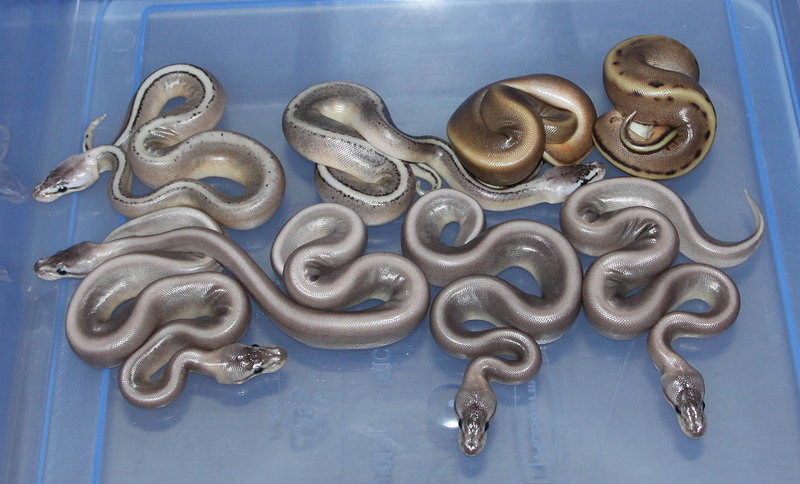 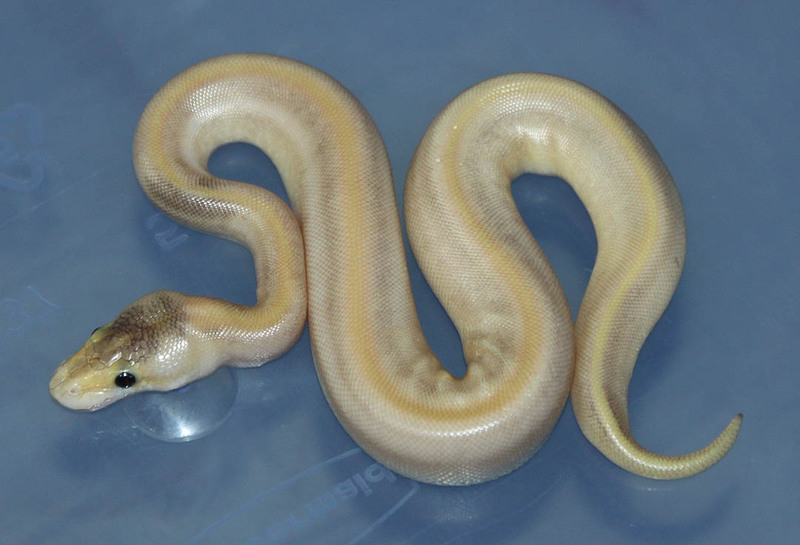 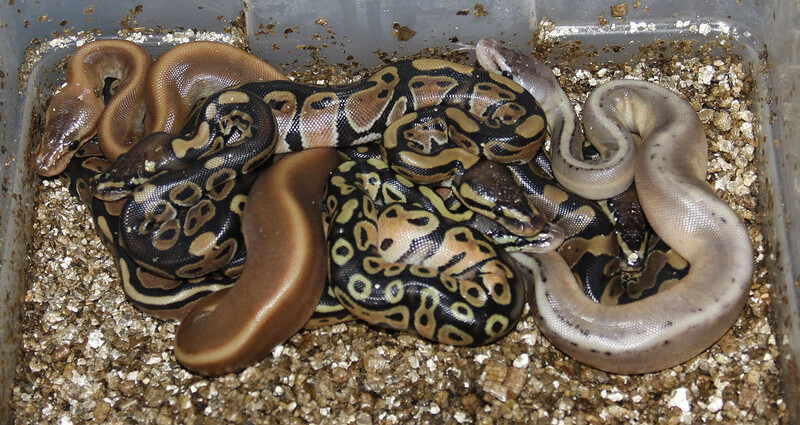 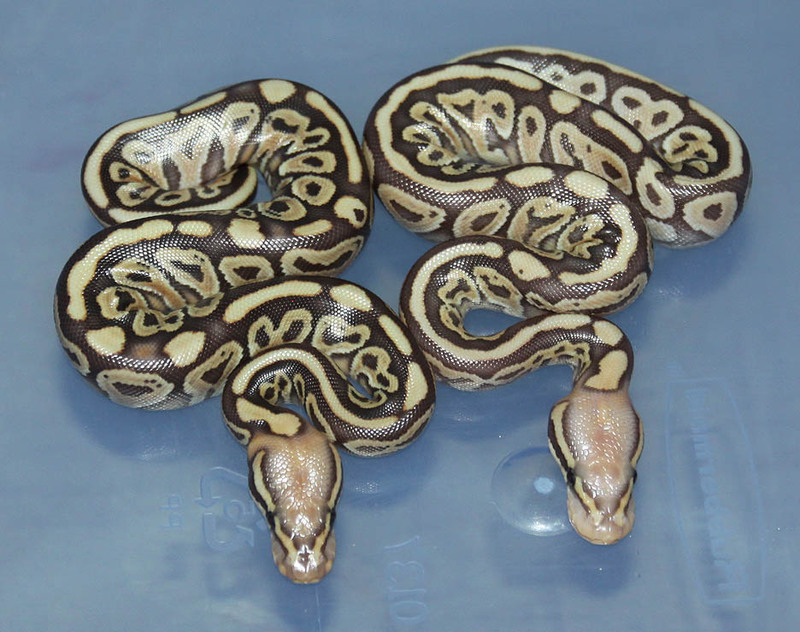 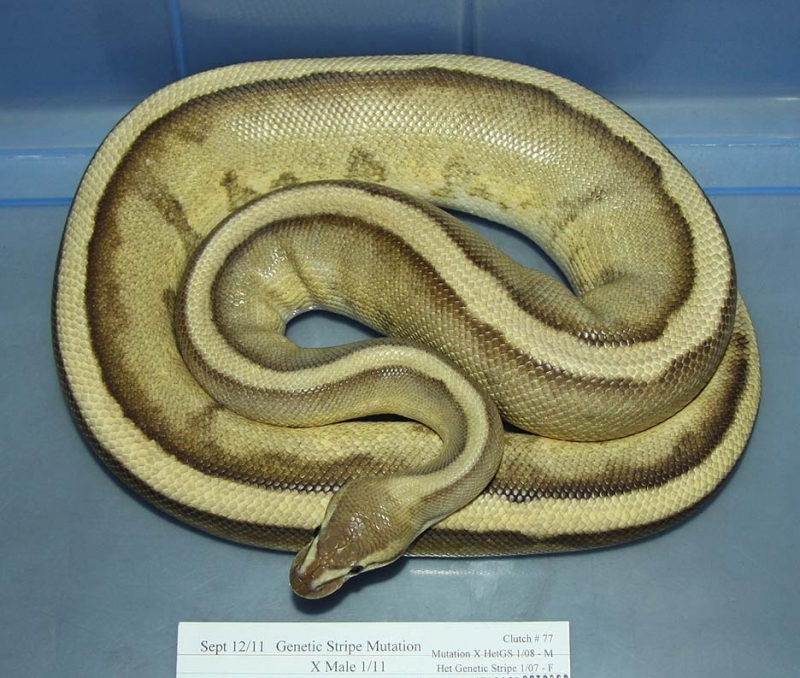 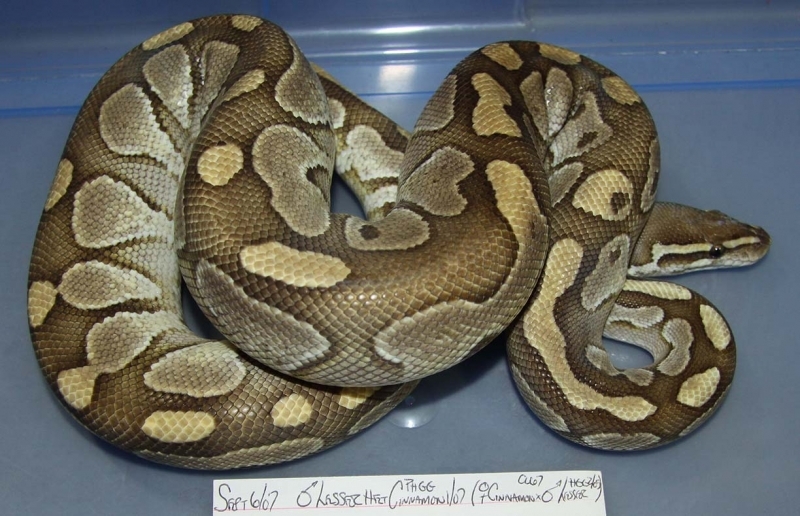 Description: Pastel Caramel Het RA 1/11 x Het RA Het Caramel 1/09. 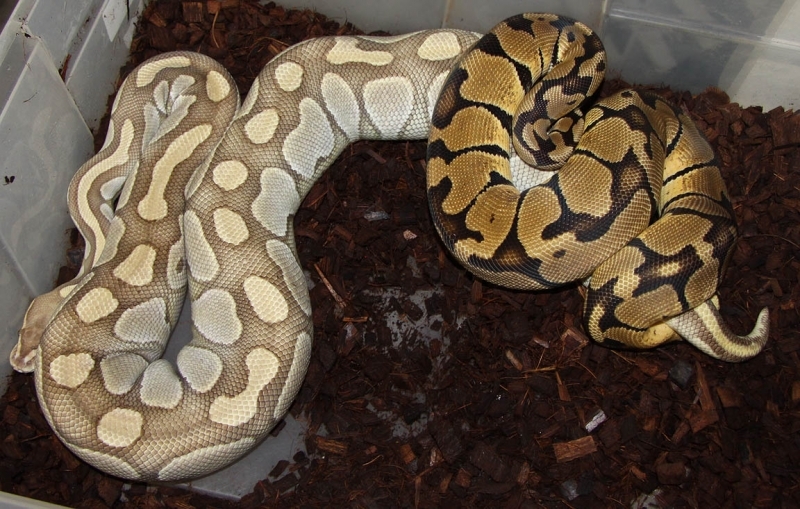 If you are interested in animals from clutch #202 please email or call 519-824-7377. 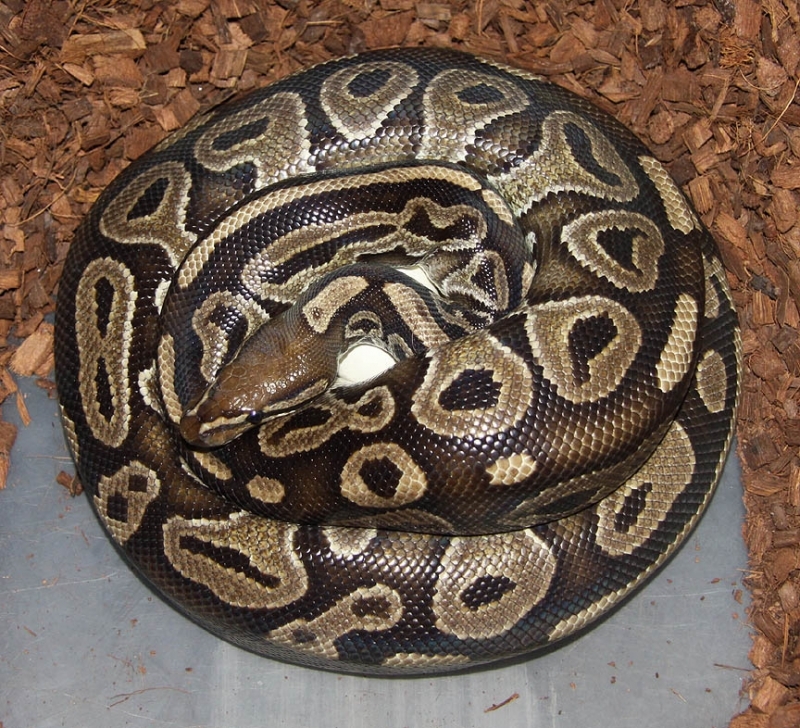 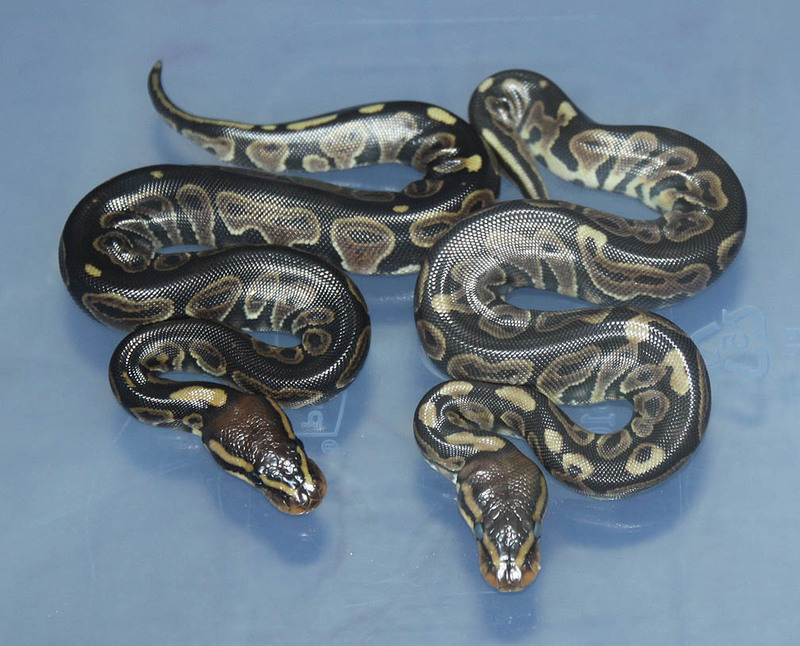 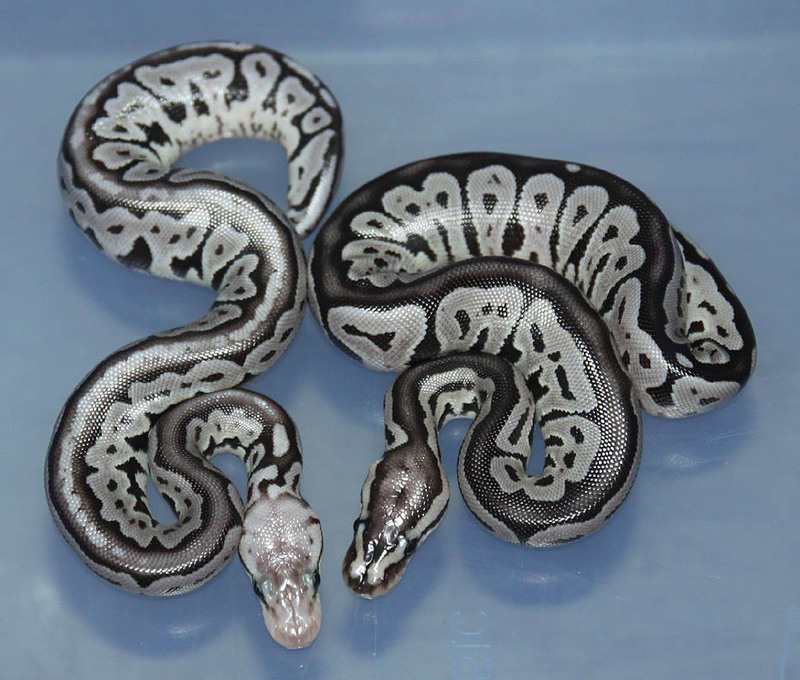 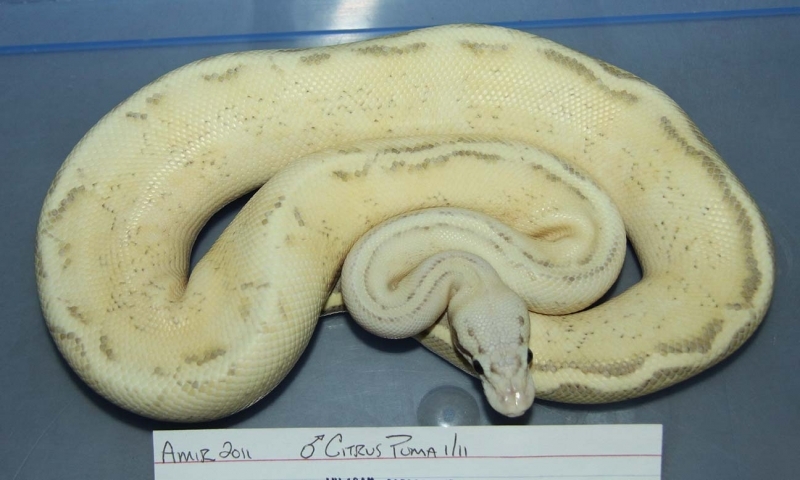 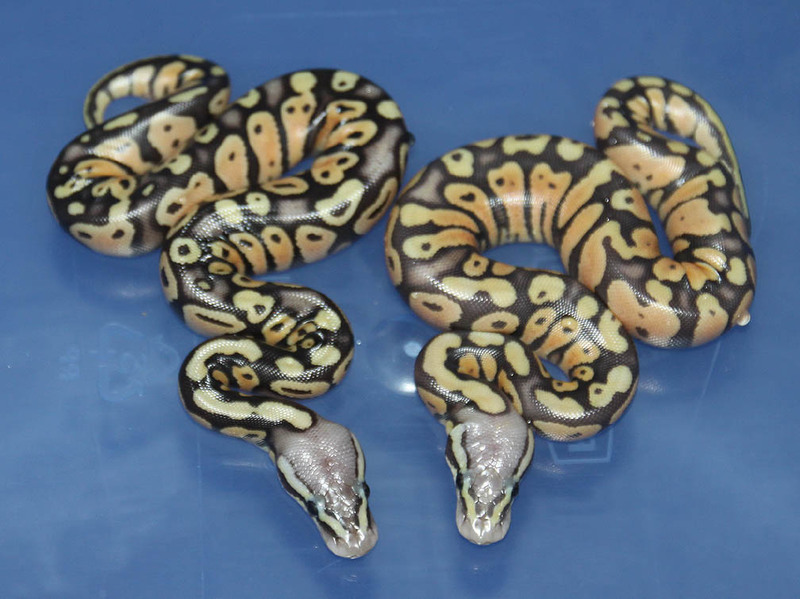 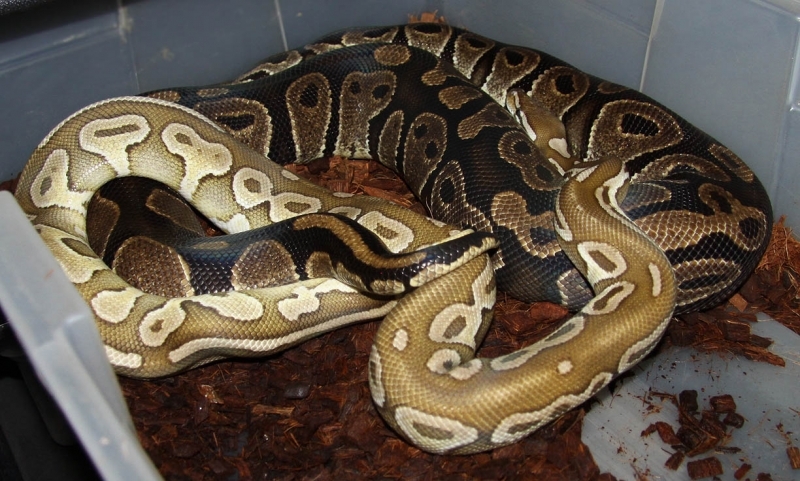 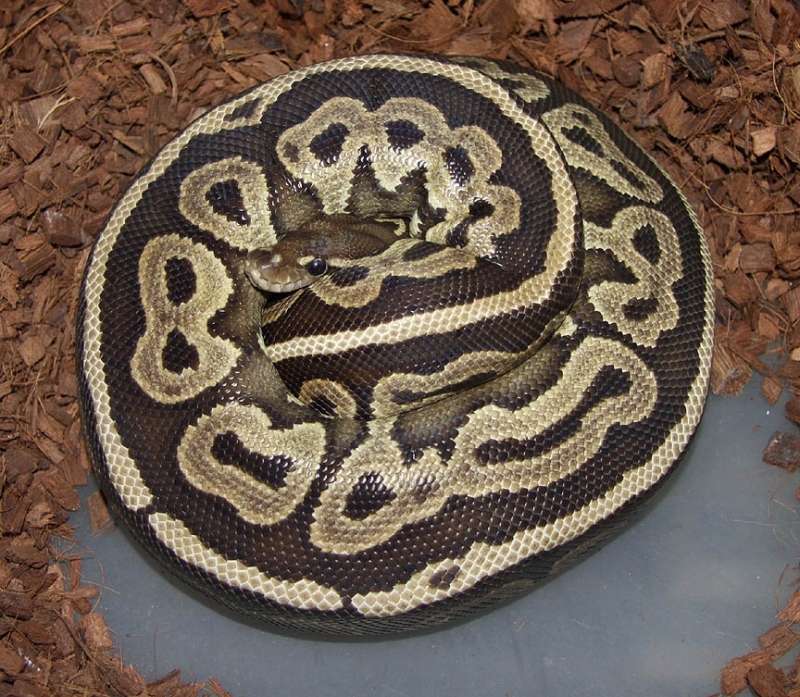 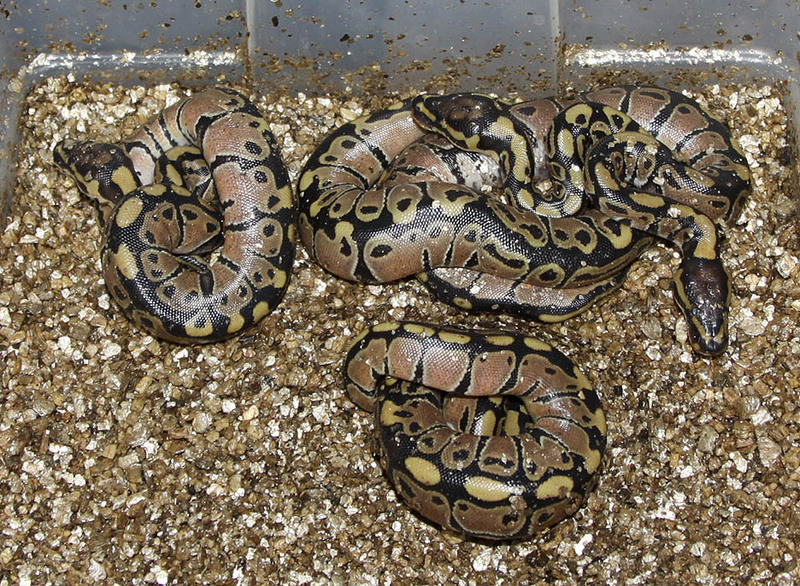 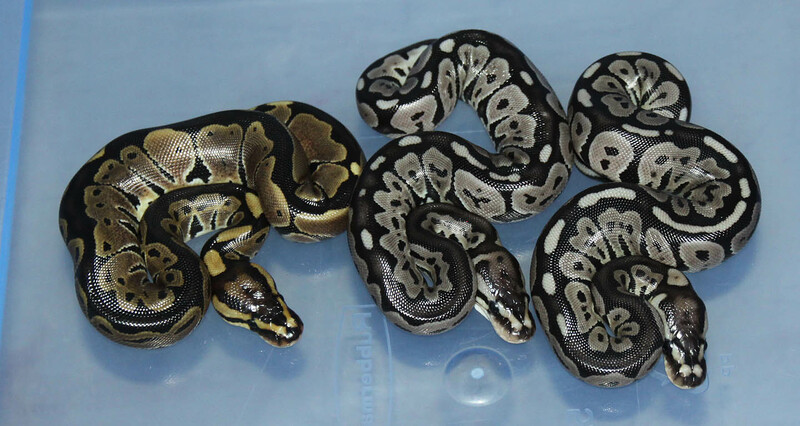 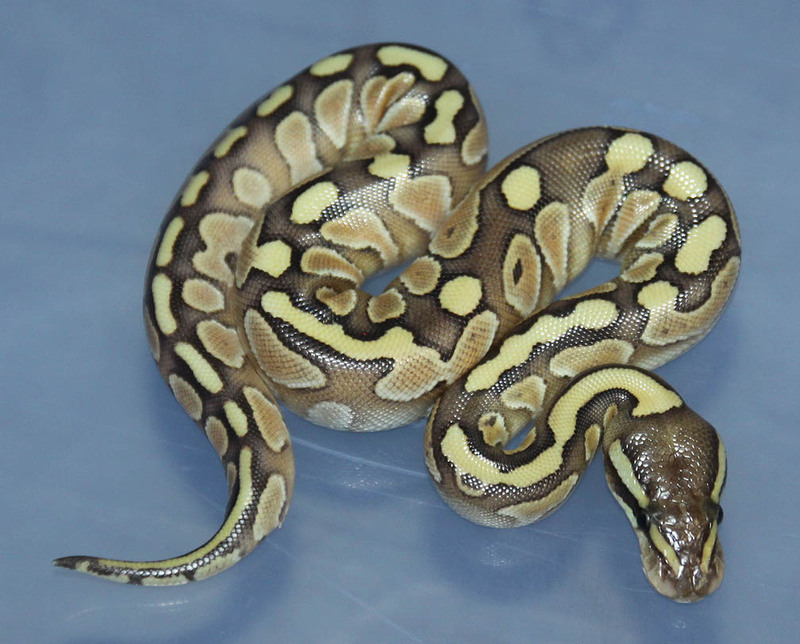 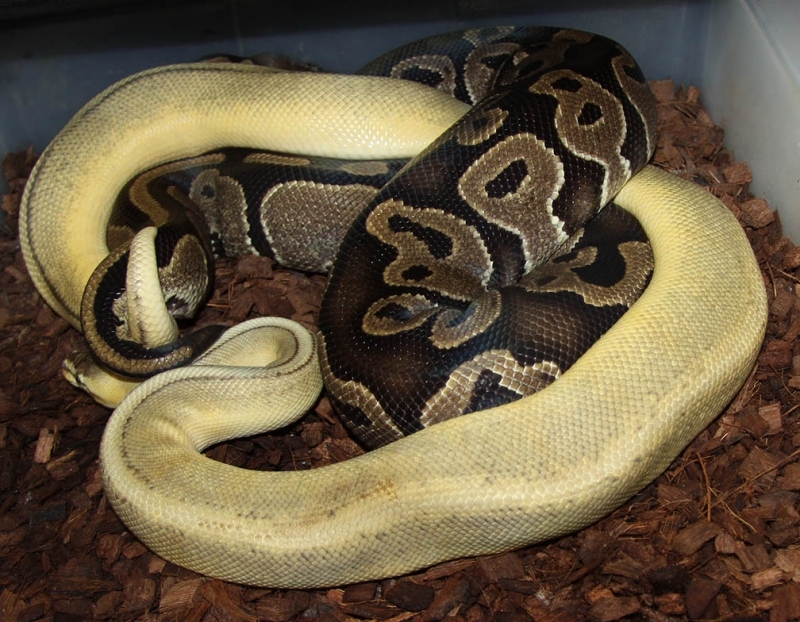 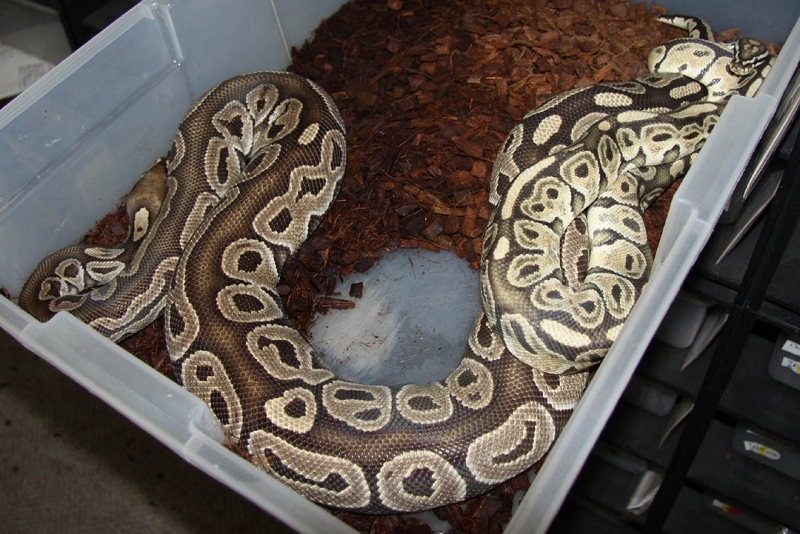 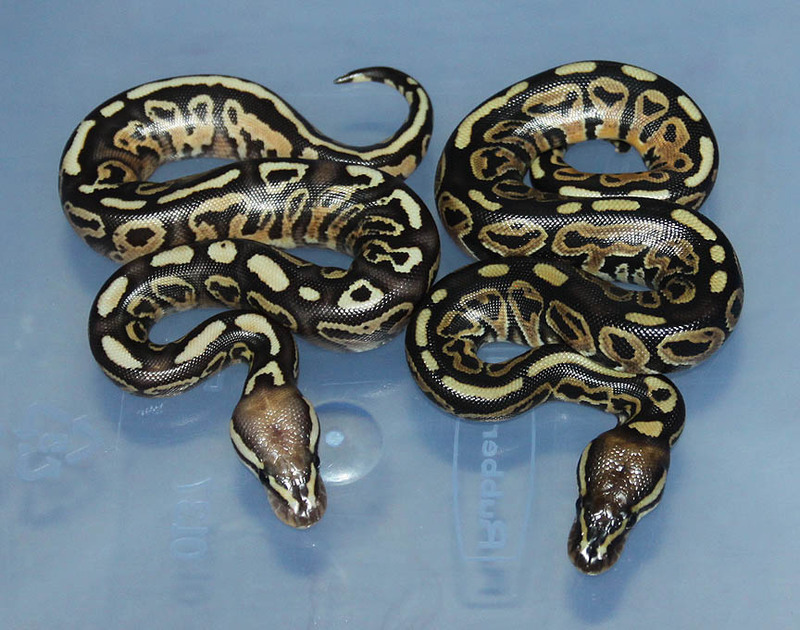 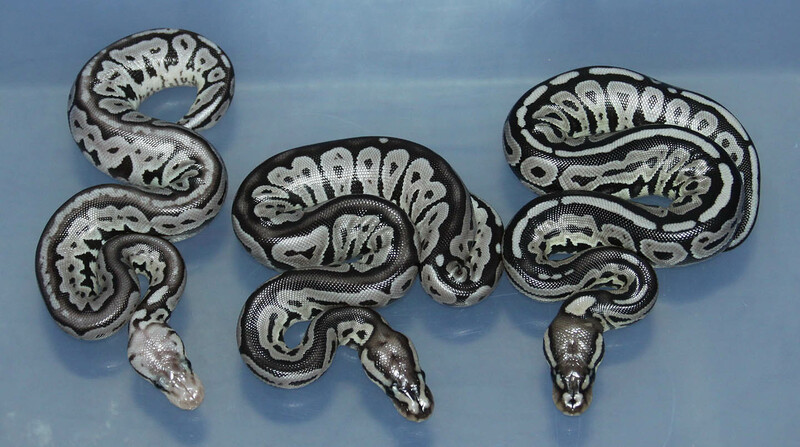 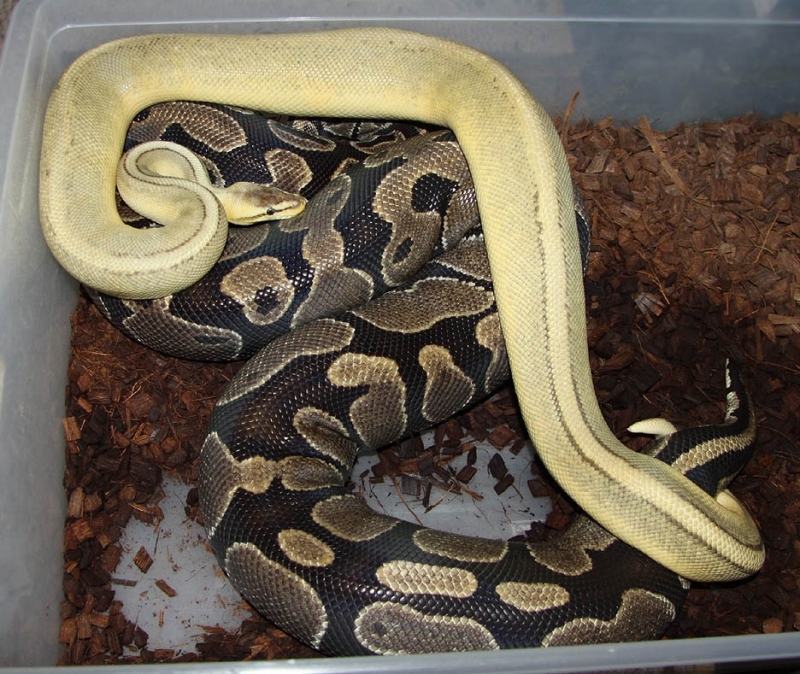 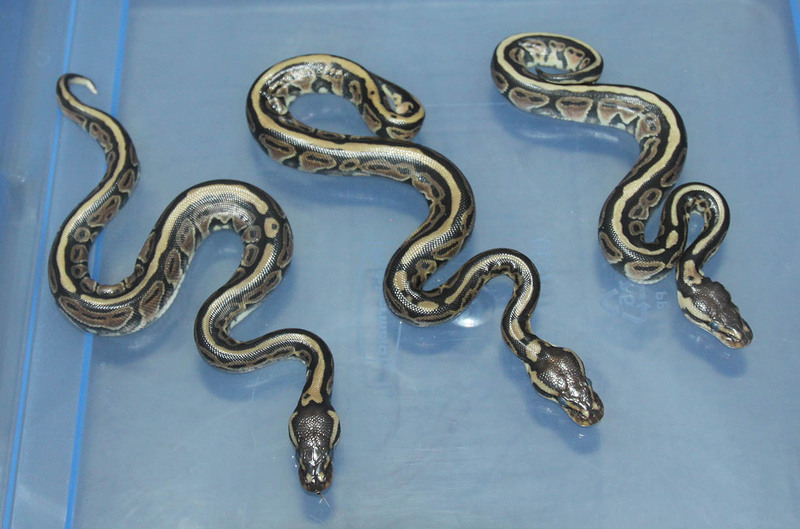 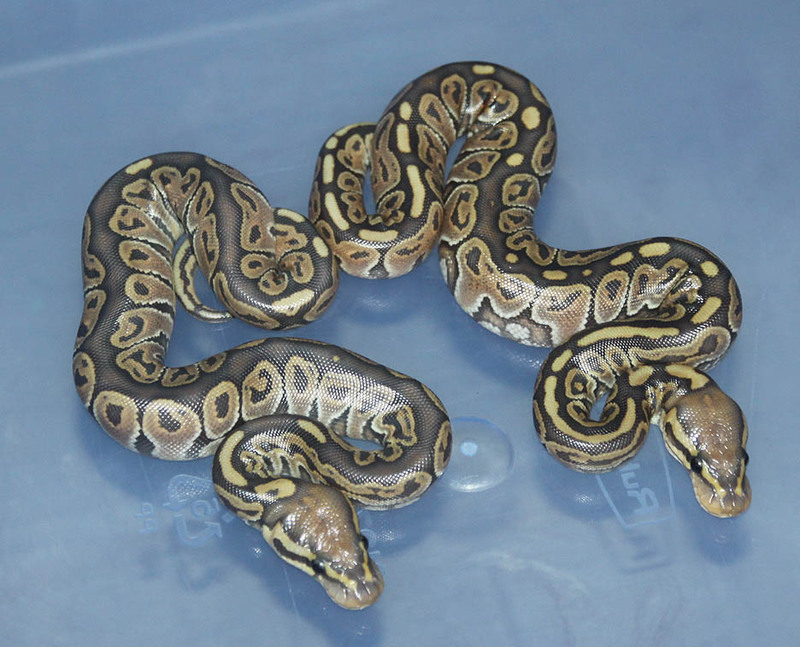 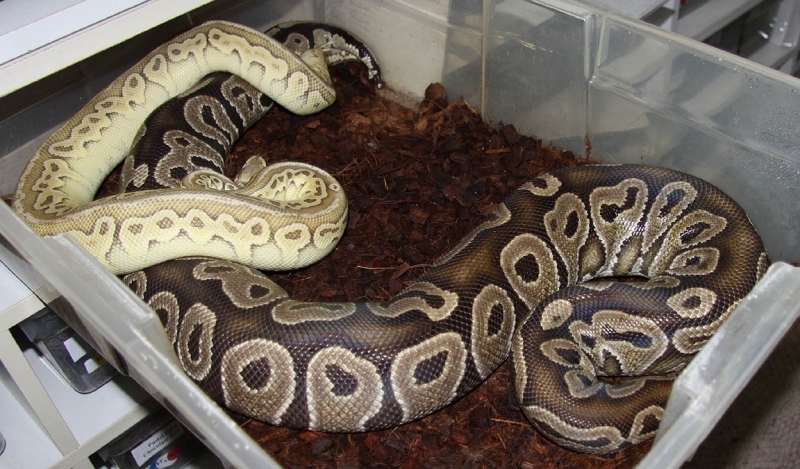 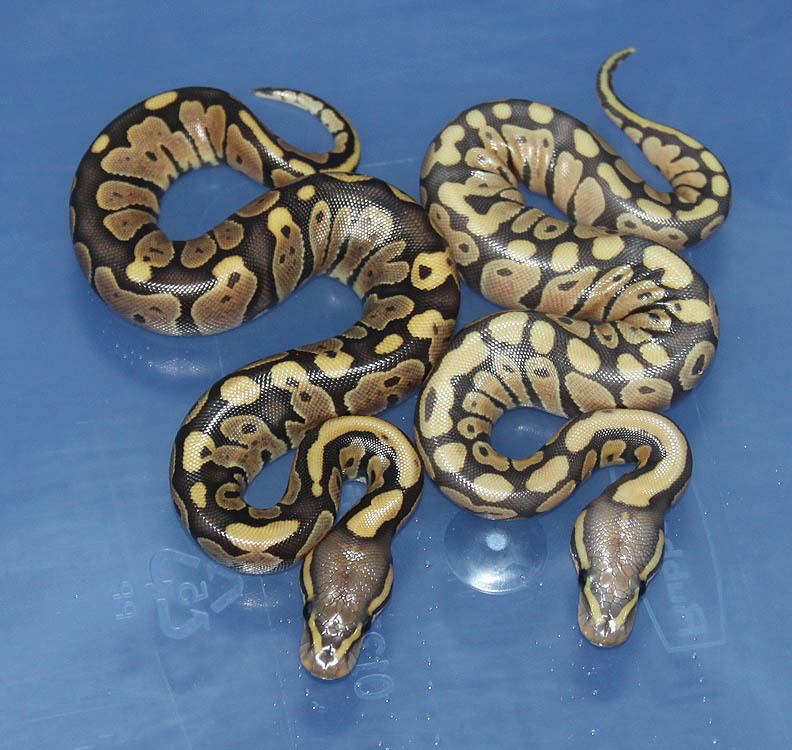 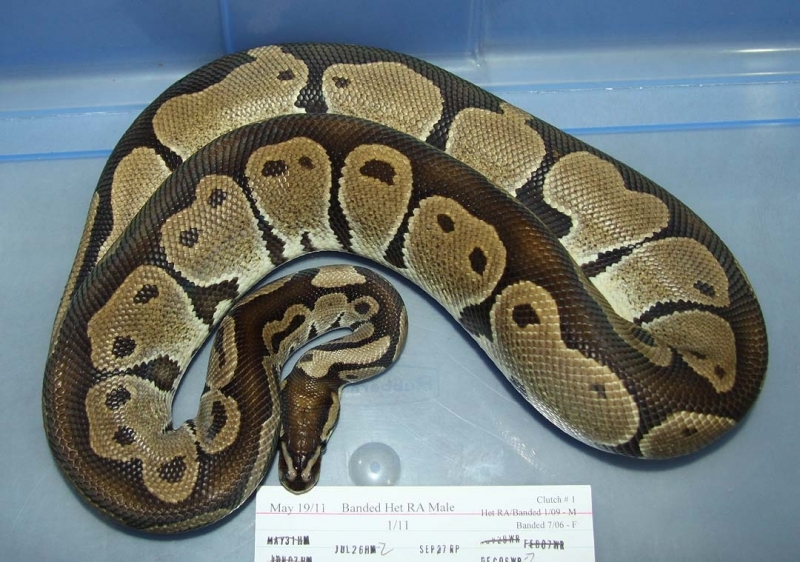 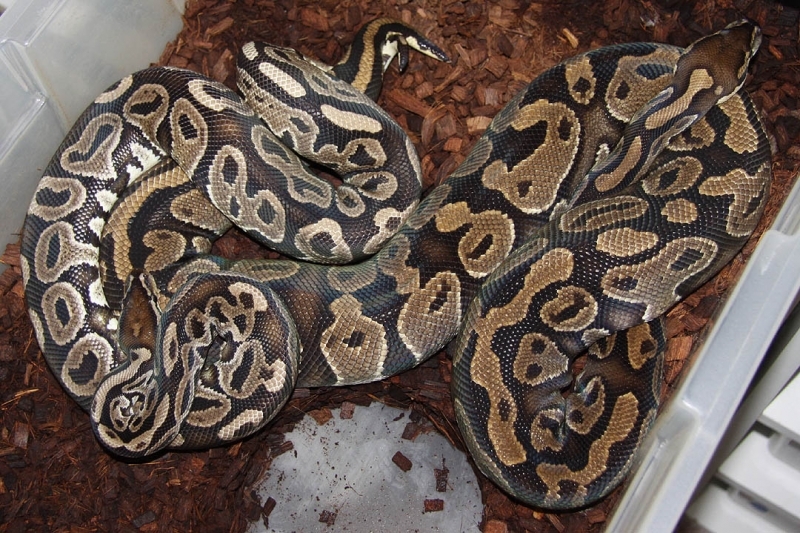 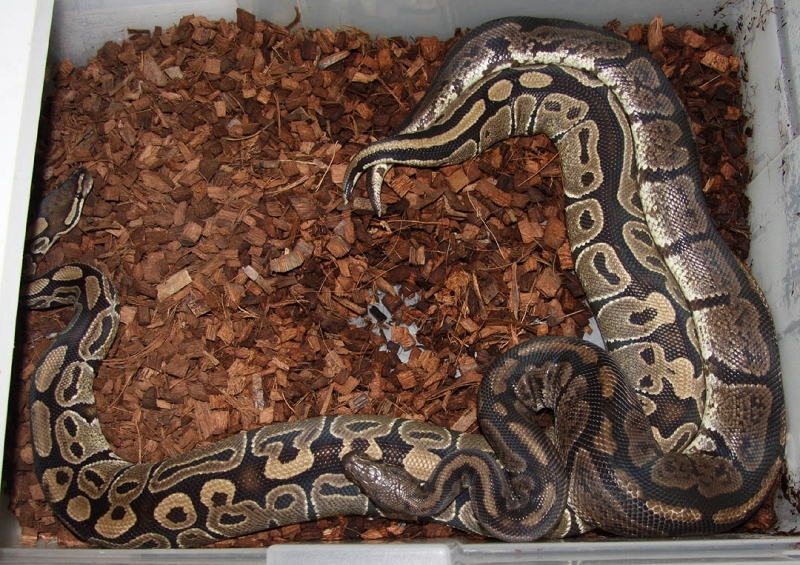 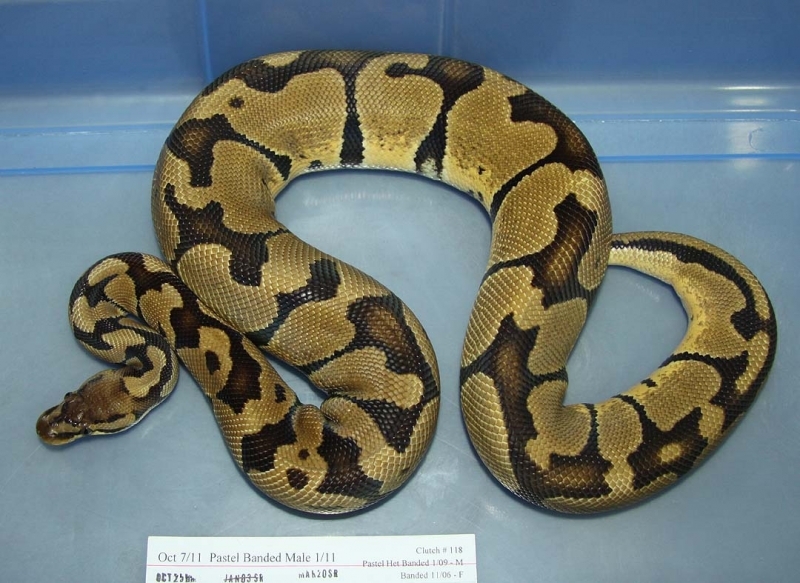 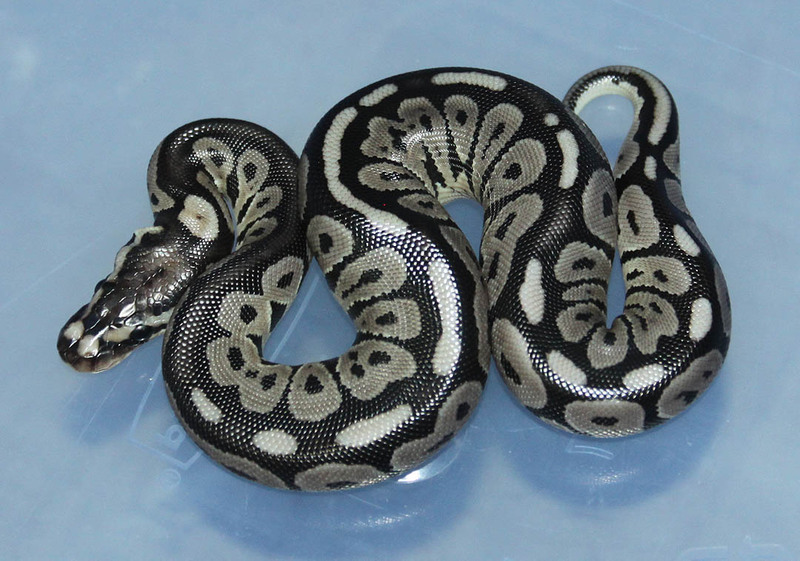 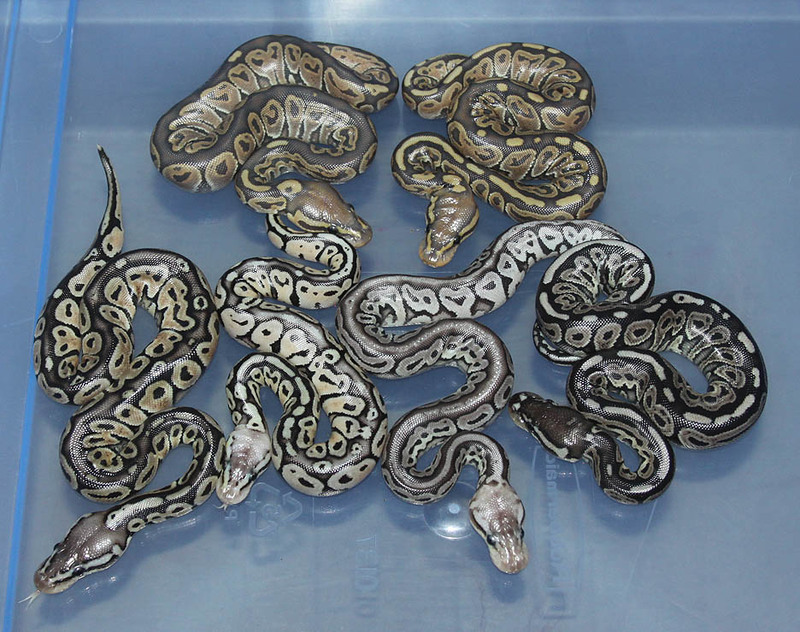 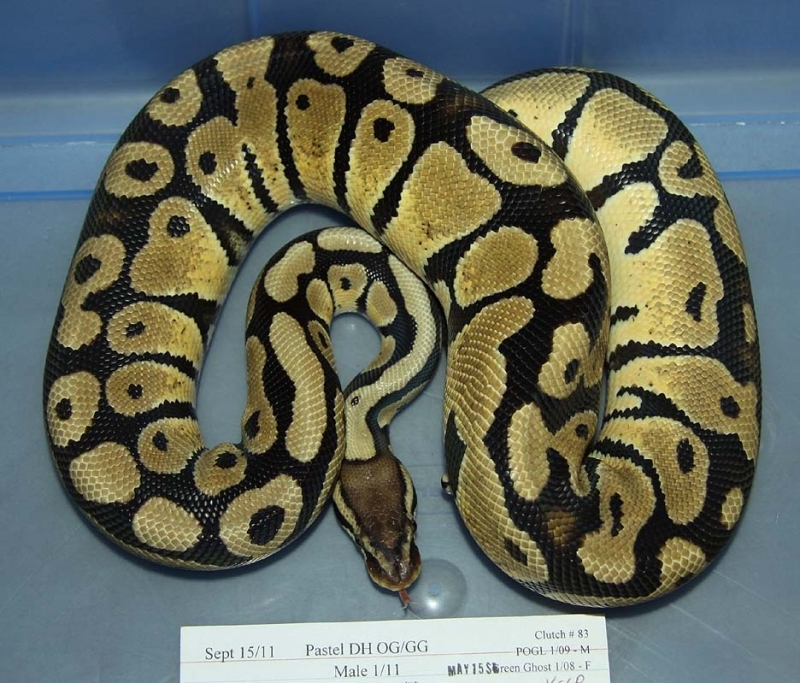 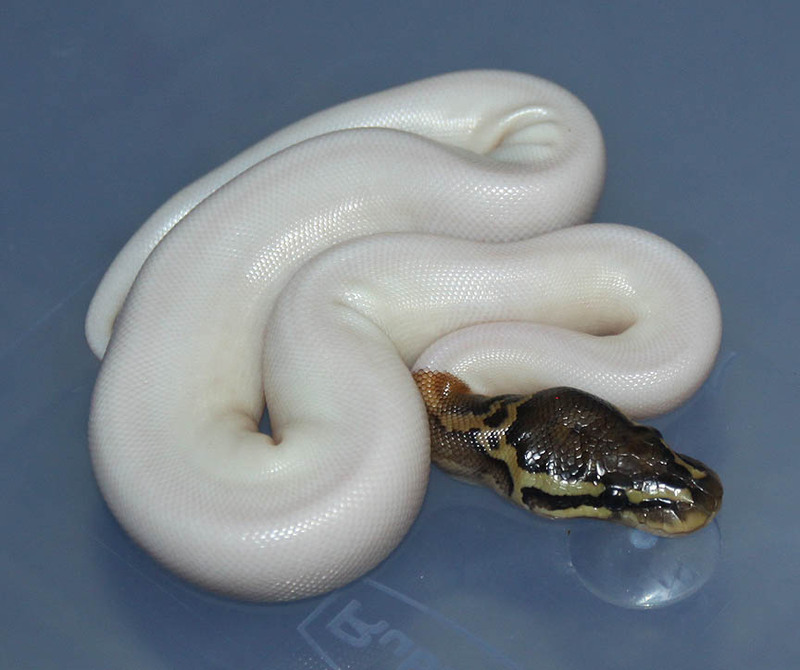 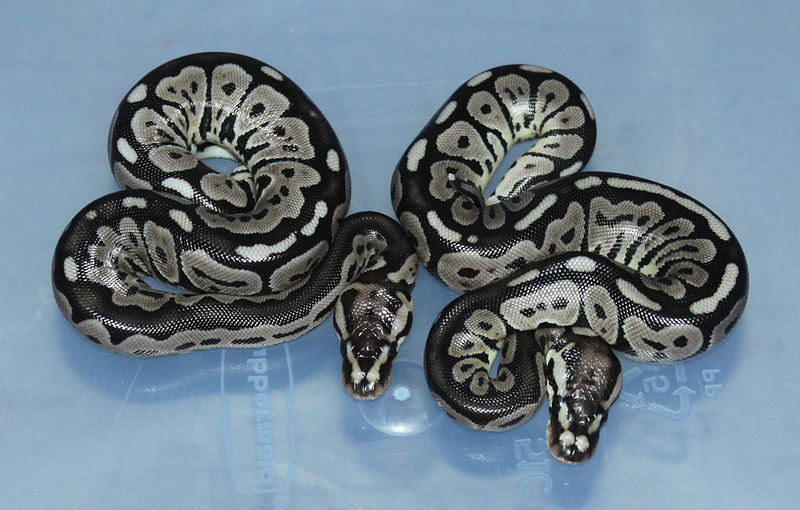 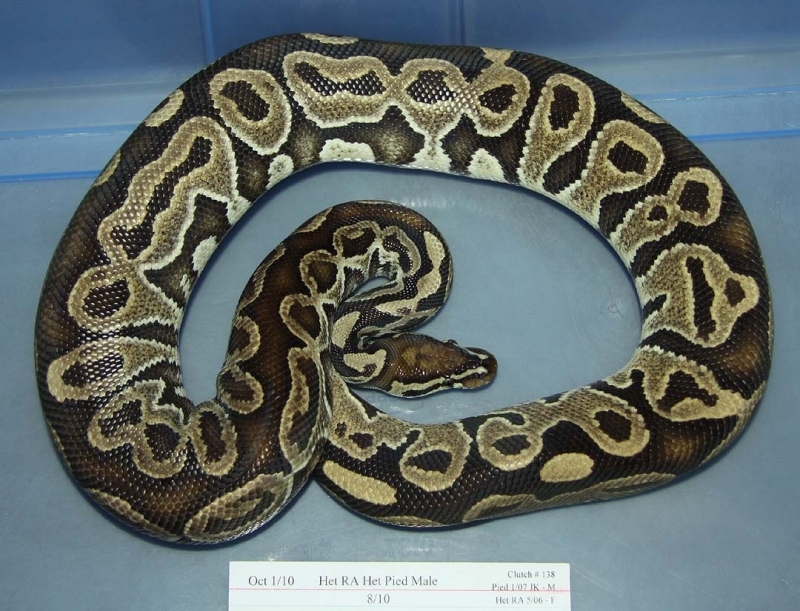 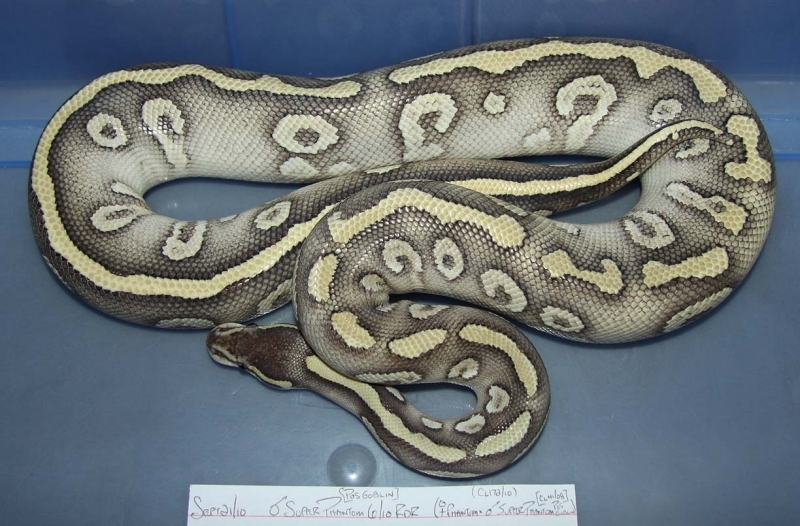 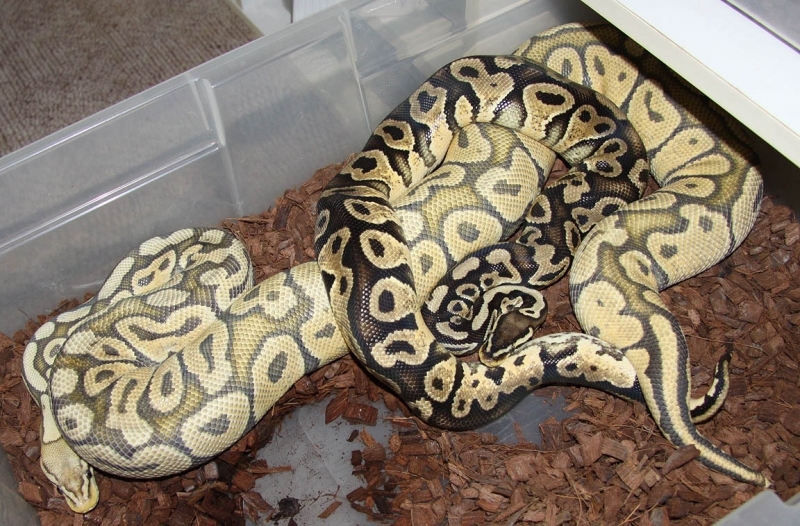 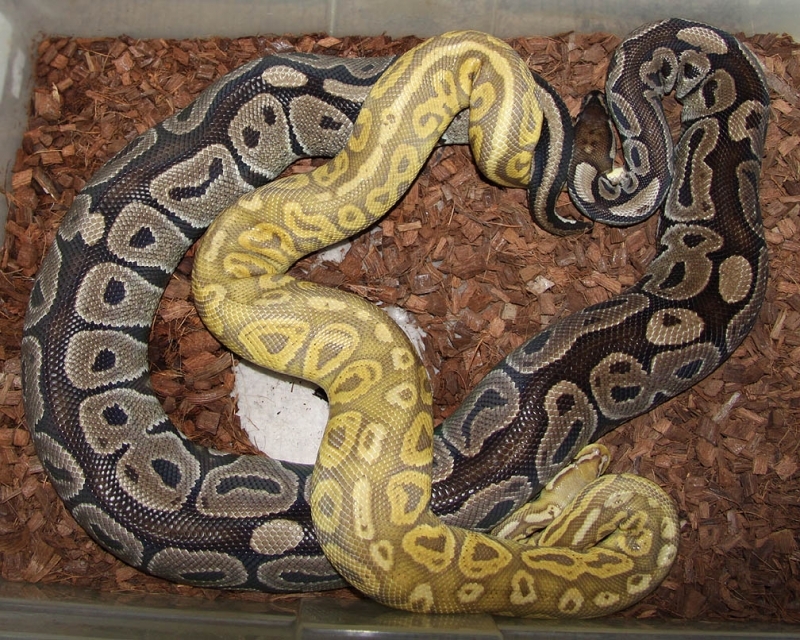 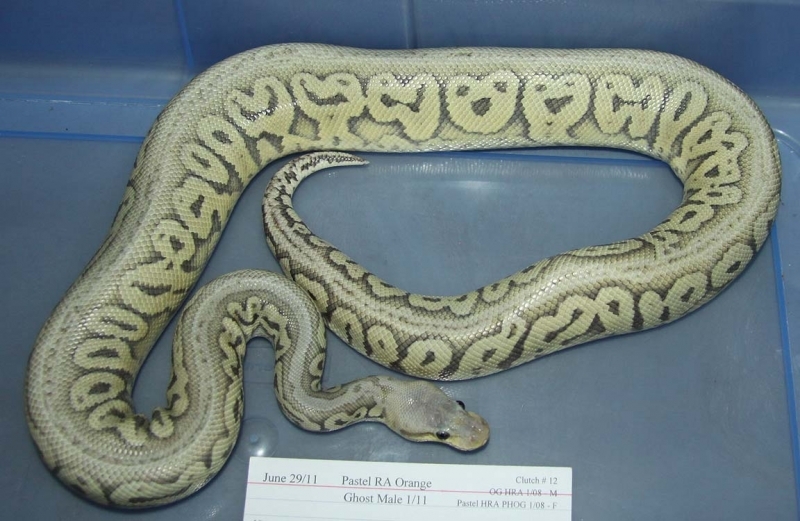 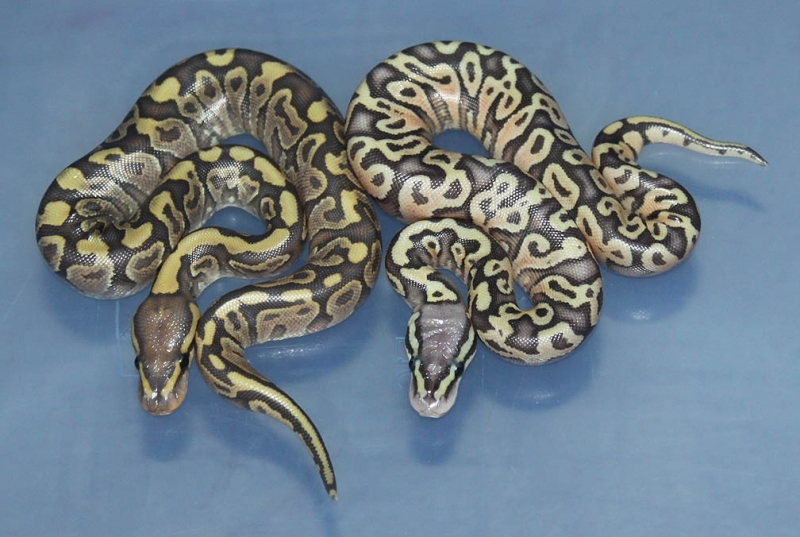 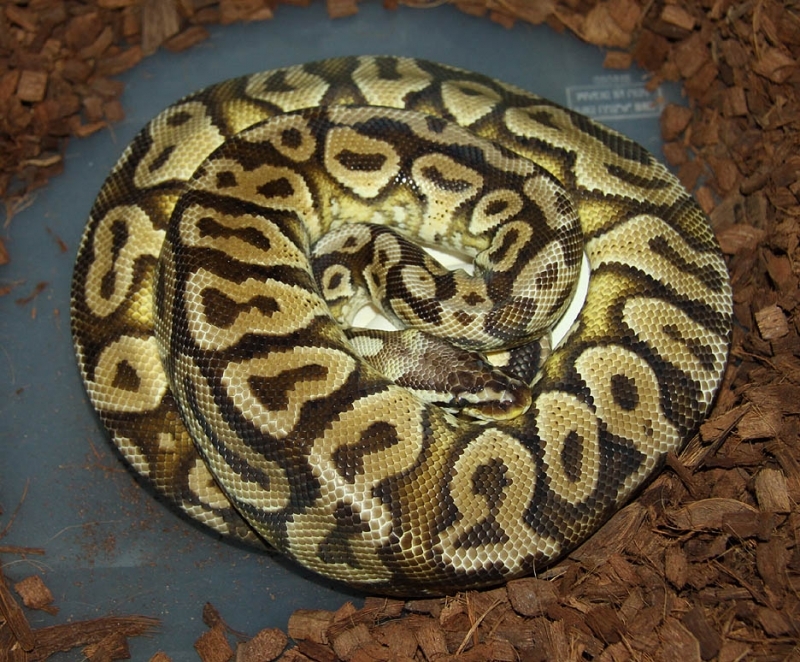 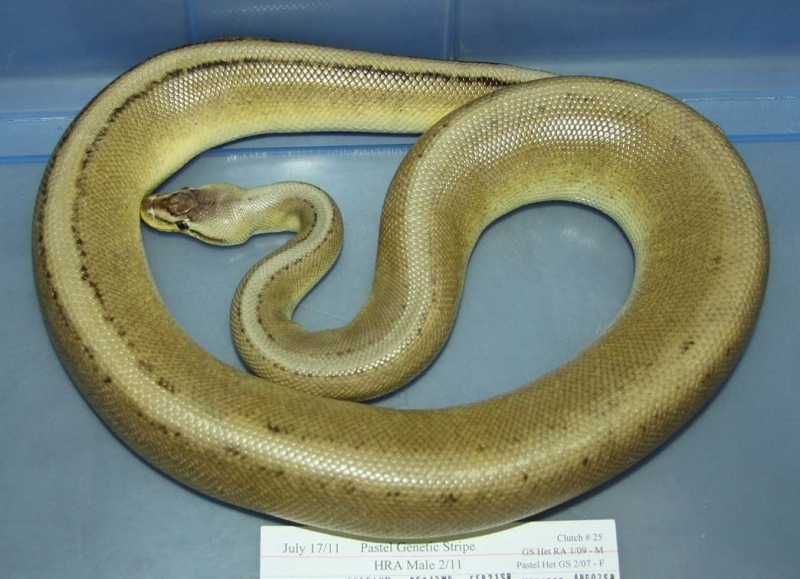 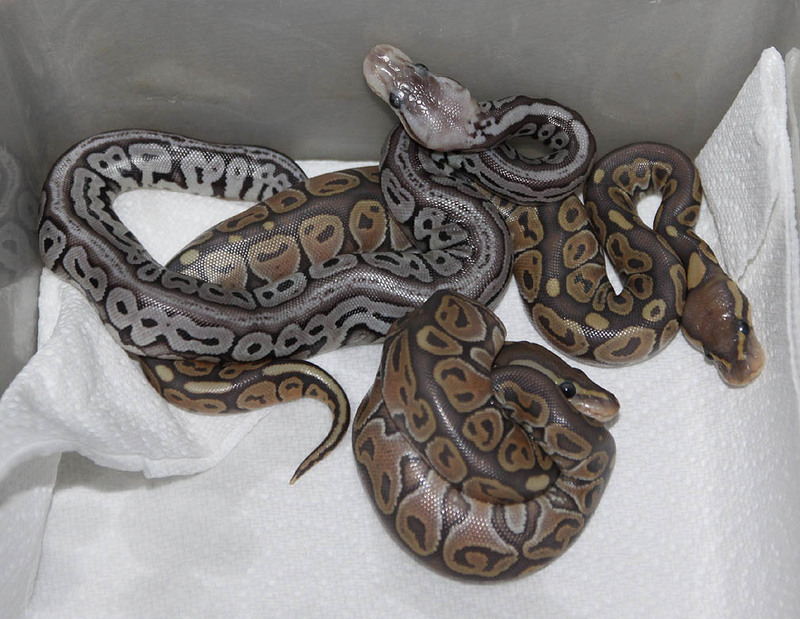 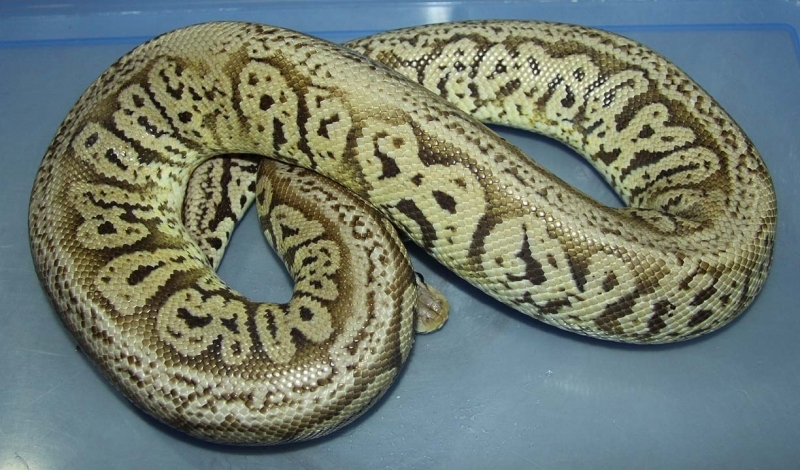 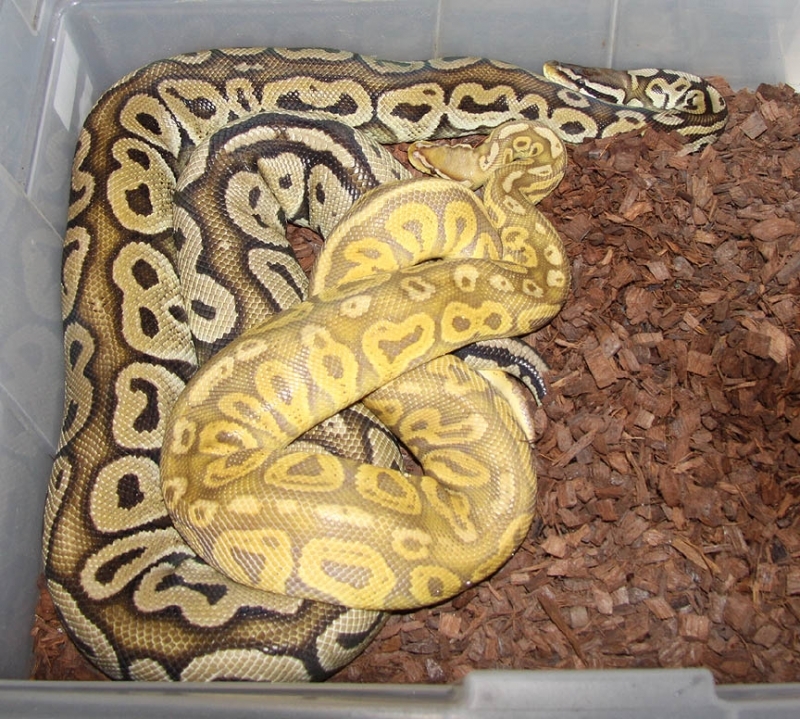 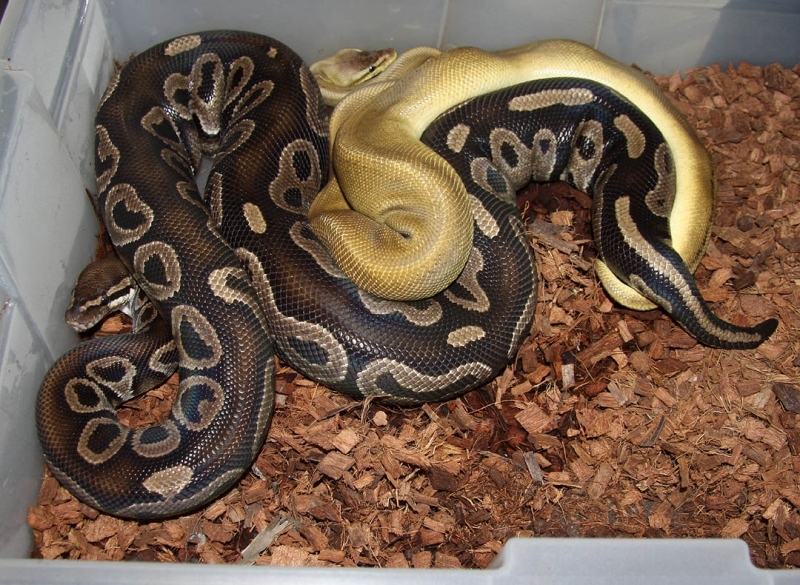 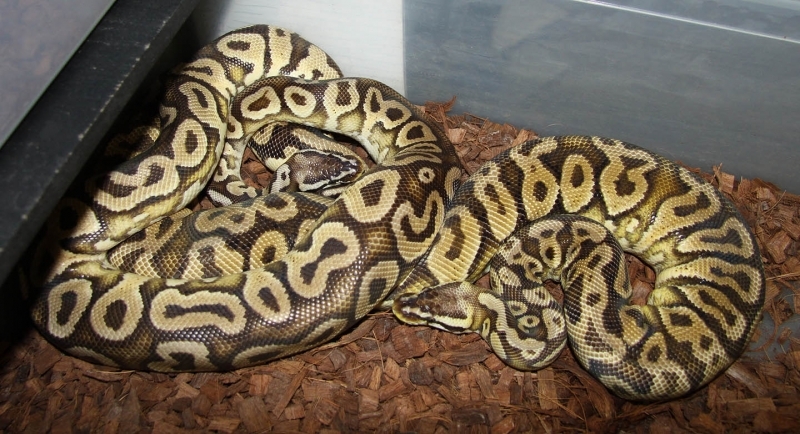 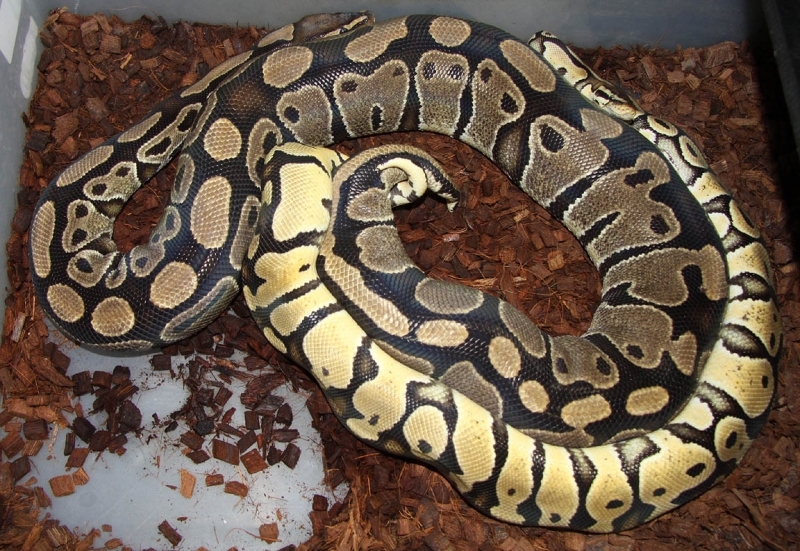 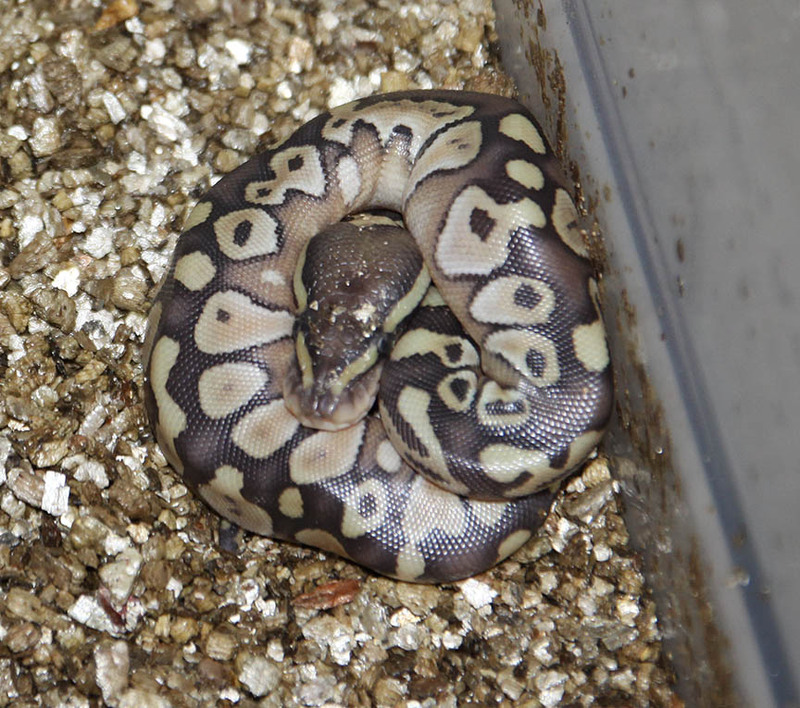 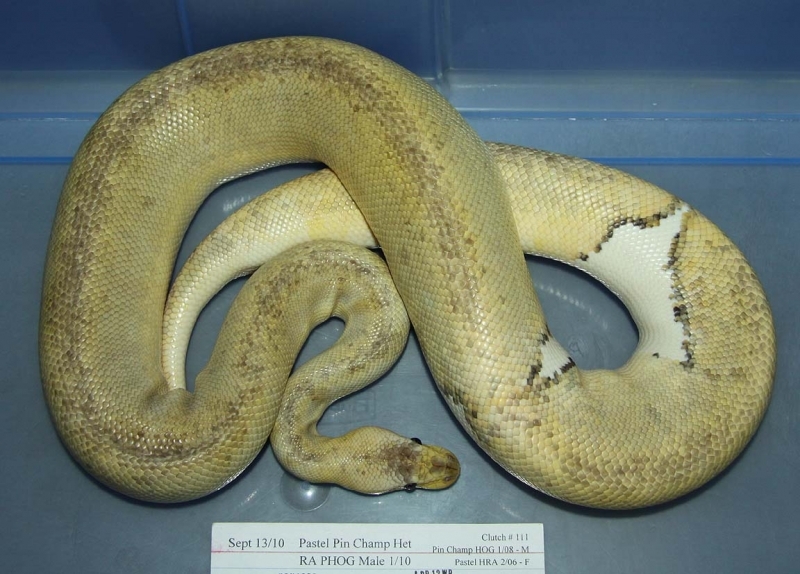 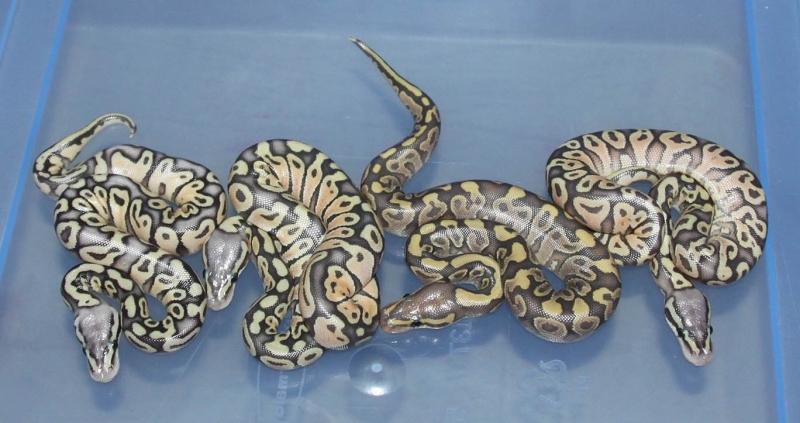 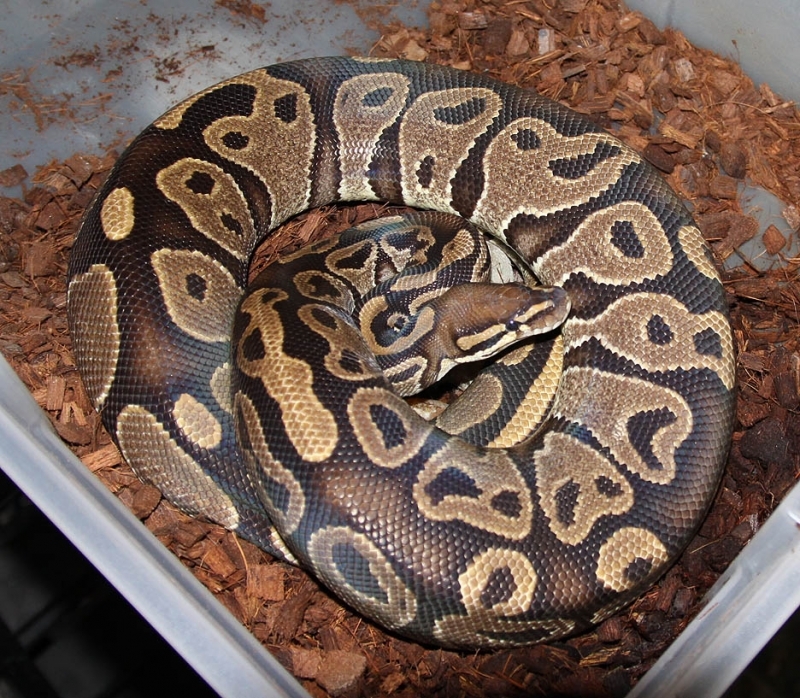 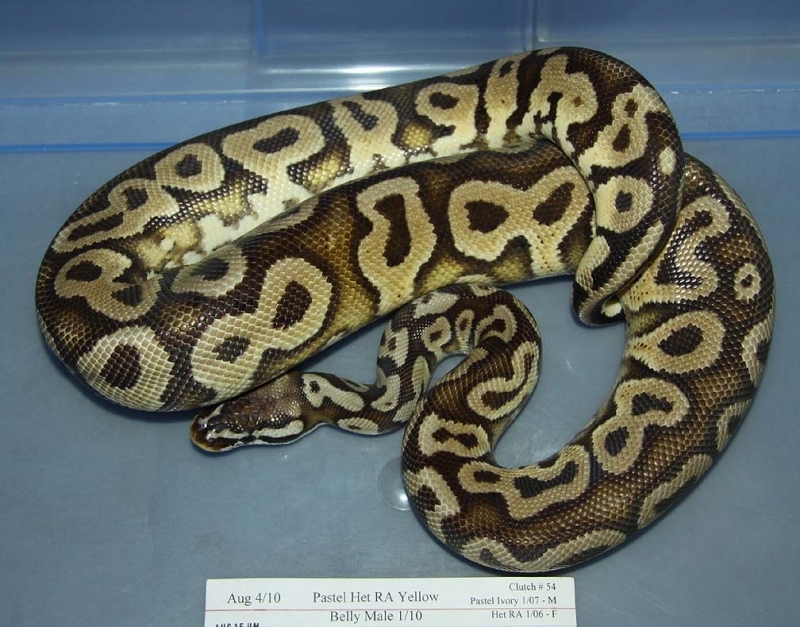 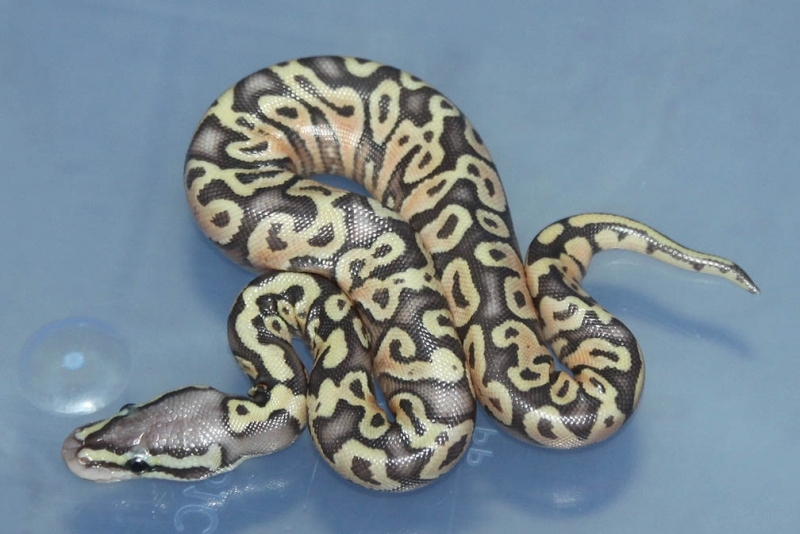 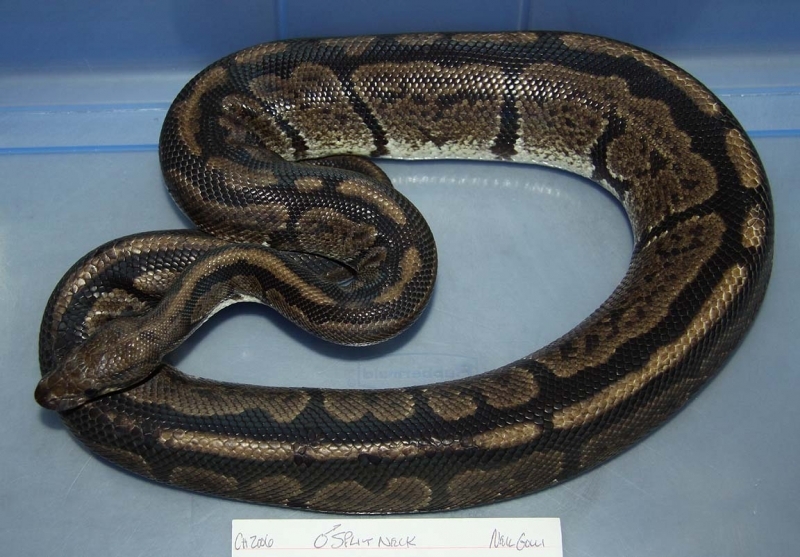 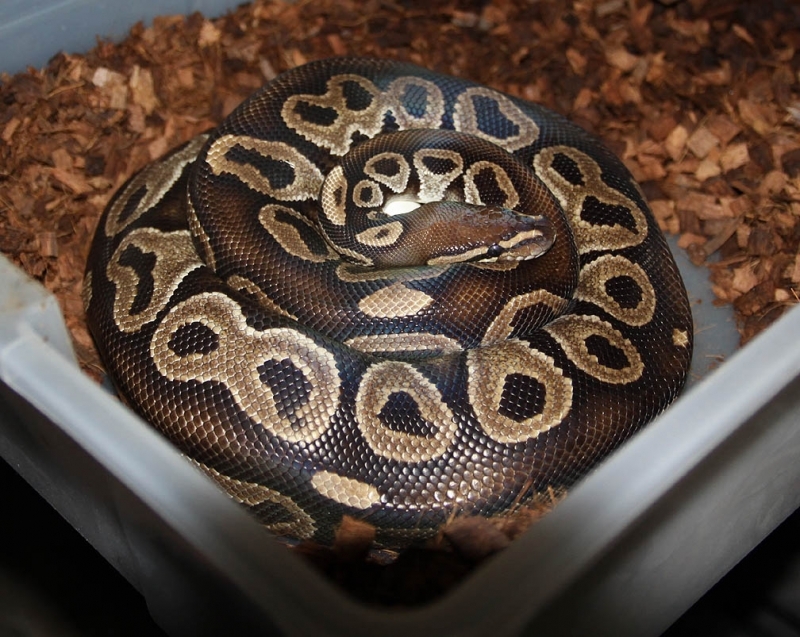 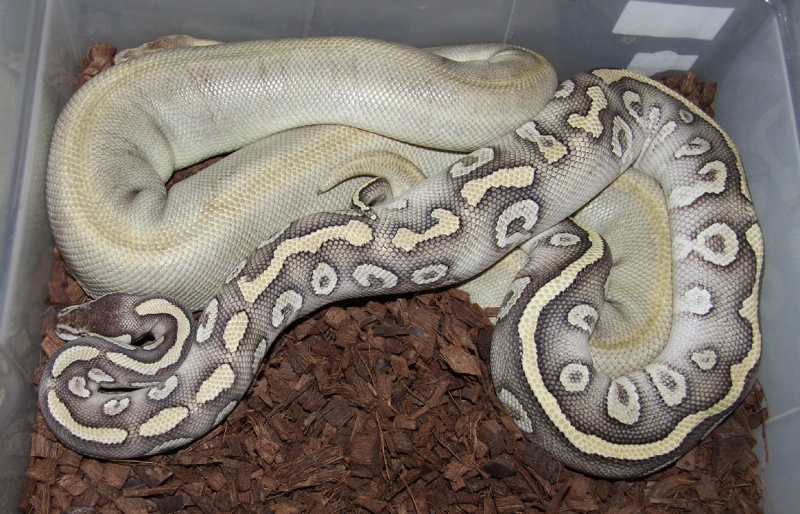 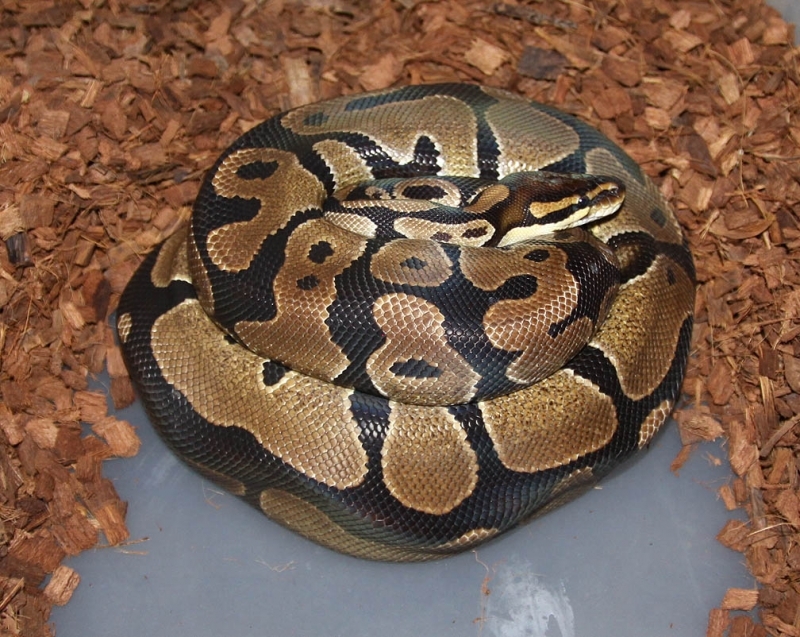 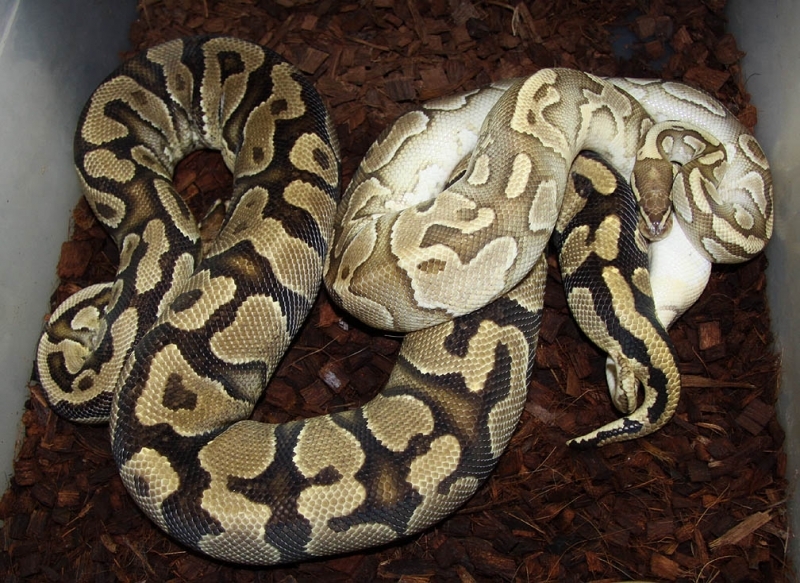 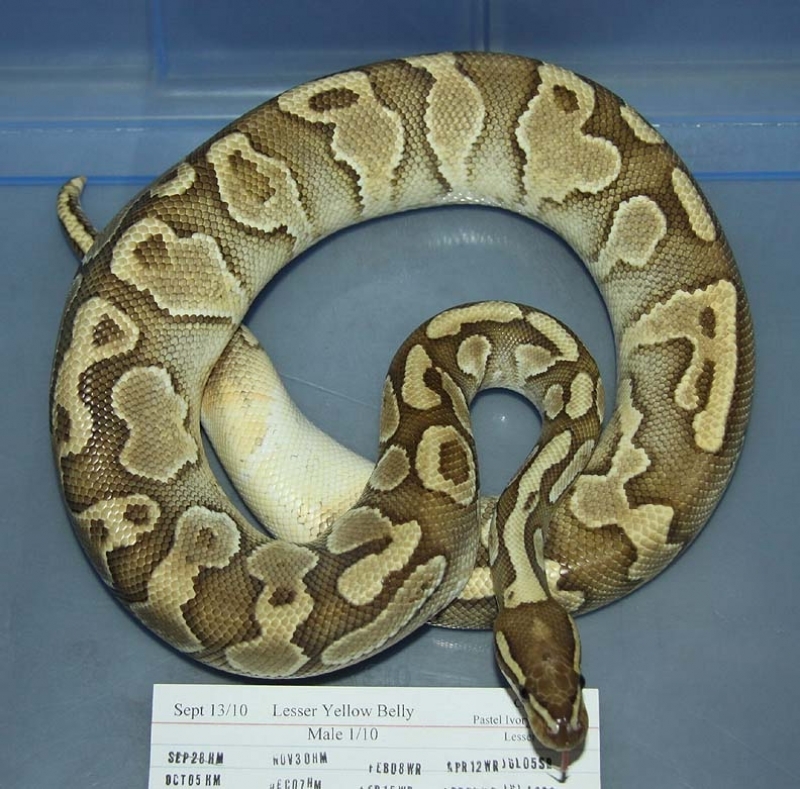 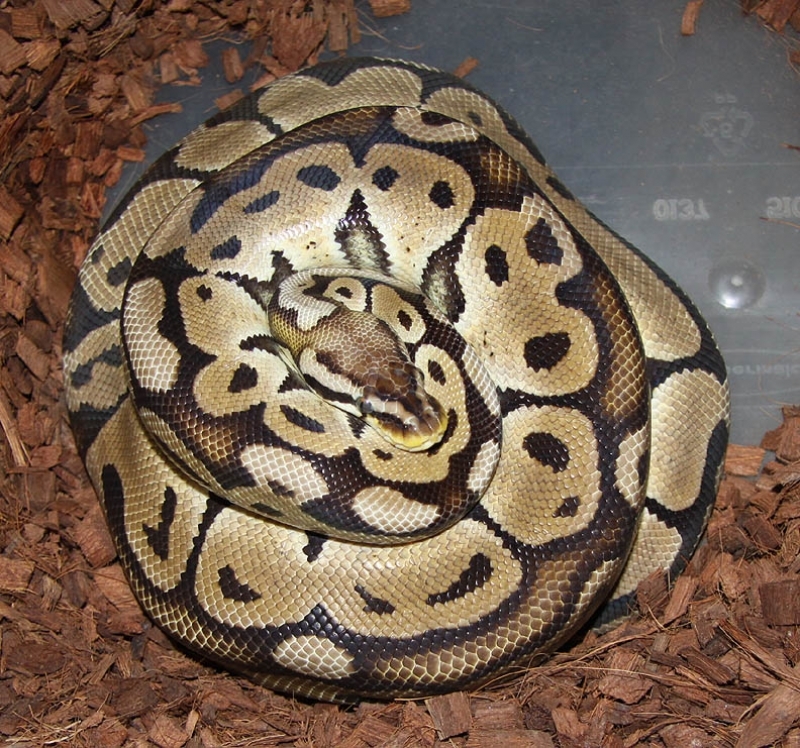 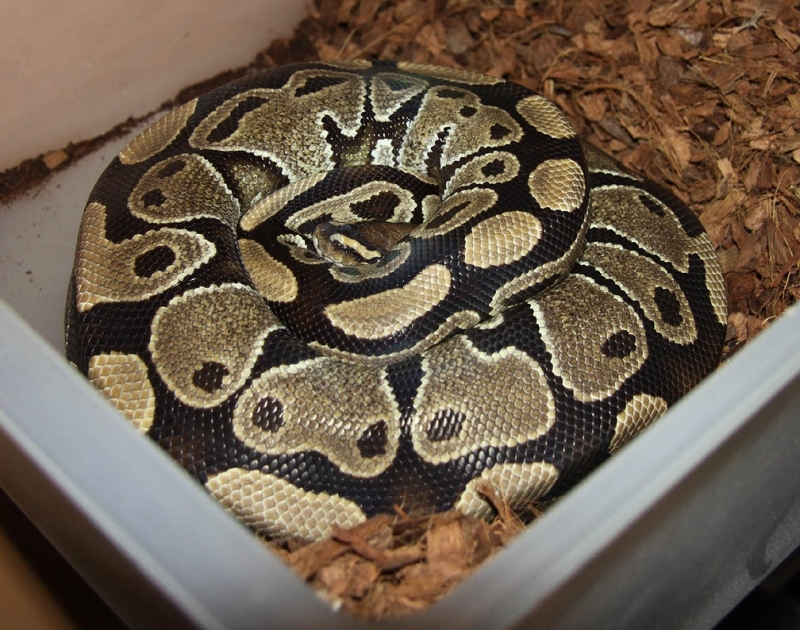 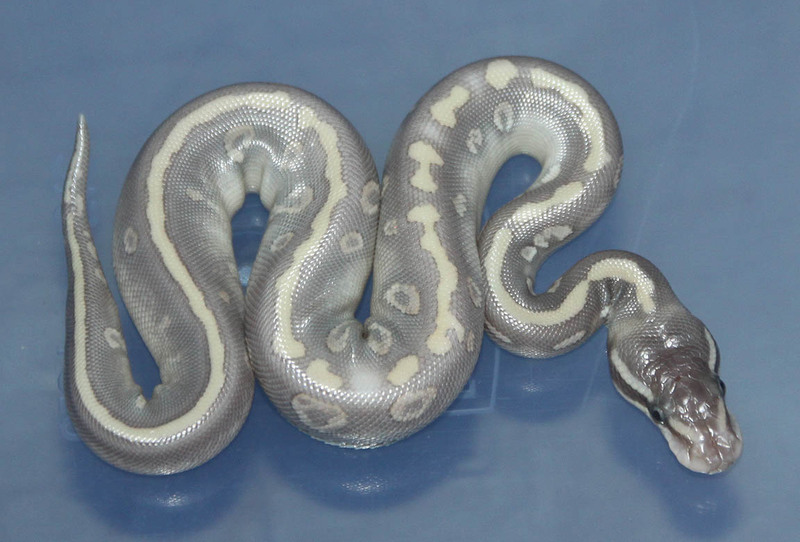 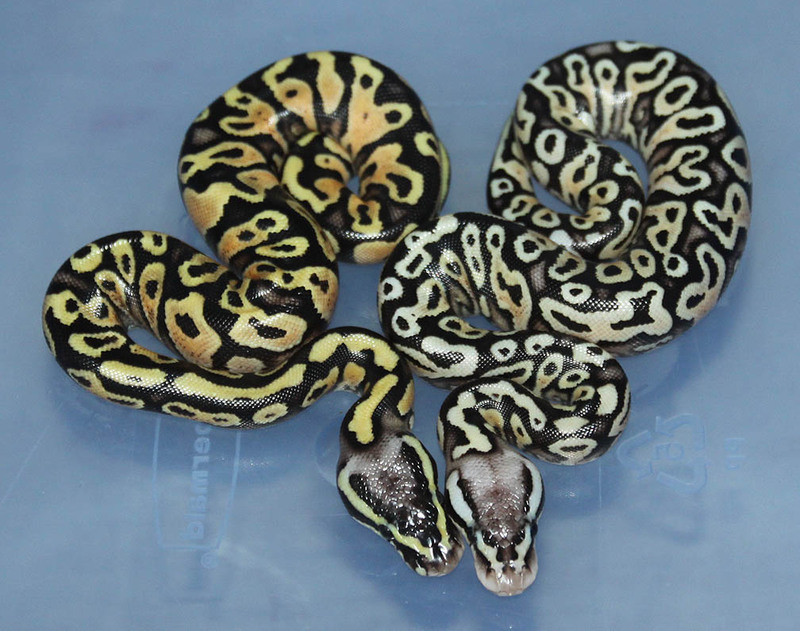 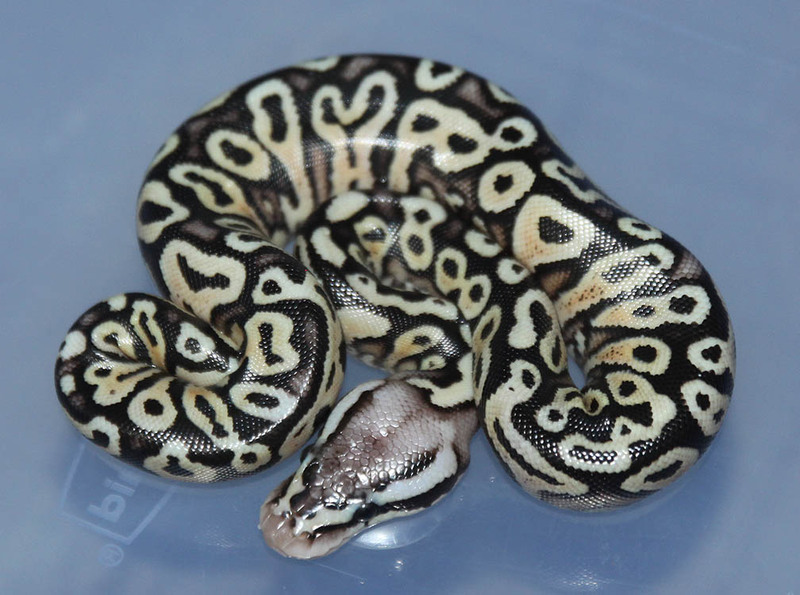 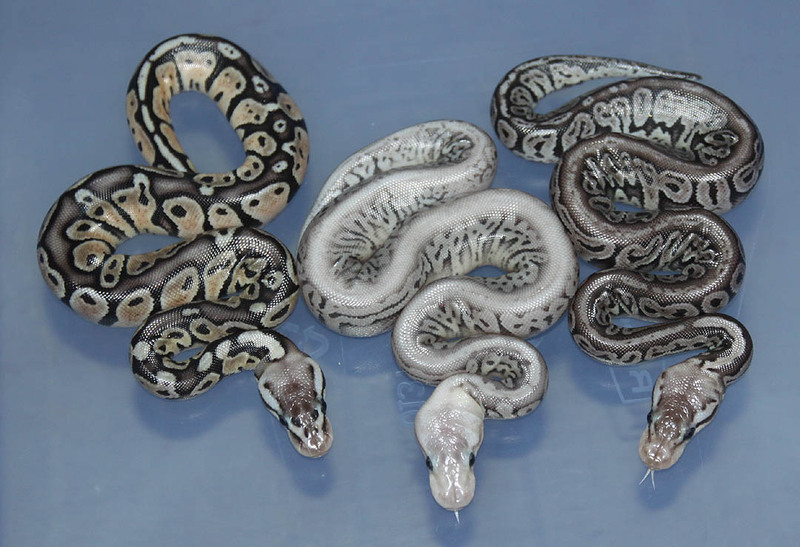 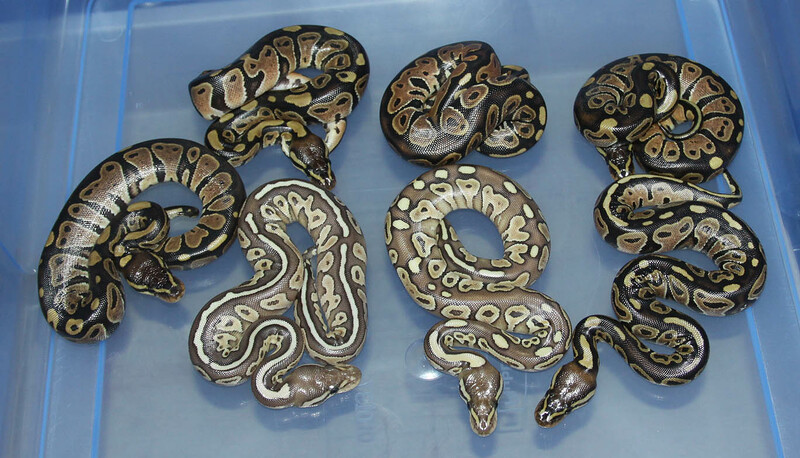 Description: Pastel Het RA YB 1/10 x Pastel Het RA YB 1/09. 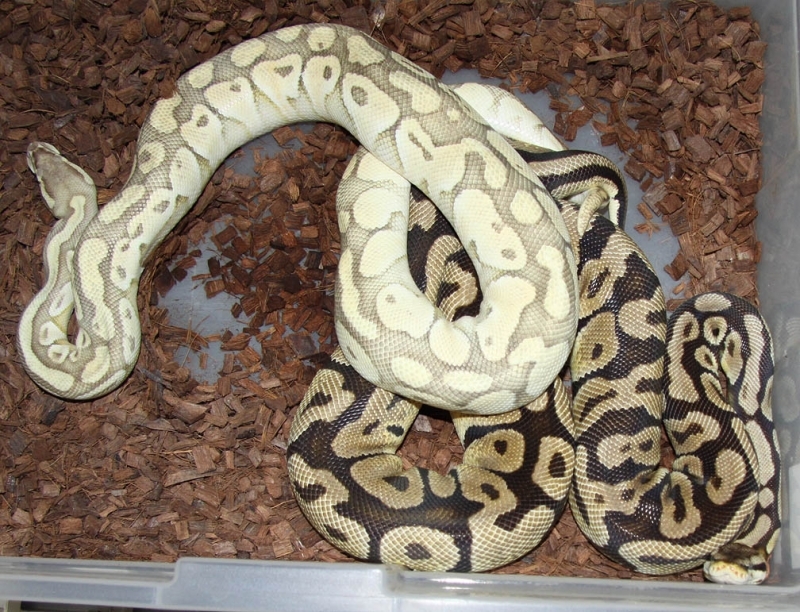 If you are interested in animals from clutch #203 please email or call 519-824-7377. 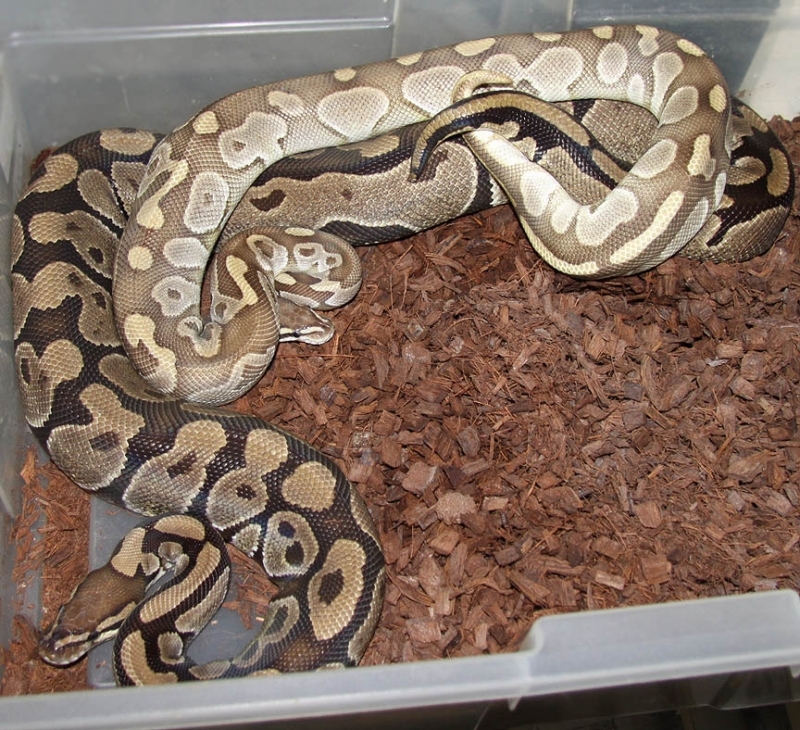 If you are interested in animals from clutch #204 please email or call 519-824-7377. 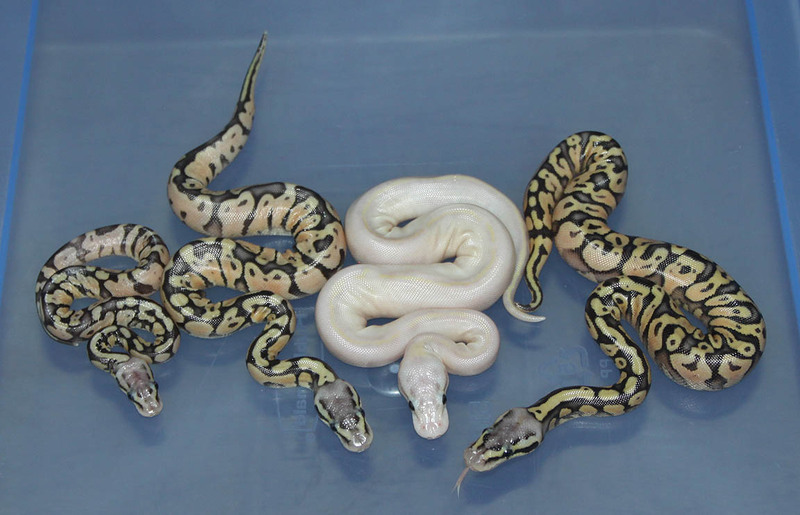 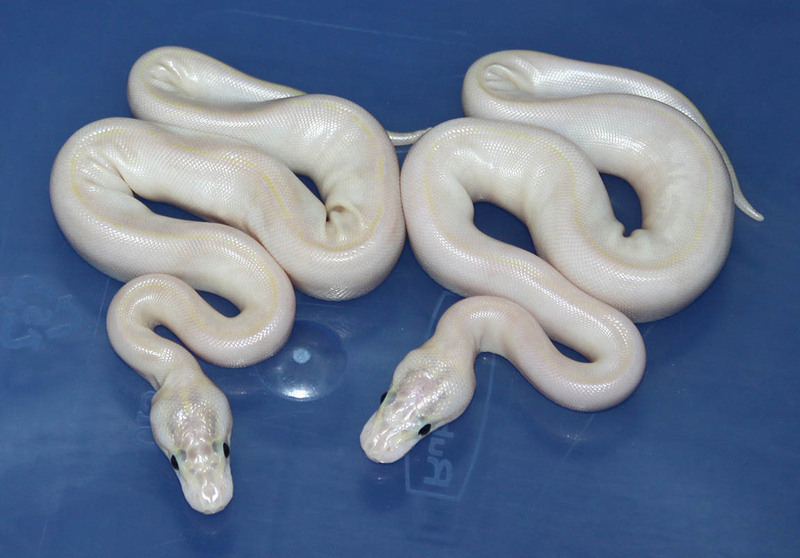 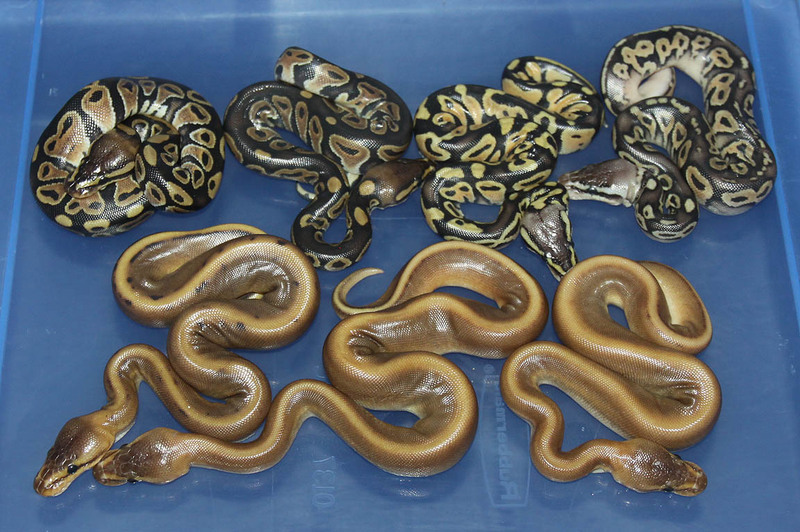 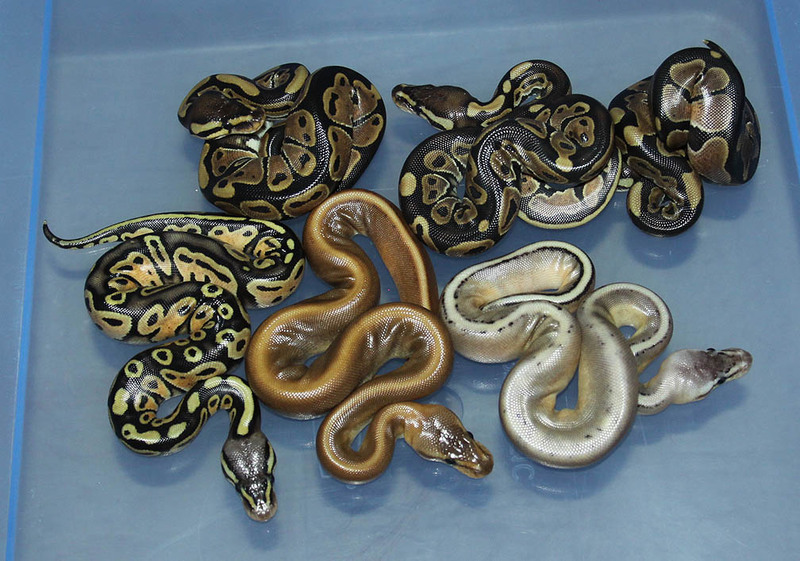 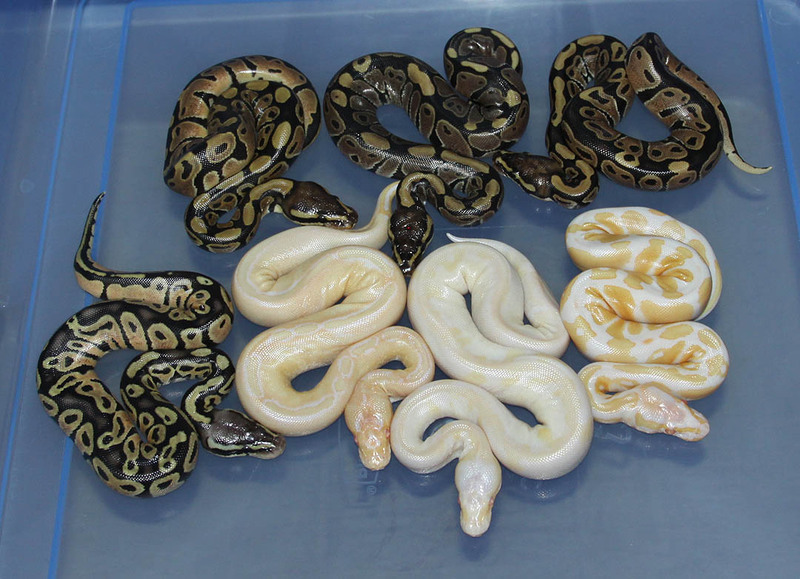 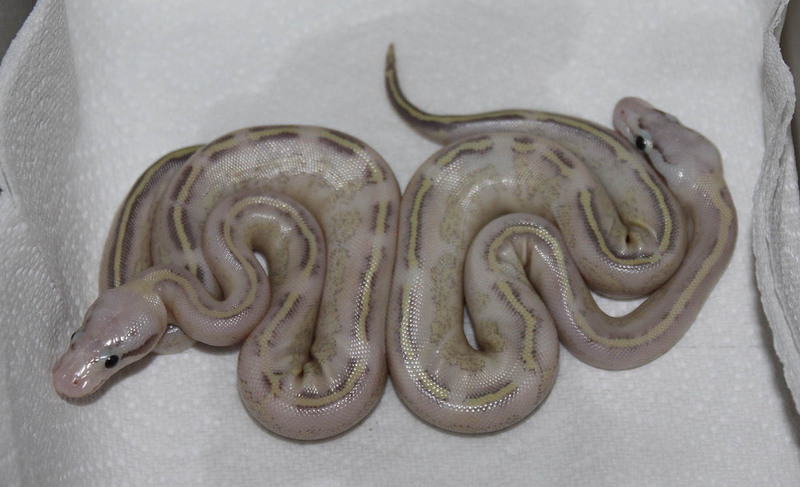 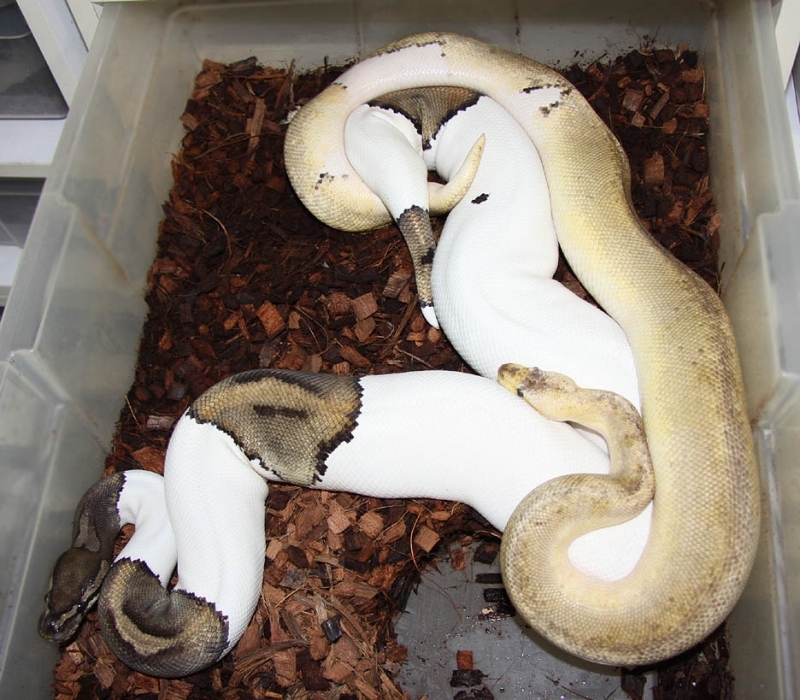 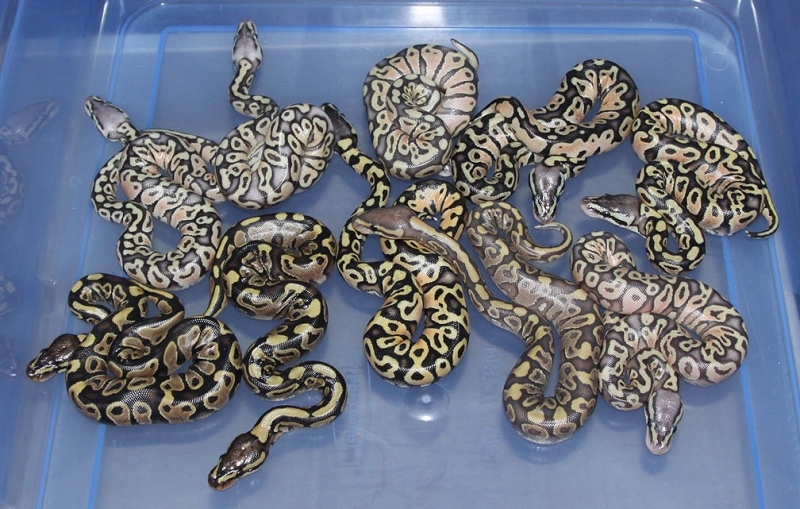 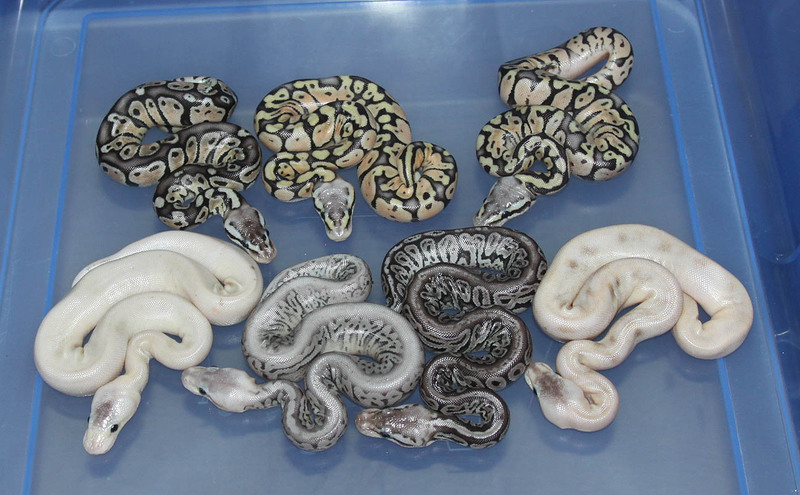 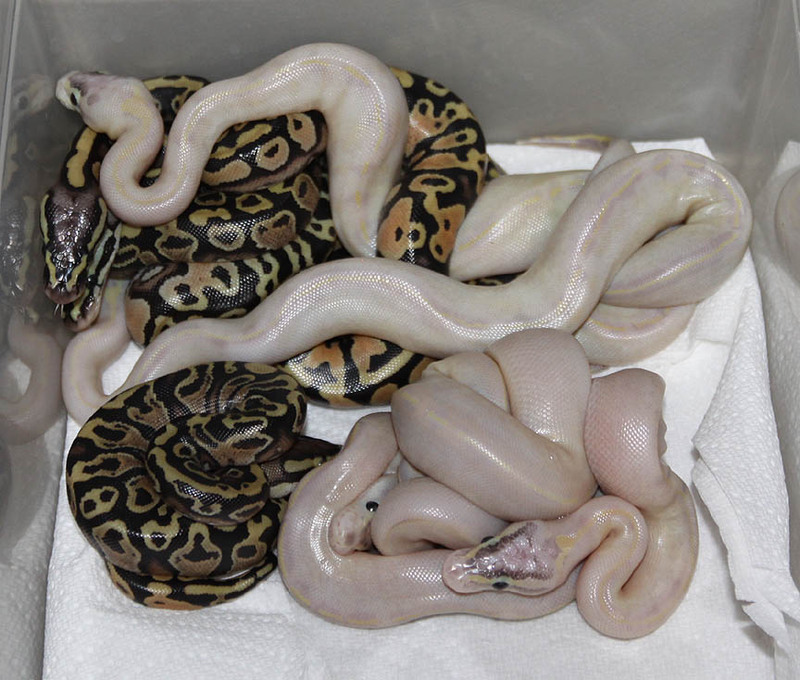 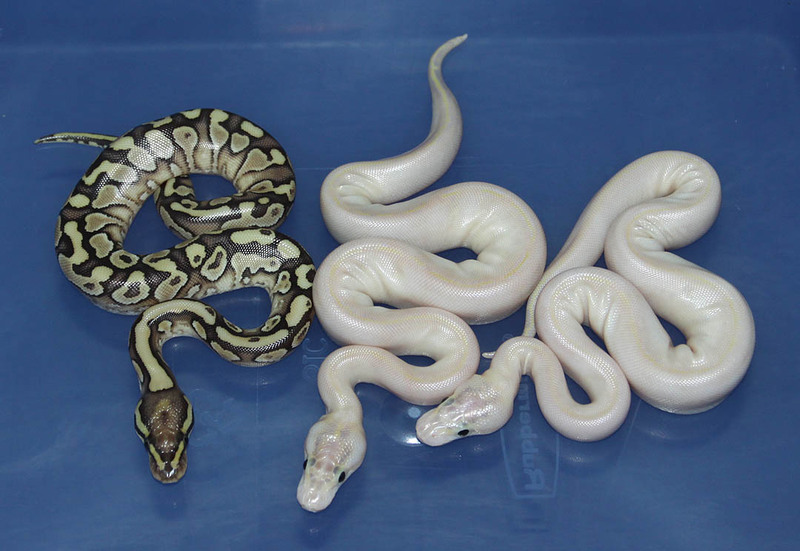 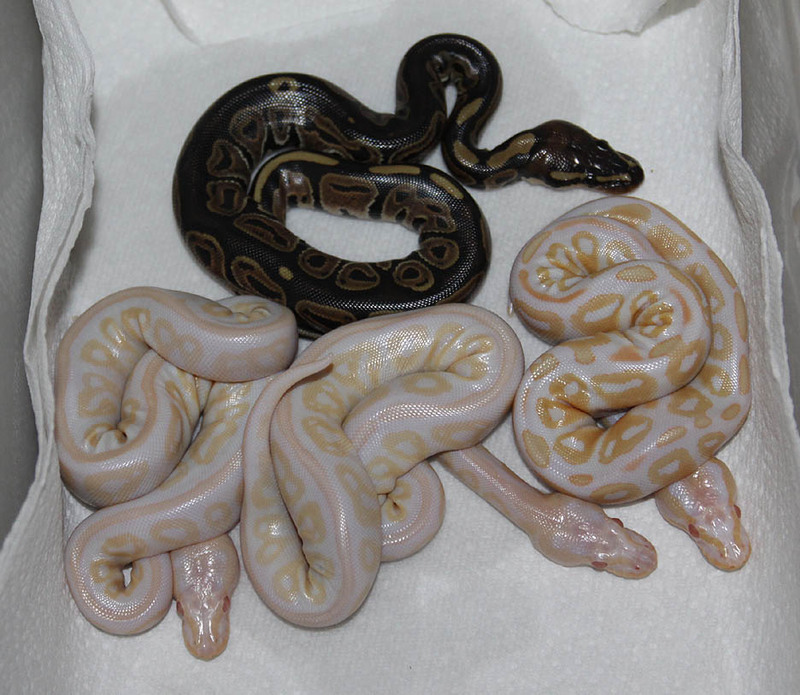 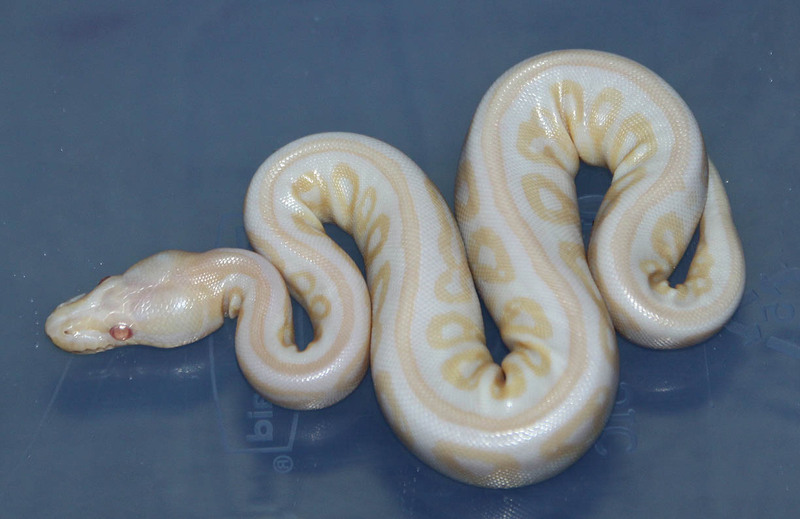 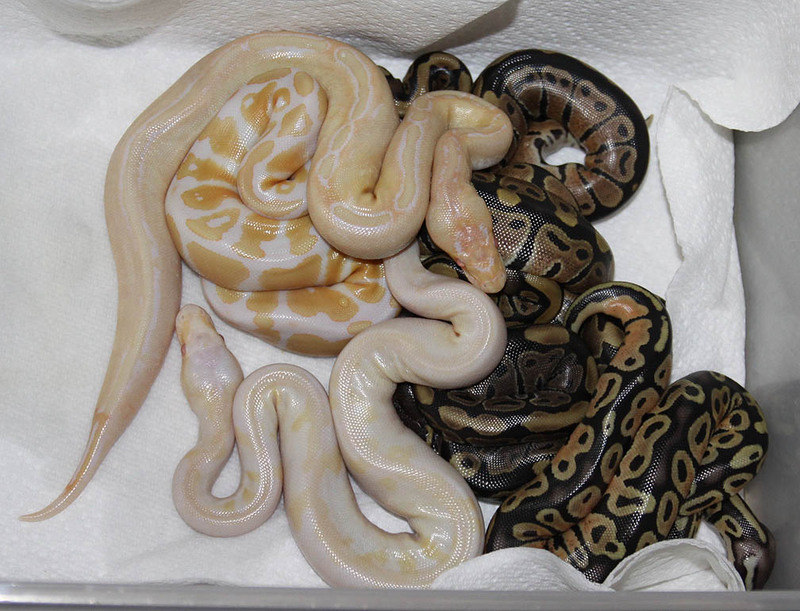 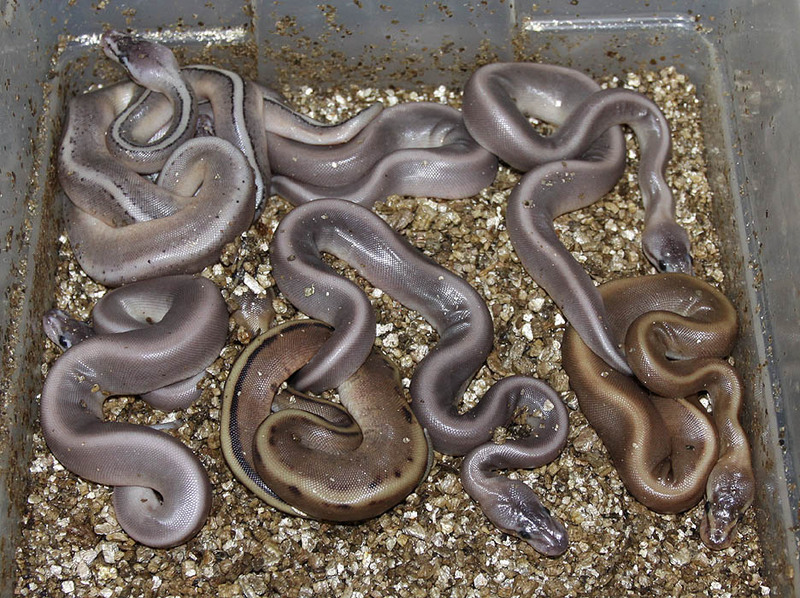 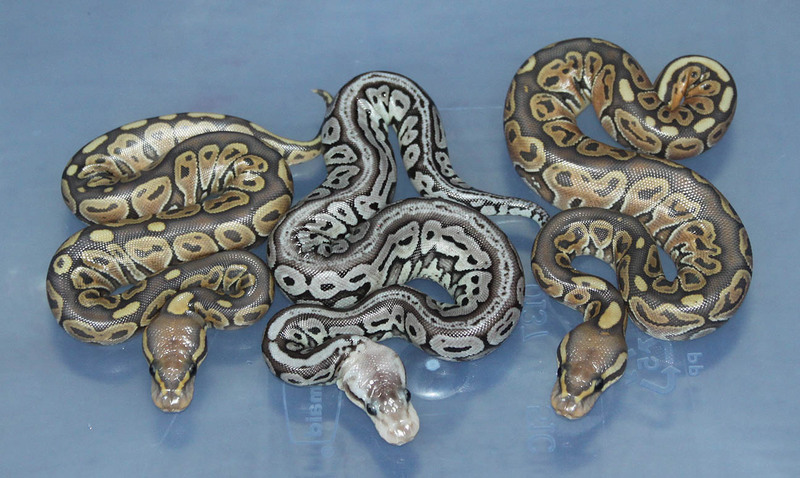 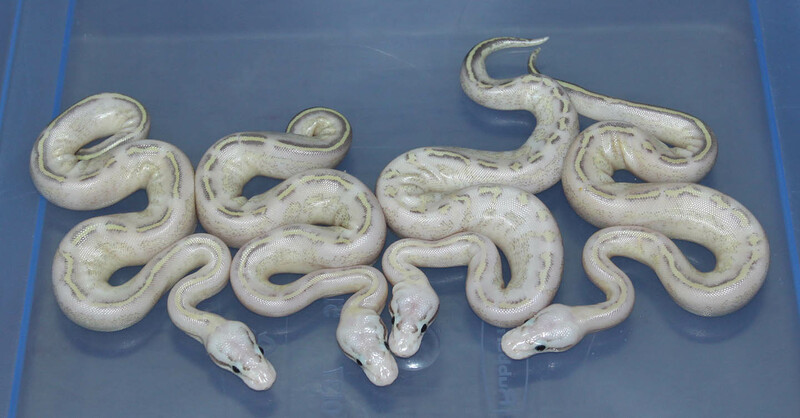 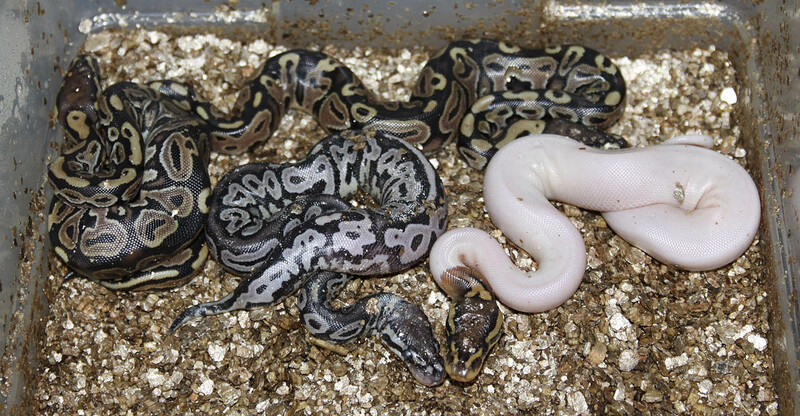 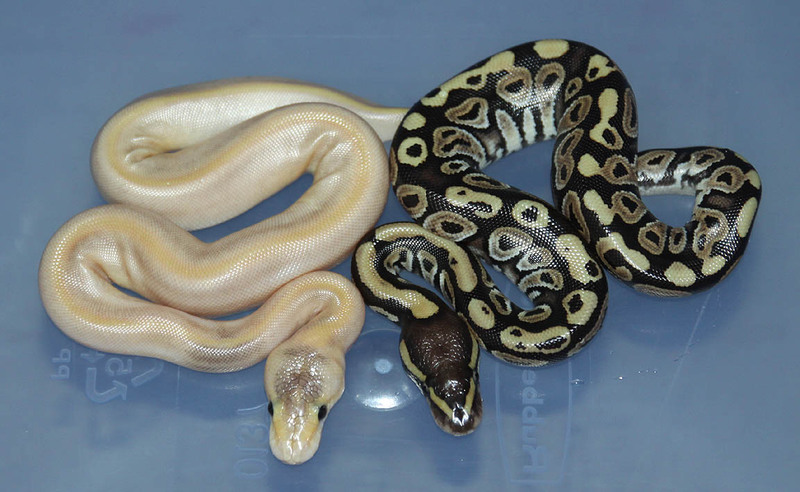 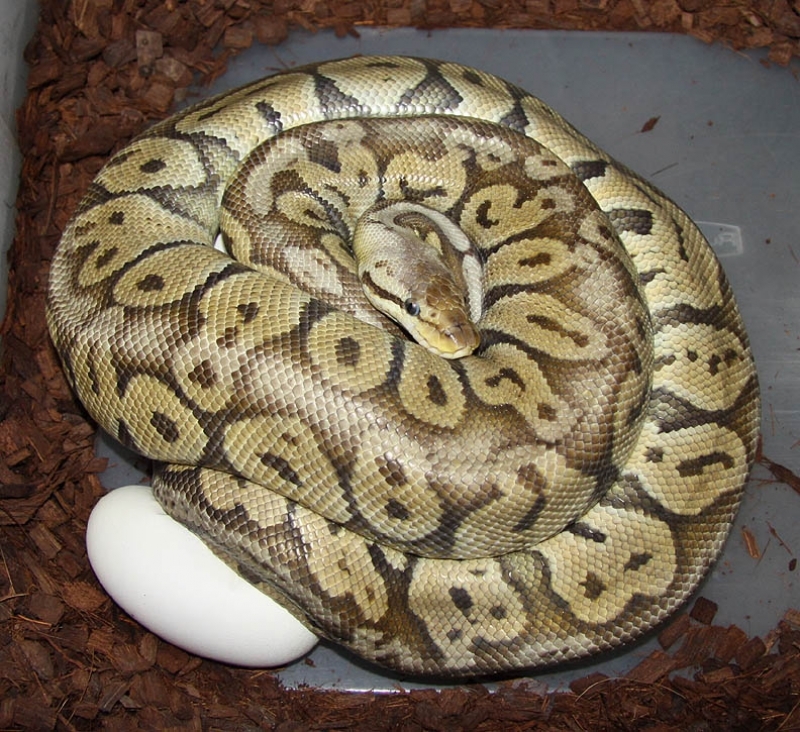 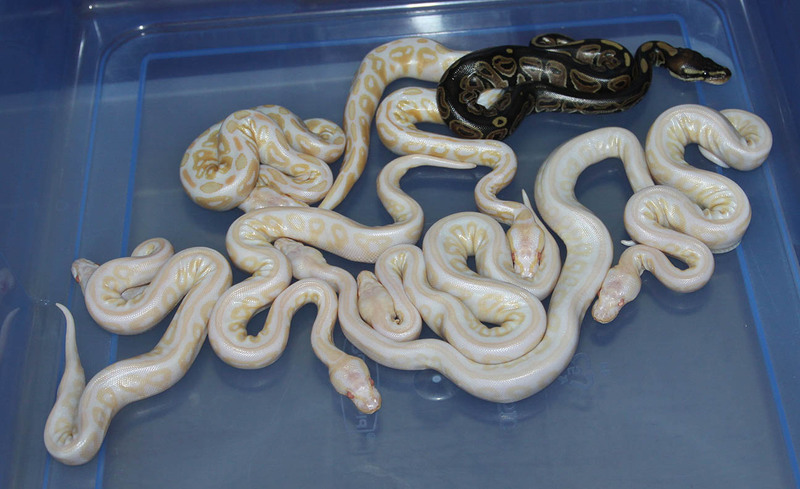 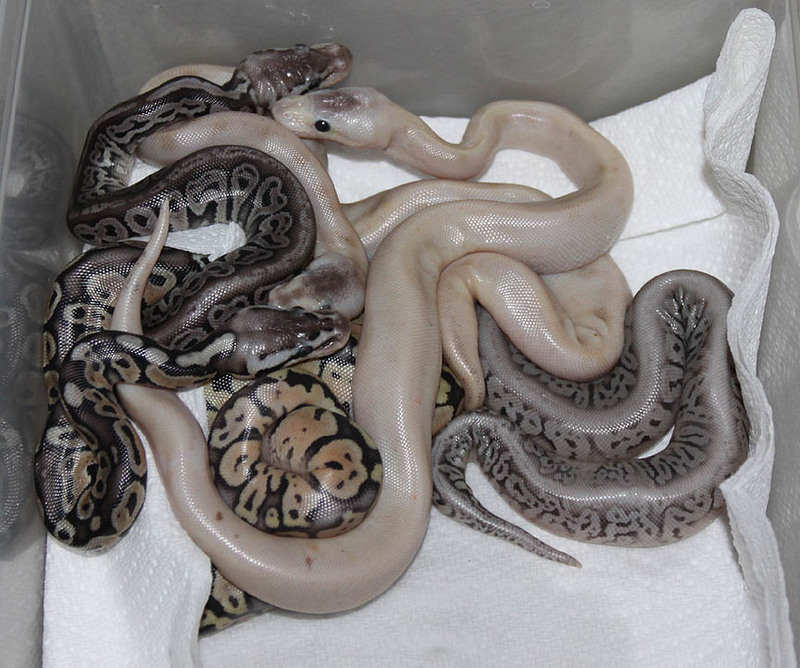 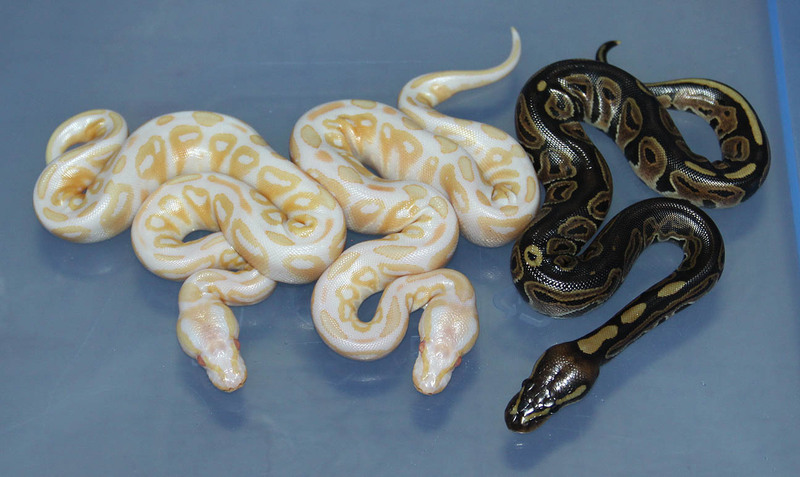 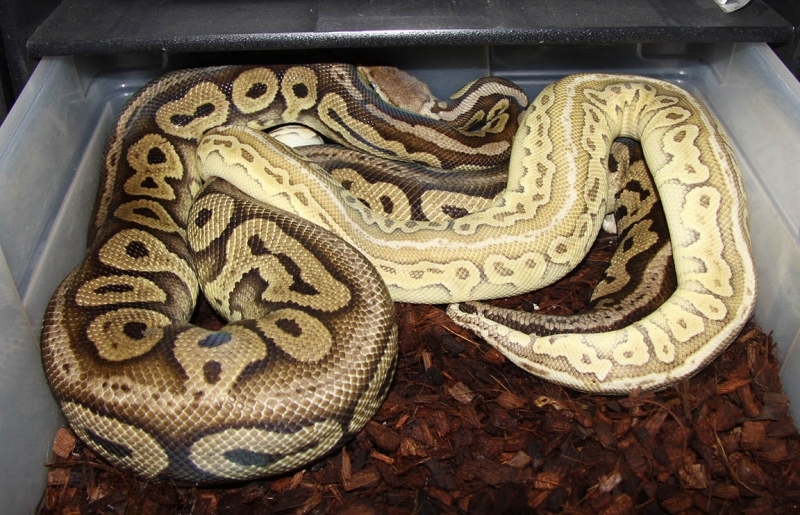 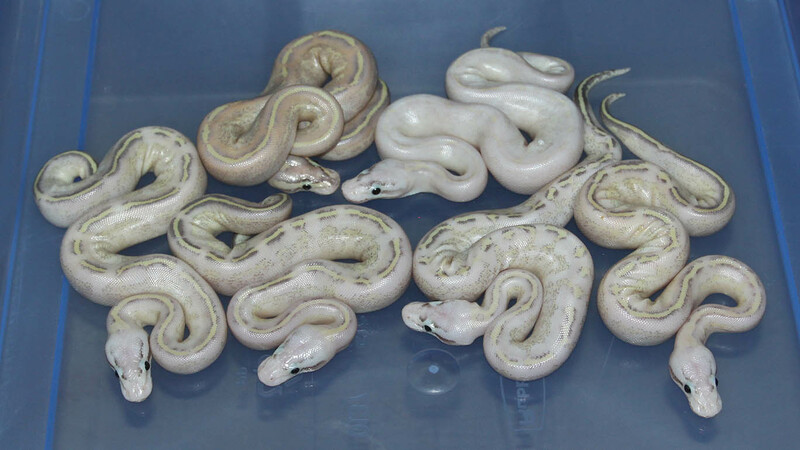 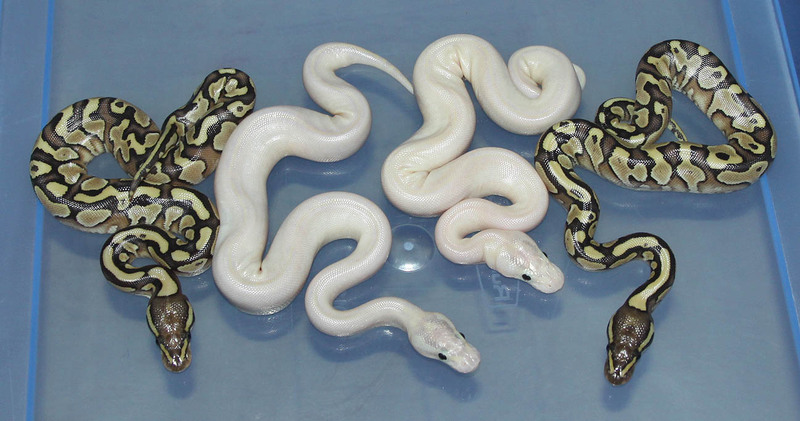 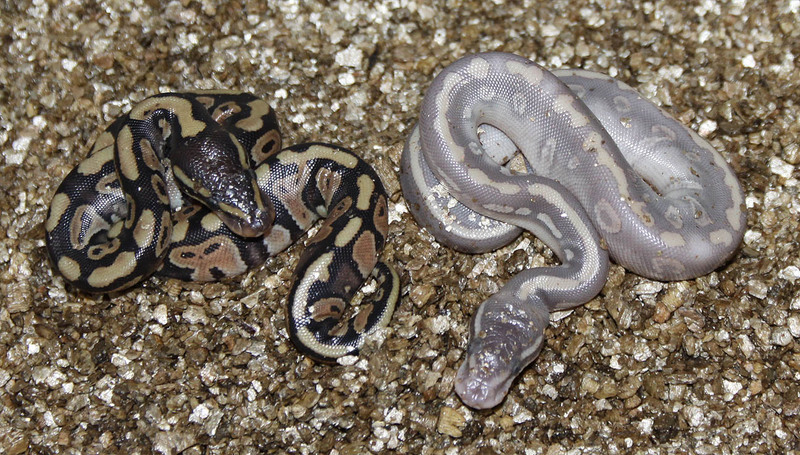 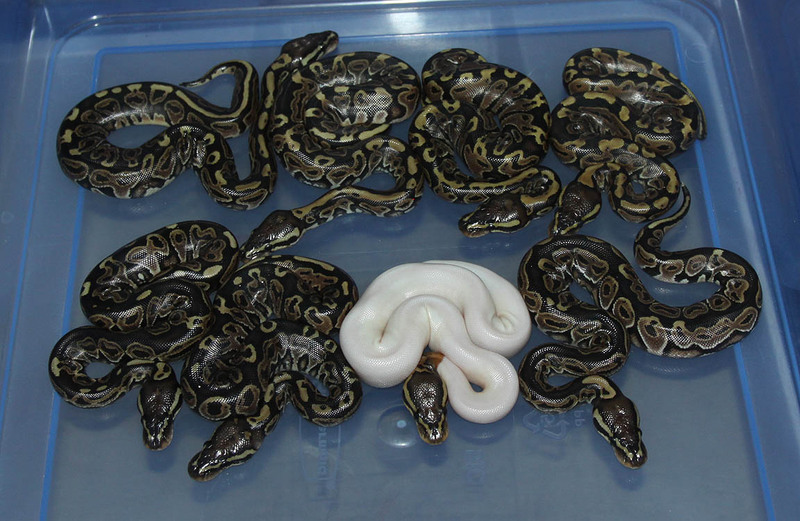 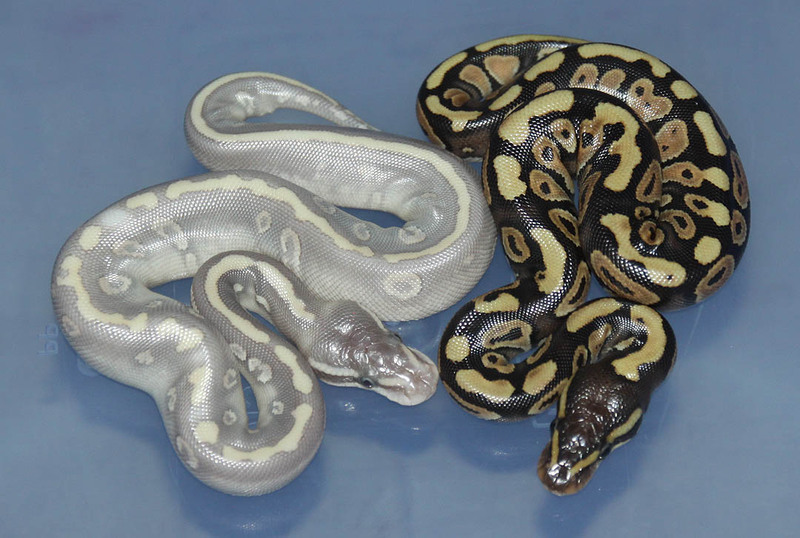 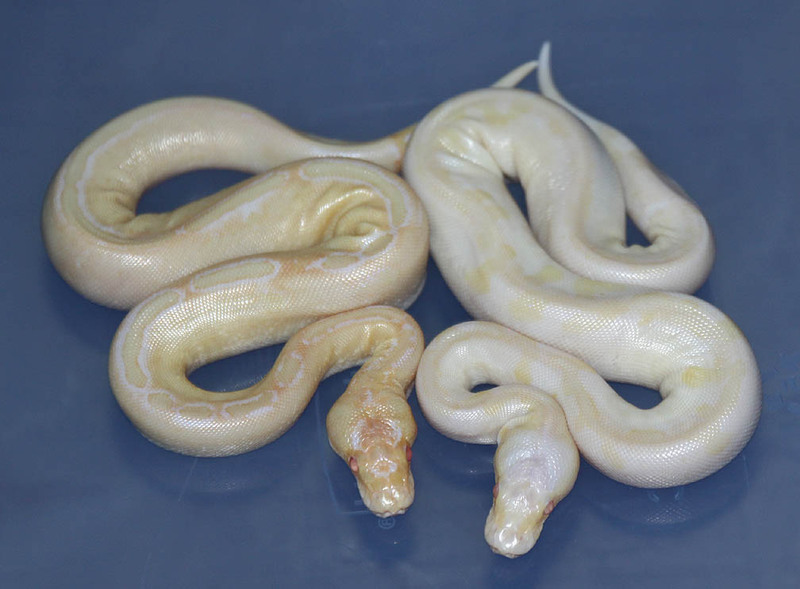 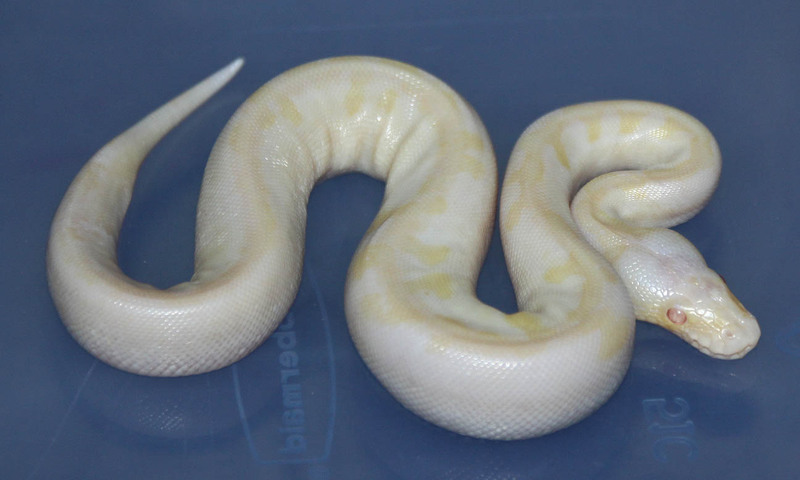 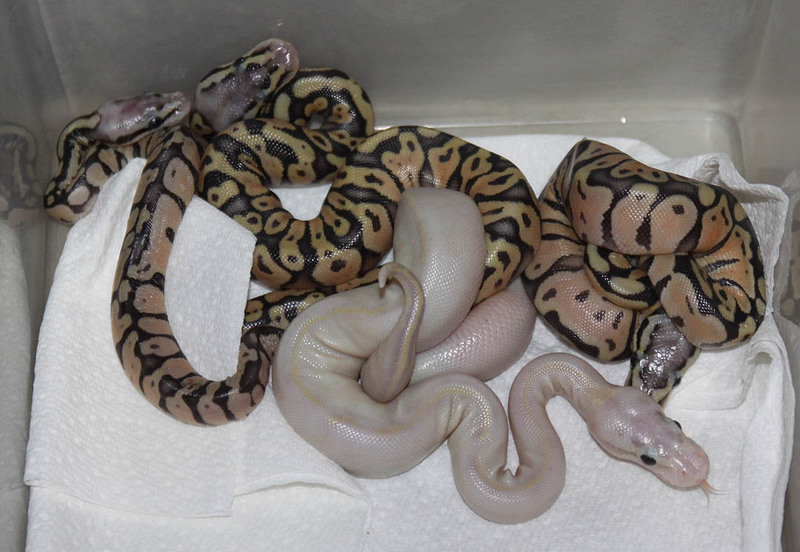 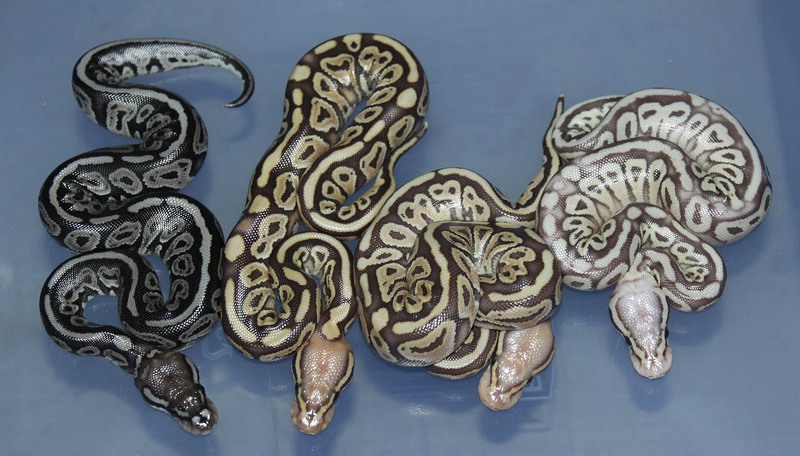 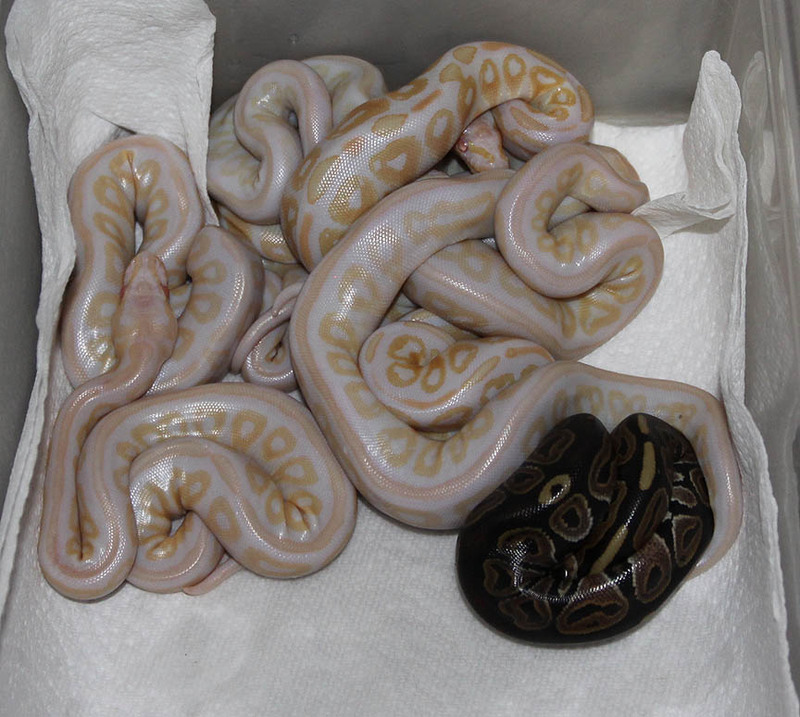 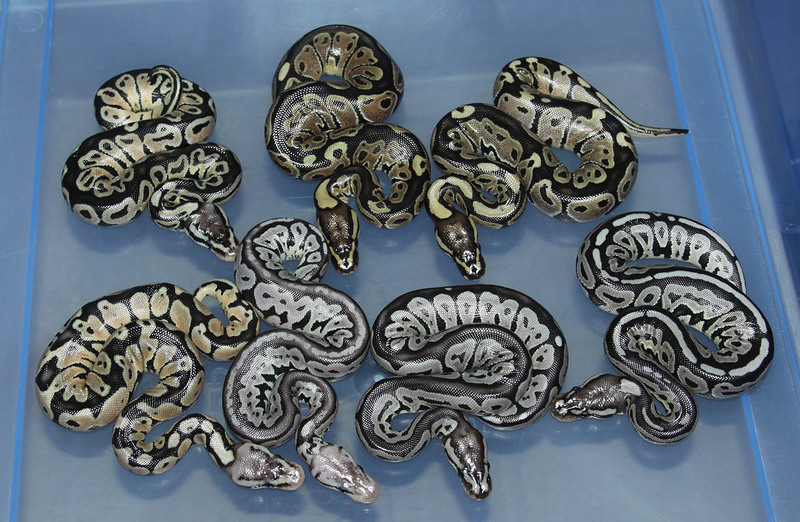 Description: Champagne Het Albino 1/11 & Pastel Champagne Het Albino 1/11 x Black Stripe Het Albino 3/06. 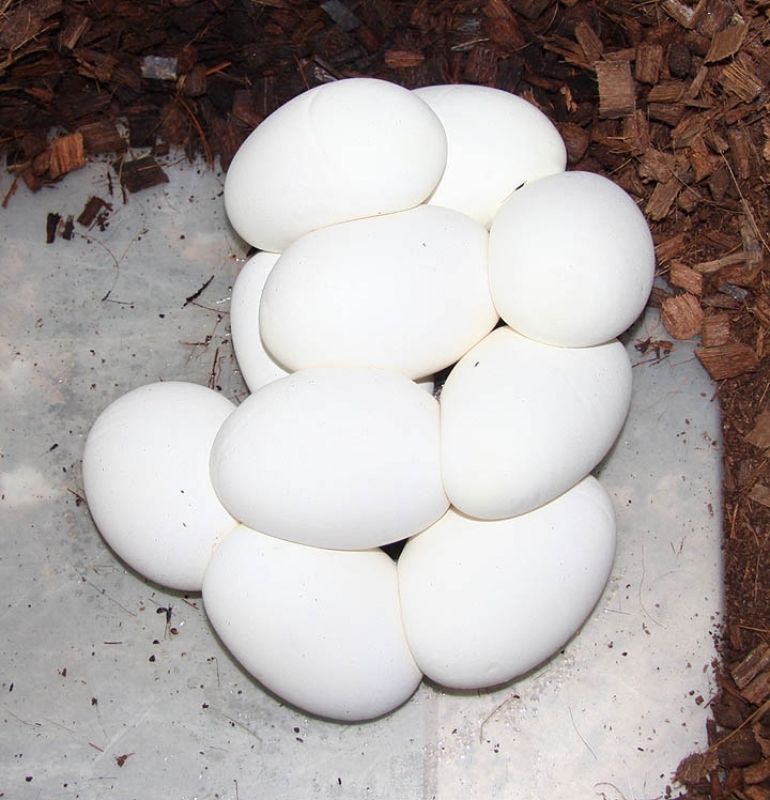 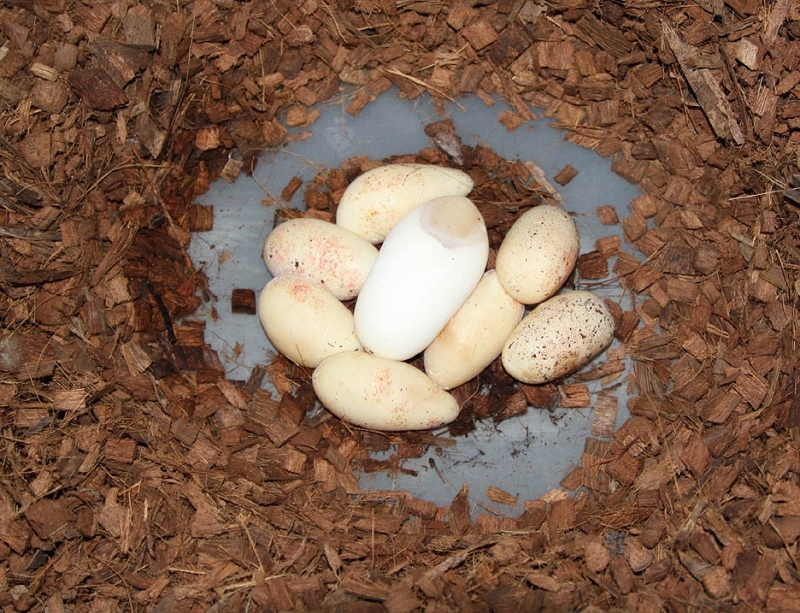 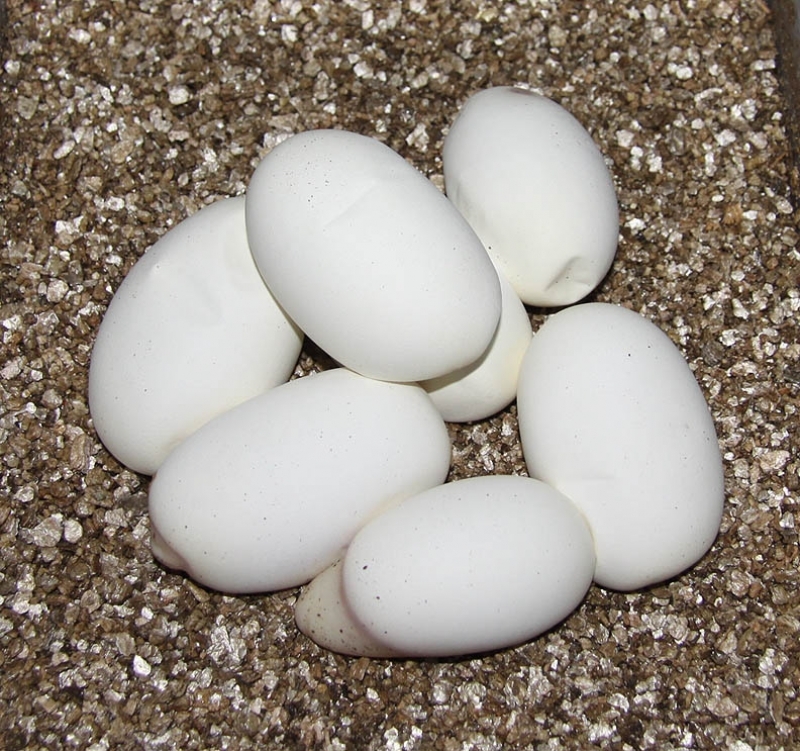 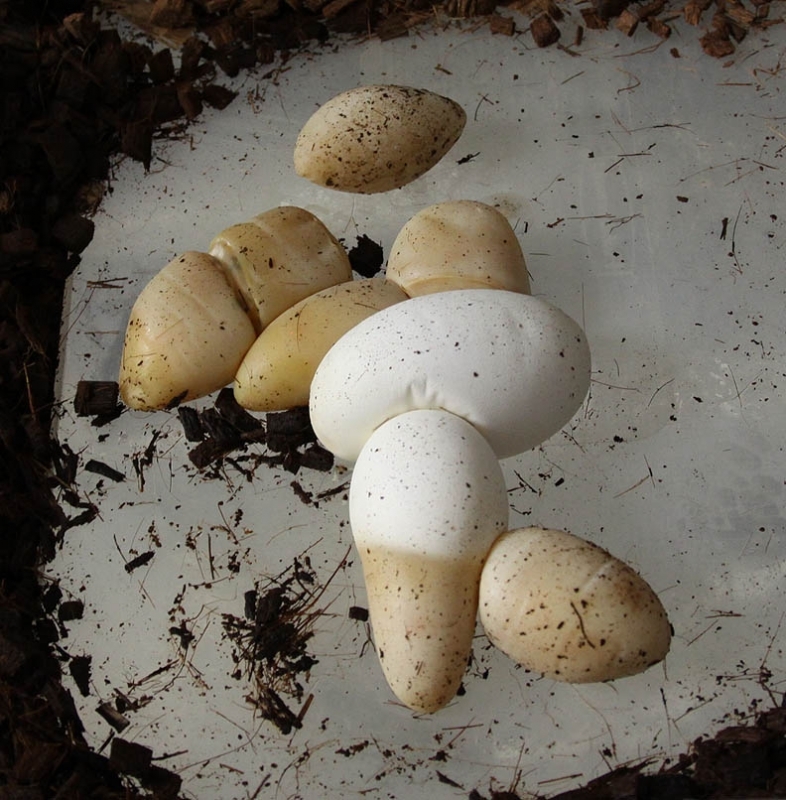 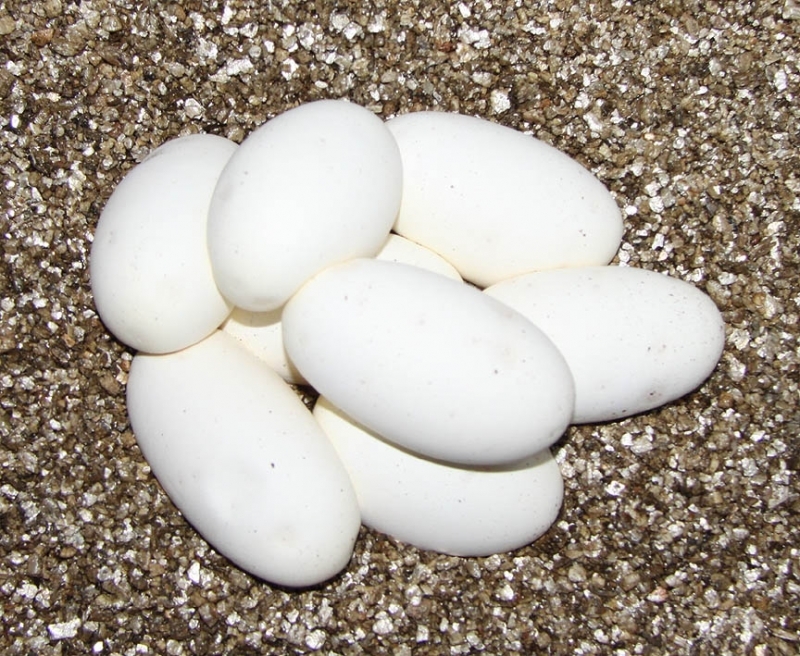 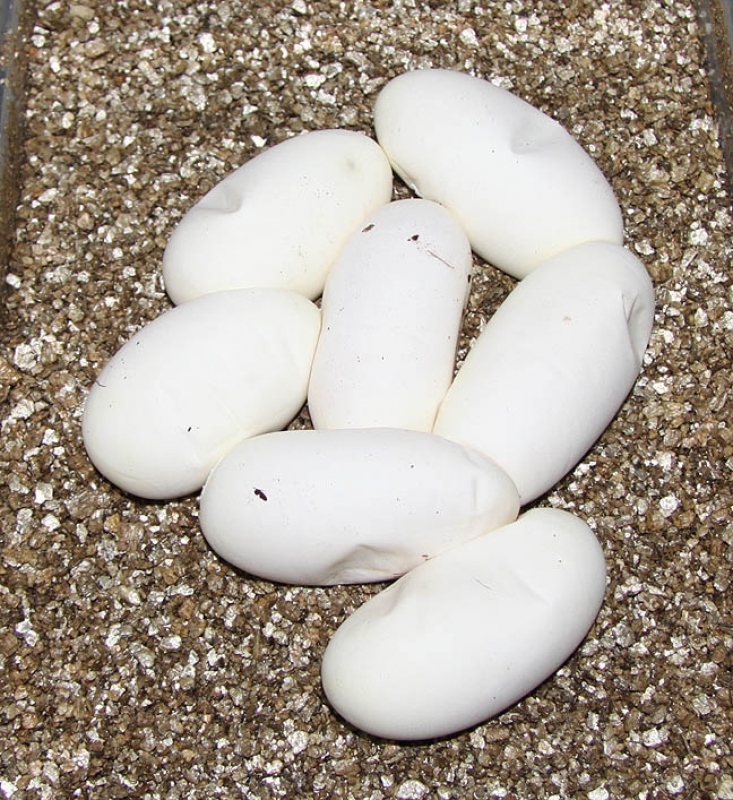 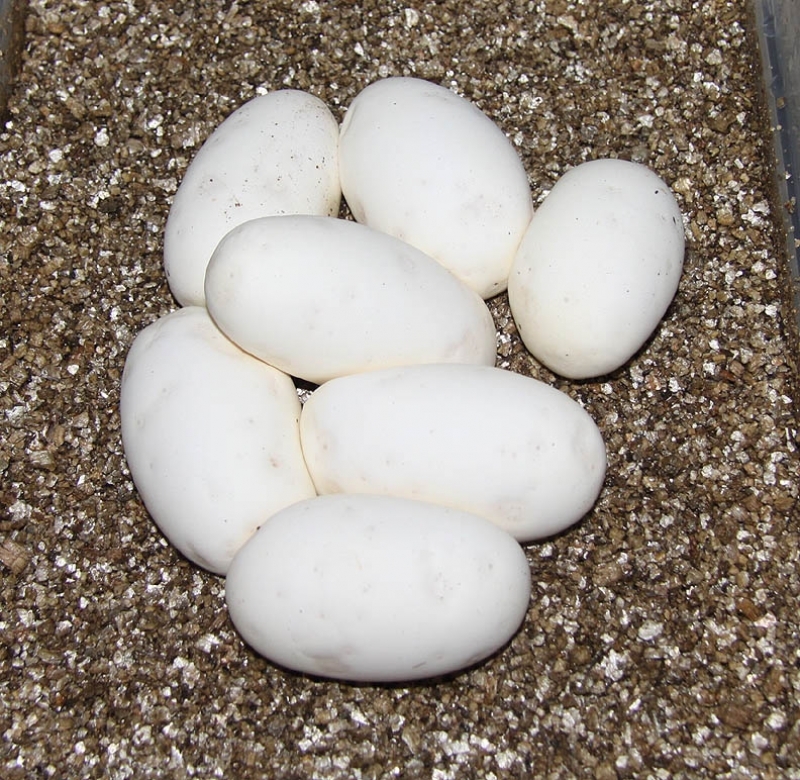 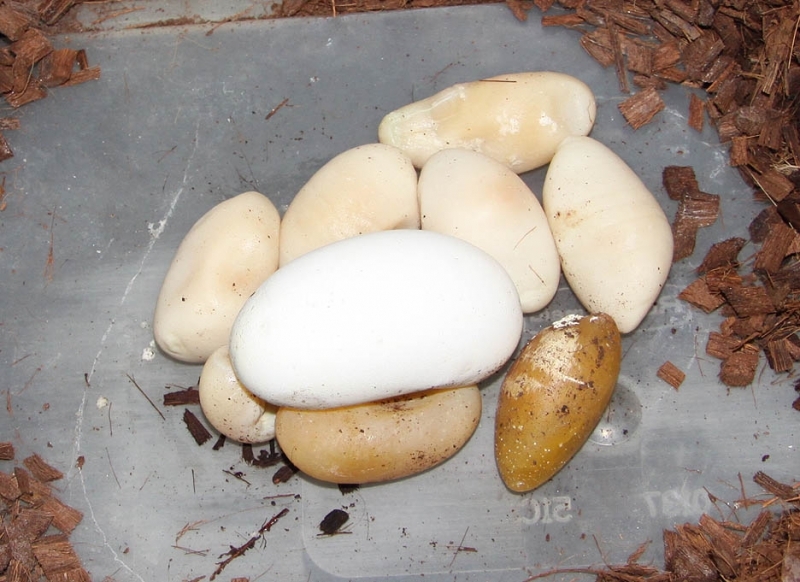 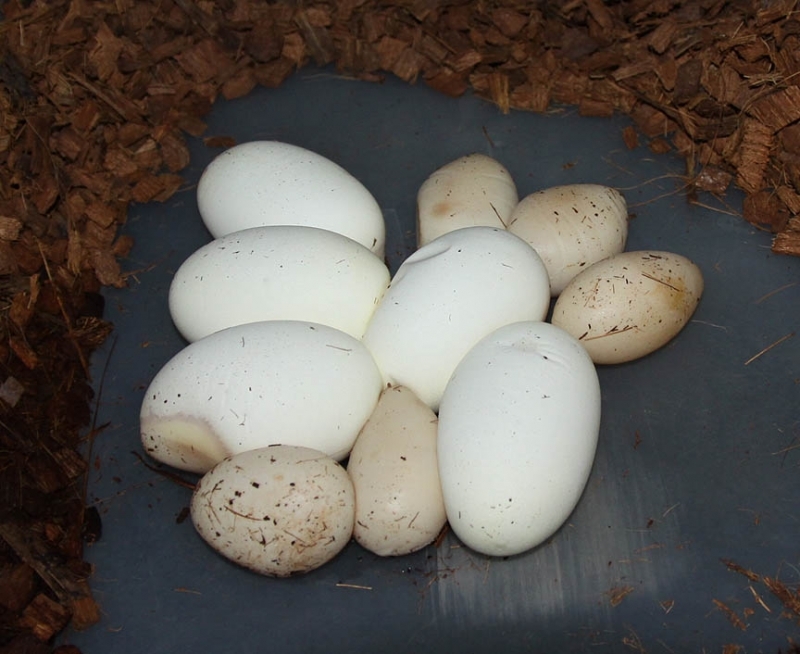 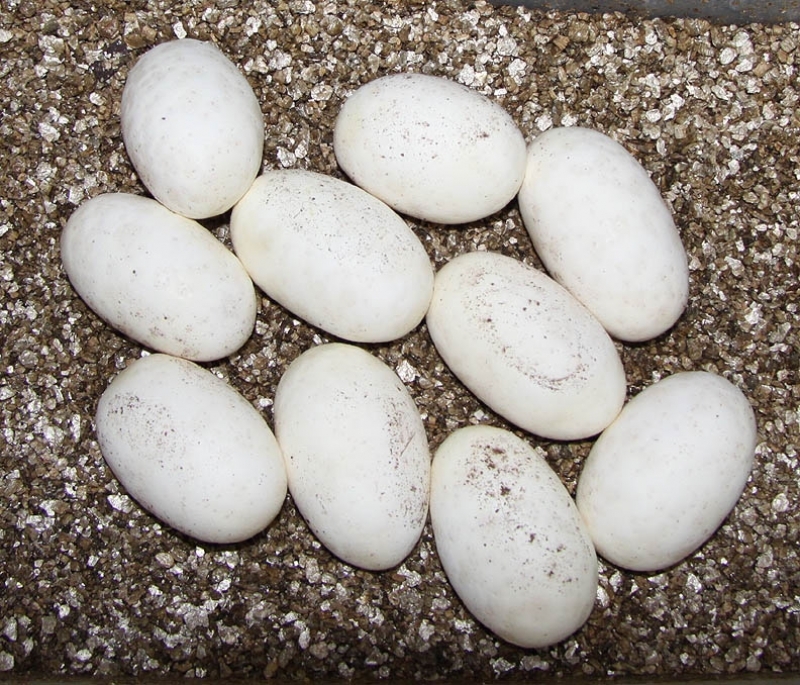 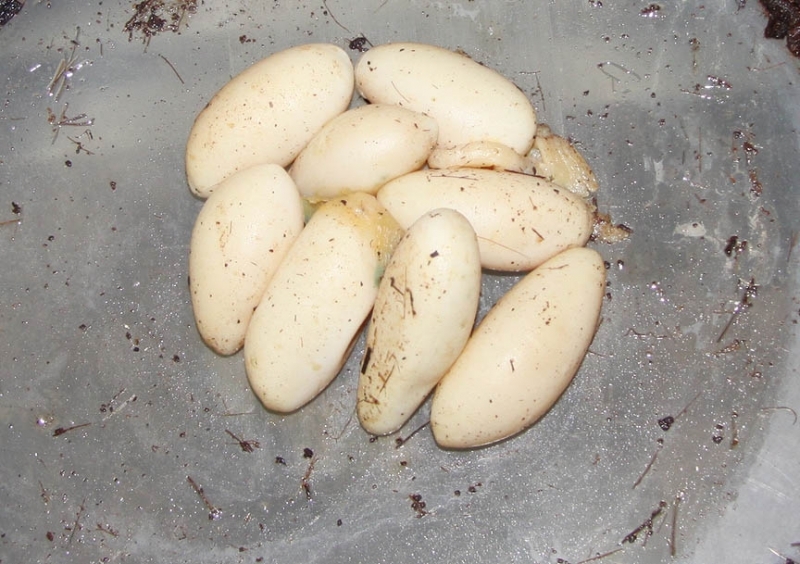 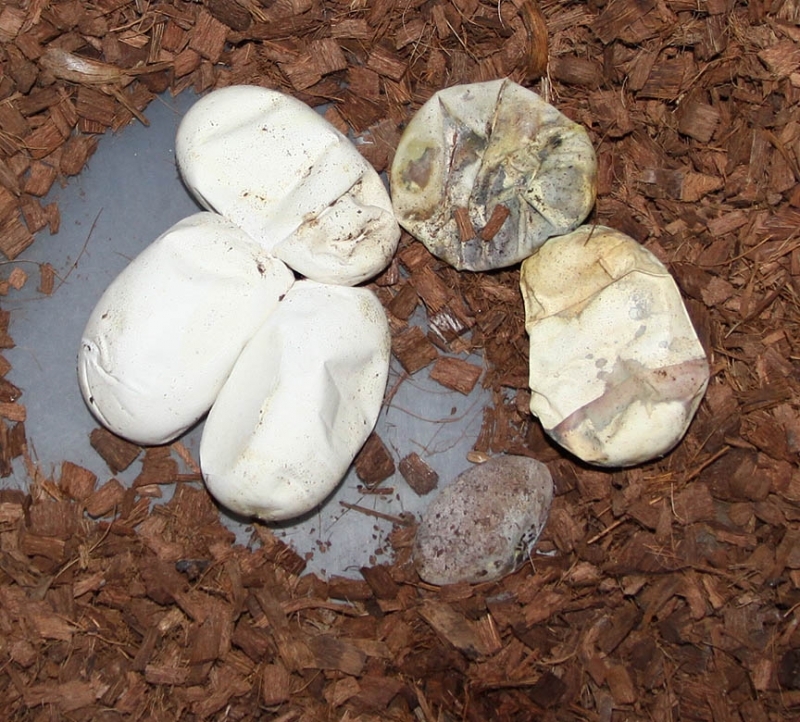 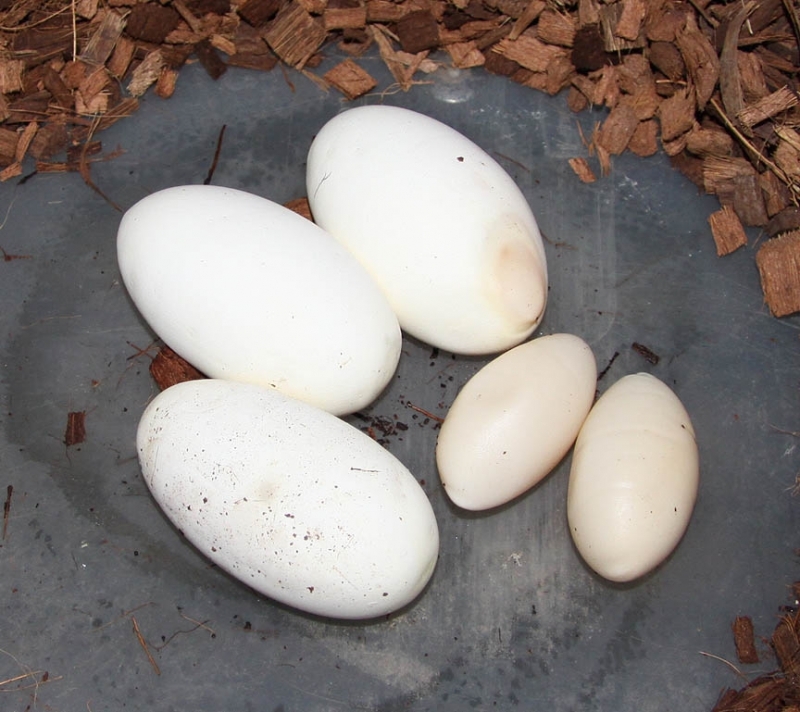 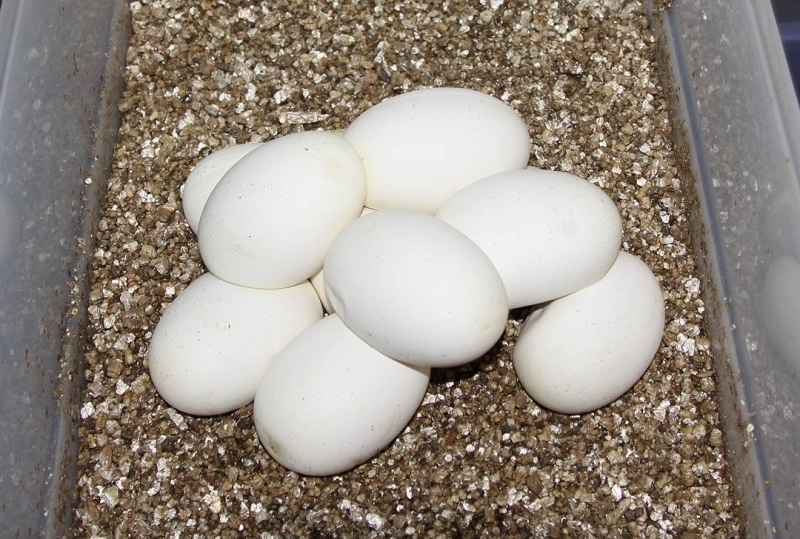 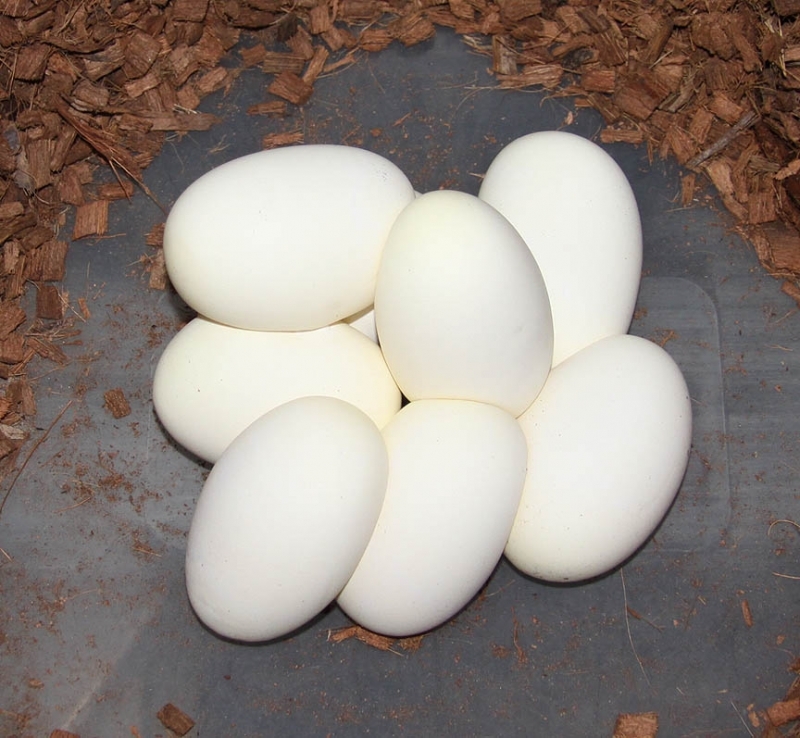 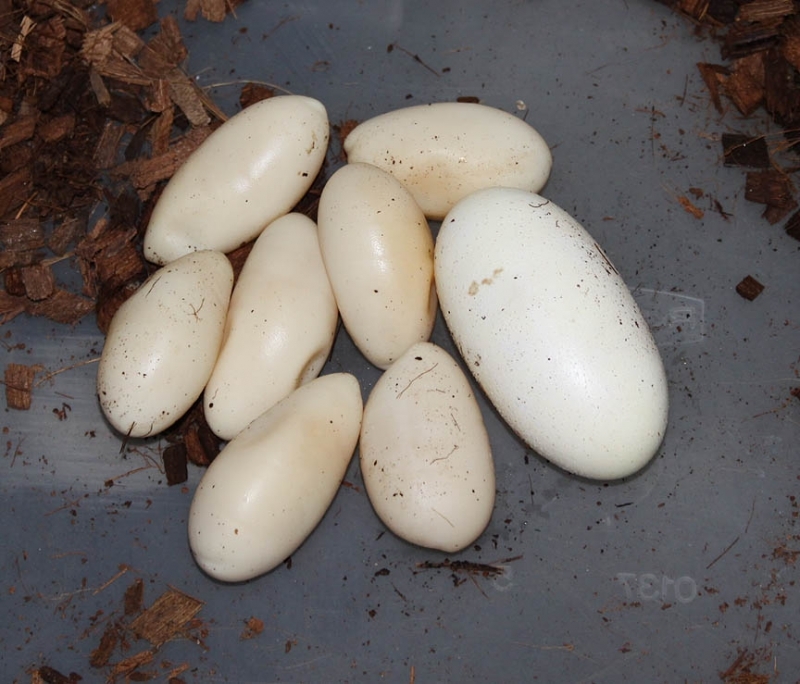 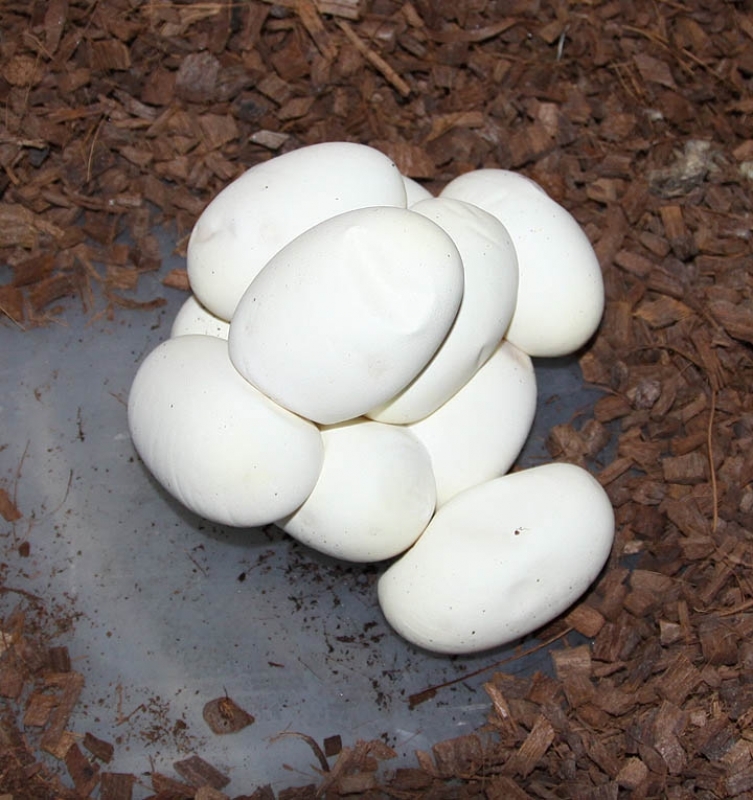 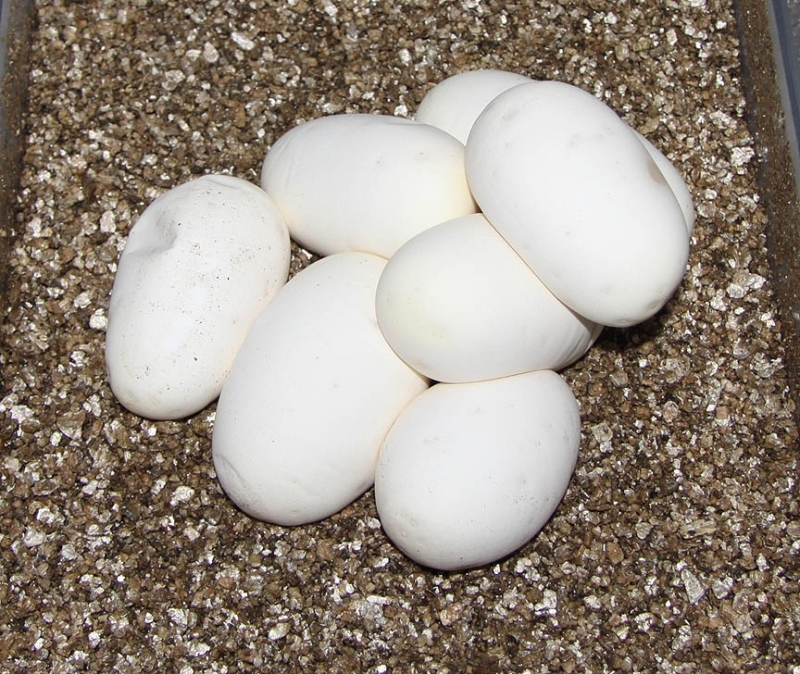 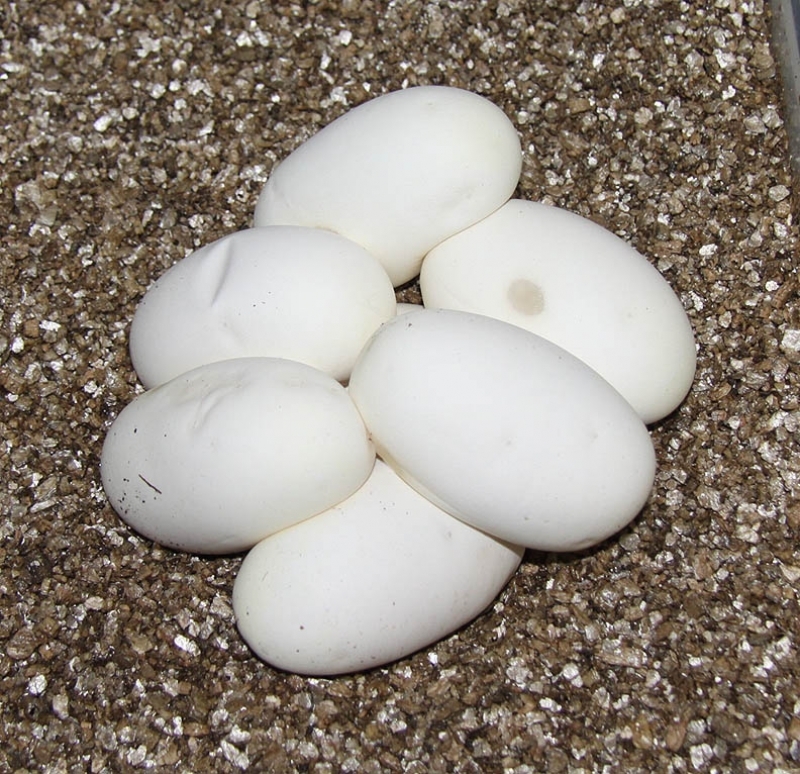 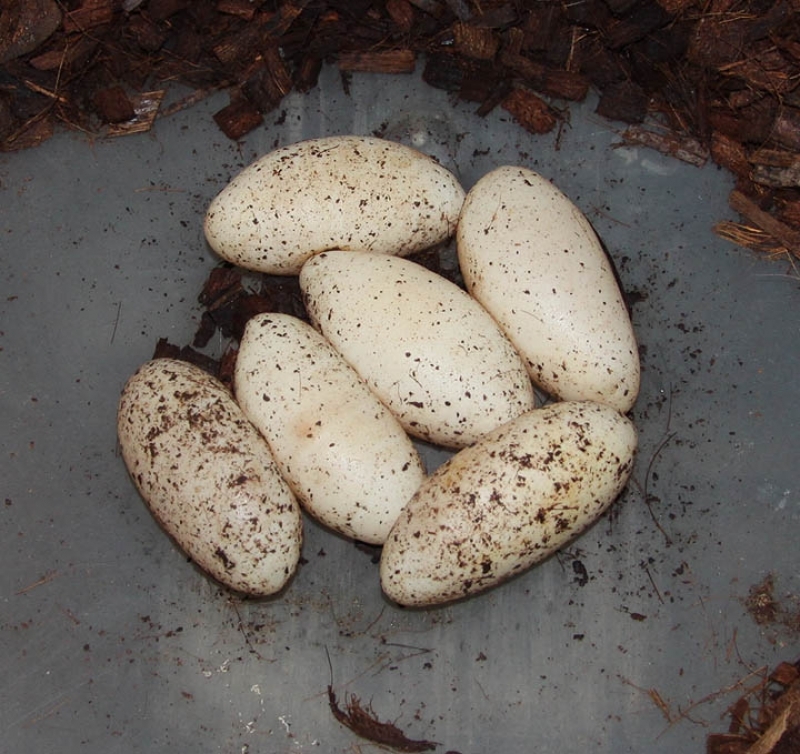 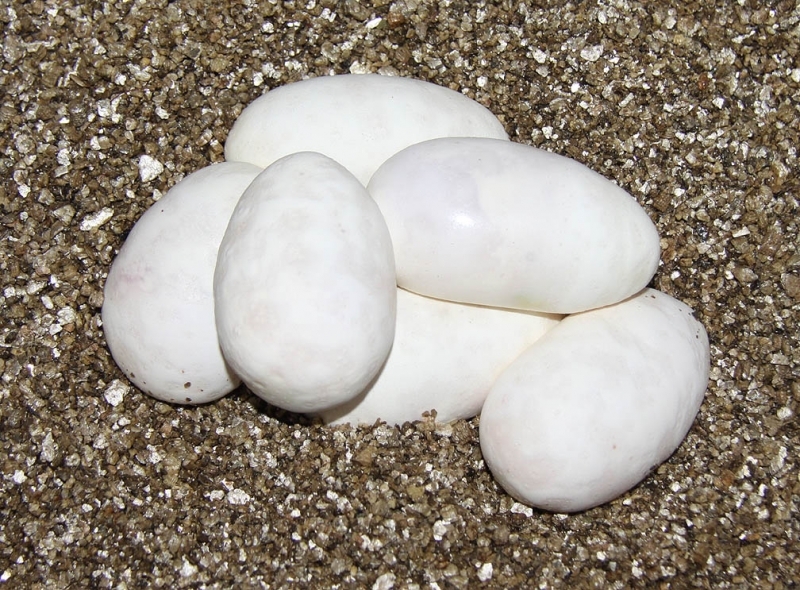 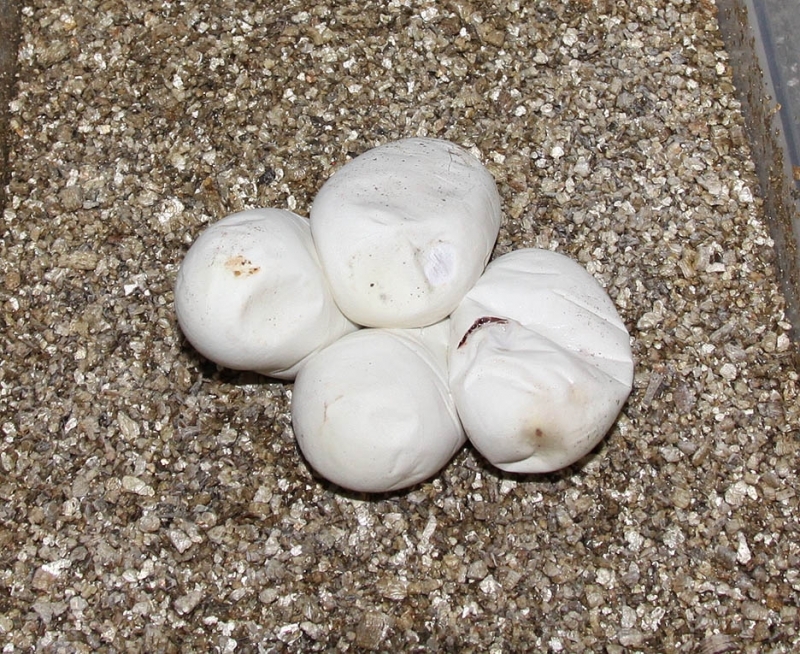 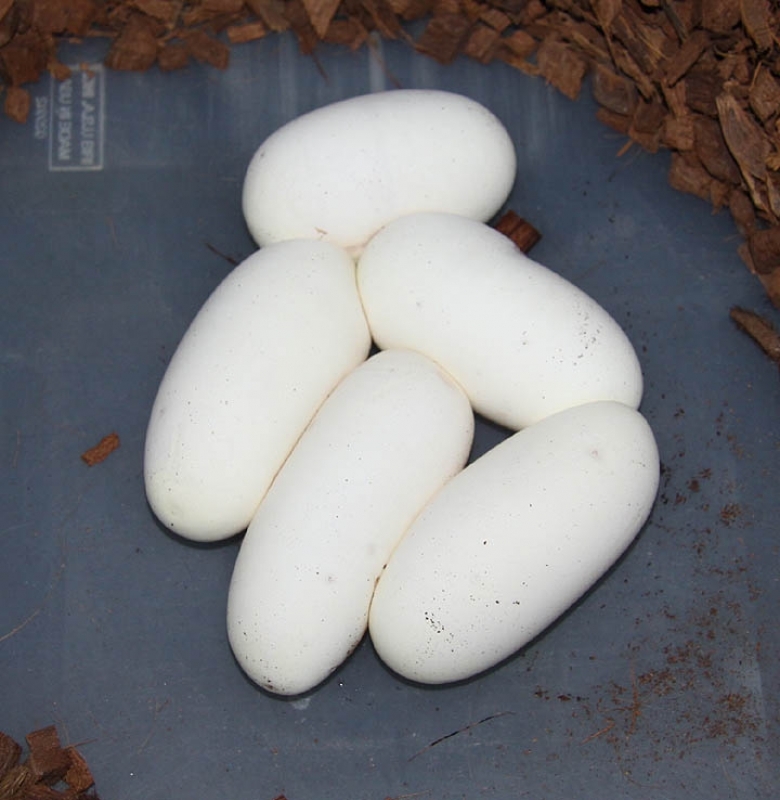 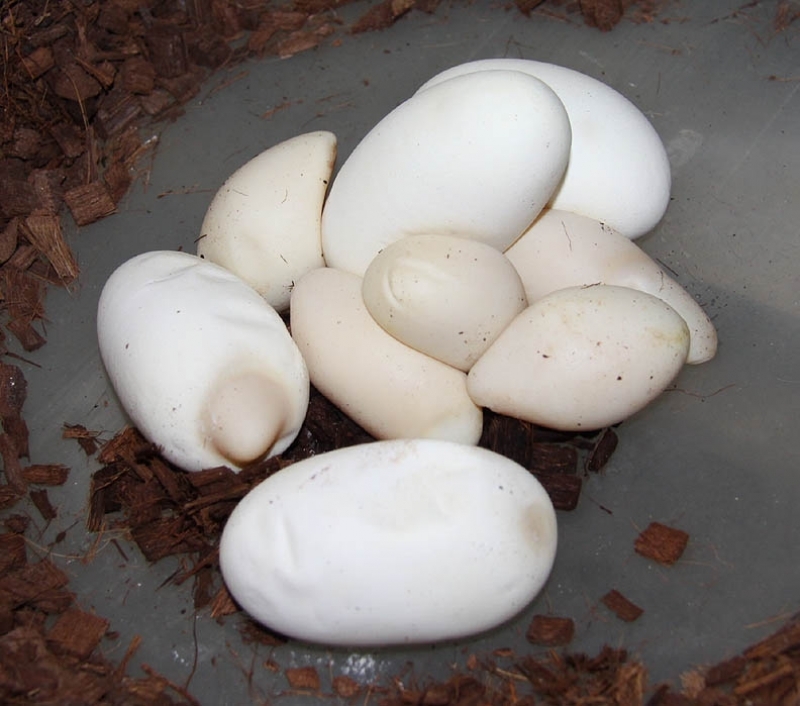 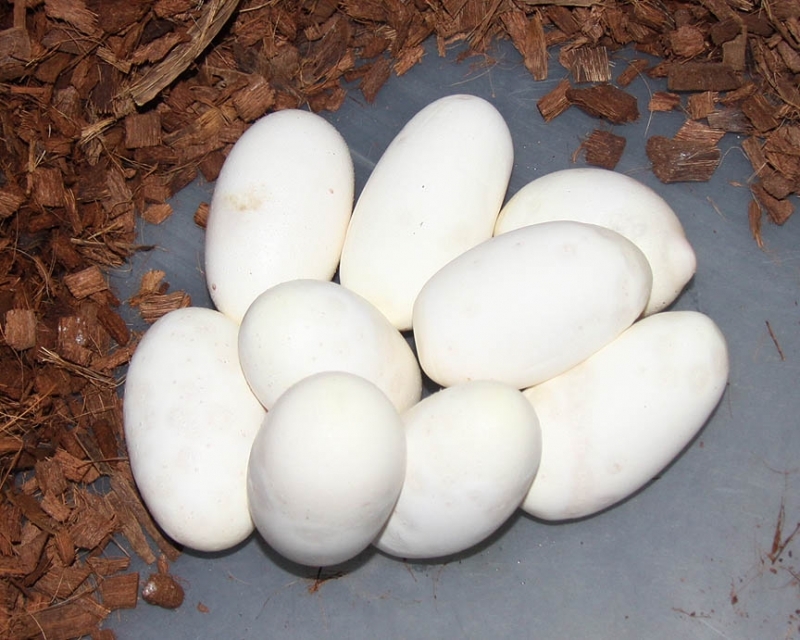 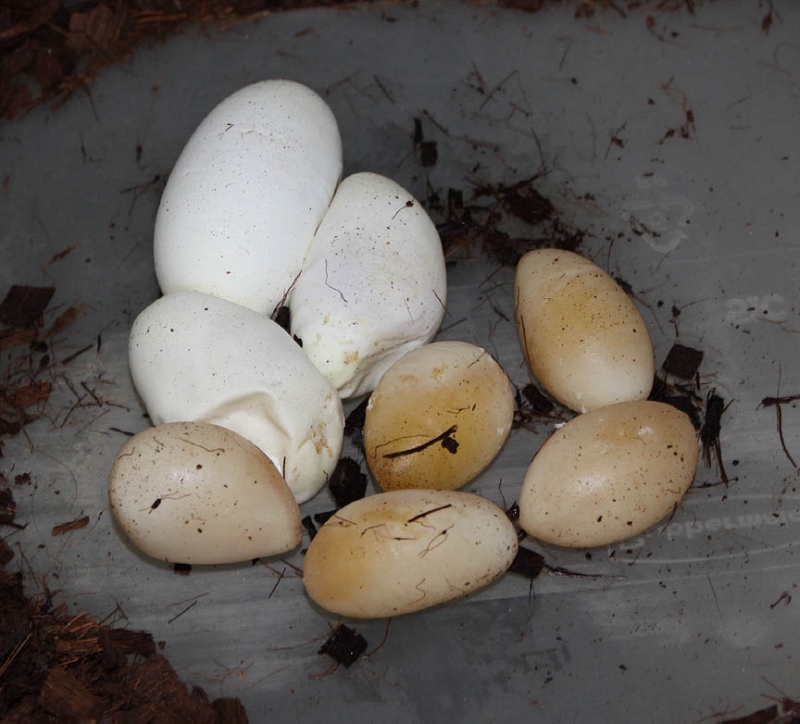 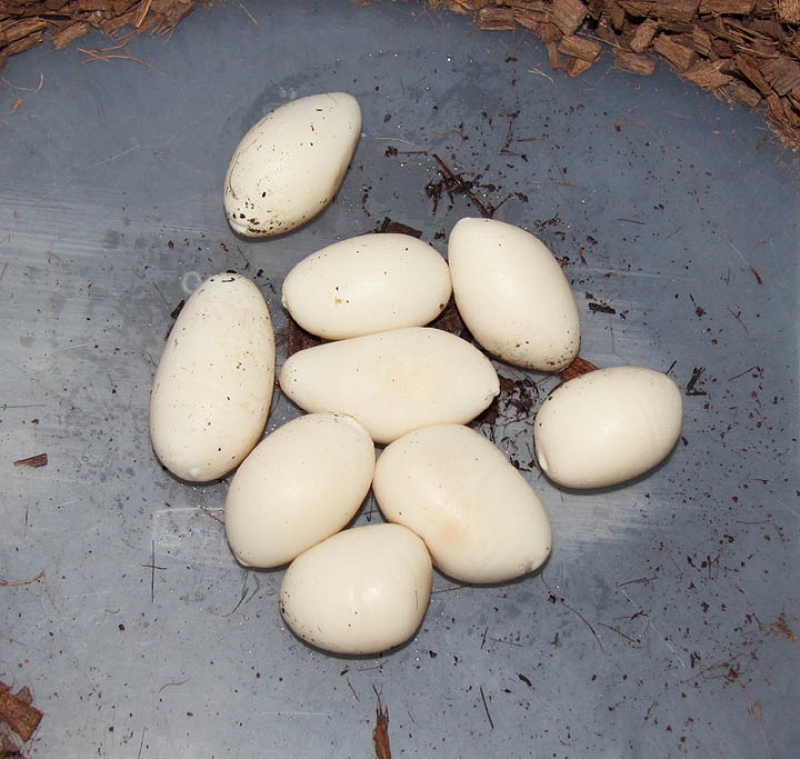 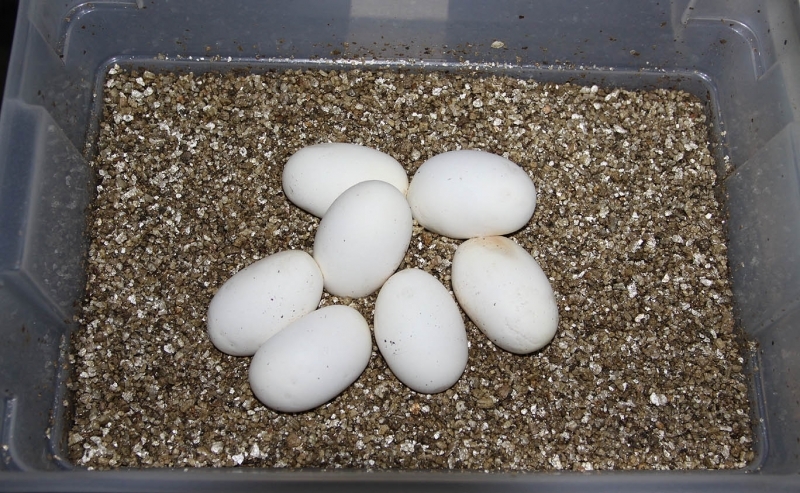 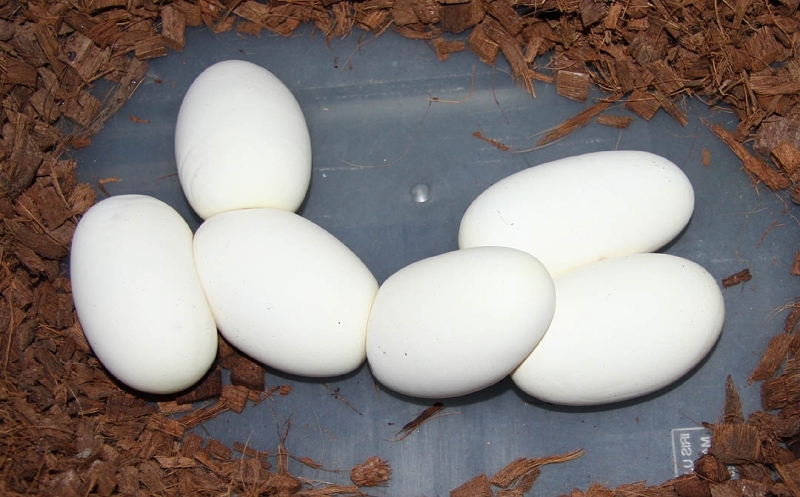 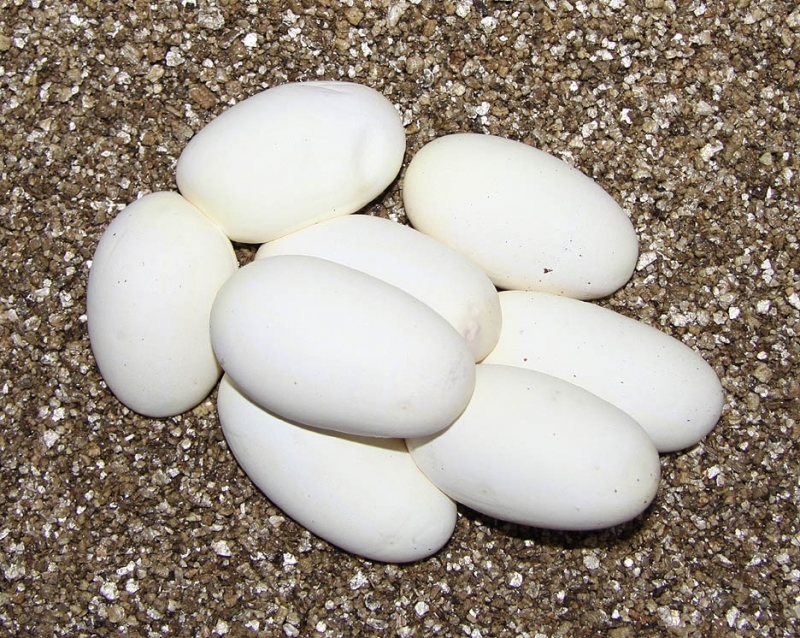 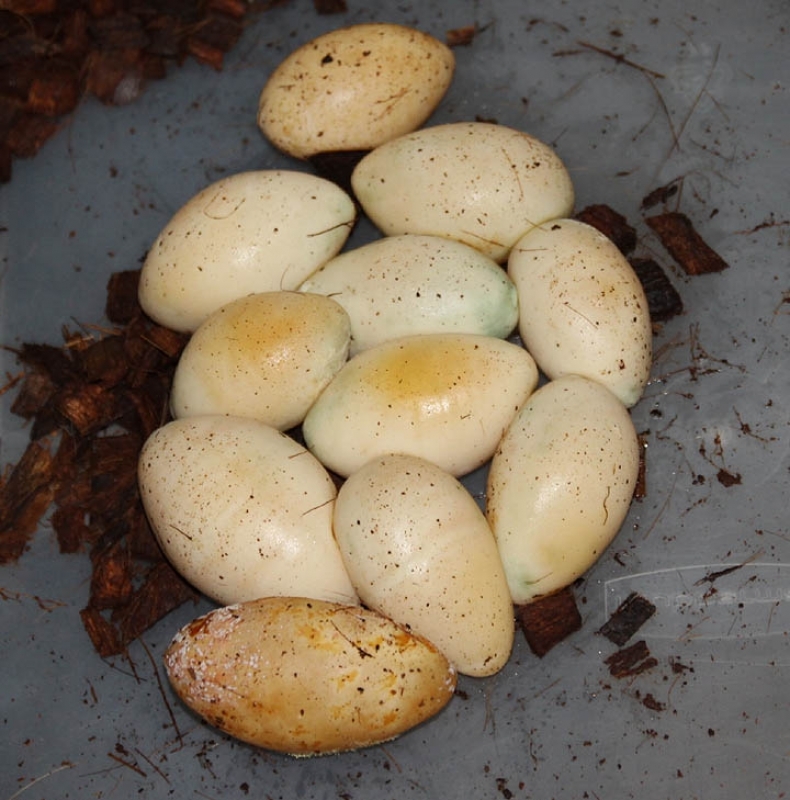 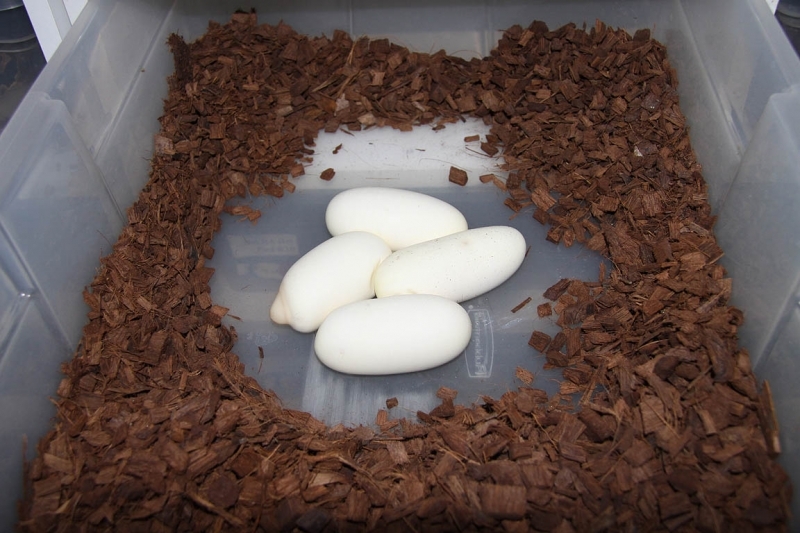 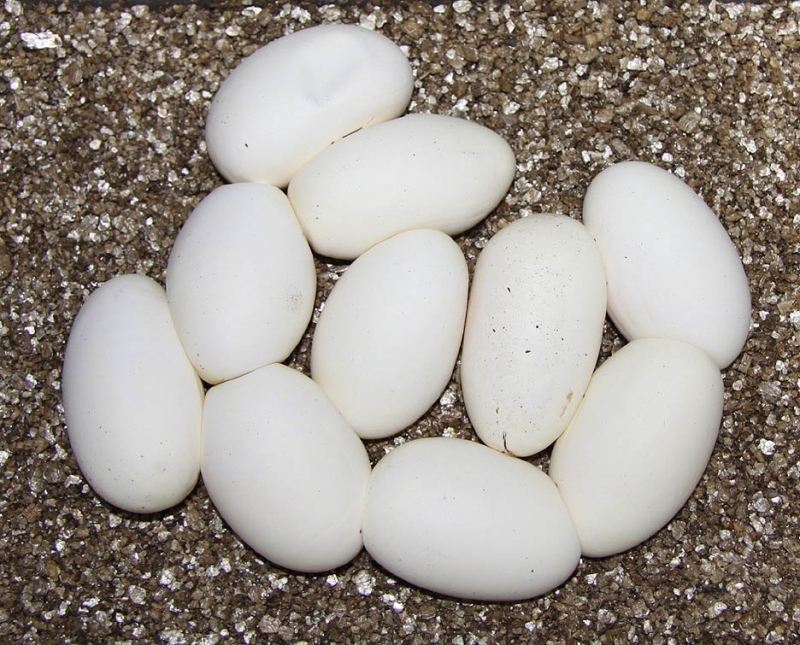 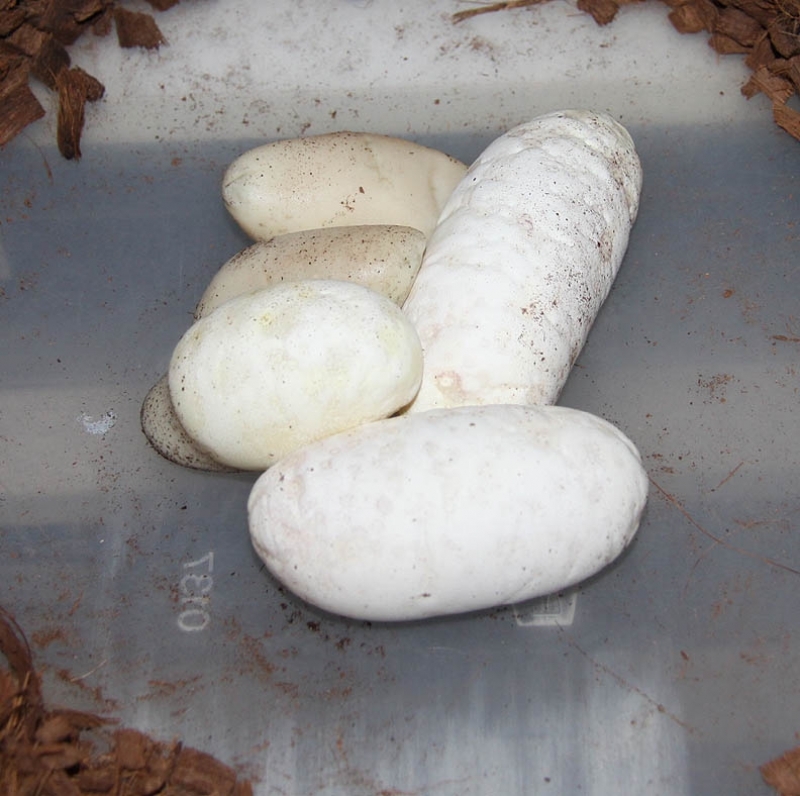 All of the Albinos in this clutch are very nice!! 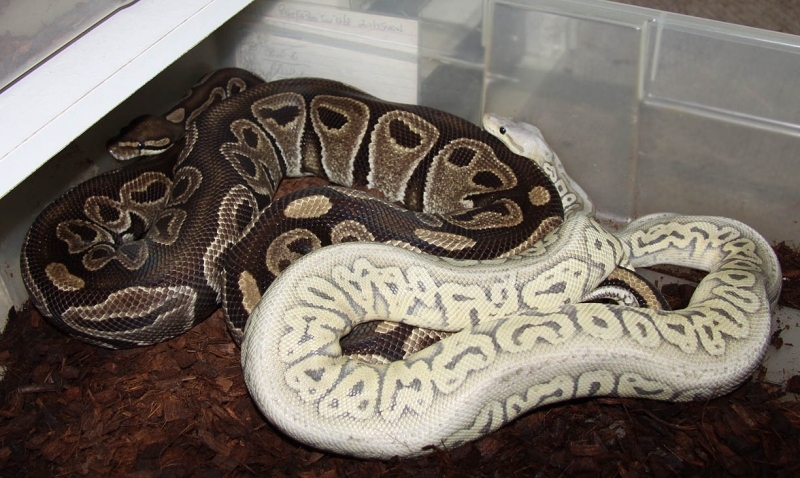 If you are interested in animals from clutch #205 please email or call 519-824-7377. 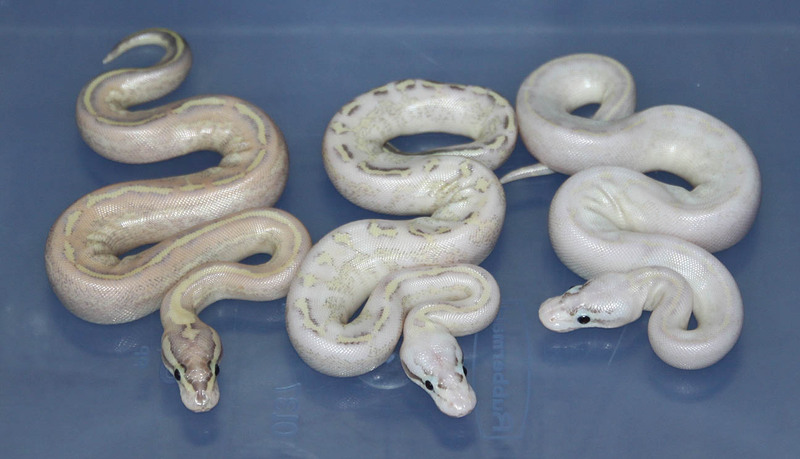 Description: Pastel YB DH Ghost 7/11 & 8/11 x Pastel YB DH Ghost 7/11. 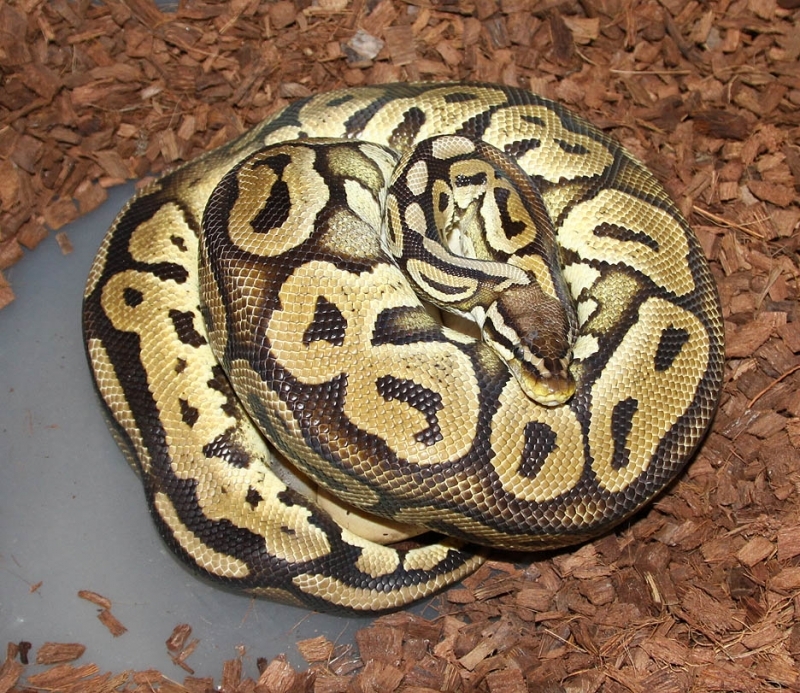 If you are interested in animals from clutch #206 please email or call 519-824-7377. 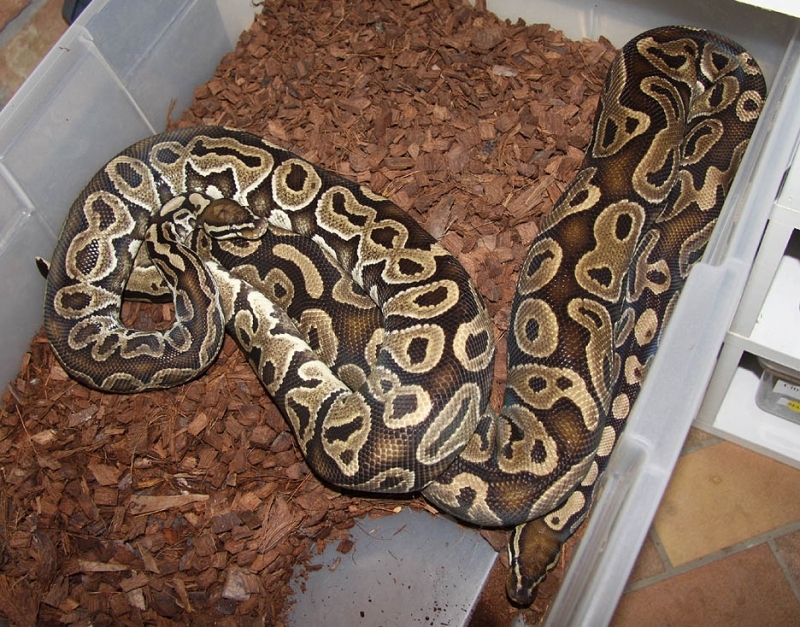 Description: Het RA Het Pied 5/10 x Het Pied 16/06. 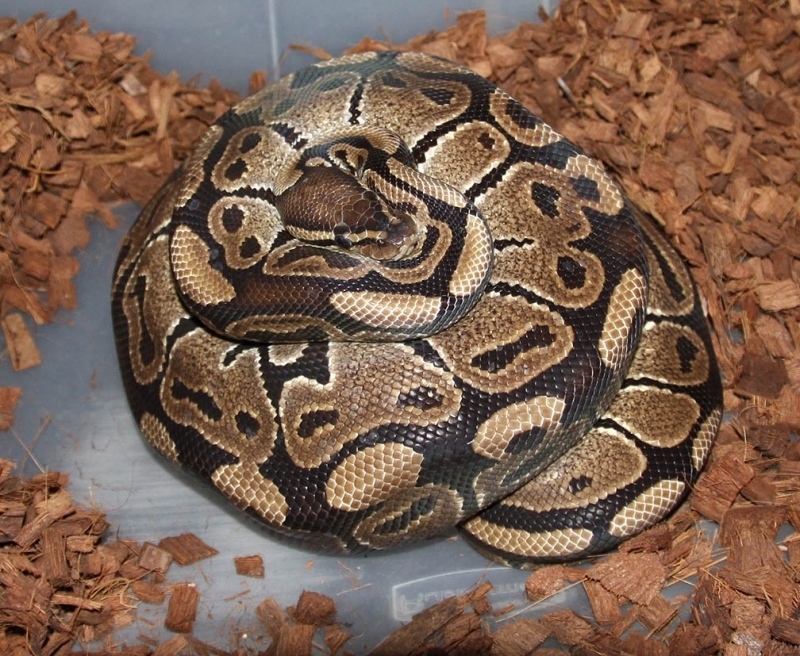 If you are interested in animals from clutch #207 please email or call 519-824-7377. 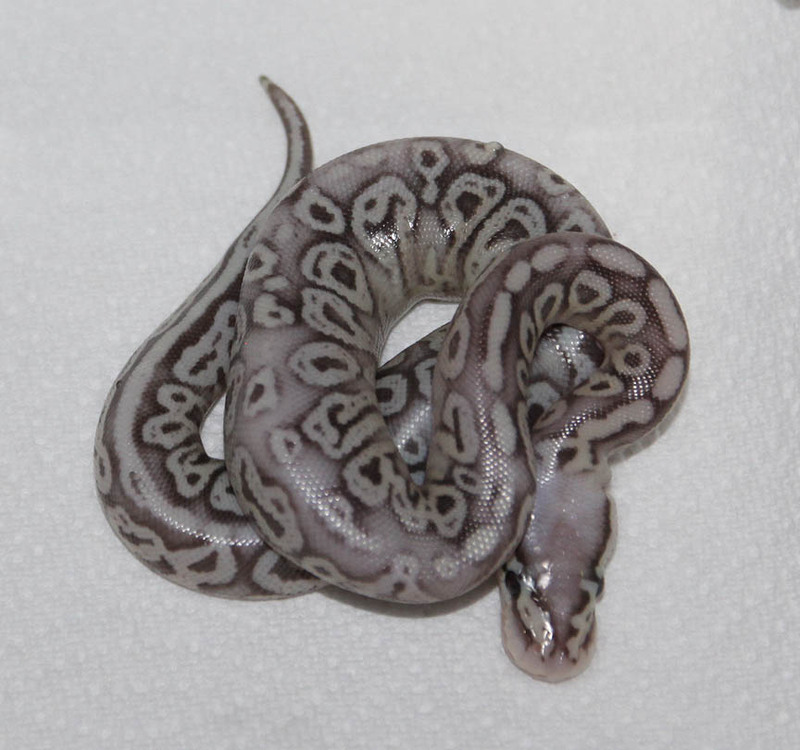 Description: Pastel YB DH Ghost 8/11 x POG 3/06. 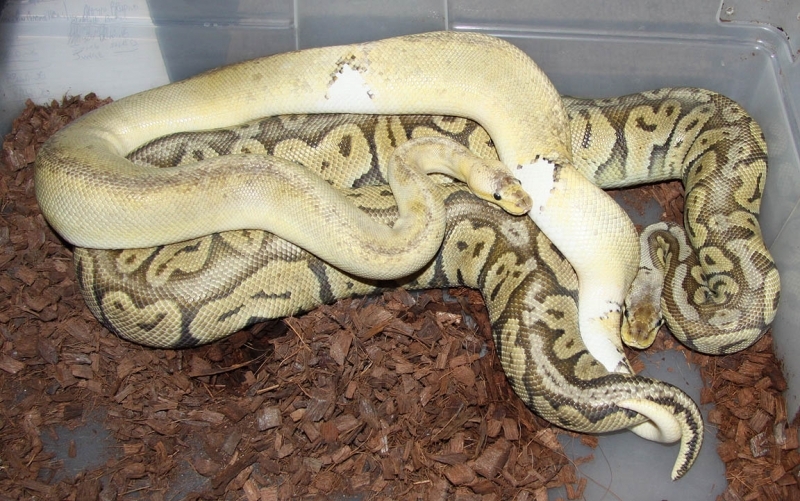 If you are interested in animals from clutch #208 please email or call 519-824-7377. 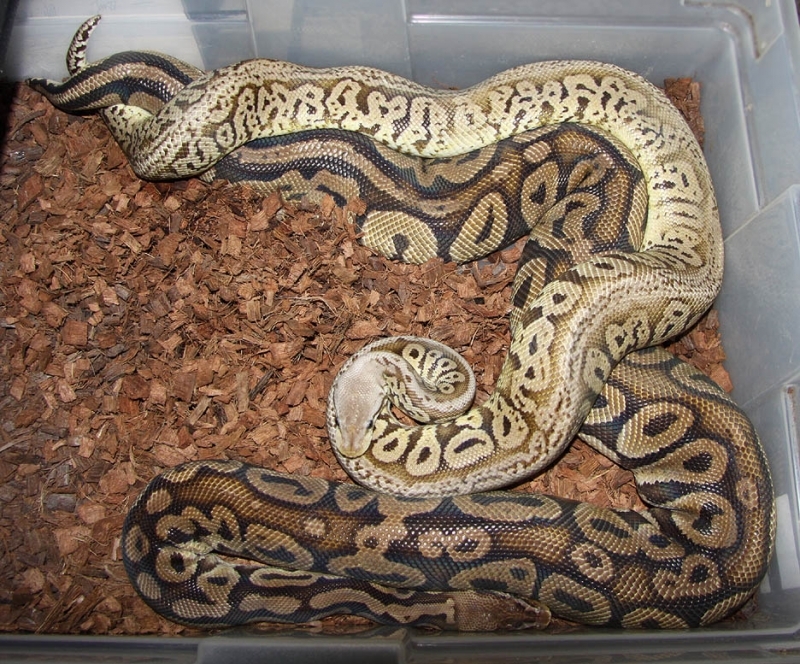 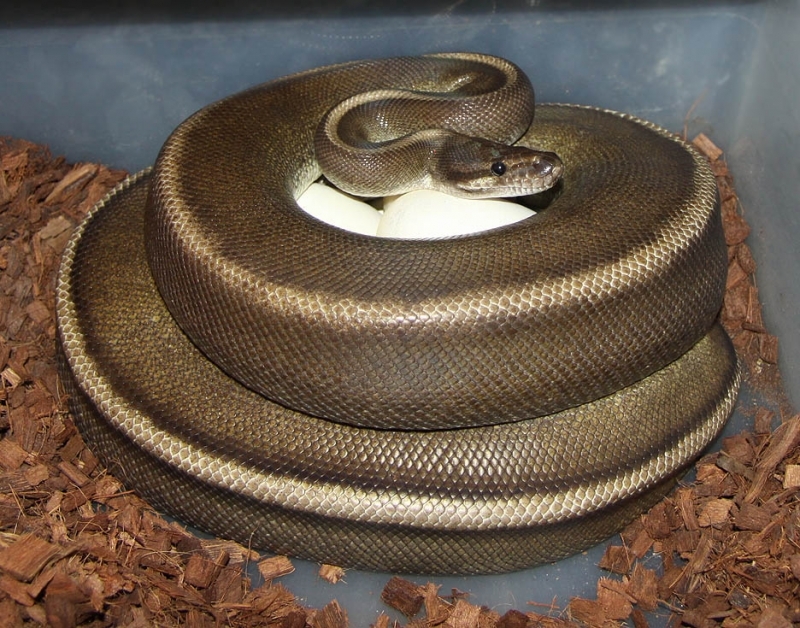 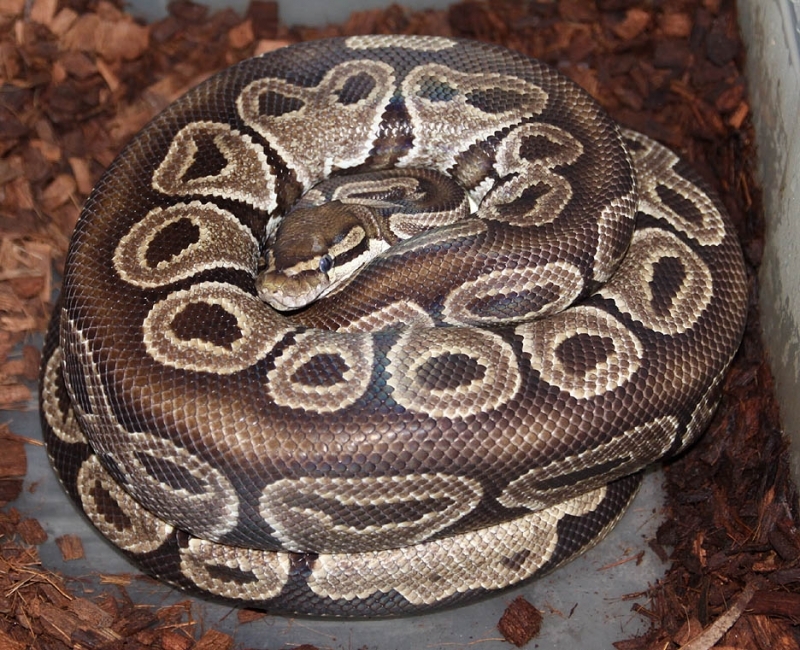 Description: Pastel Banded 1/11 x Lesser Het Banded 1/07. 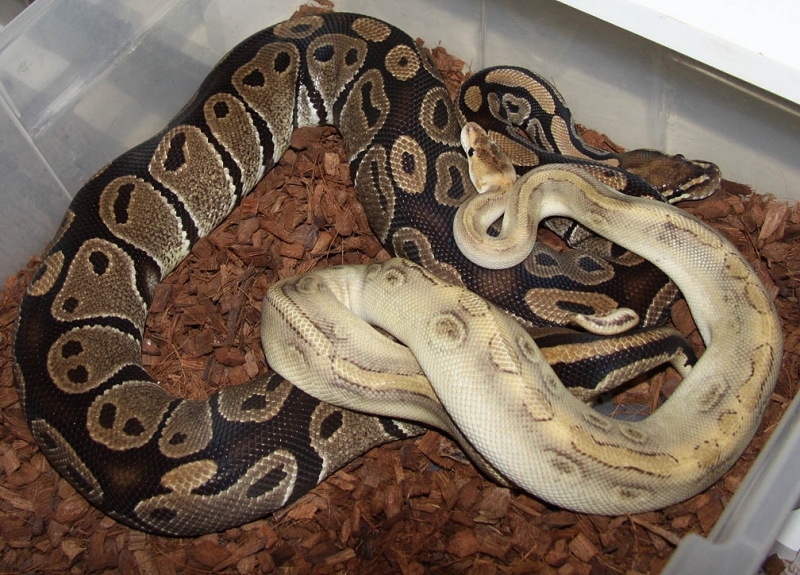 If you are interested in animals from clutch #209 please email or call 519-824-7377. 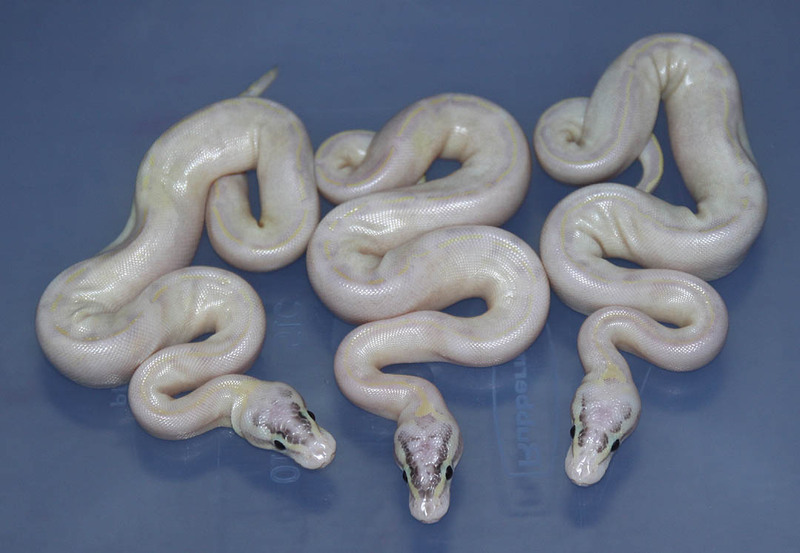 Description: Citrus Puma 1/11 & 2/11 & Suma 1/11 & X Pastel HRA 1/11 x Ivory 1/08 SH. 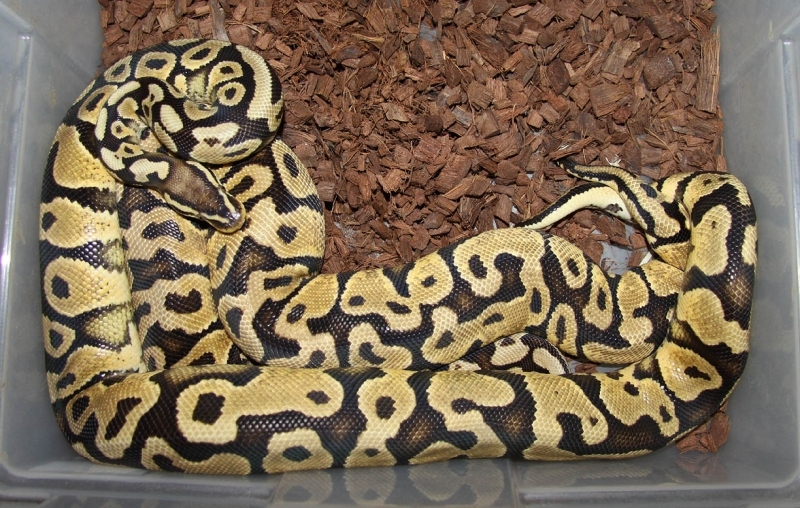 I didn't see any male breed this female. 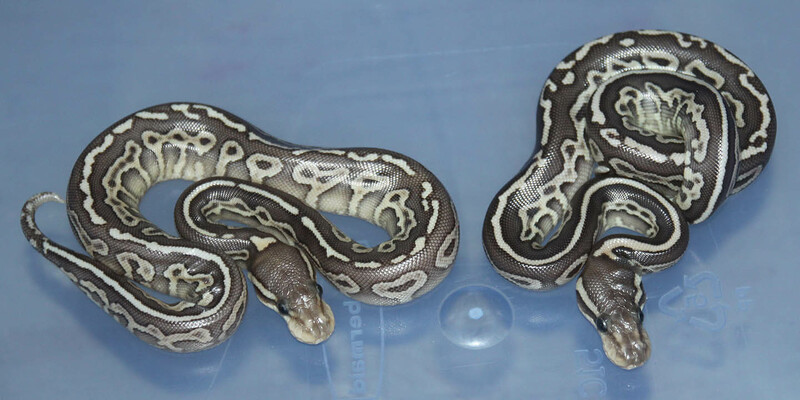 So, I kept picking males that I could tell which one bred the female. 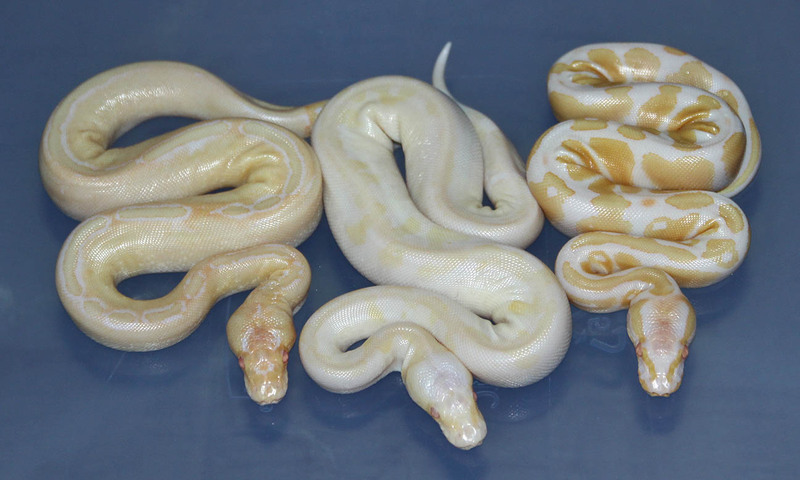 And a bunch of combos of each. 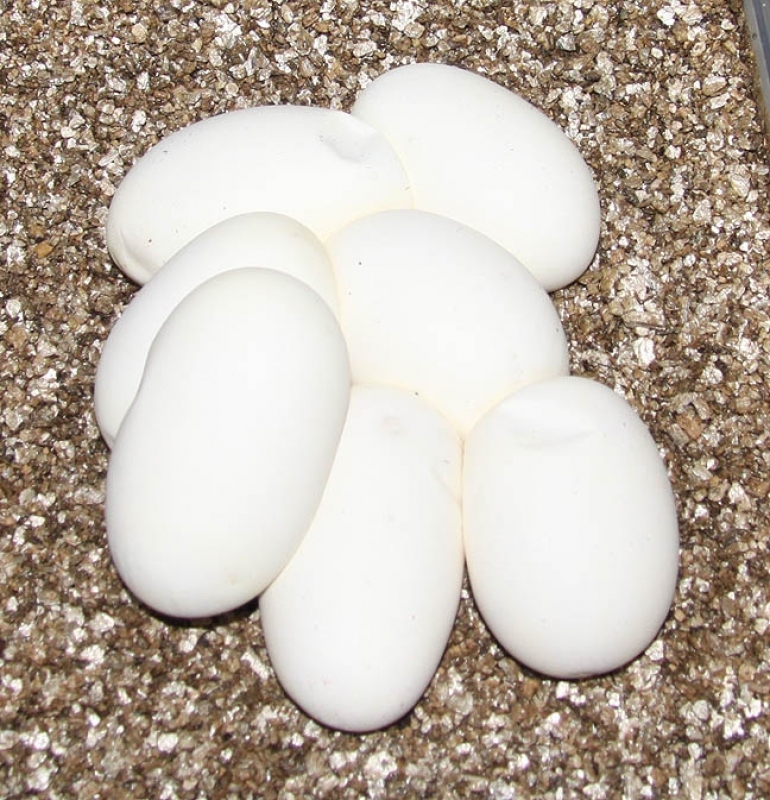 So, I'll be able to tell what male fathers this clutch. 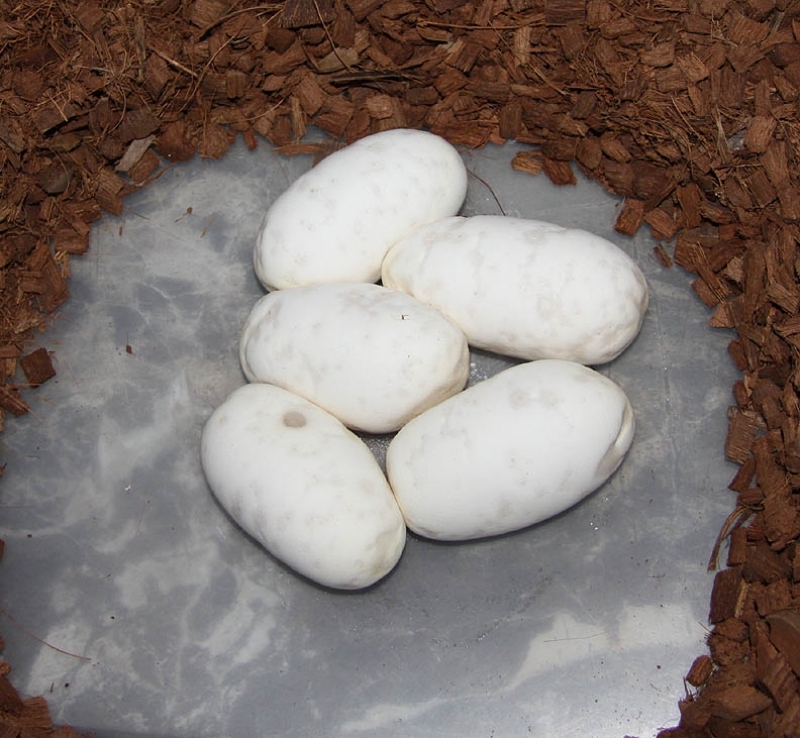 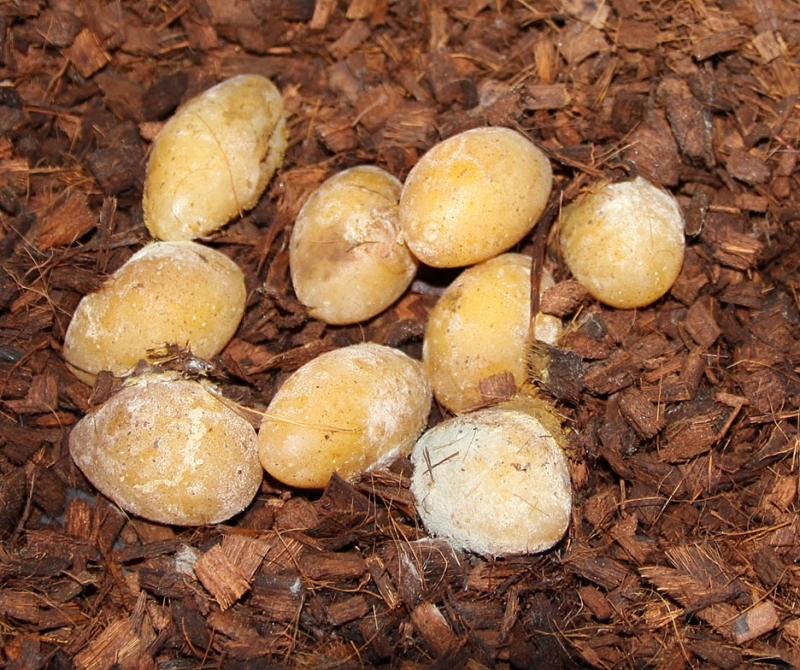 One of the two Citrus Puma males fathered the entire clutch! 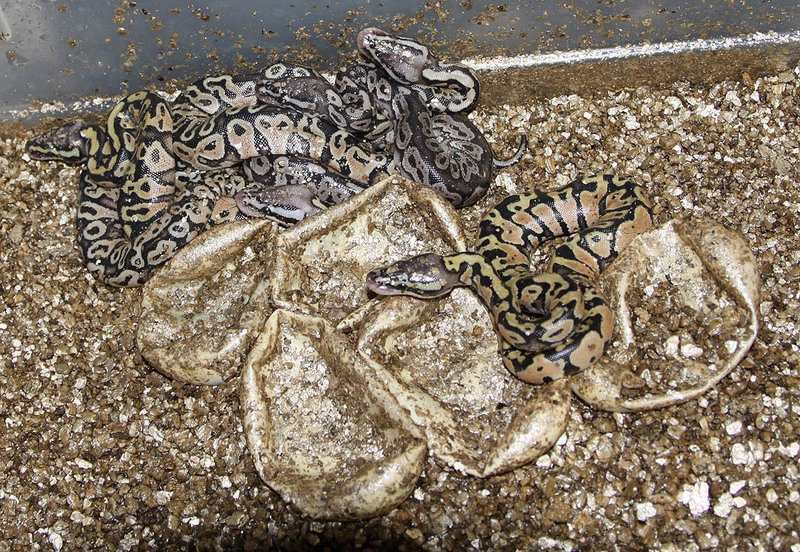 If you are interested in animals from clutch #210 please email or call 519-824-7377. 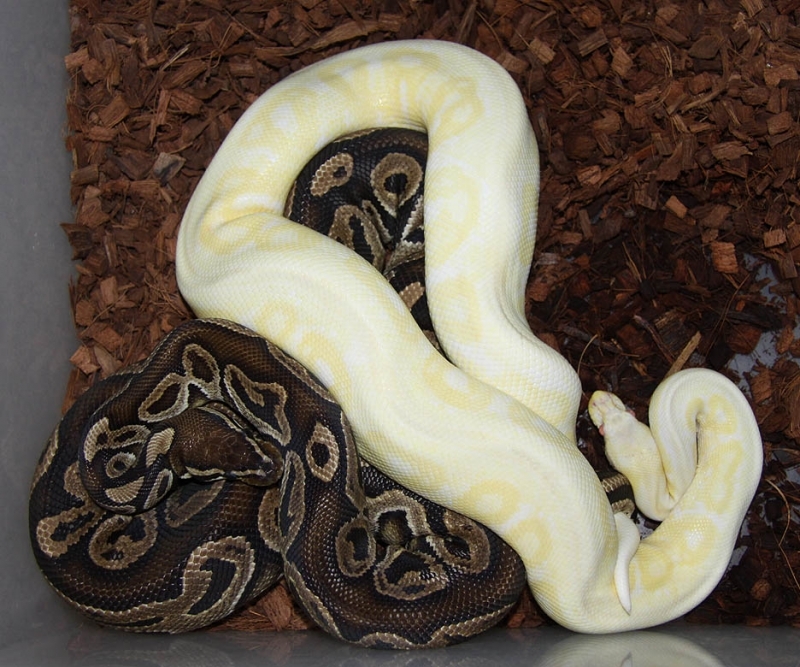 Description: Pastel Ivory 1/11 JW x HY YB 6/09. 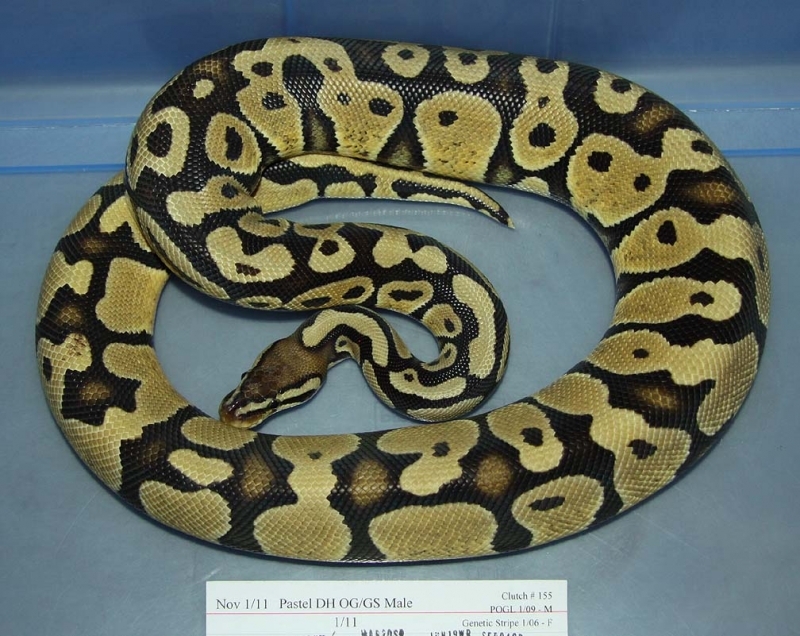 If you are interested in animals from clutch #211 please email or call 519-824-7377. 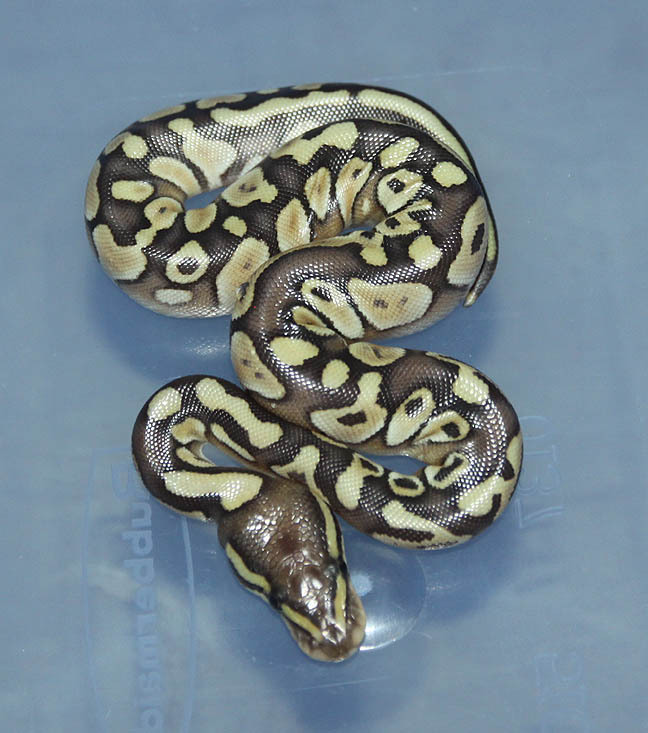 Description: Super Pastel Genetic Stripe 1/11 x Pastel Het GS 4/07. 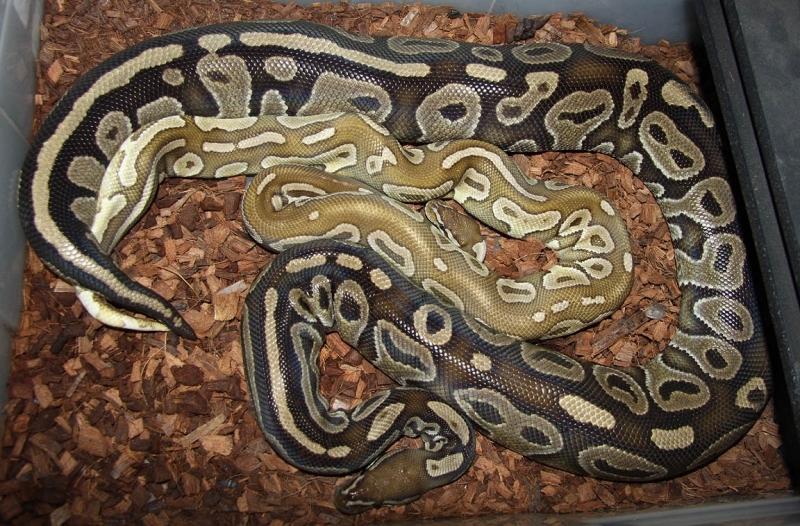 If you are interested in animals from clutch #212 please email or call 519-824-7377. 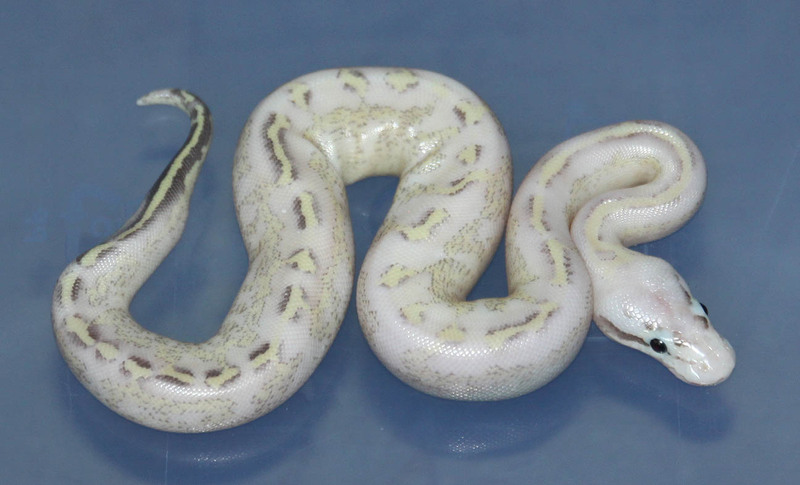 Description: Pastel Pin Champ HRA 1/10 x Opal HRA 1/08. 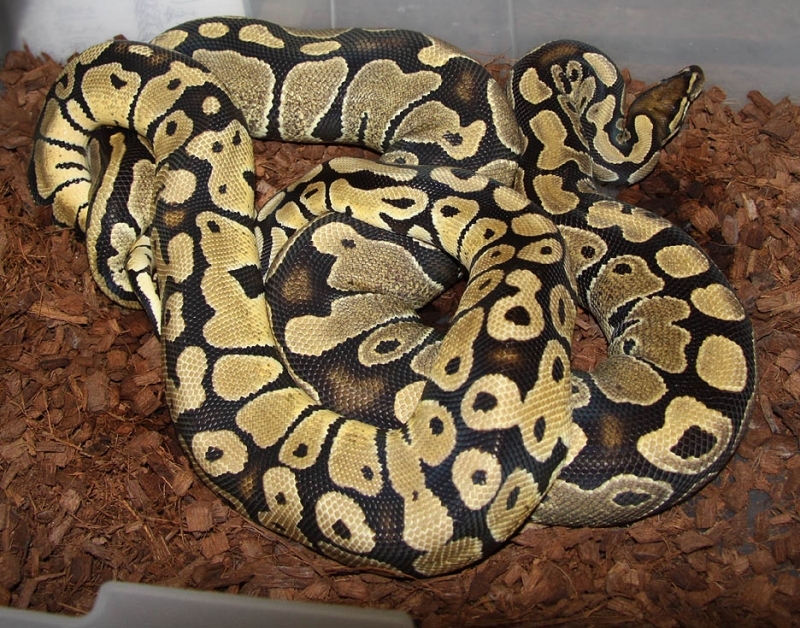 If you are interested in animals from clutch #213 please email or call 519-824-7377. 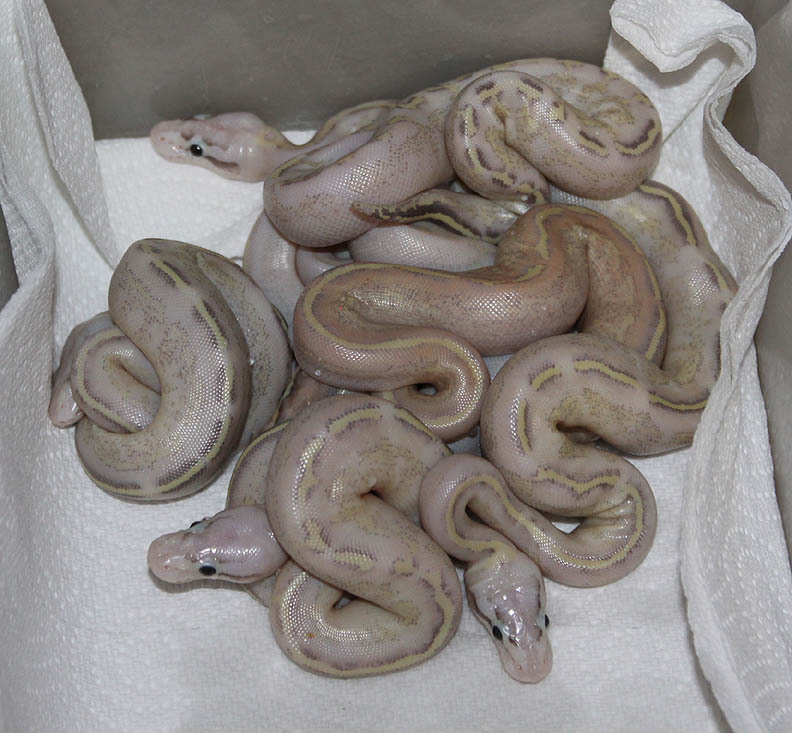 Description: Pastel Lesser Red Axanthic 1/11 x Het RA 20/06. 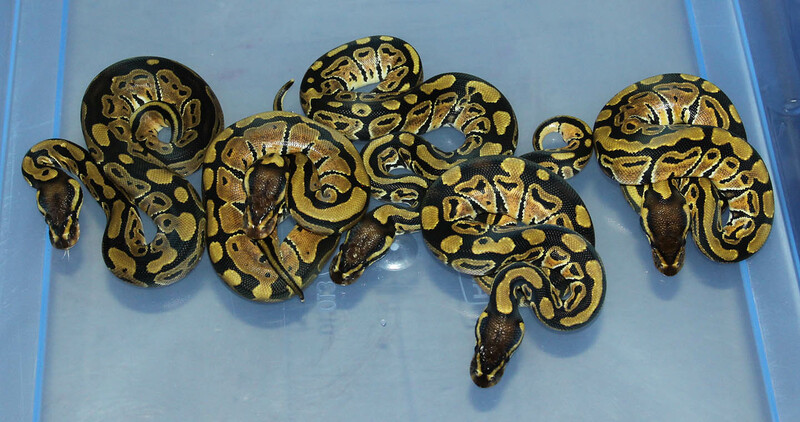 If you are interested in animals from clutch #214 please email or call 519-824-7377. 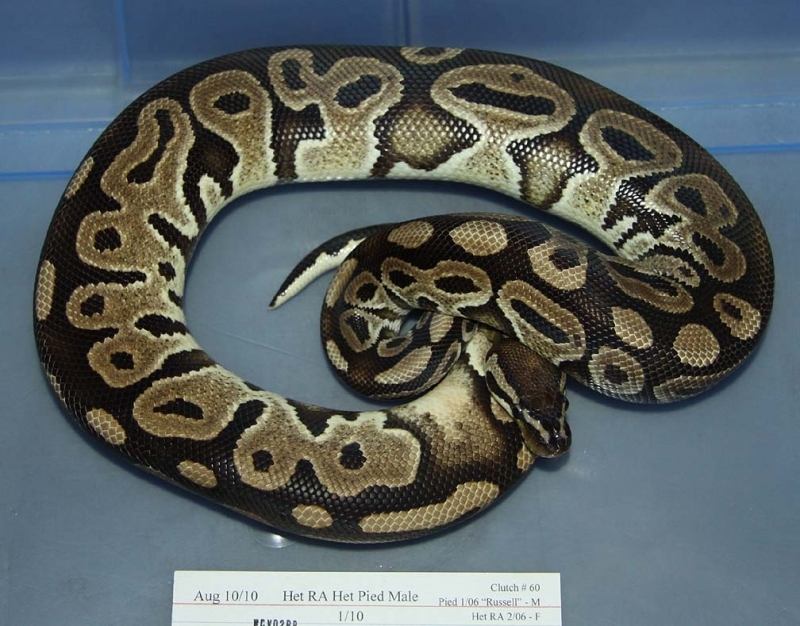 Description: Het RA Het Pied 8/10 x Het RA Het Pied 8/10. 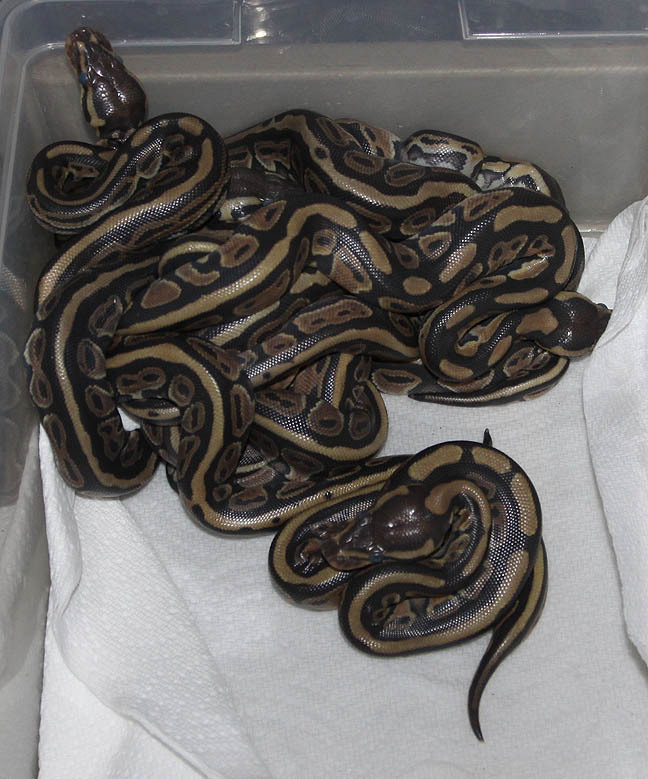 If you are interested in animals from clutch #215 please email or call 519-824-7377. 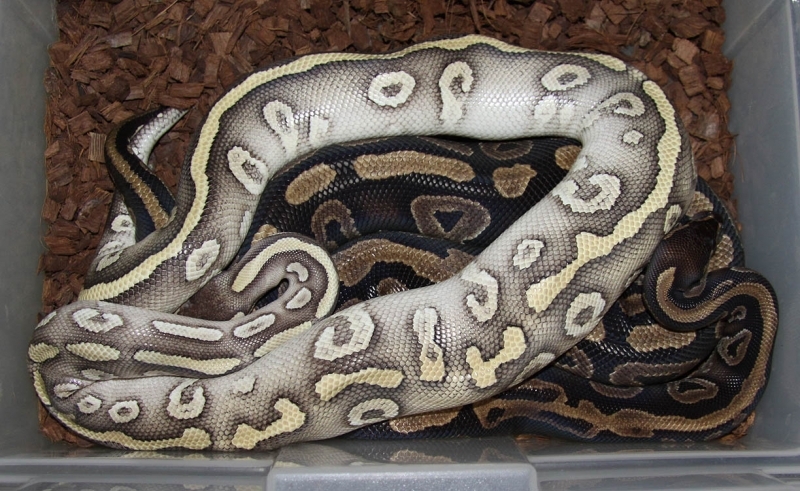 If you are interested in animals from clutch #216 please email or call 519-824-7377. 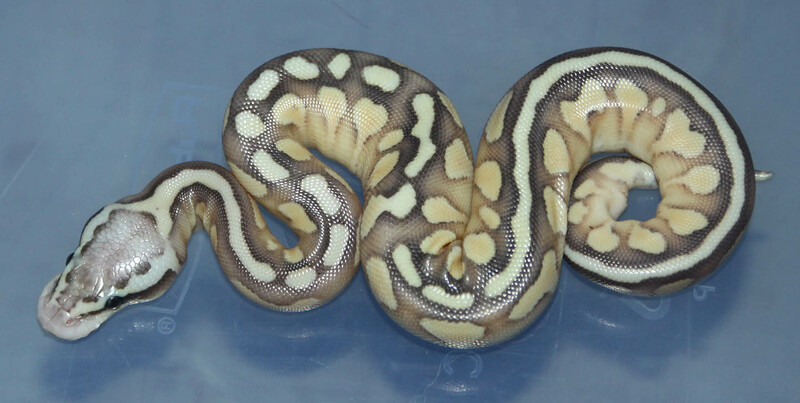 Description: Pastel GS HRA 2/11 x GS HRA 2/10. 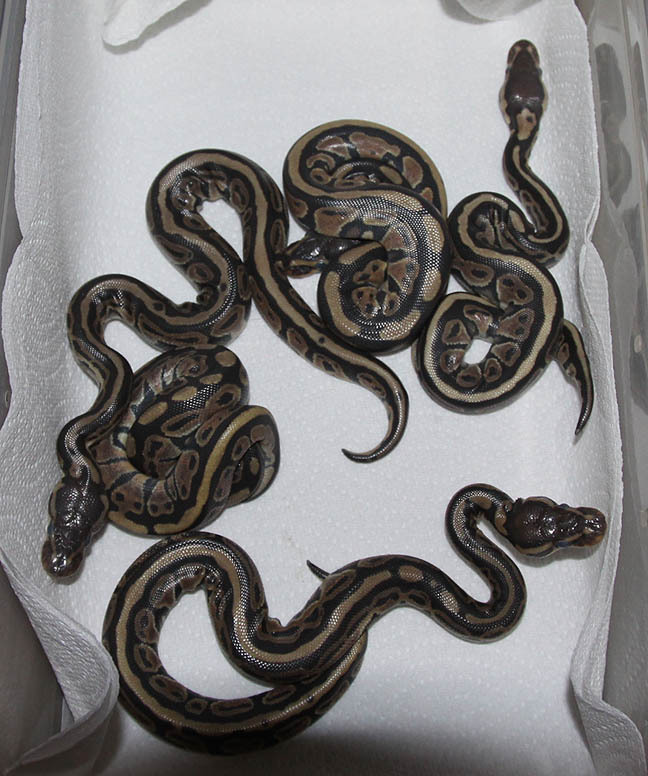 If you are interested in animals from clutch #217 please email or call 519-824-7377. 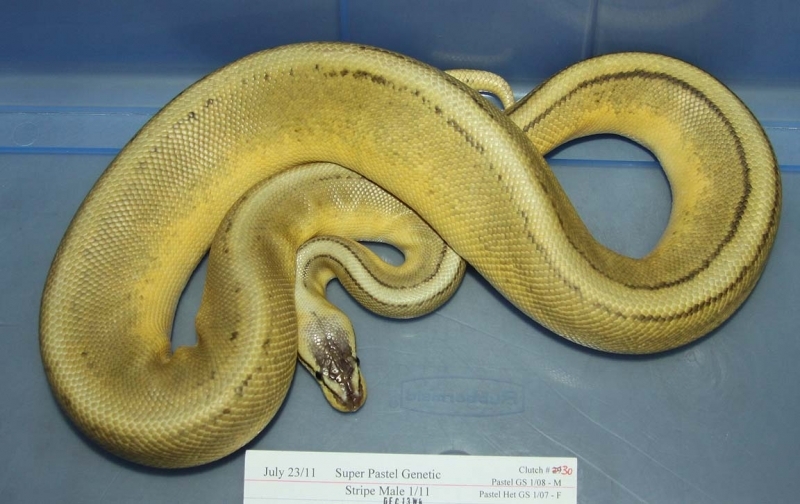 Description: Super Phantom 6/10 RDR x Pin Champ HRA 2/10. 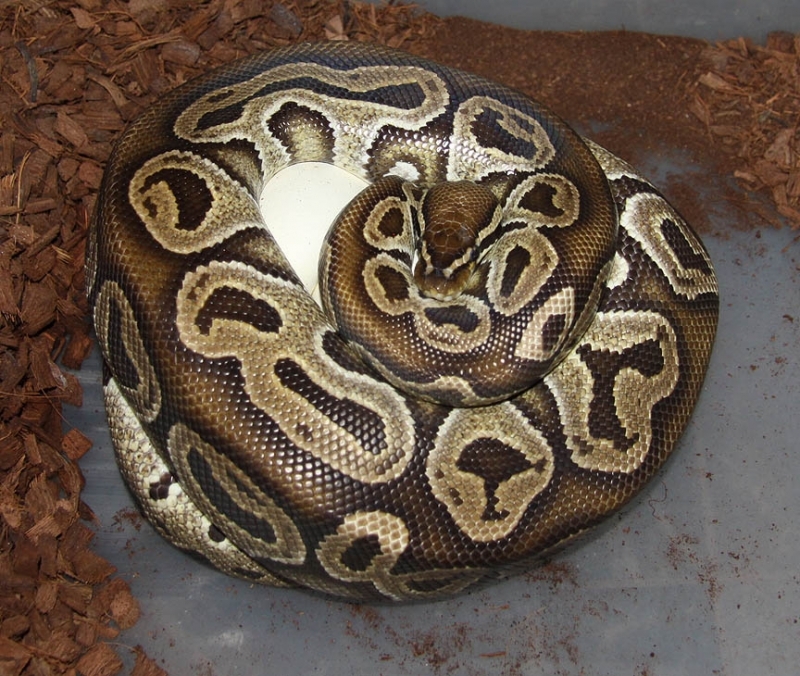 If you are interested in animals from clutch #218 please email or call 519-824-7377. 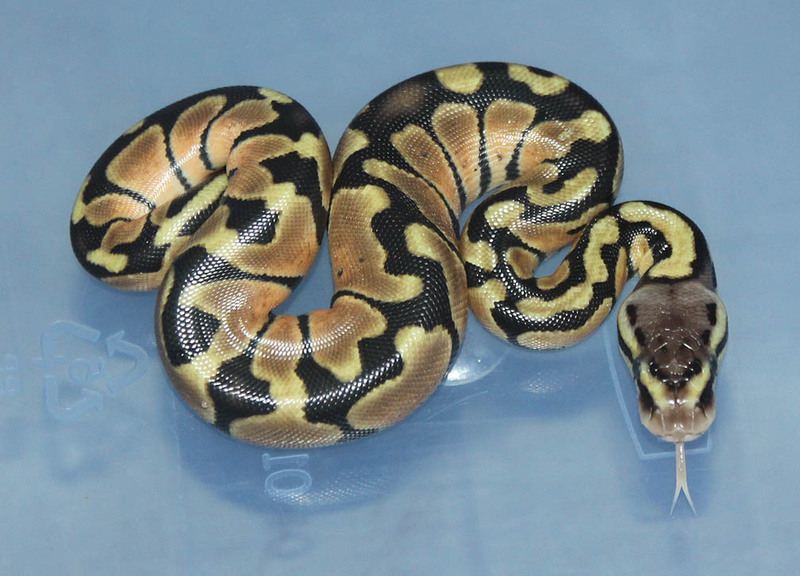 Description: Banded HRA 1/11 x Pastel HRA Het Banded 1/09. 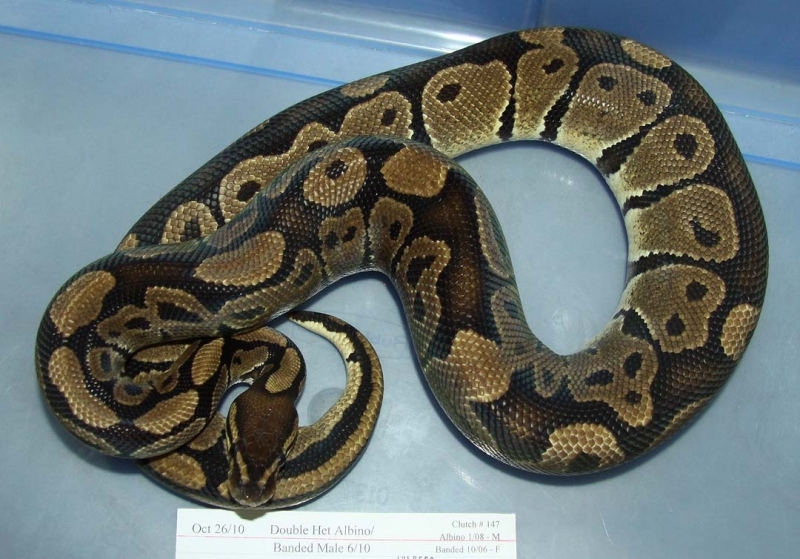 If you are interested in animals from clutch #219 please email or call 519-824-7377. 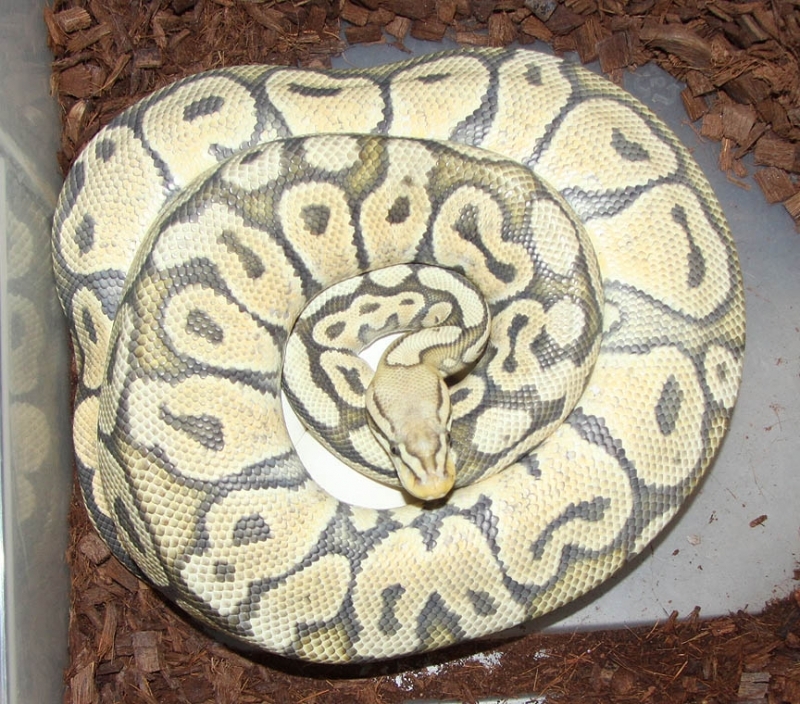 If you are interested in animals from clutch #220 please email or call 519-824-7377. 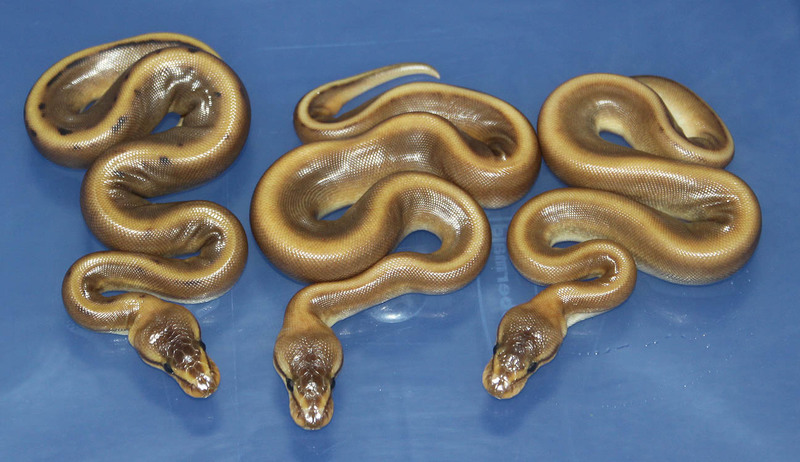 Description: Lesser HRA Het GS 1/10 x Het GS 9/07. 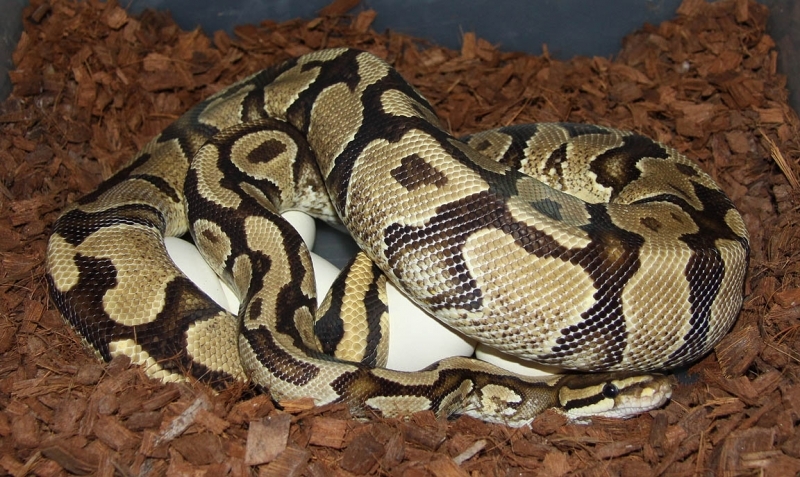 If you are interested in animals from clutch #221 please email or call 519-824-7377. 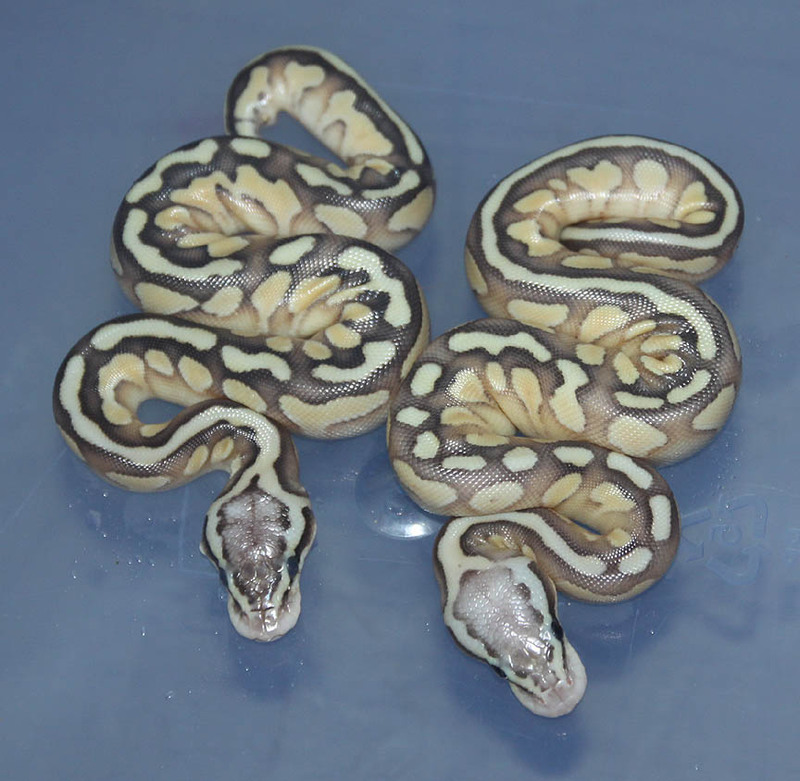 Description: Pastel DH OG/GG 1/11 x DH OG/GG 1/11. 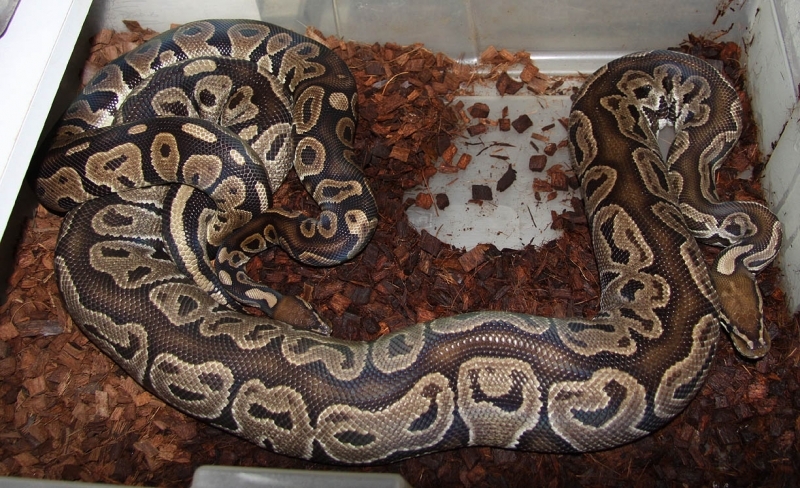 If you are interested in animals from clutch #222 please email or call 519-824-7377. 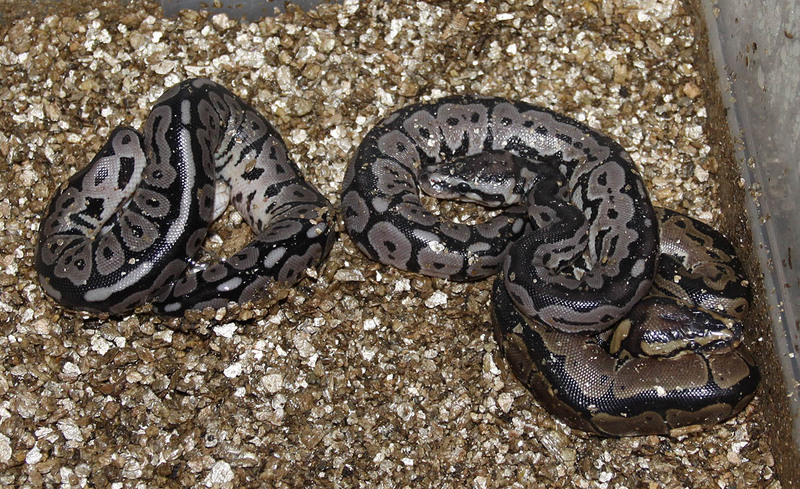 Description: Lesser YB 1/10 x HY YB 1/09. 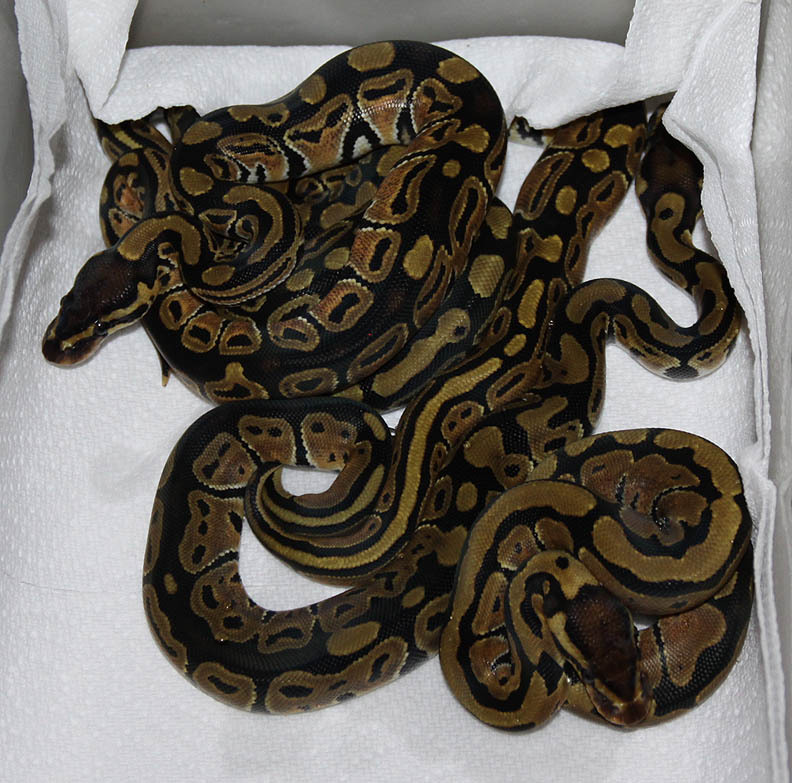 If you are interested in animals from clutch #223 please email or call 519-824-7377. 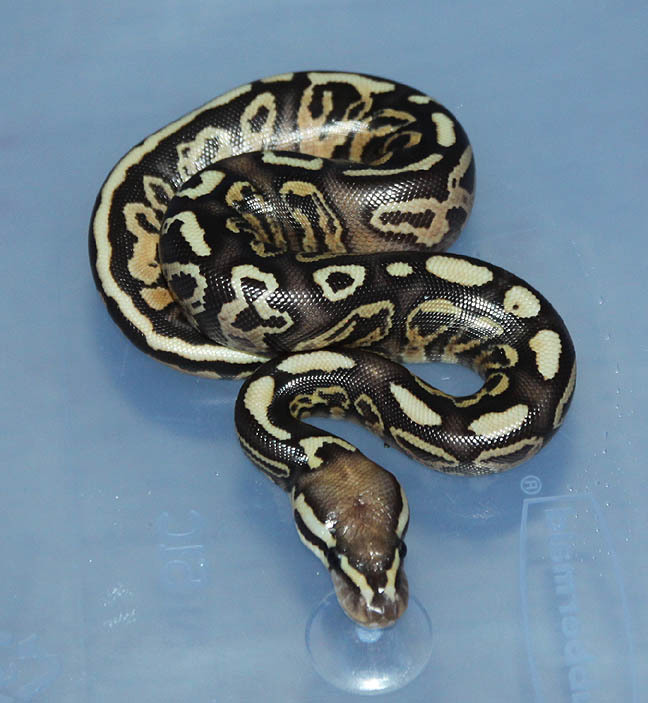 Description: Pastel Pin Champ HRA 1/10 x Pied 1/06 "Smiley". 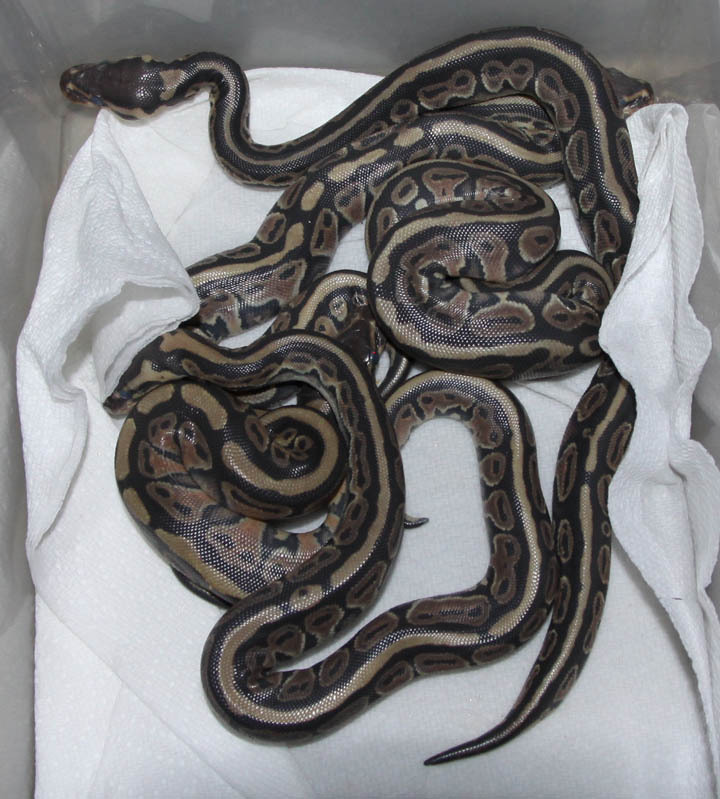 If you are interested in animals from clutch #224 please email or call 519-824-7377. 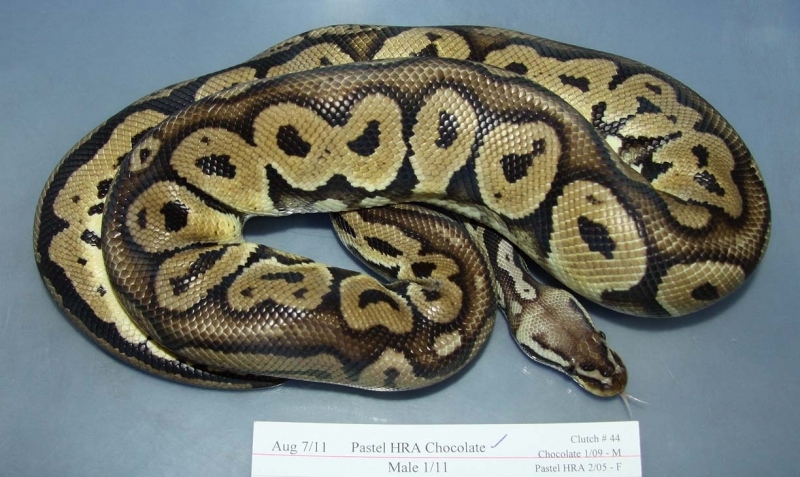 Description: Pastel Chocolate HRA 1/11 x Chocolate 6/11. 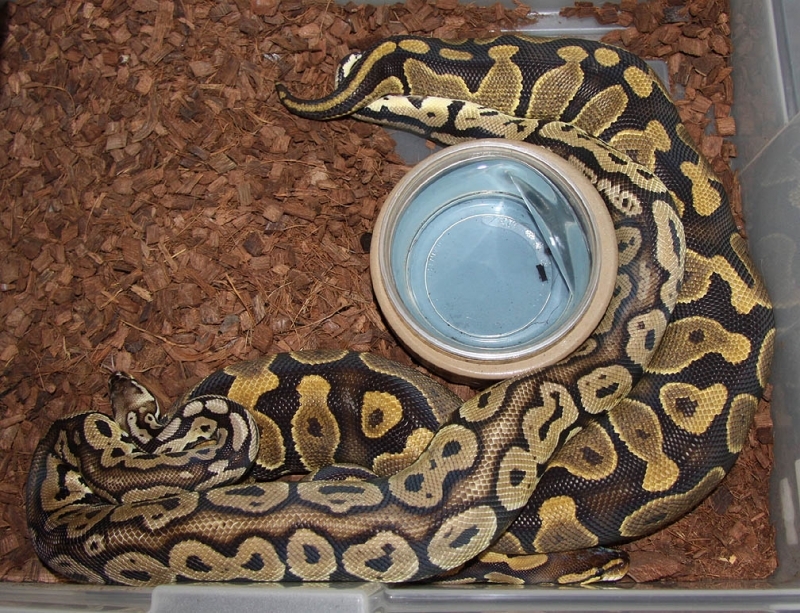 If you are interested in animals from clutch #225 please email or call 519-824-7377. 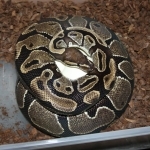 Description: Pied 1/06 "Russell" x HY 16/06. If you are interested in animals from clutch #226 please email or call 519-824-7377. 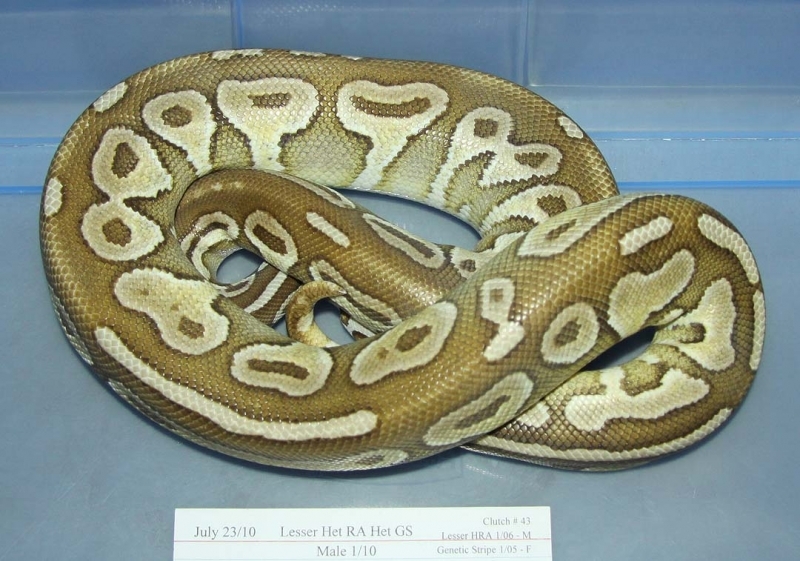 Description: Lesser HRA/GS 1/10 x Het RA/GS 1/08. 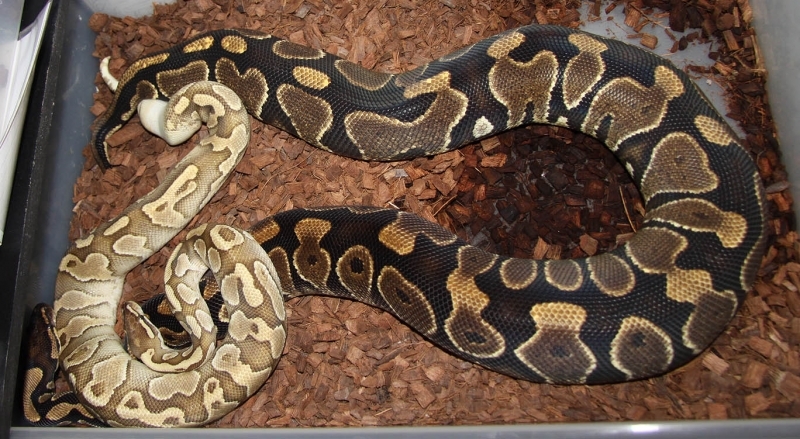 If you are interested in animals from clutch #227 please email or call 519-824-7377. 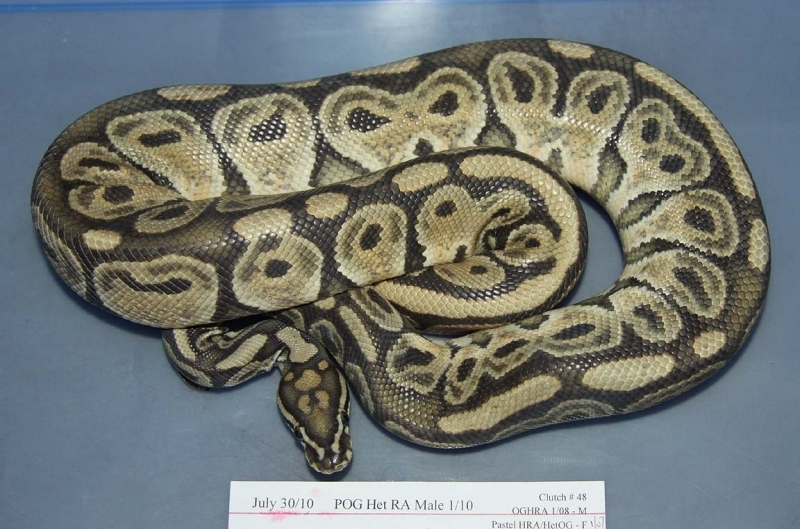 Description: POG HRA 1/10 x Het RA/OG 2/06. 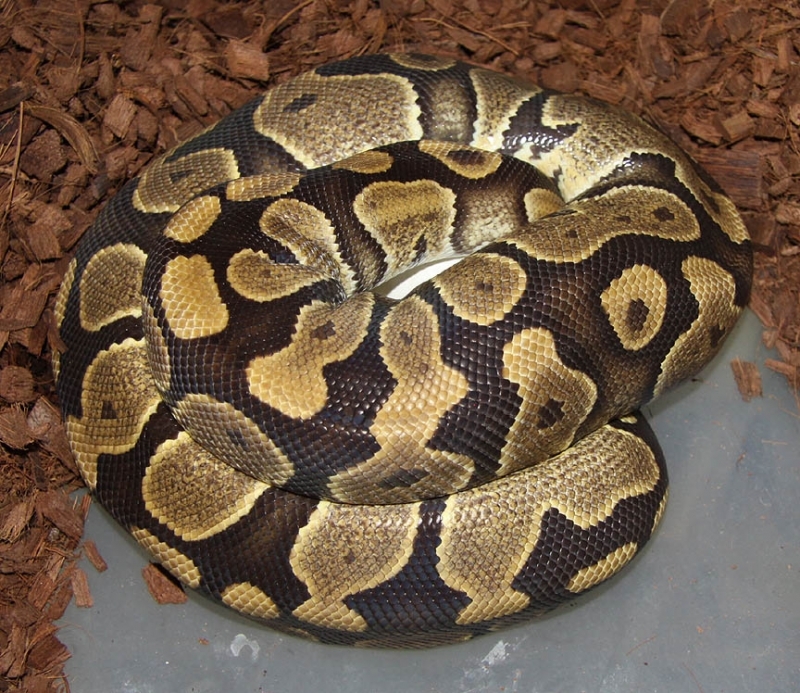 If you are interested in animals from clutch #228 please email or call 519-824-7377. 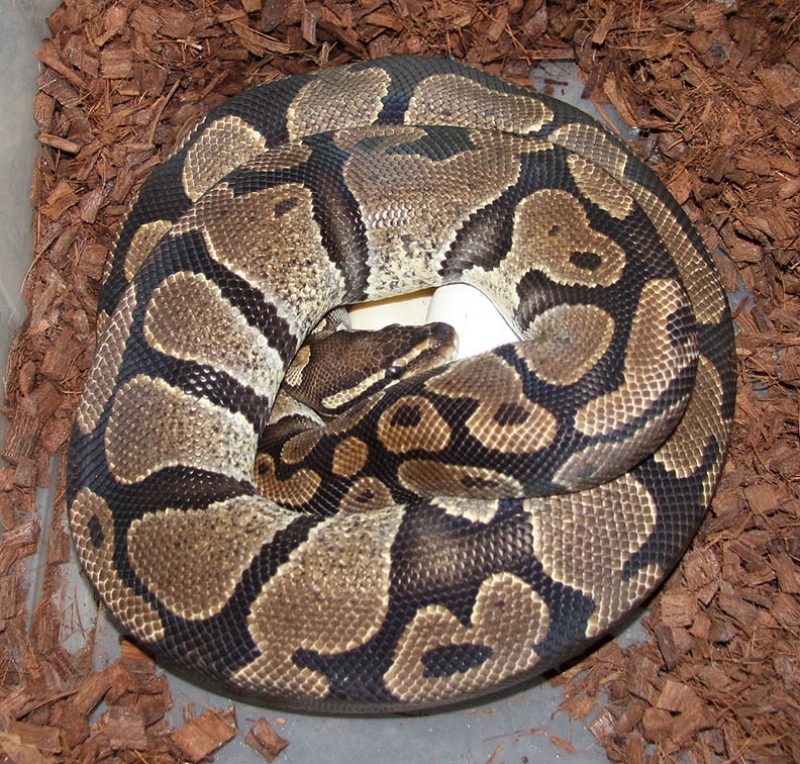 If you are interested in animals from clutch #229 please email or call 519-824-7377. 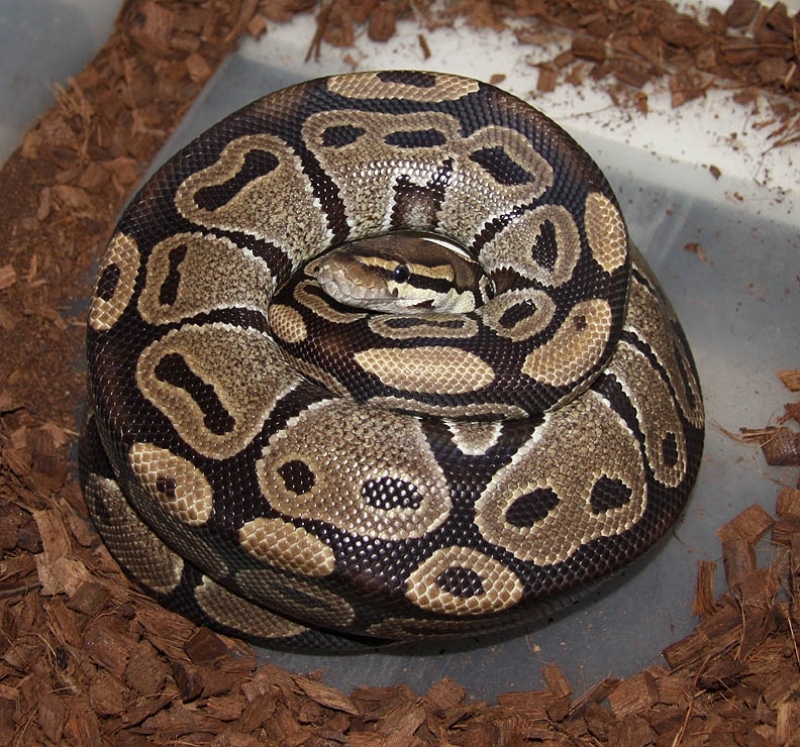 If you are interested in animals from clutch #230 please email or call 519-824-7377. 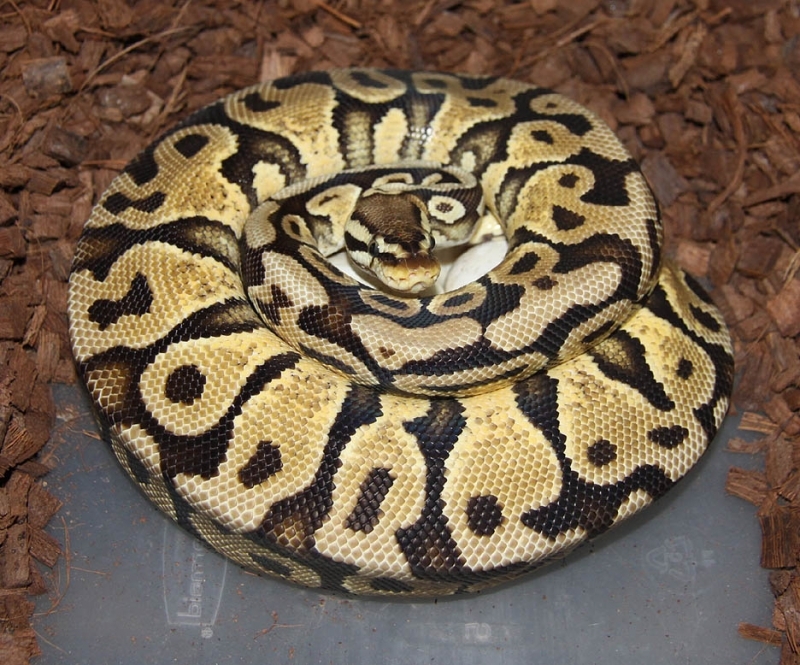 If you are interested in animals from clutch #231 please email or call 519-824-7377. 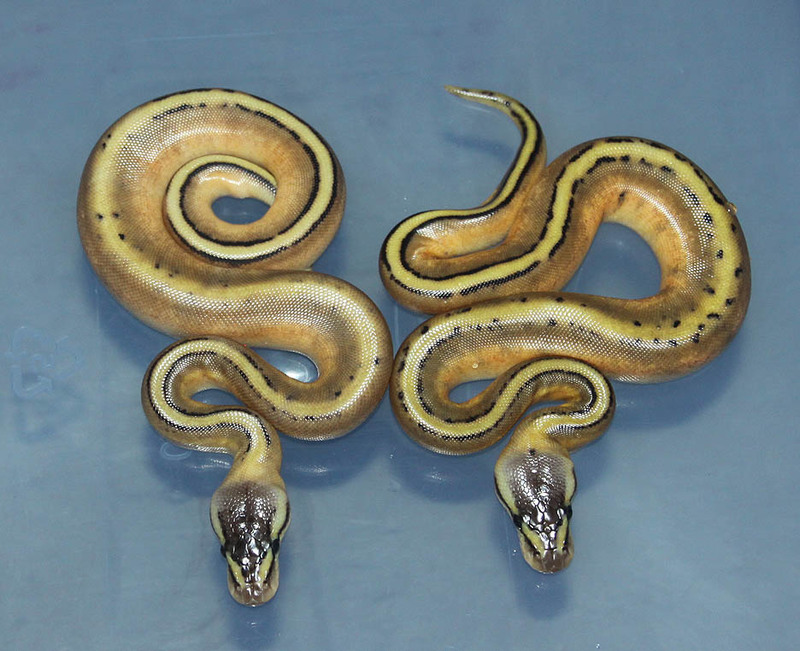 Description: POG RA 1/11 x Het RA HOG "Twin" 13/08. 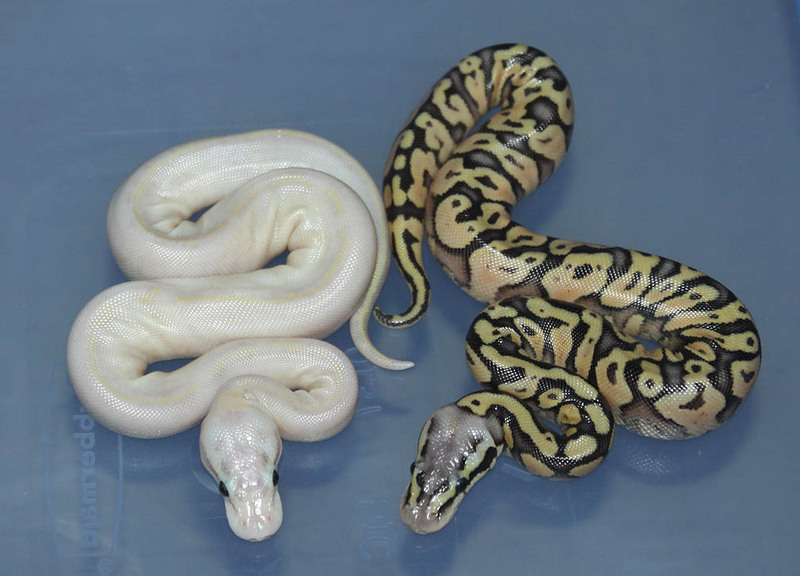 These 3 are all very nice! 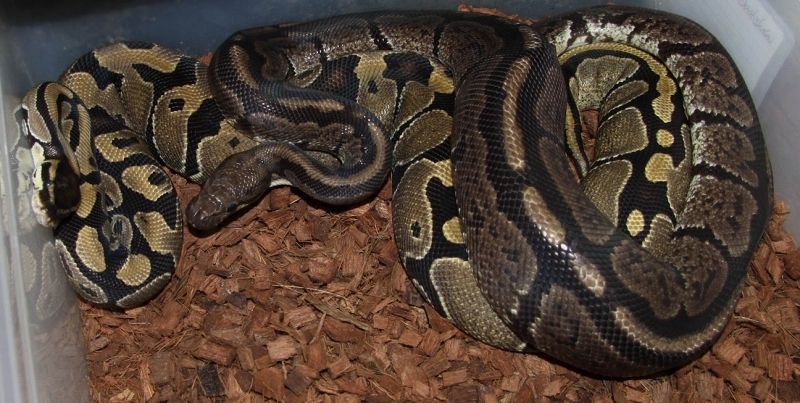 If you are interested in animals from clutch #232 please email or call 519-824-7377. 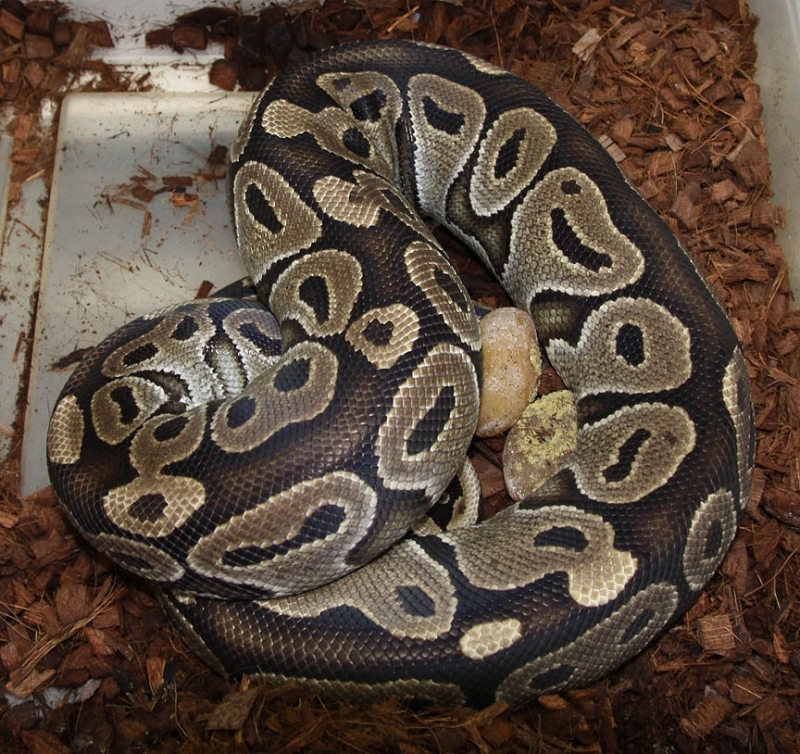 If you are interested in animals from clutch #233 please email or call 519-824-7377. 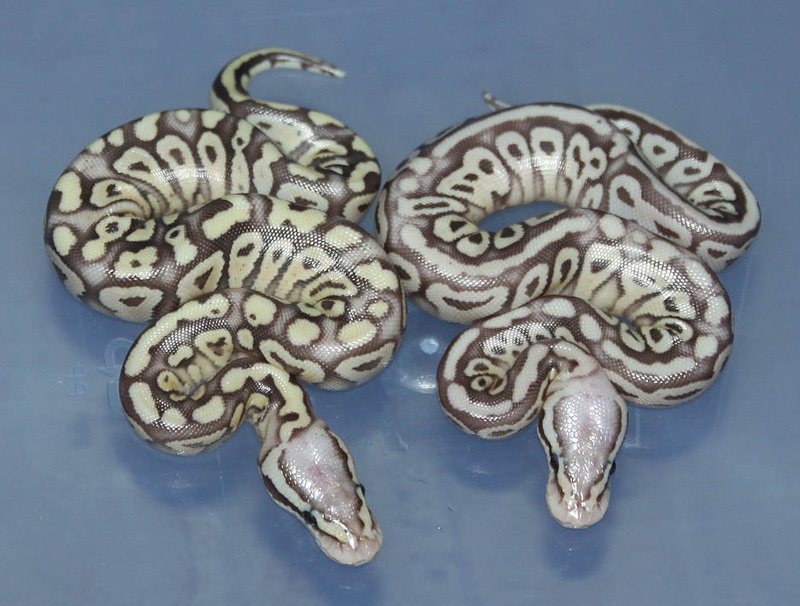 Description: POG RA 1/11 x Het RA PHOG "Twin" 12/08. 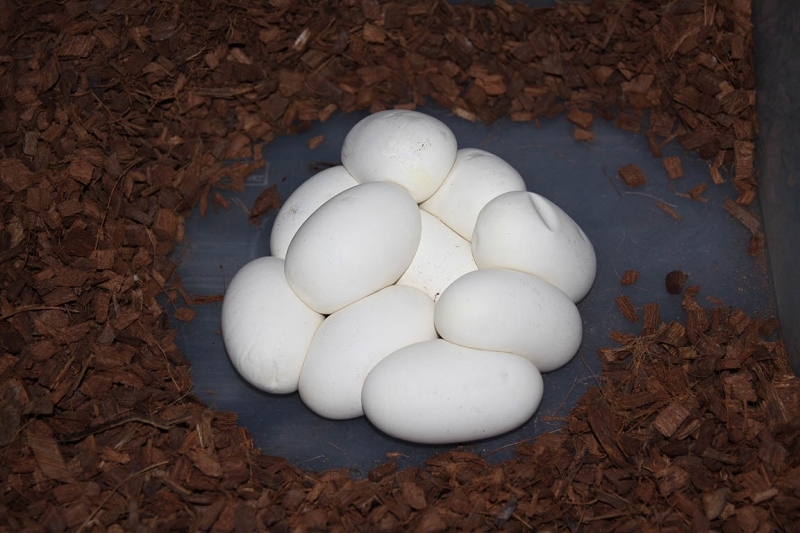 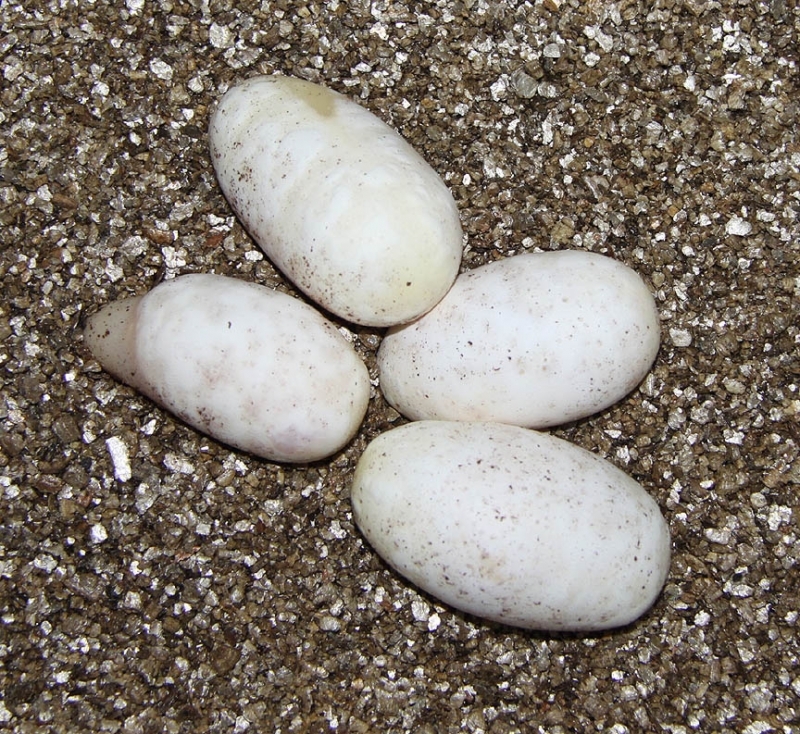 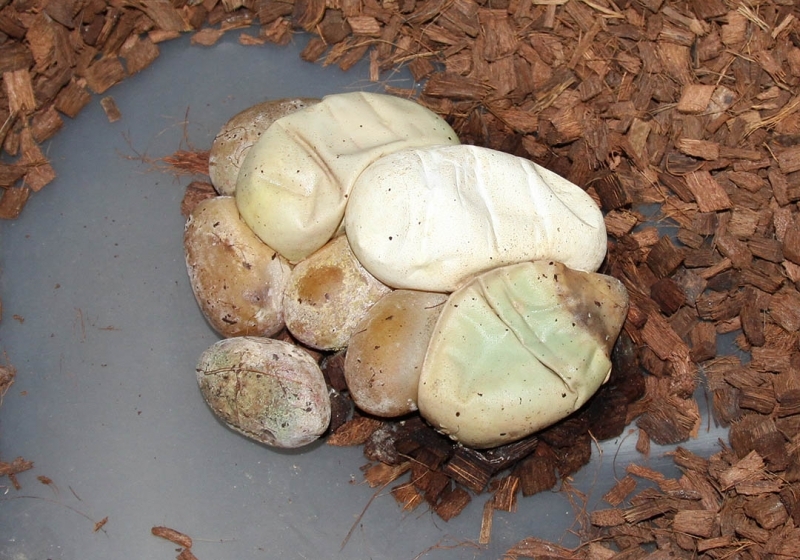 The "mom" of this clutch is a twin sister to the female in clutch 232. 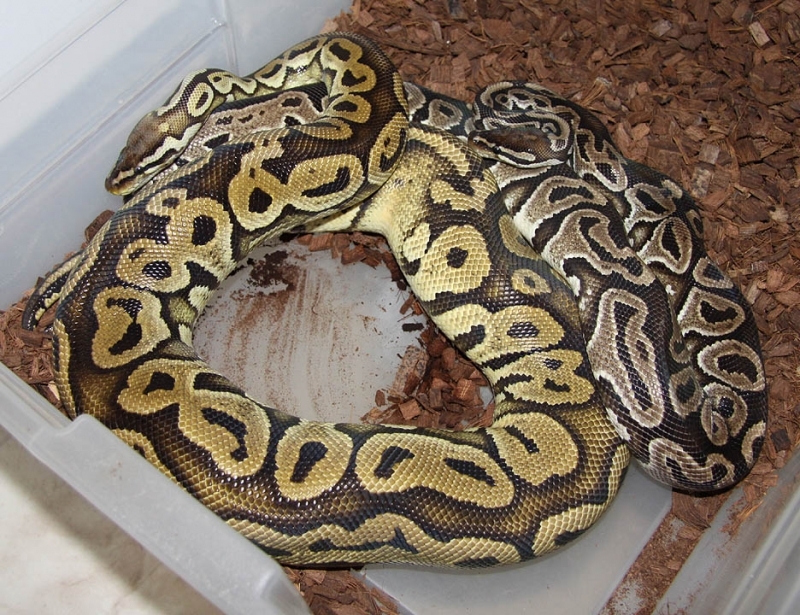 If you are interested in animals from clutch #234 please email or call 519-824-7377. 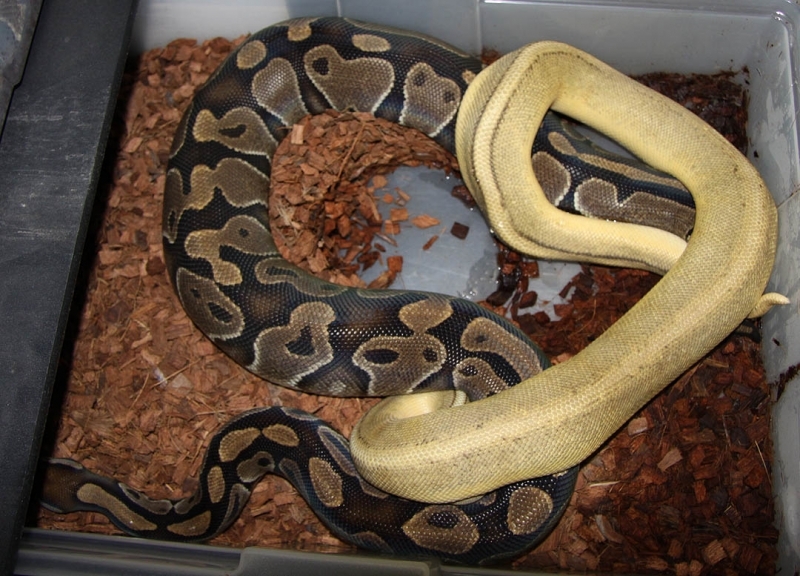 If you are interested in animals from clutch #235 please email or call 519-824-7377. 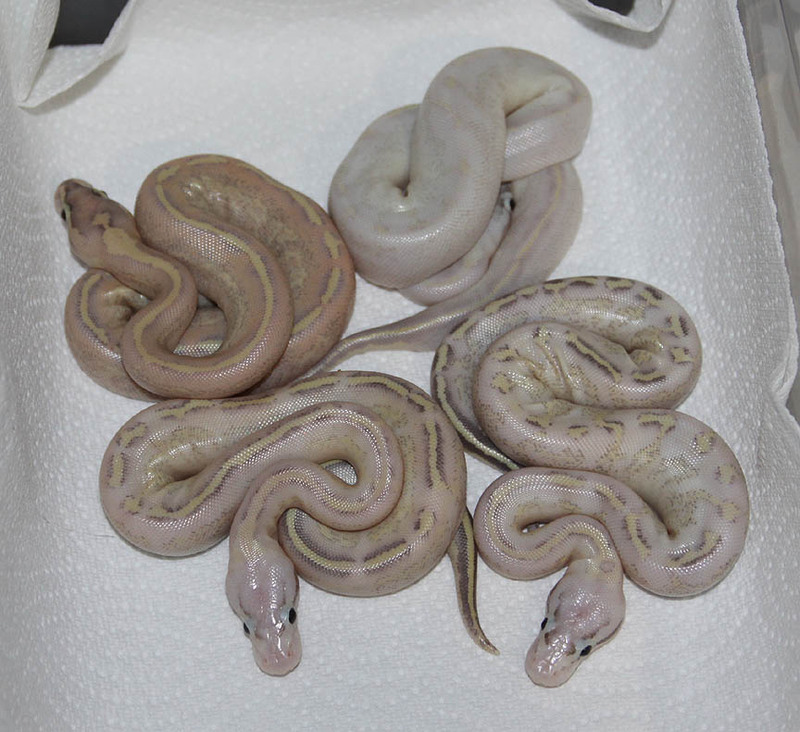 Description: Pastel Lesser Red Axanthic 1/11 x Pastel Red Axanthic 1/09. 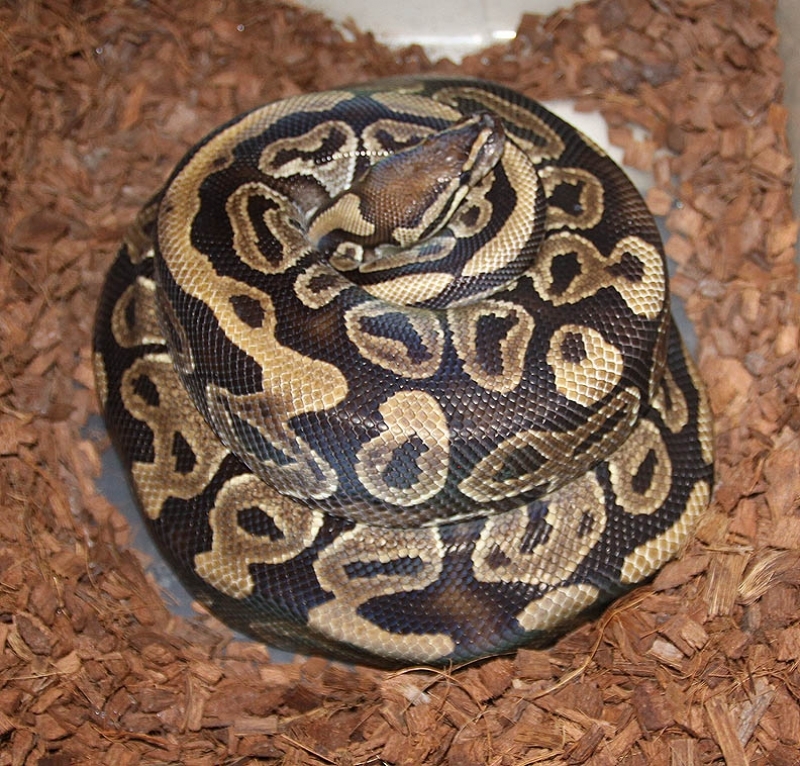 If you are interested in animals from clutch #236 please email or call 519-824-7377. 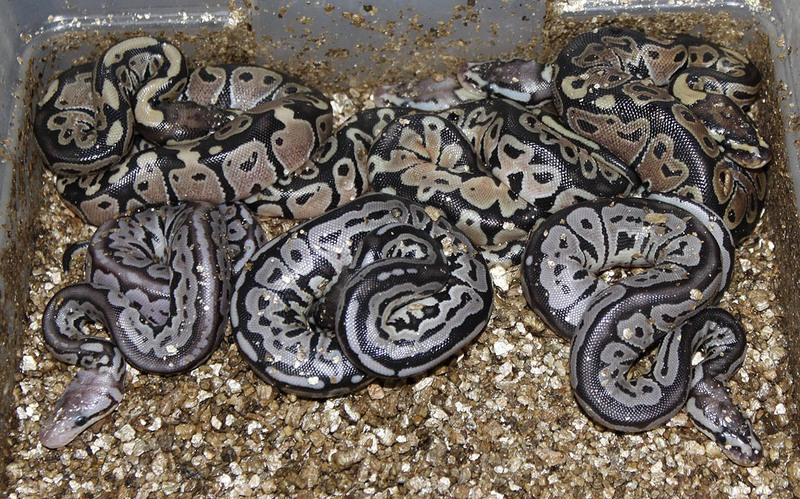 Description: Lesser "Burgandy" 1/10 x Het Burgandy 1/06. 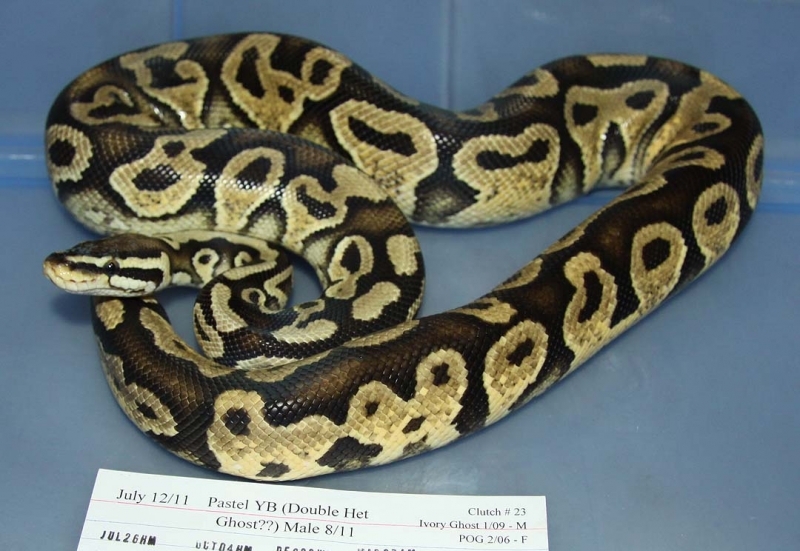 If you are interested in animals from clutch #237 please email or call 519-824-7377. 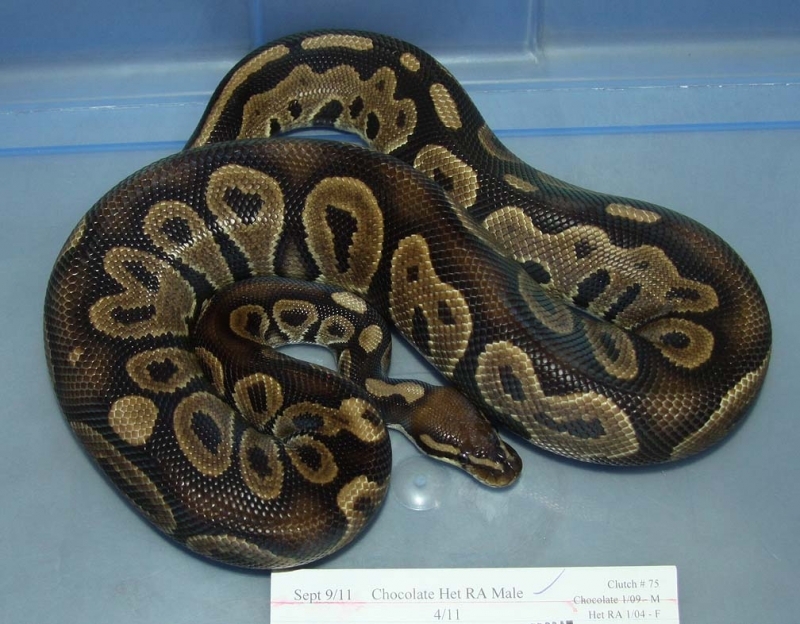 Description: Chocolate HRA 4/11 x Het RA "Weird" 2/09. 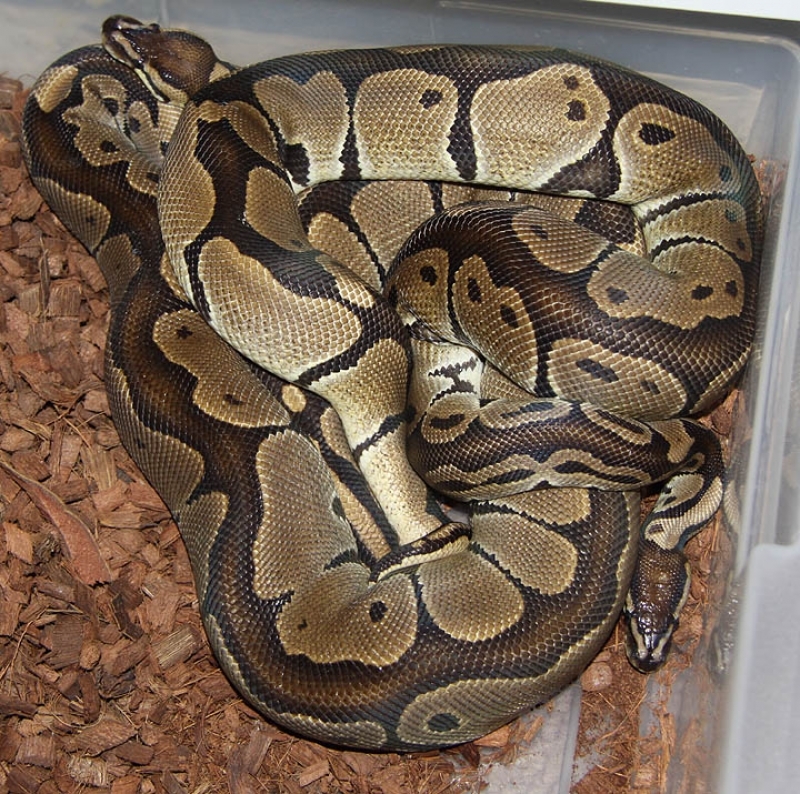 If you are interested in animals from clutch #238 please email or call 519-824-7377. 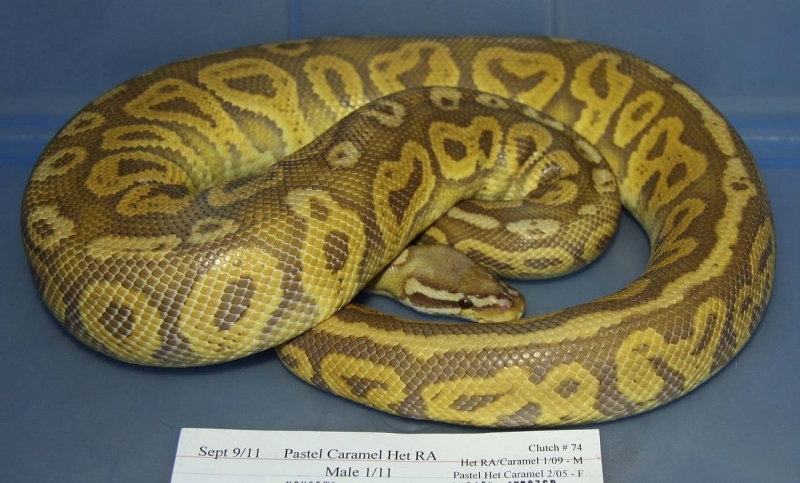 Description: Pastel Caramel HRA 1/11 x Pastel Het RA/Caramel 1/09. 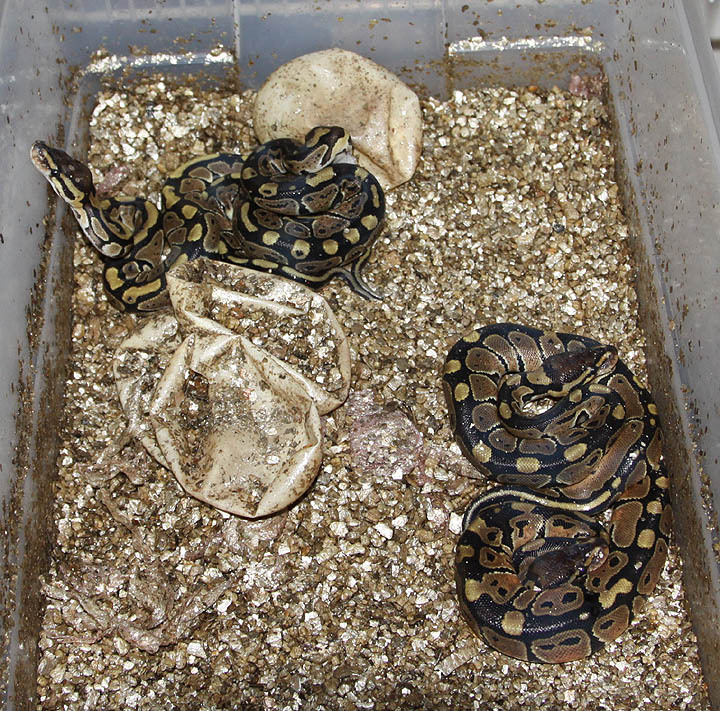 If you are interested in animals from clutch #239 please email or call 519-824-7377. 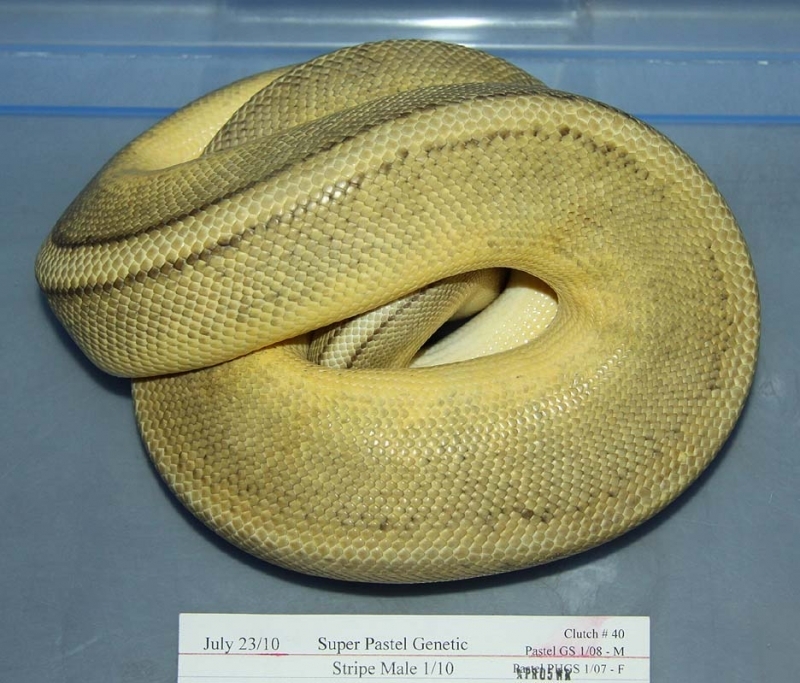 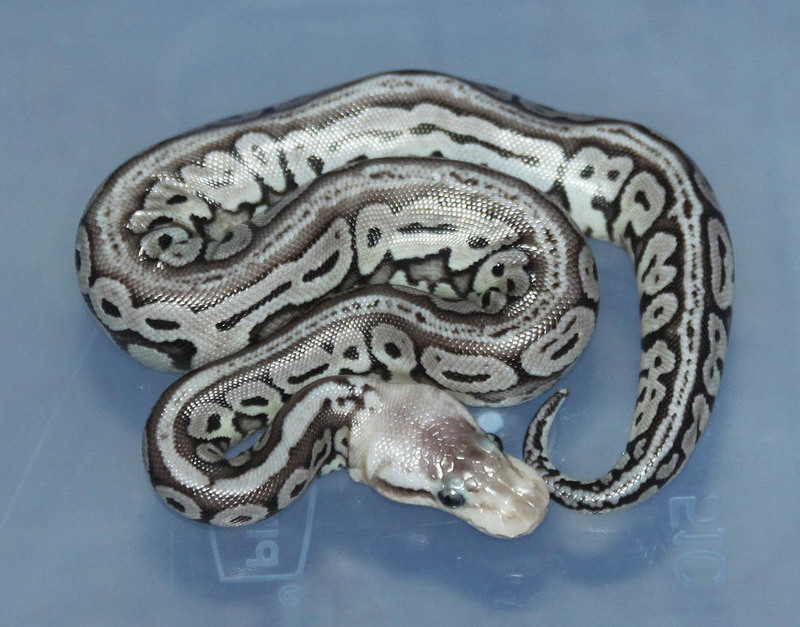 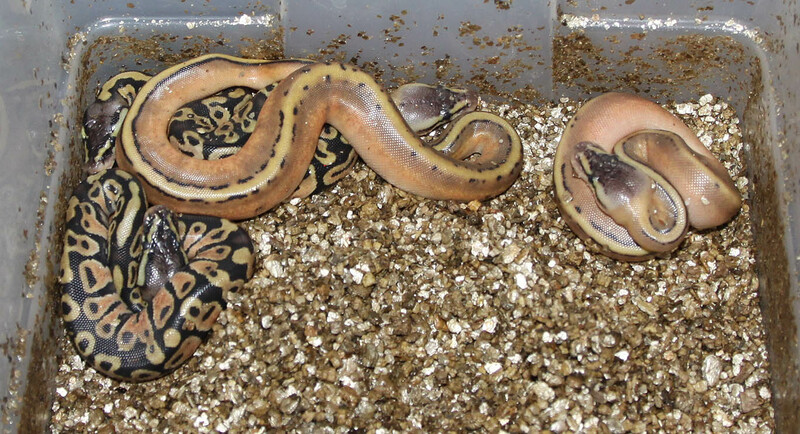 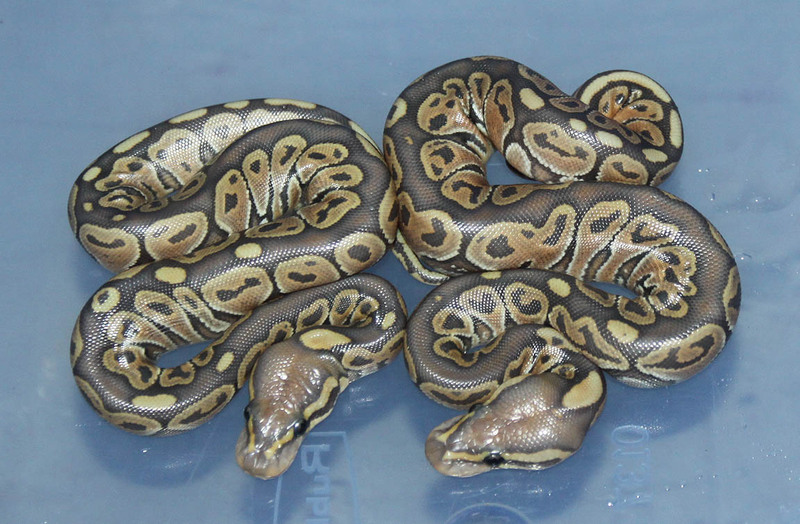 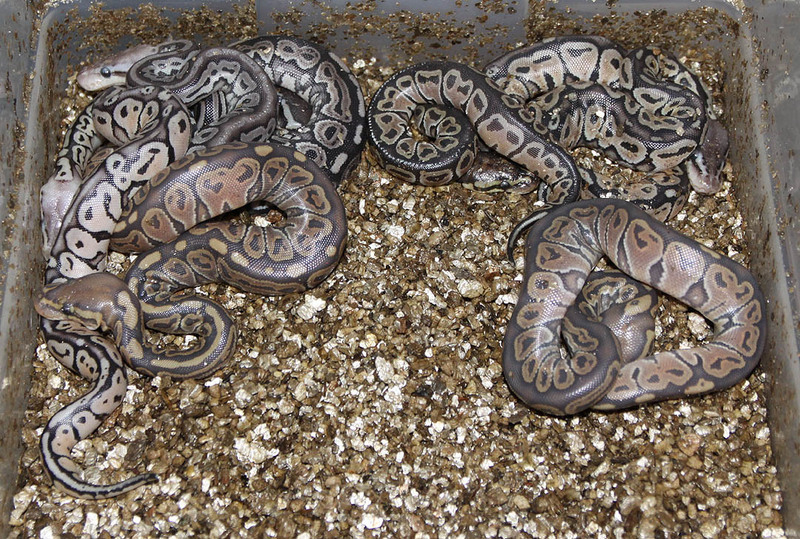 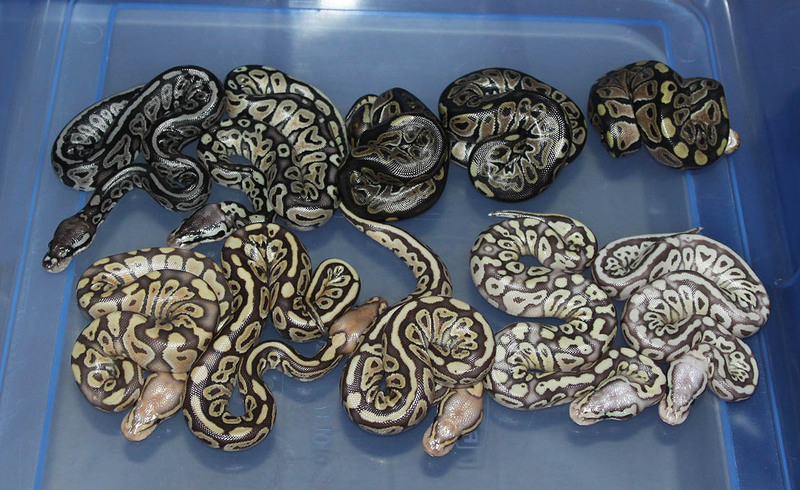 Description: Super Pastel Genetic Stripe 1/10 x Het GS 13/07. 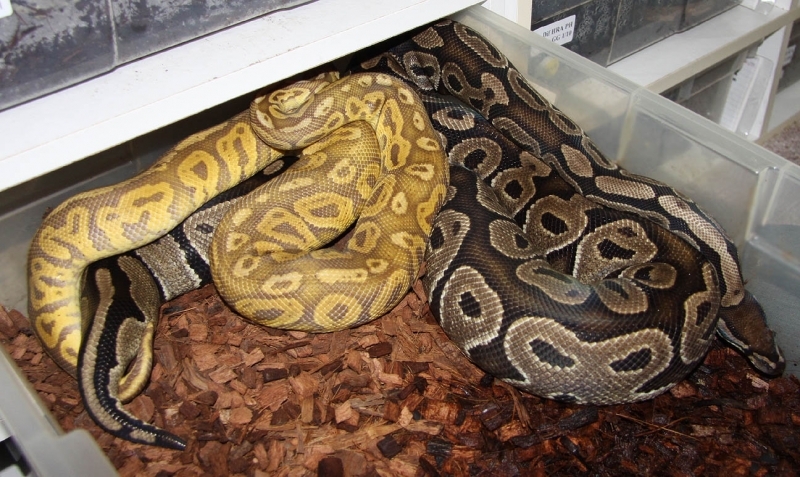 If you are interested in animals from clutch #240 please email or call 519-824-7377. 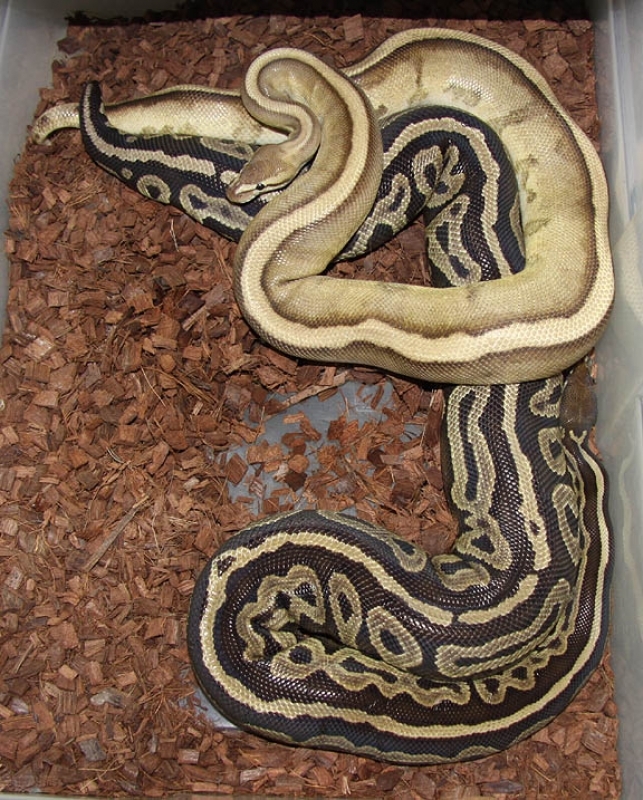 Description: Super Pastel Genetic Stripe 1/10 x Het GS PH Banded 13/07. 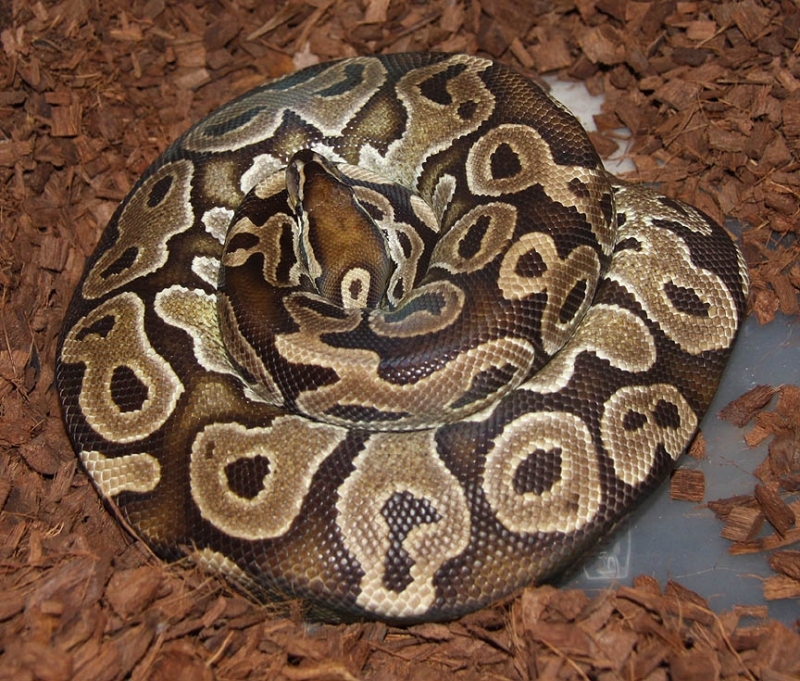 If you are interested in animals from clutch #241 please email or call 519-824-7377. 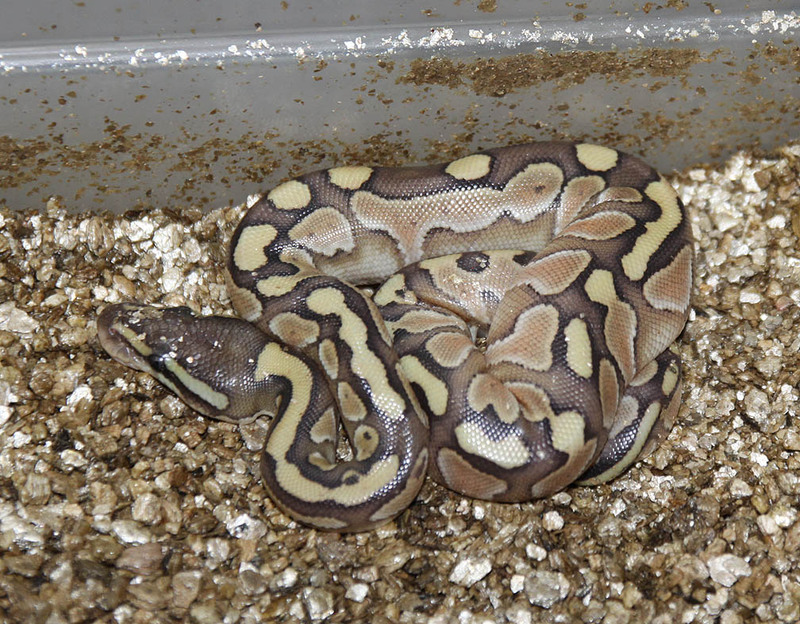 Description: Pastel Red Axanthic "Dot Matrix" 1/09 x Pastel Het RA 2/06. 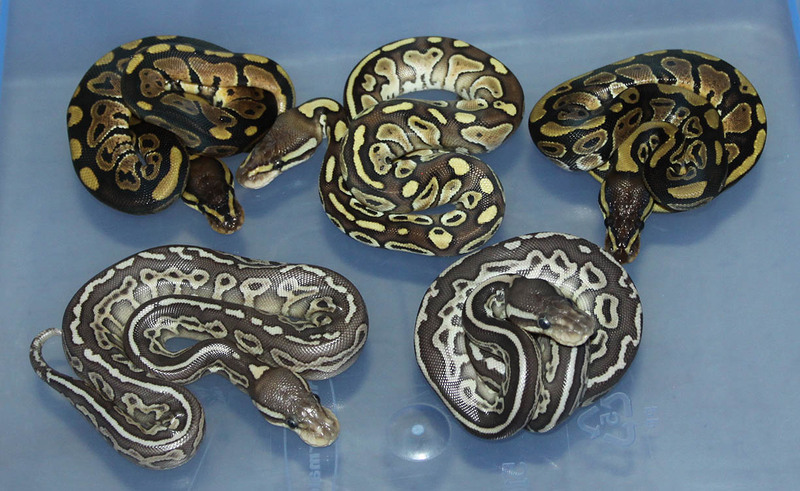 If you are interested in animals from clutch #242 please email or call 519-824-7377. 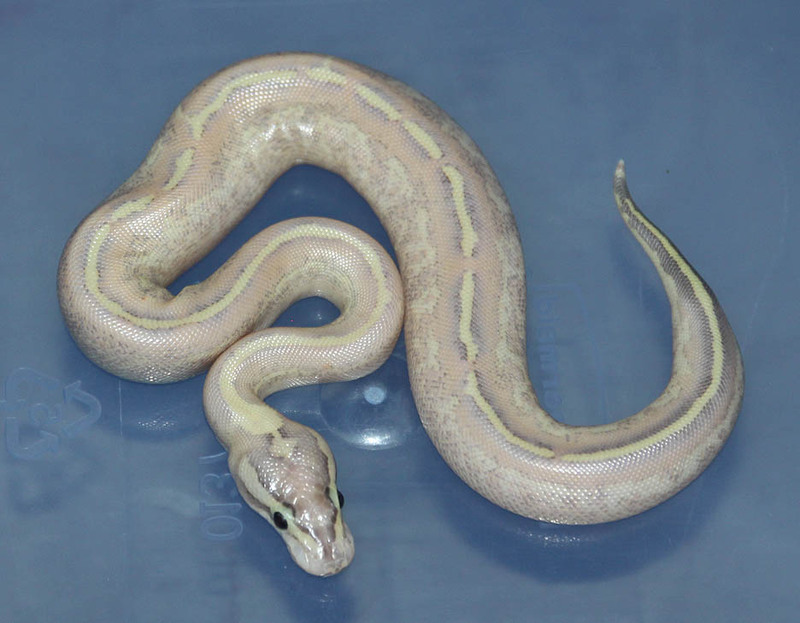 Description: Pastel GS HRA 3/11 x Het RA Het GS 4/08. 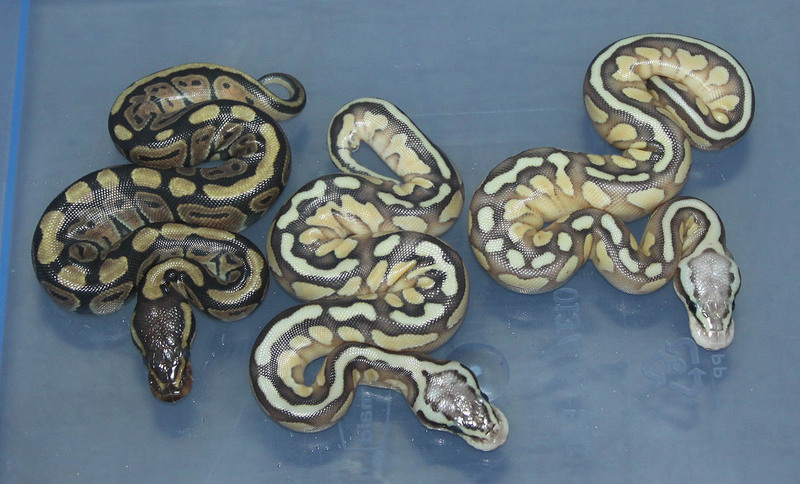 The Genetic Stripe female is really reduced pattern! 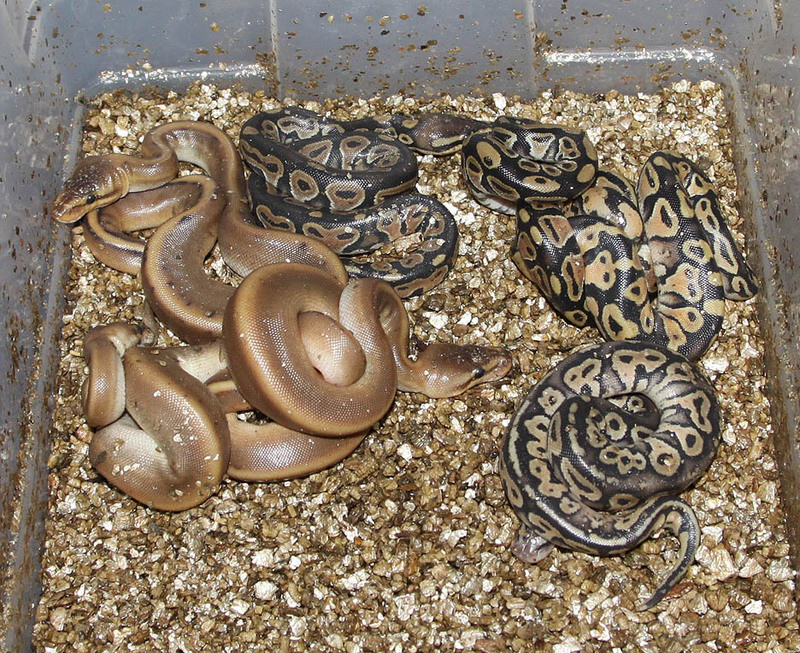 If you are interested in animals from clutch #243 please email or call 519-824-7377. 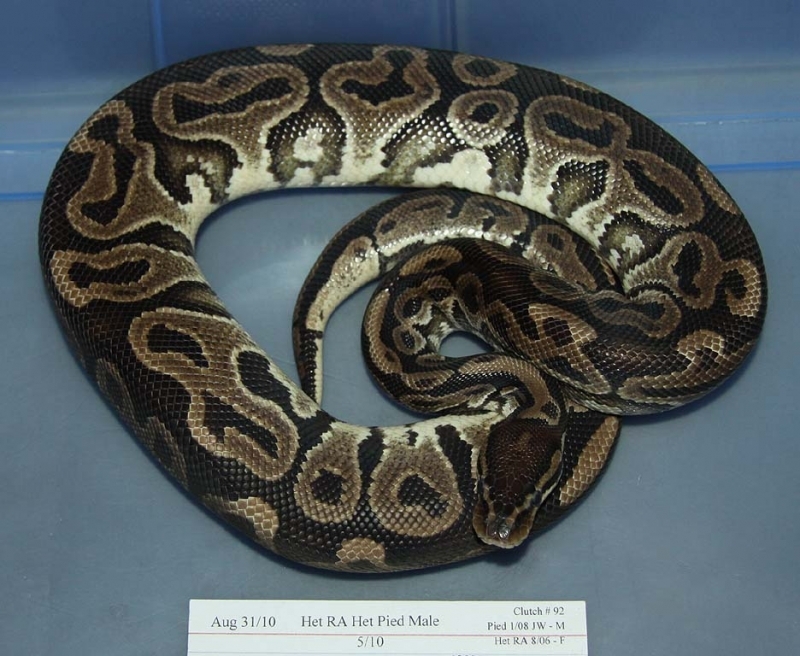 Description: Het RA Het Pied 8/10 & 1/10 x Het Pied 11/06. 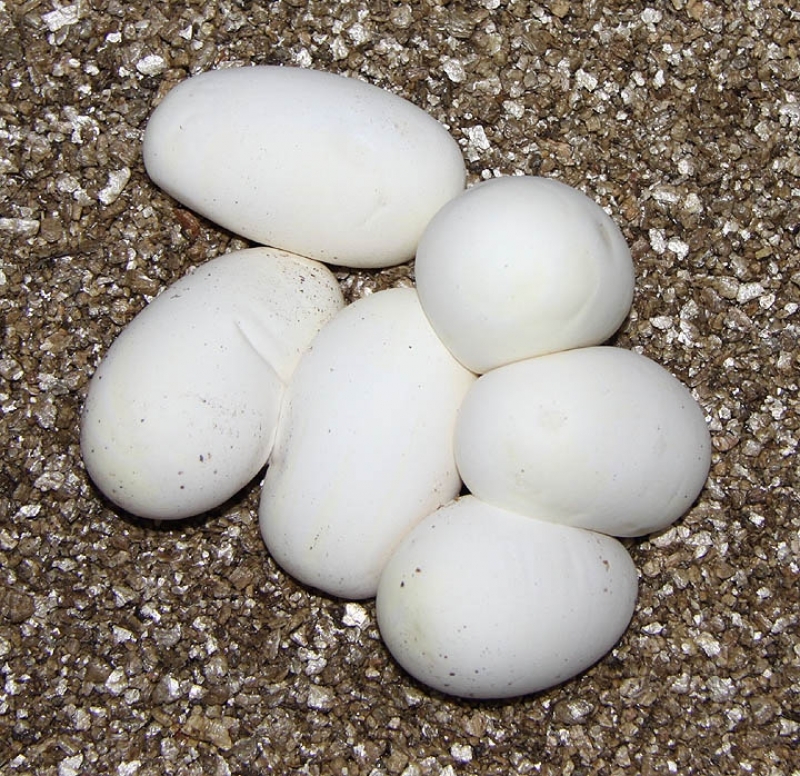 This is a very interesting clutch and not a result I would have expected. 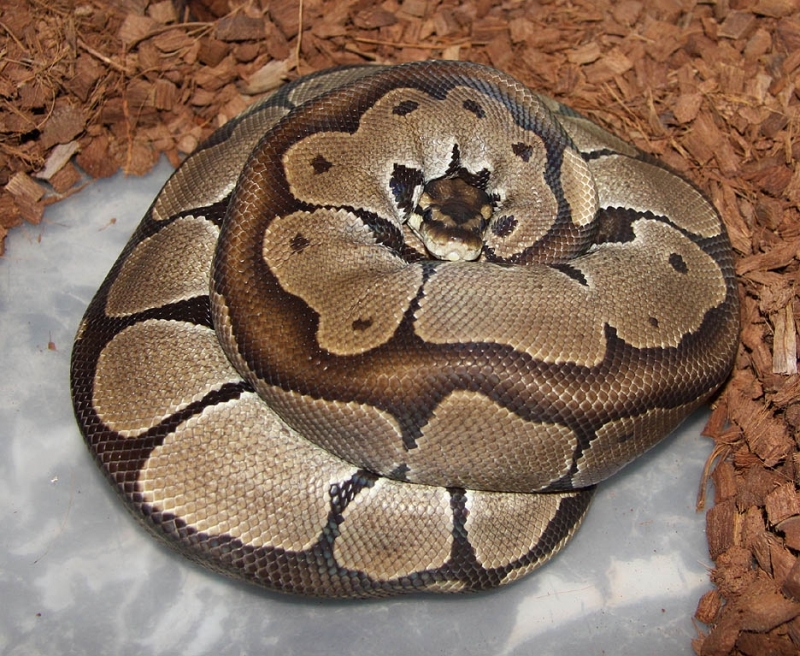 For one there is no Pieds in the clutch which in of itself is not unusual from Het x Het. 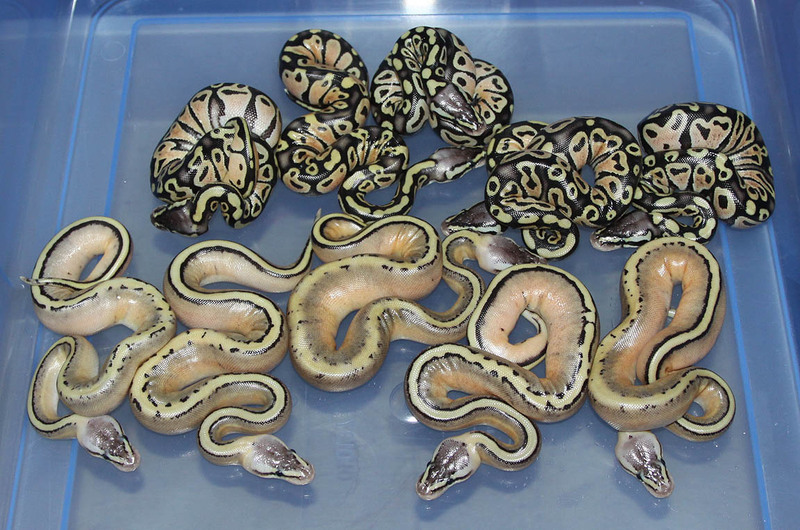 However, all of the offspring are striped????? 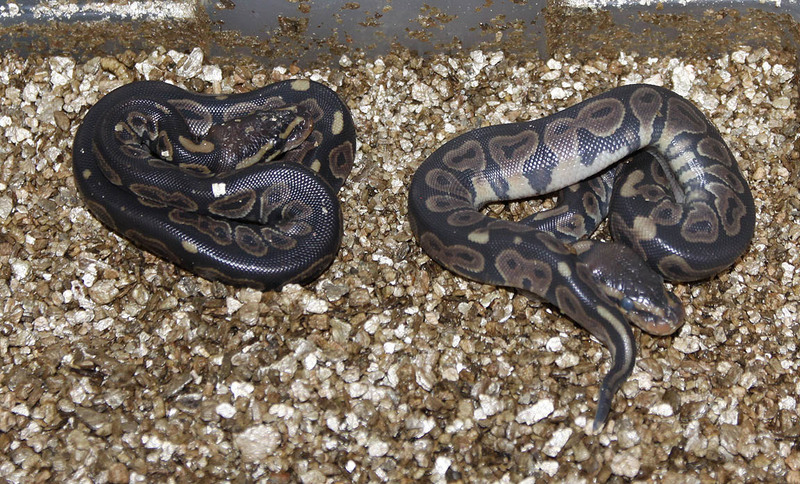 The 2 potential fathers to this clutch have been sold. 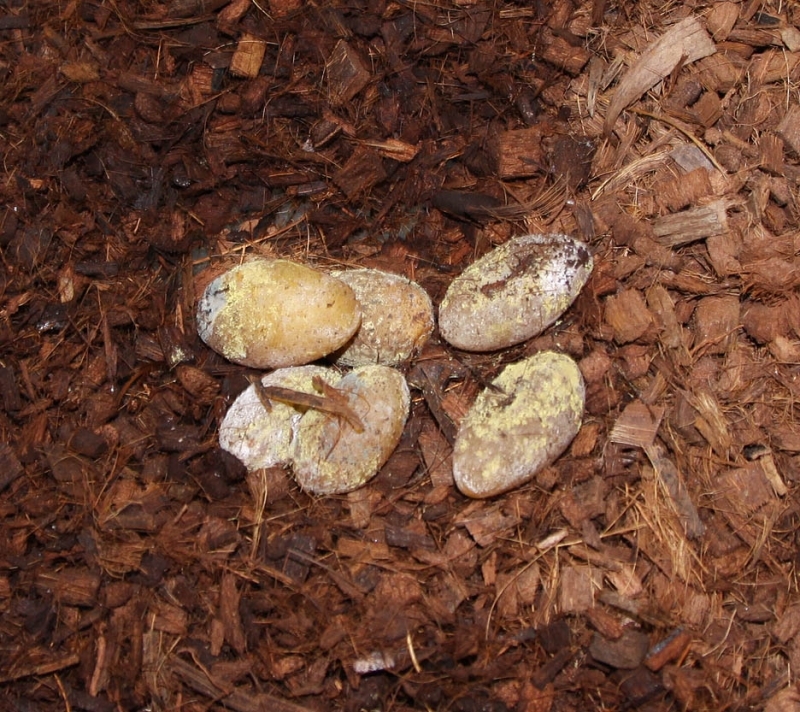 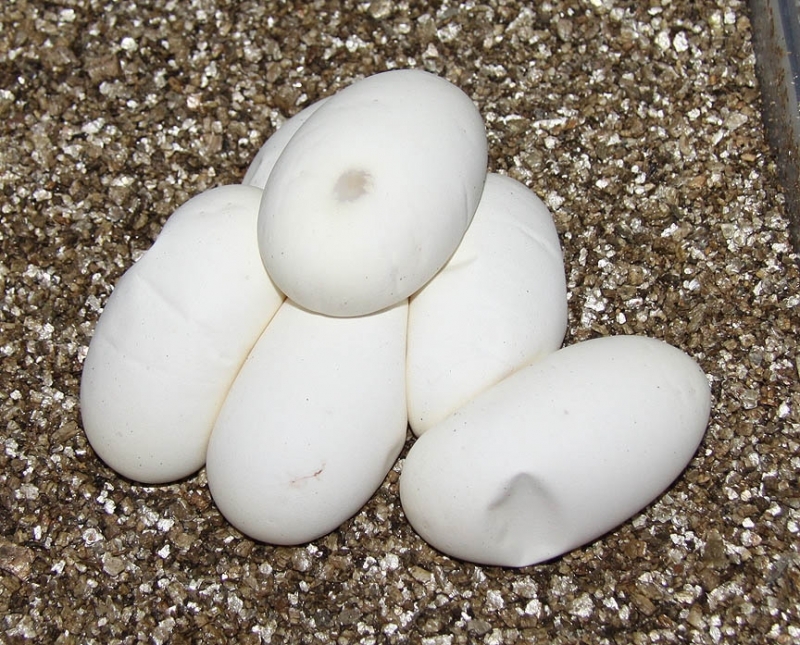 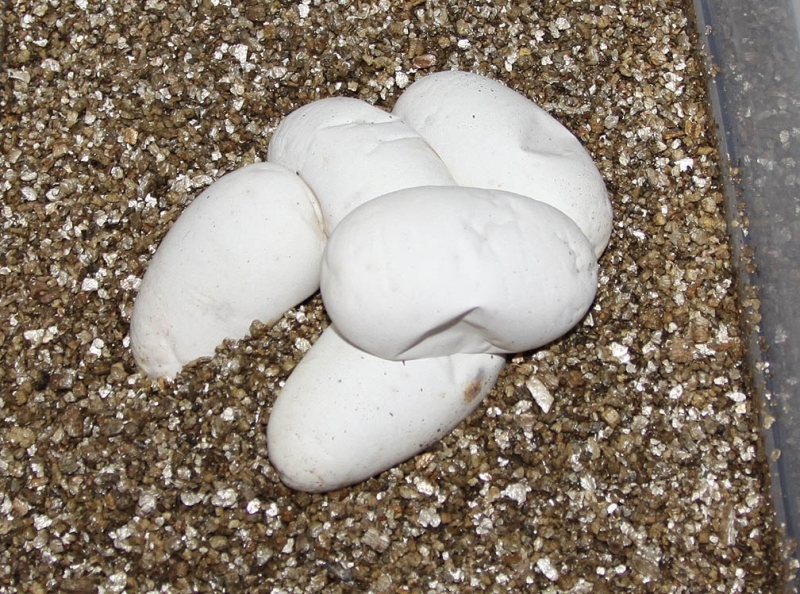 However, I will be growing up this clutch and breeding some of the males back to mom to see what pops out. 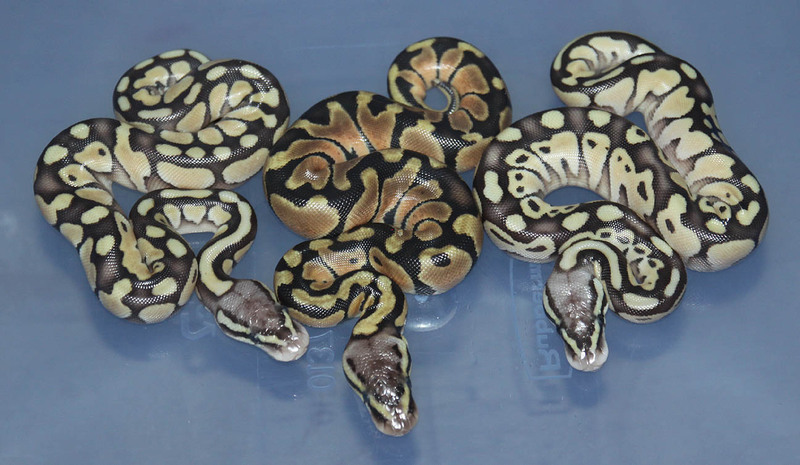 Are these genetic Gold Stripes or just something that happened randomly to the entire clutch? 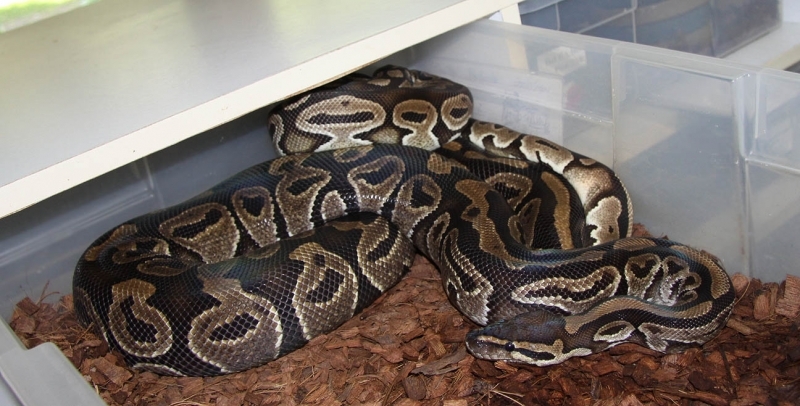 If you are interested in animals from clutch #244 please email or call 519-824-7377. 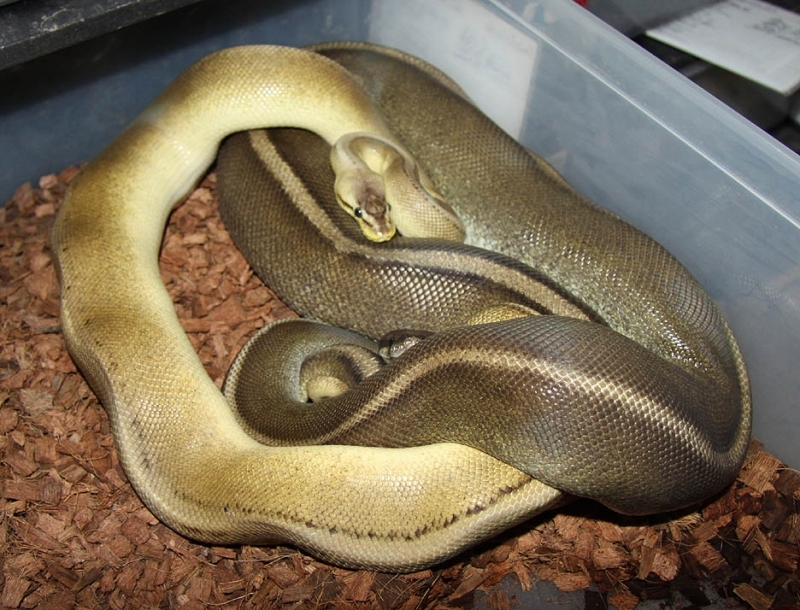 Description: POGL (Green) 1/07 x Pastel Het Green Ghost 1/06. 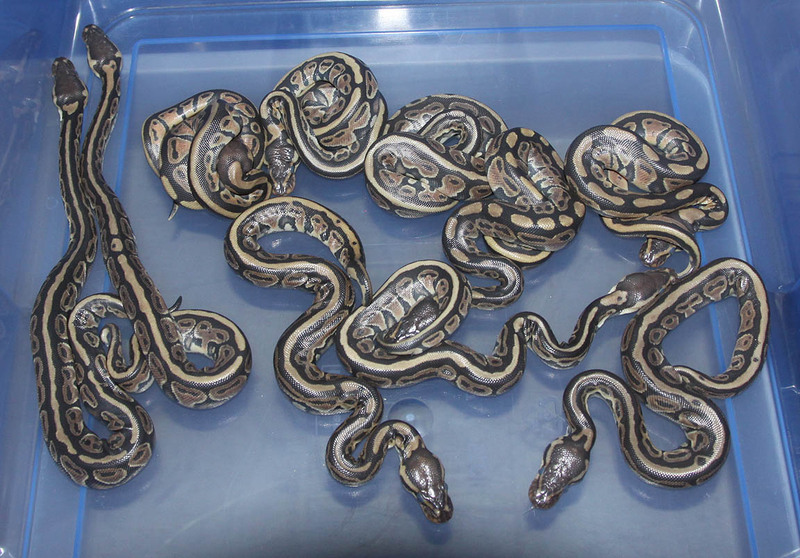 If you are interested in animals from clutch #245 please email or call 519-824-7377. 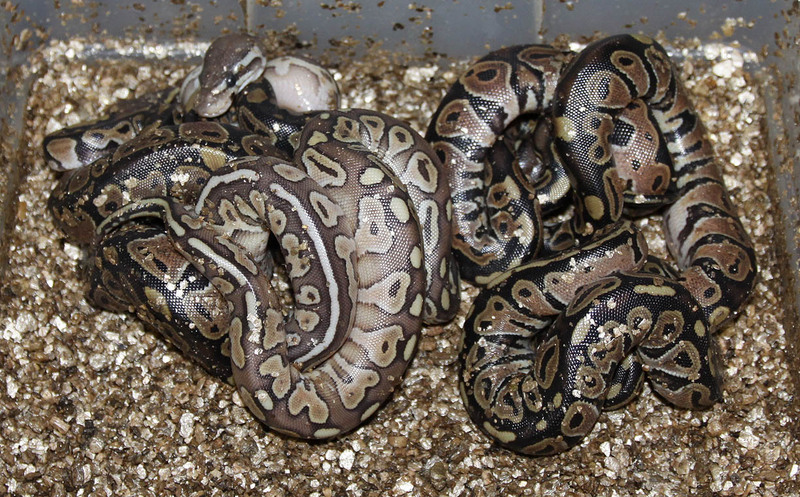 Description: Split Neck 1/06 x Het Split Neck 4/09. 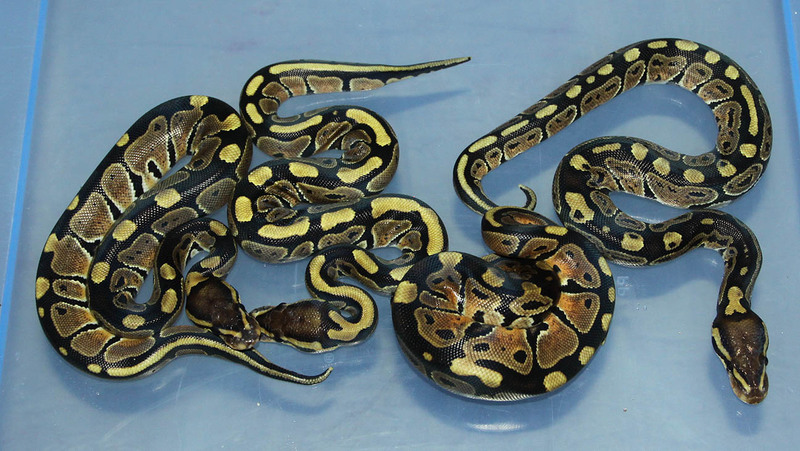 If you are interested in animals from clutch #246 please email or call 519-824-7377. 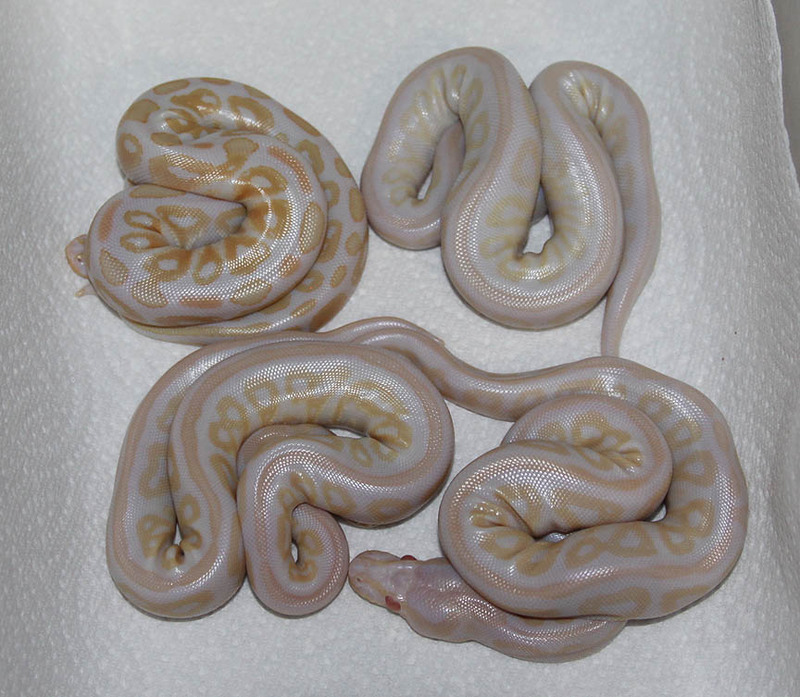 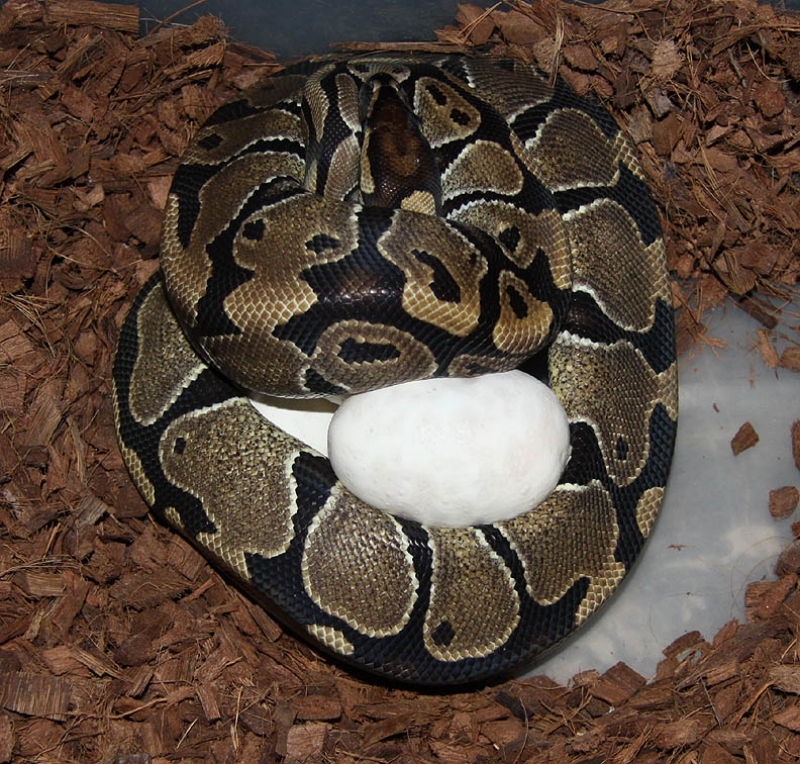 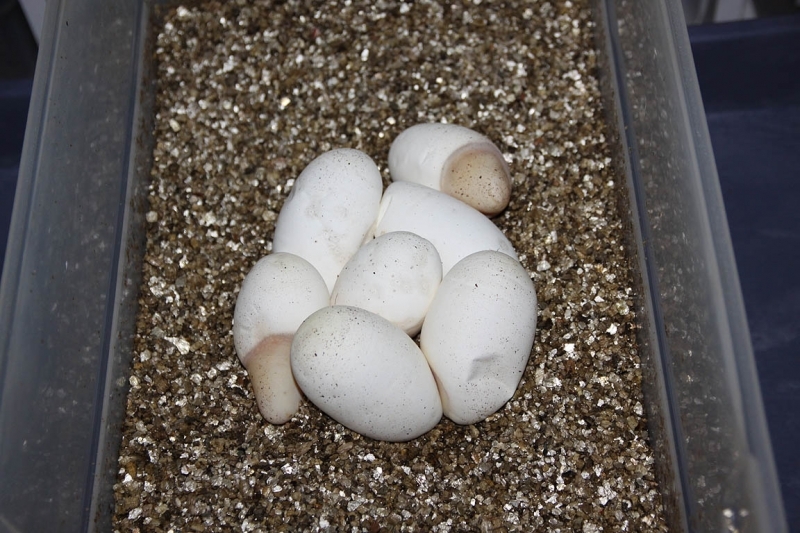 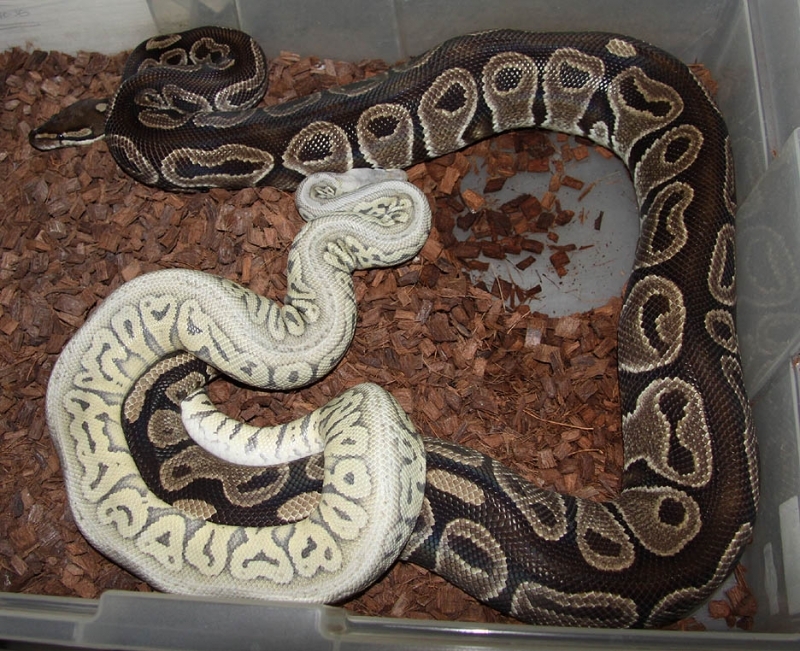 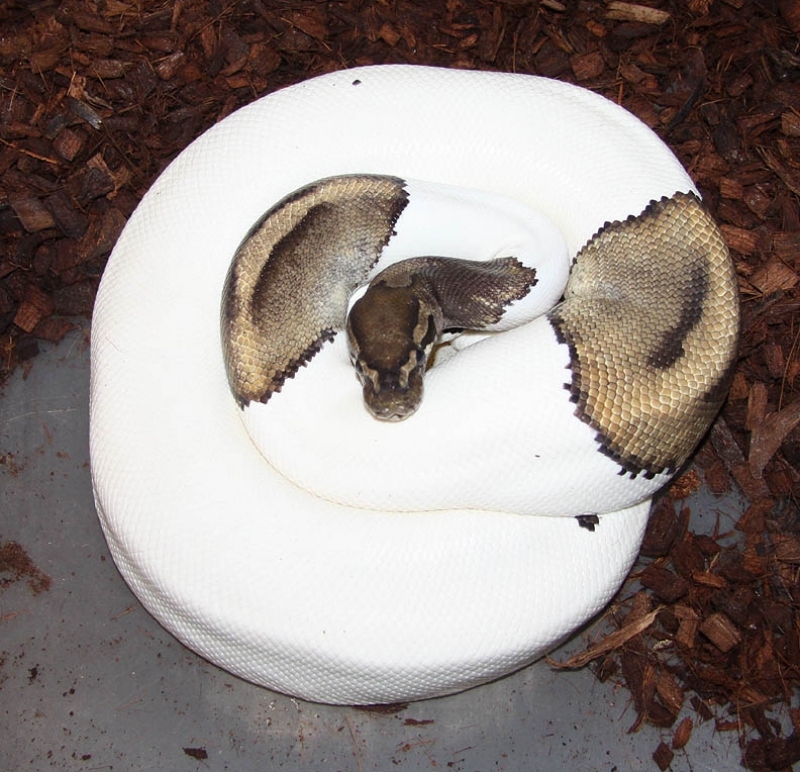 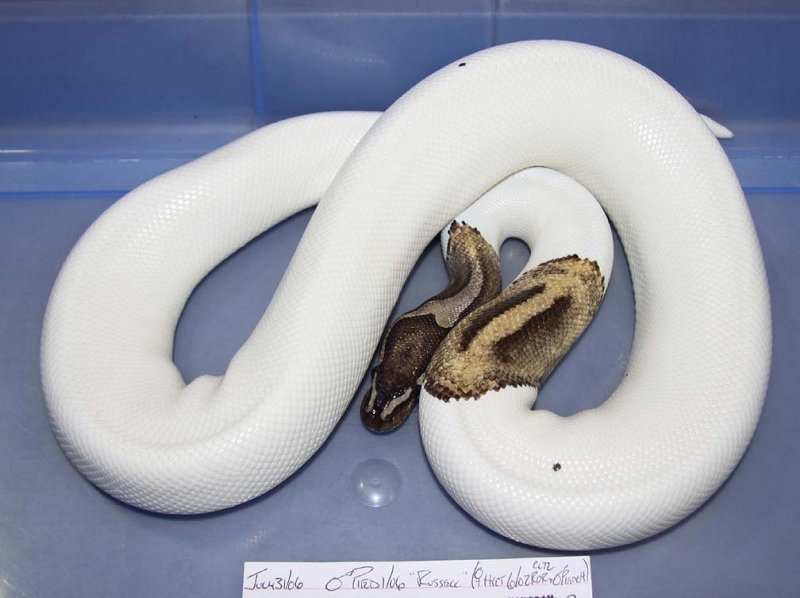 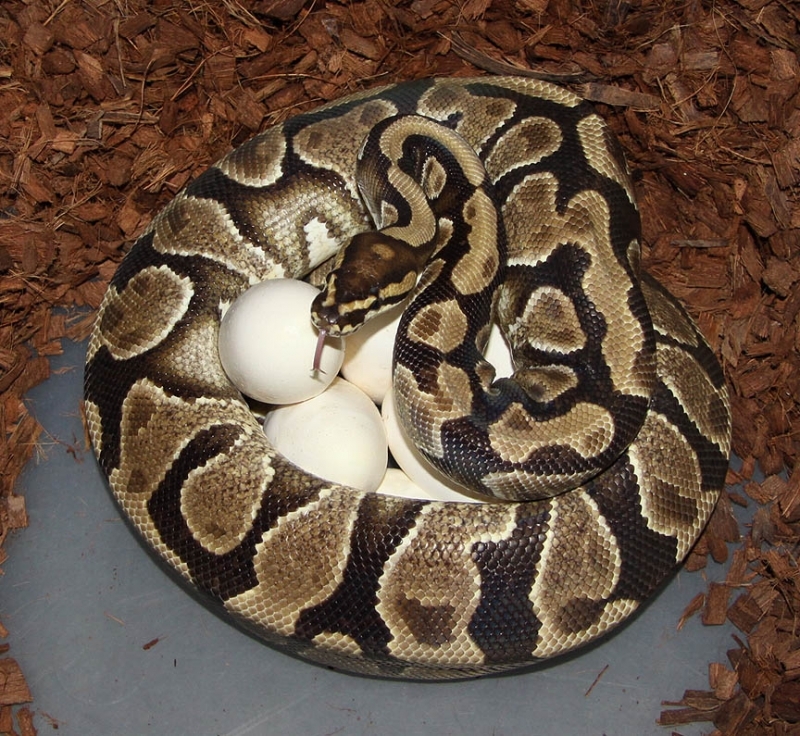 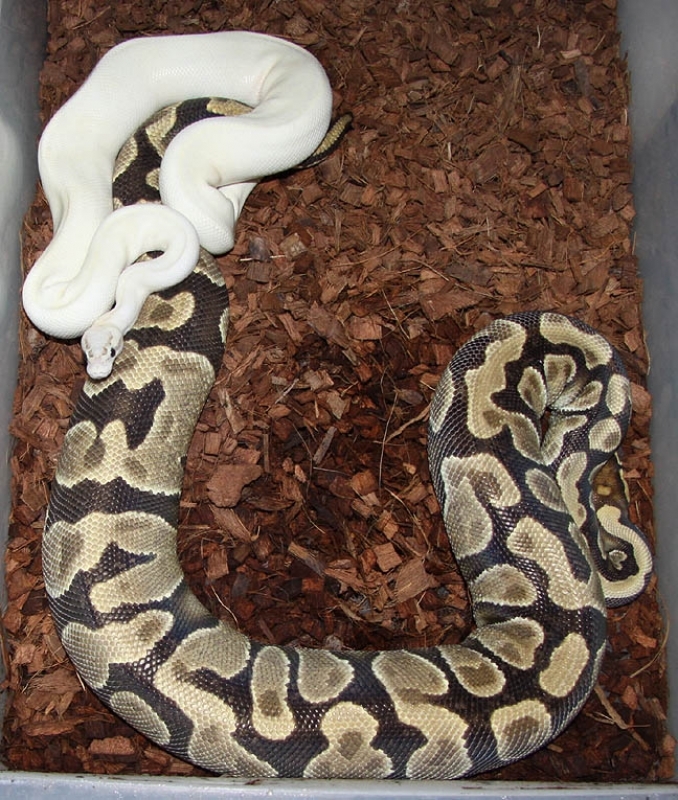 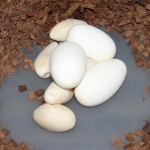 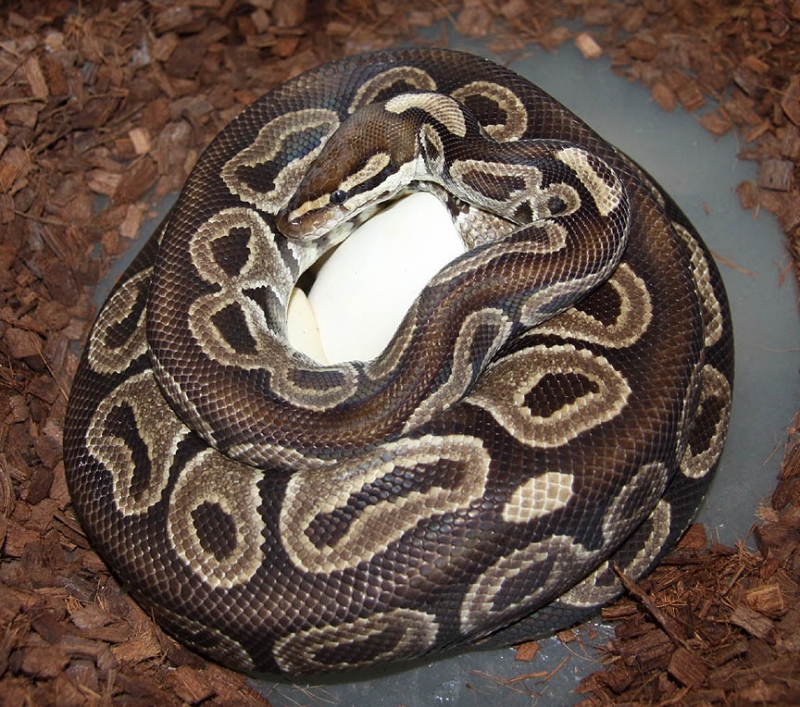 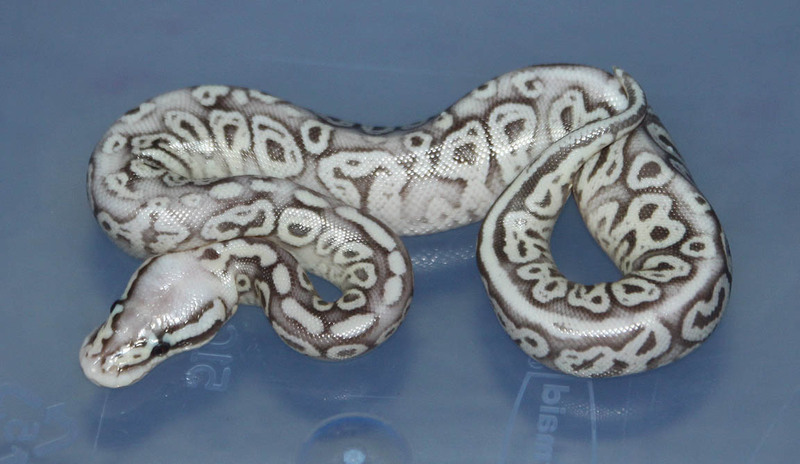 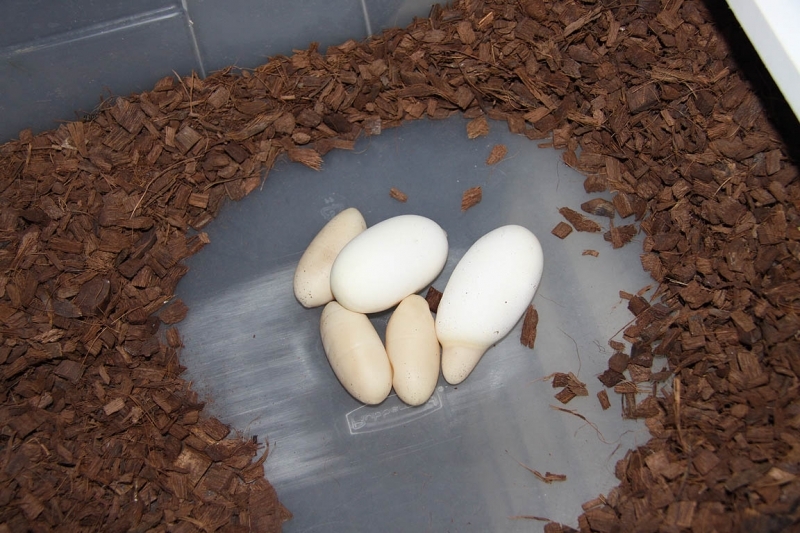 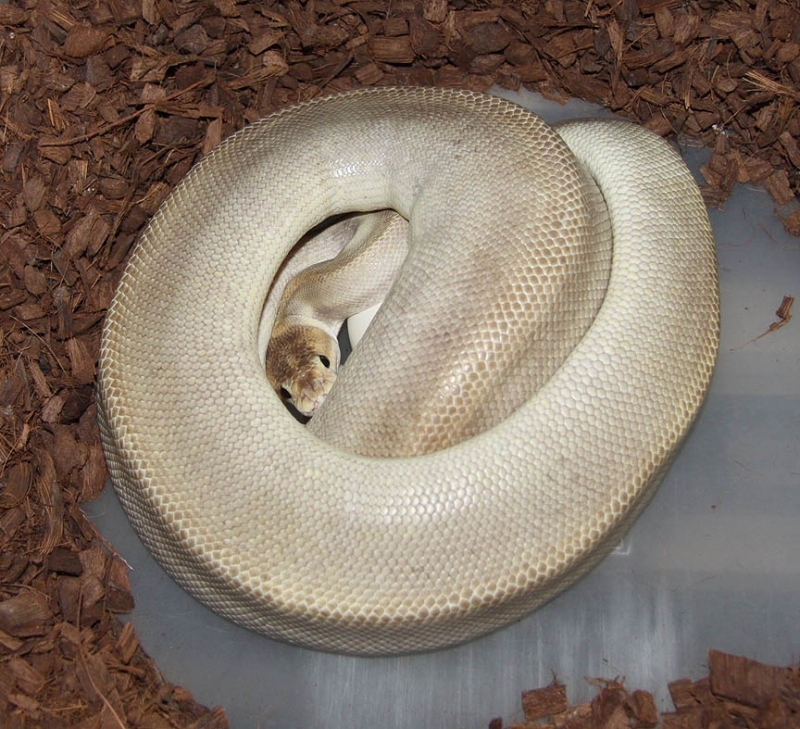 Description: Double Het Albino/Banded 6/10 x DH Albino/Banded 1/10. 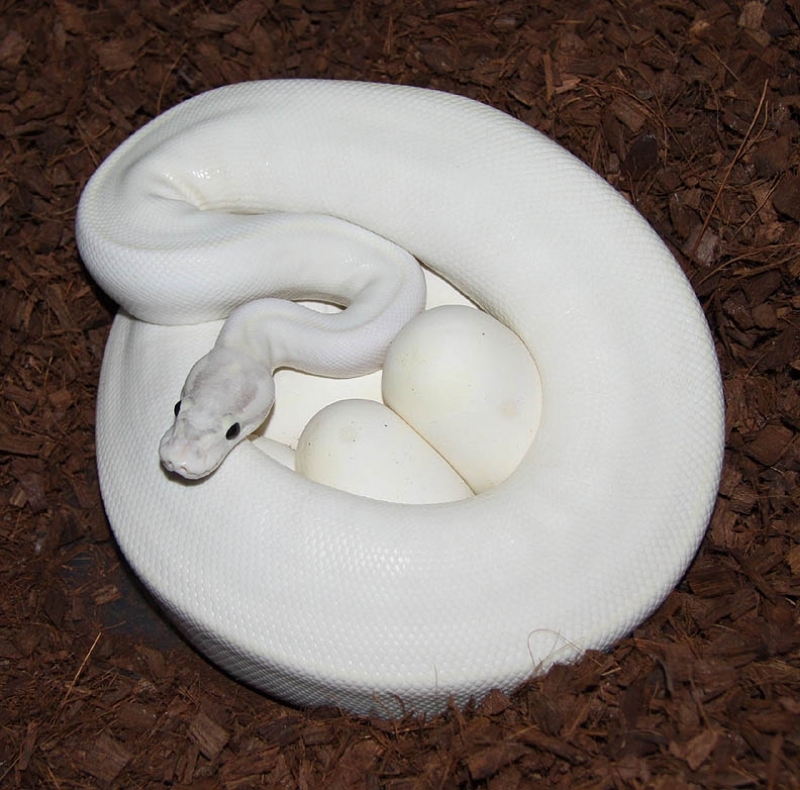 No Bandeds and no Albinos in this clutch. 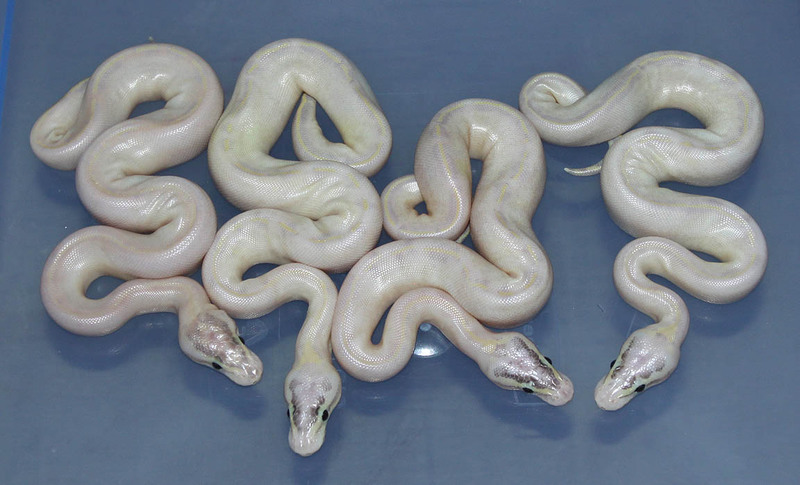 That is the way it goes with DH projects sometimes. 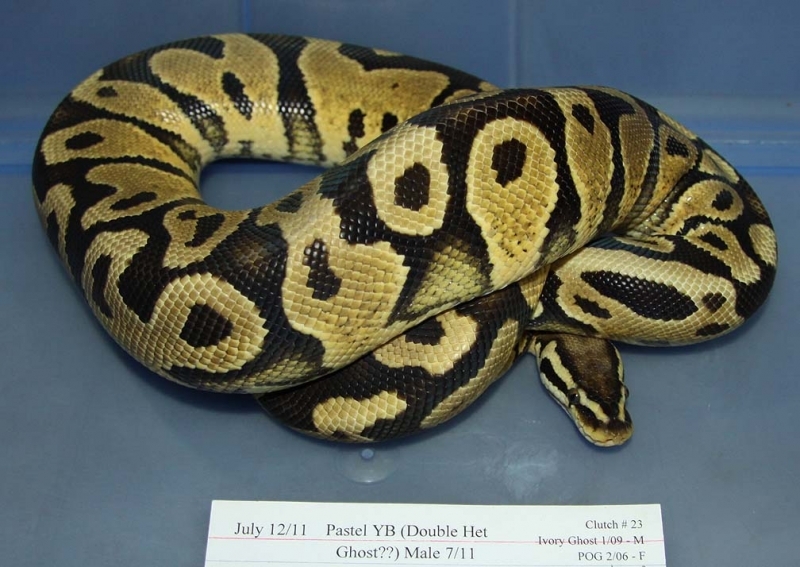 If you are interested in animals from clutch #247 please email or call 519-824-7377. 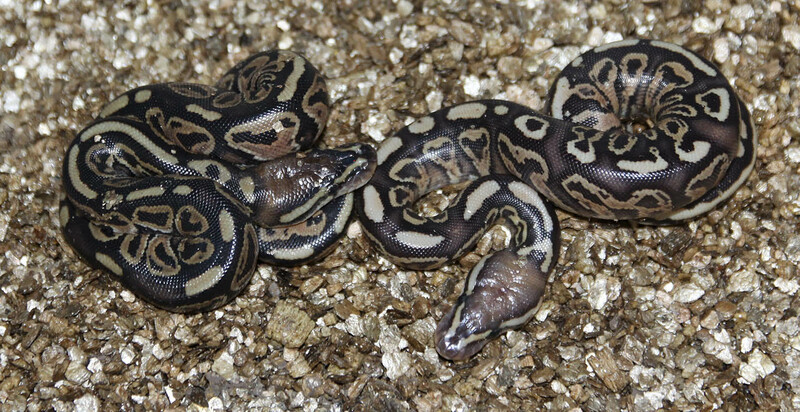 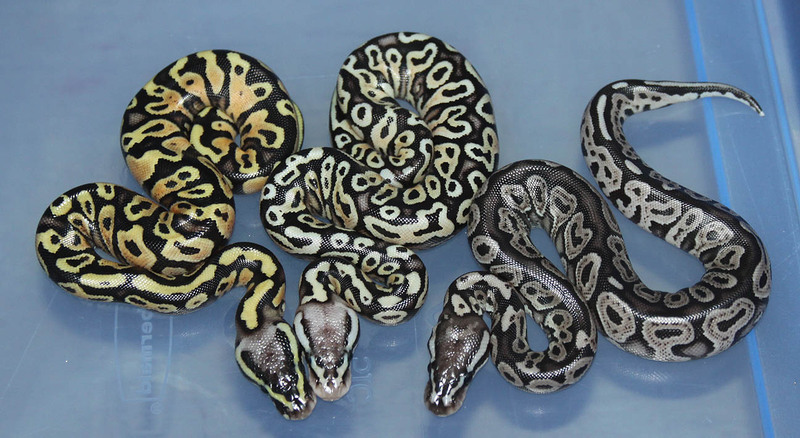 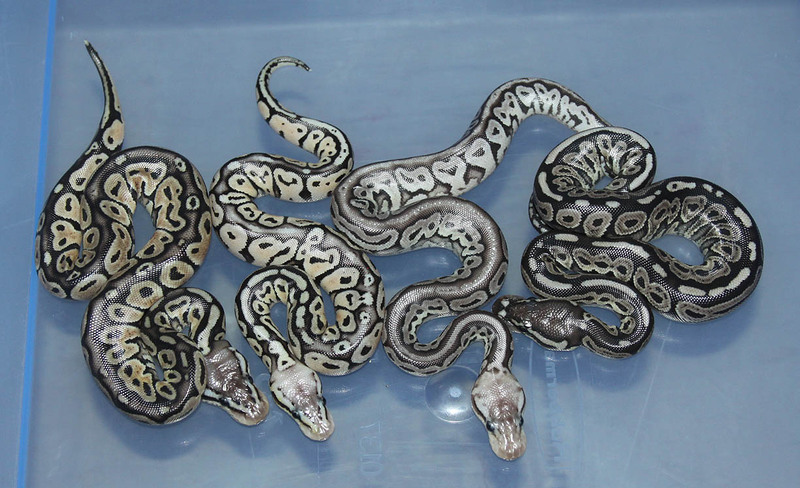 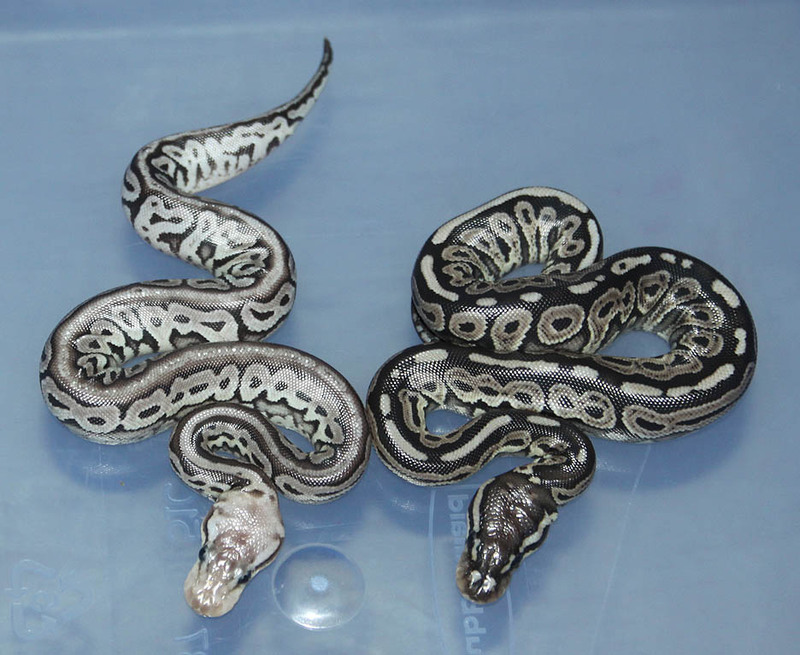 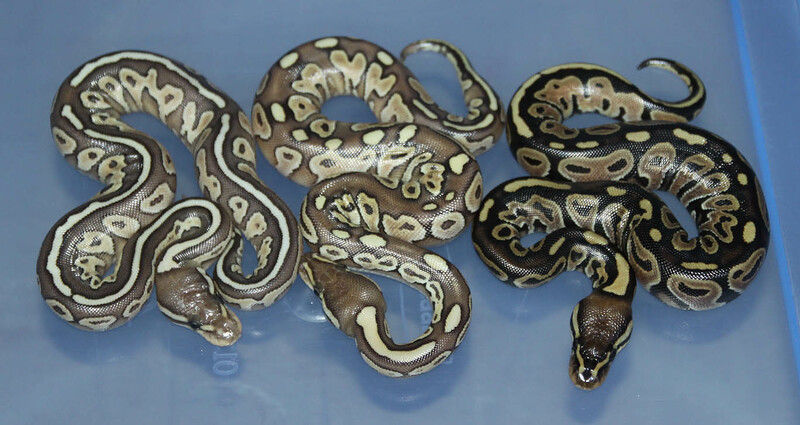 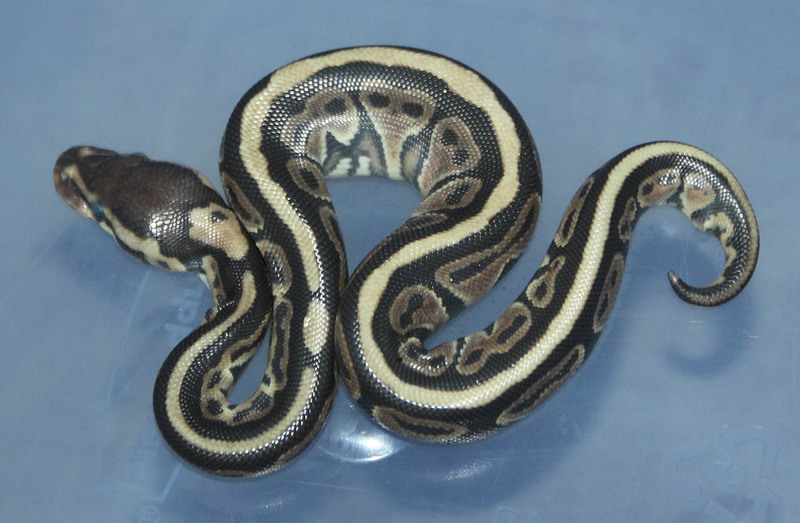 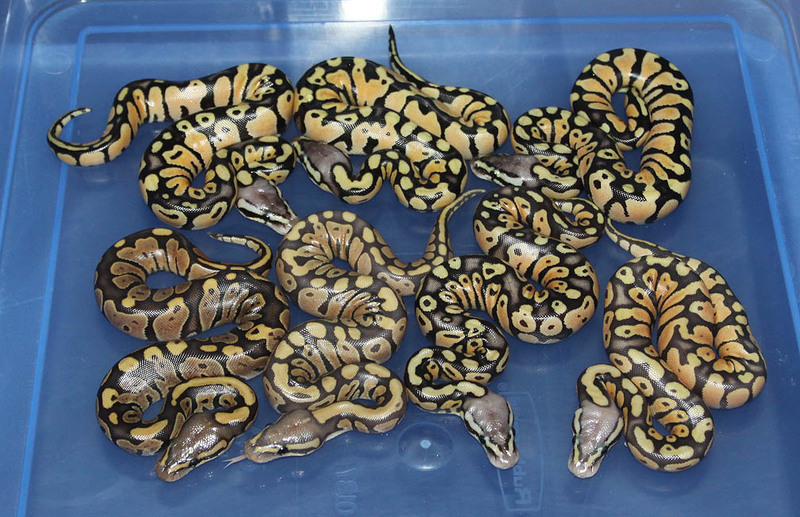 Description: Super Pastel Genetic Stripe 1/10 x Black Stripe Het Genetic Stripe 4/08. 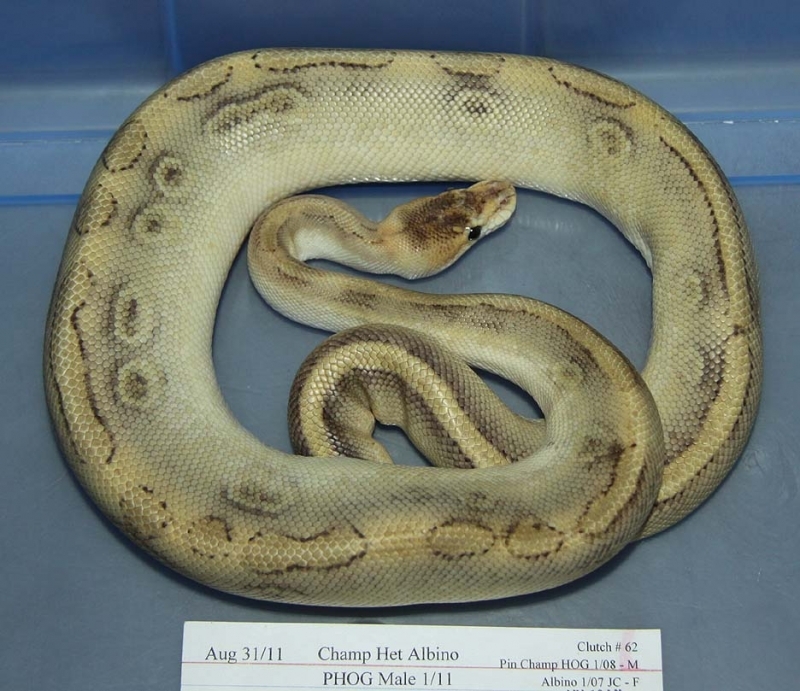 If you are interested in animals from clutch #248 please email or call 519-824-7377. 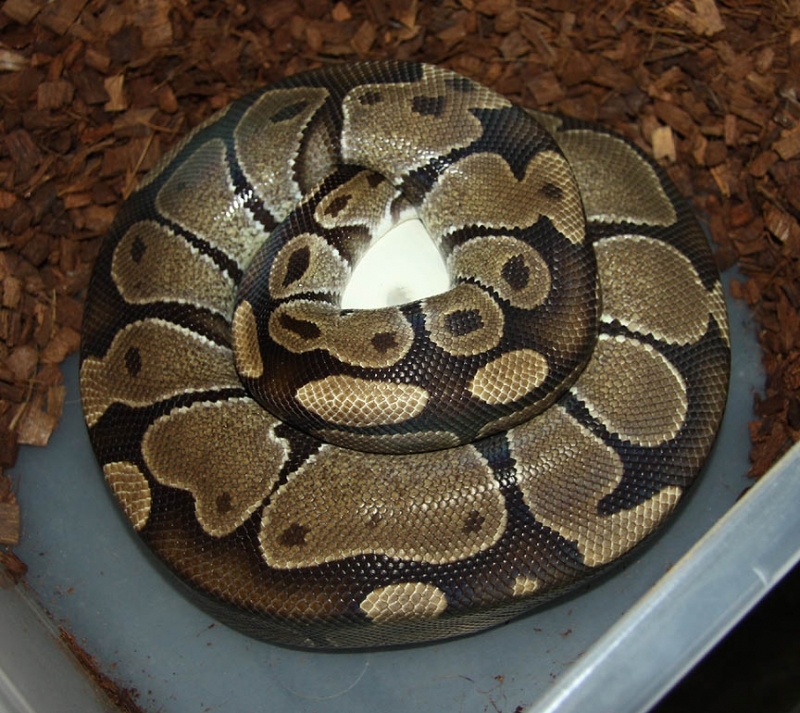 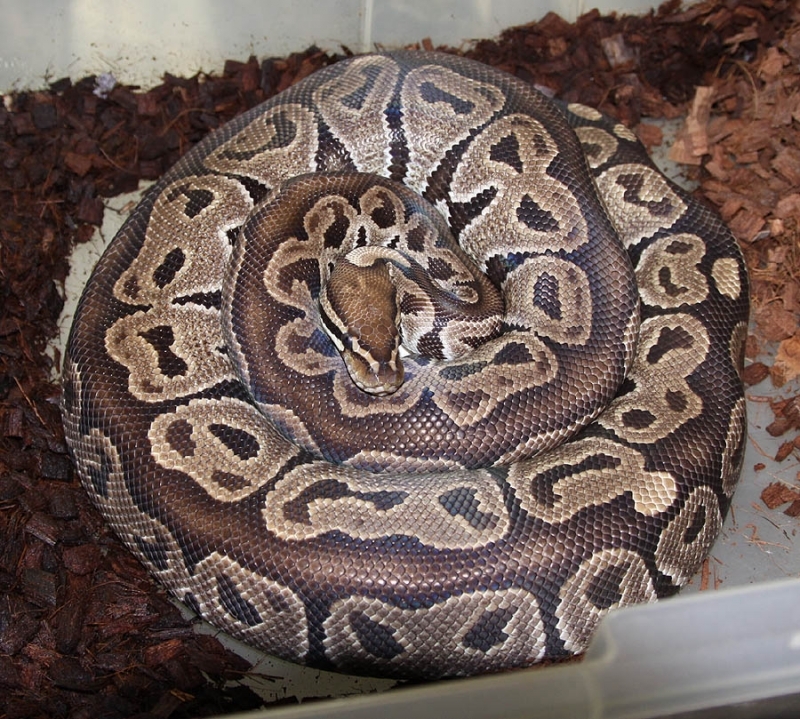 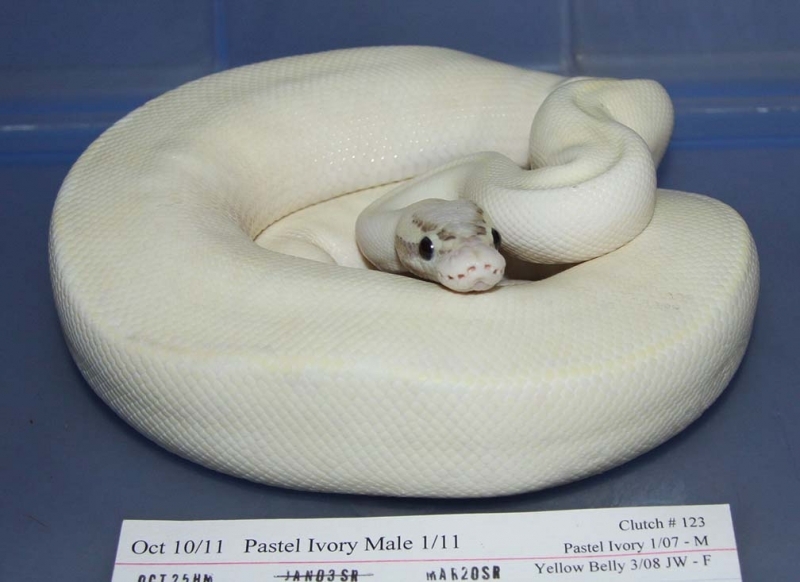 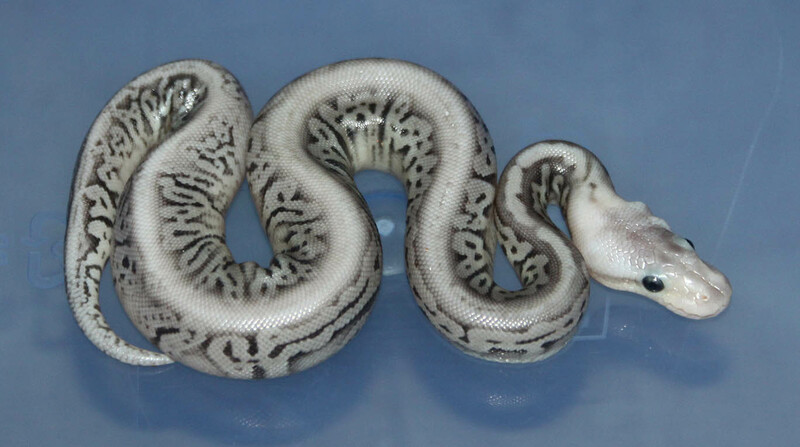 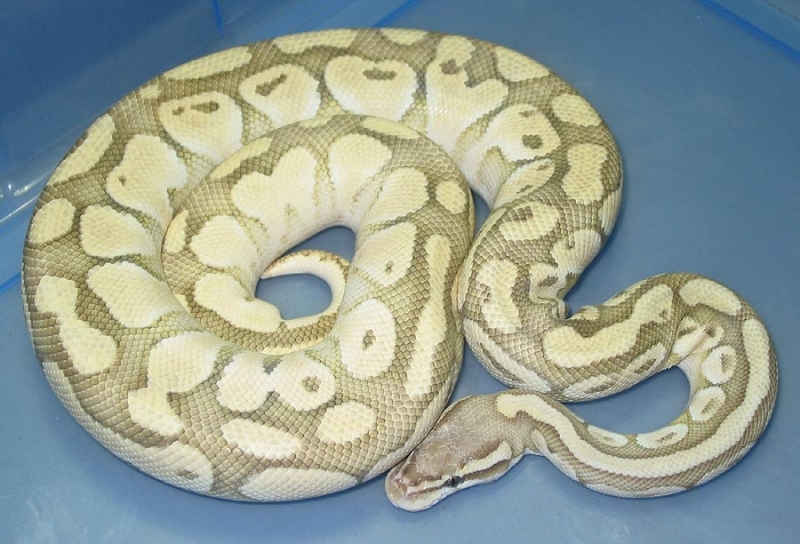 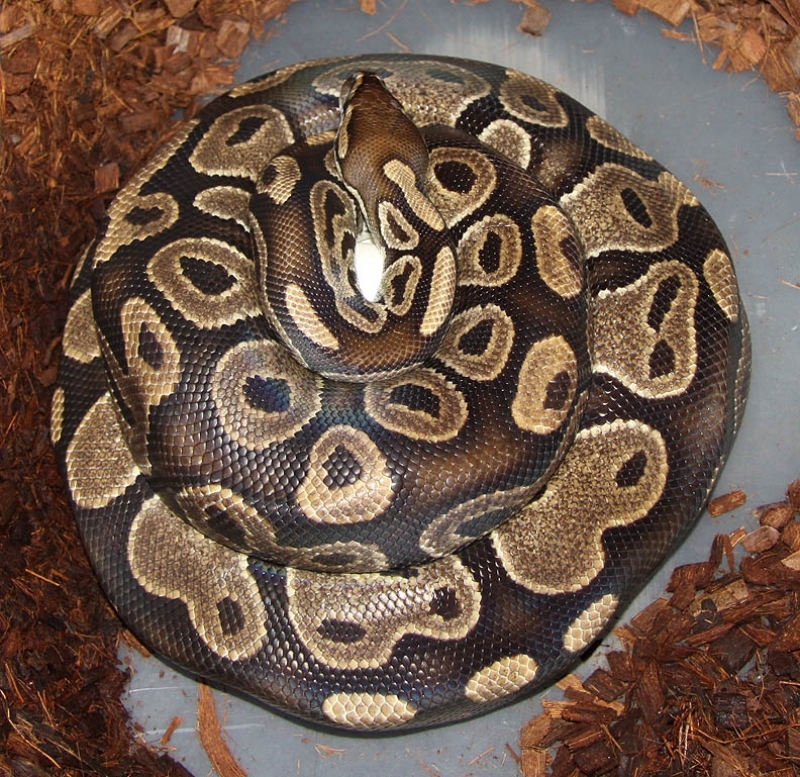 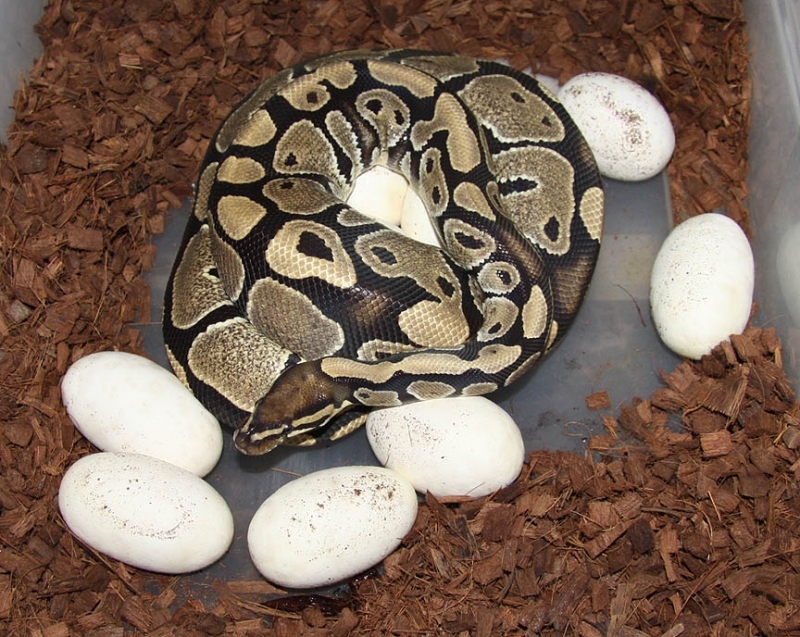 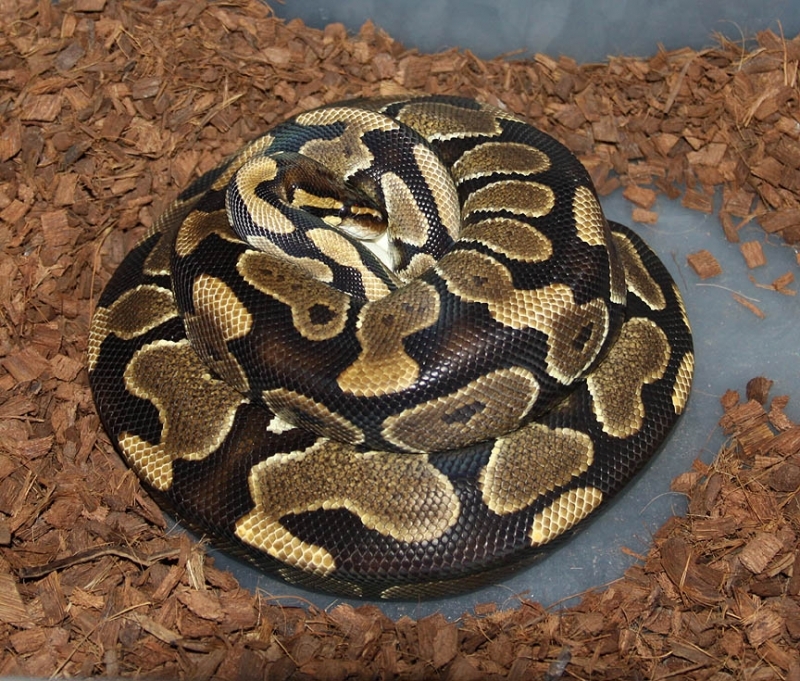 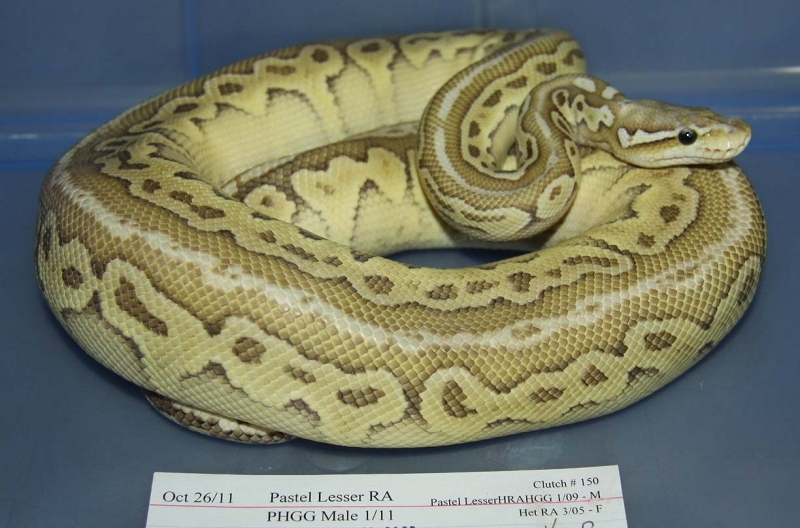 Description: Het RA Het Pied 5/10 x Pastel Het RA Het Pied 1/10. 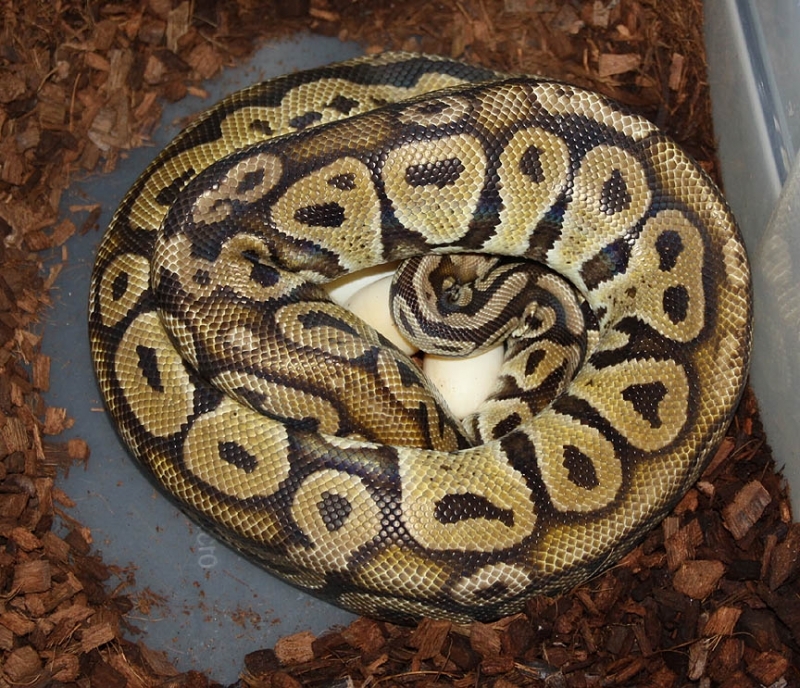 If you are interested in animals from clutch #249 please email or call 519-824-7377. 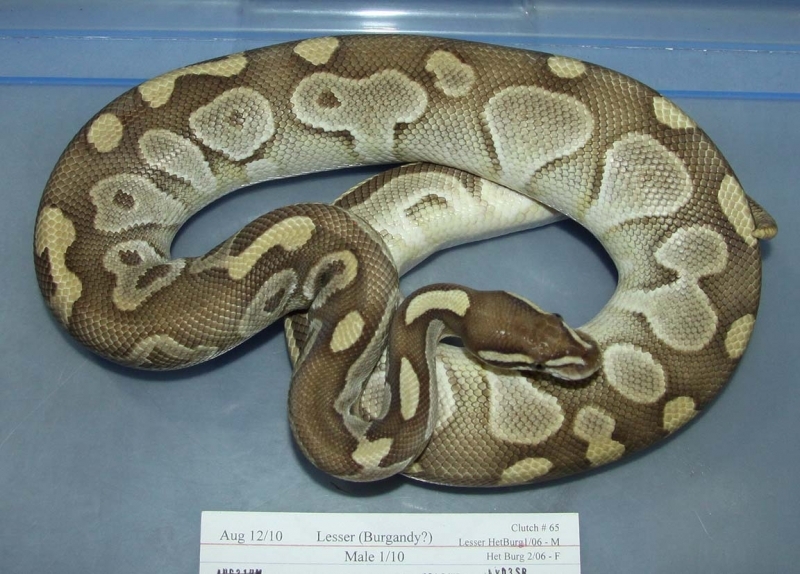 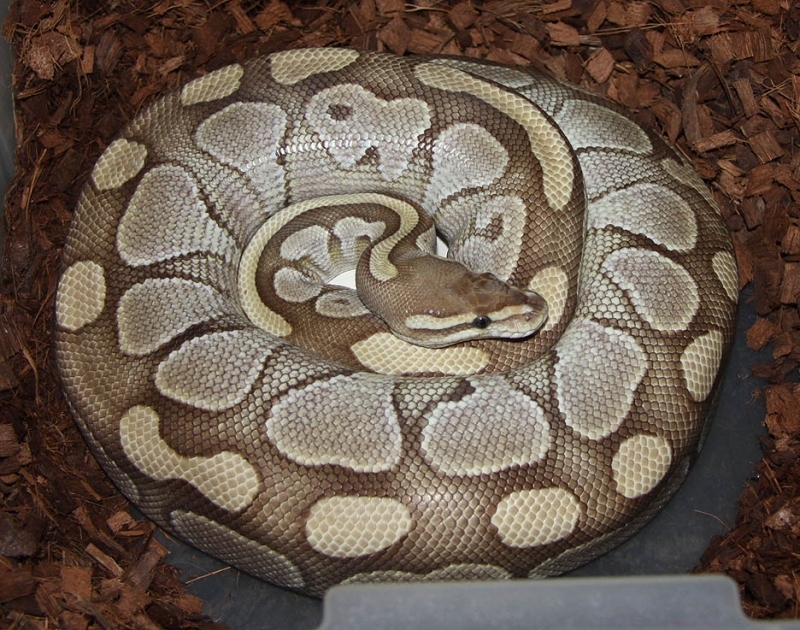 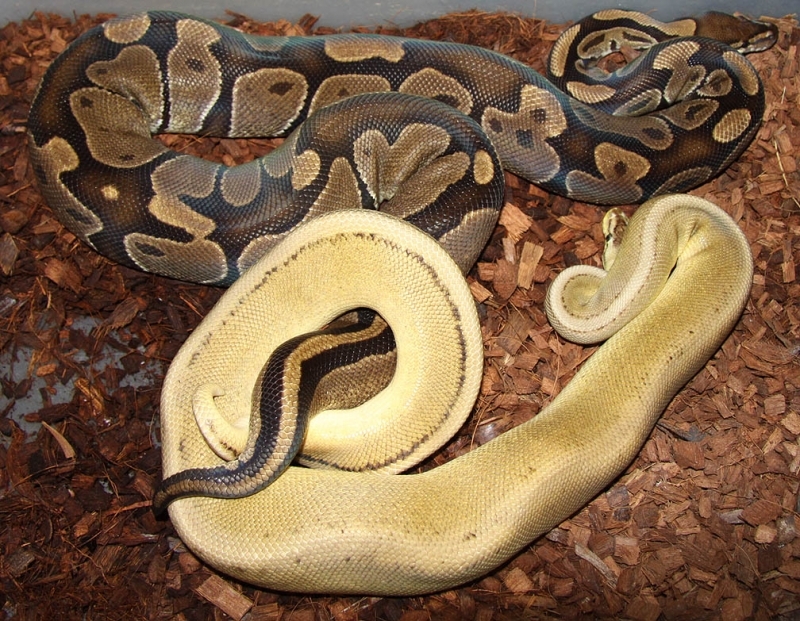 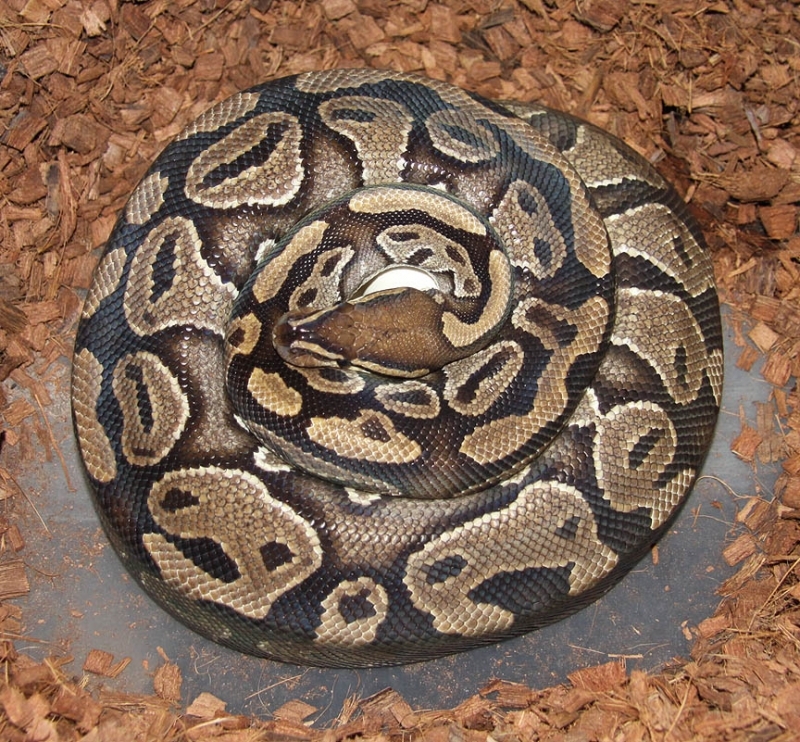 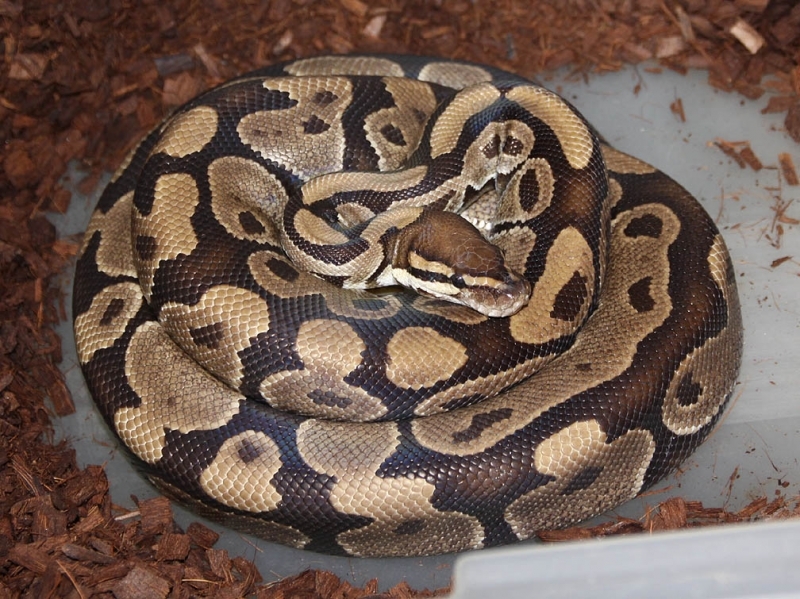 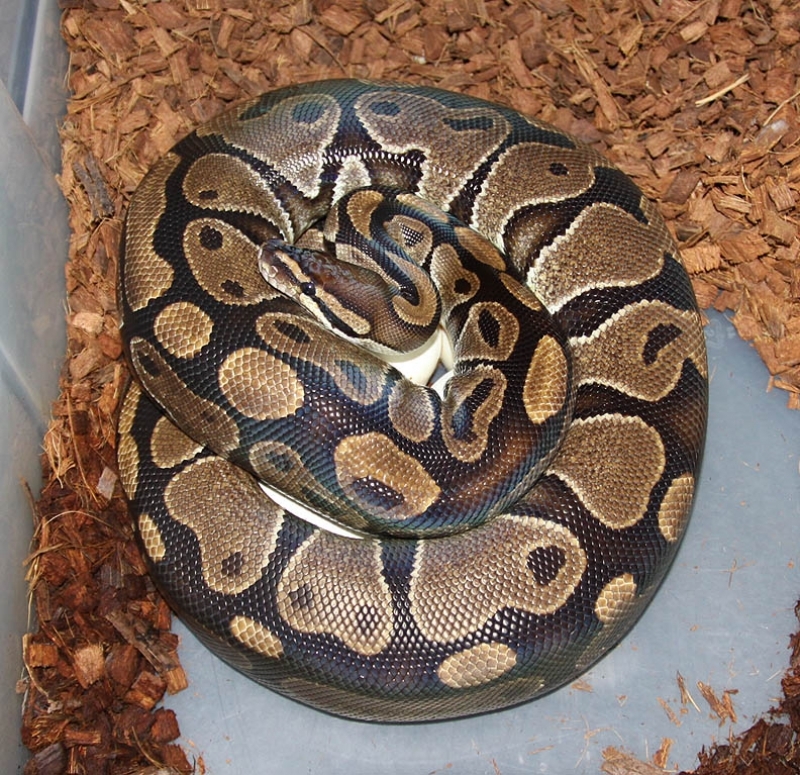 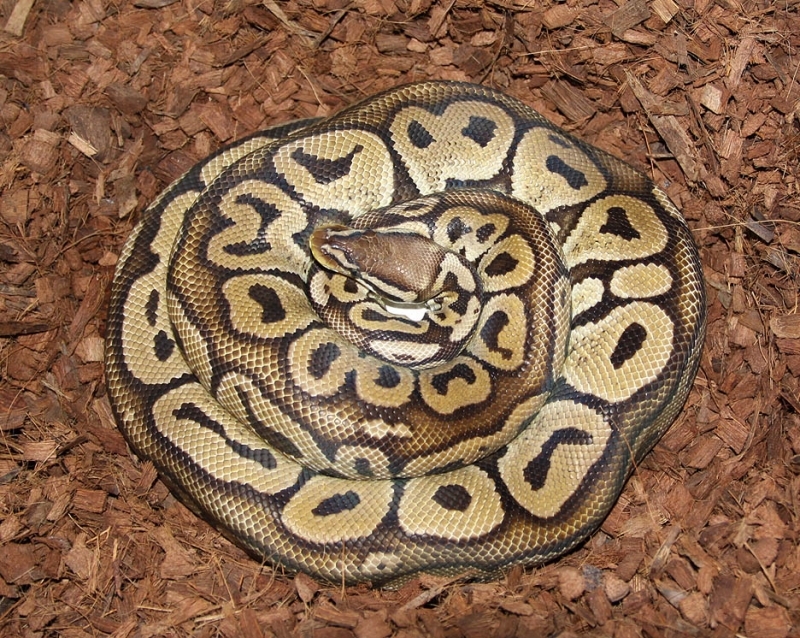 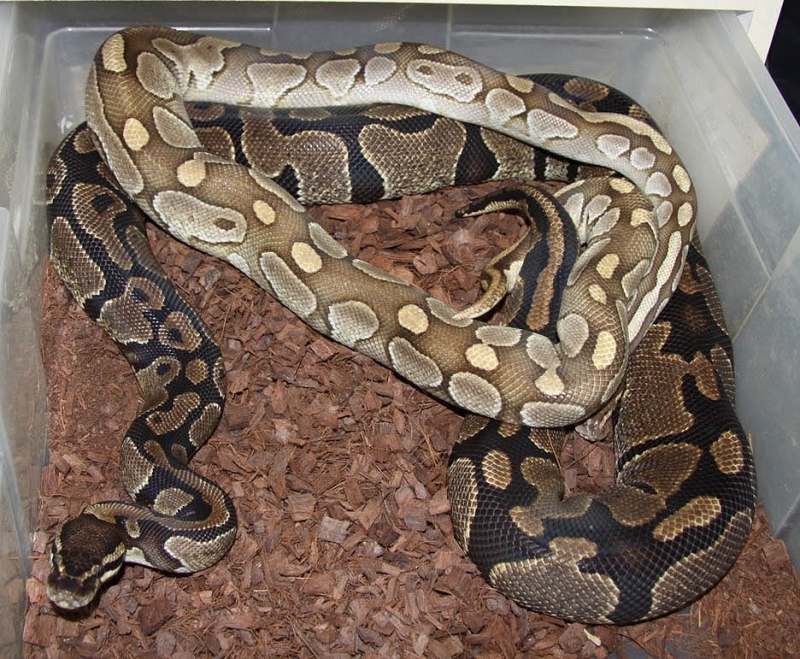 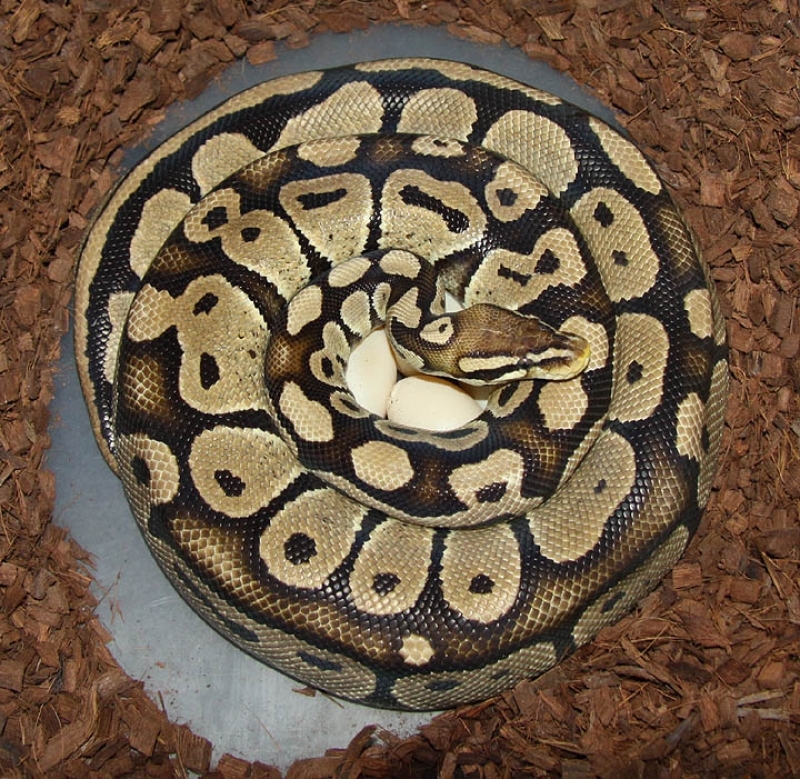 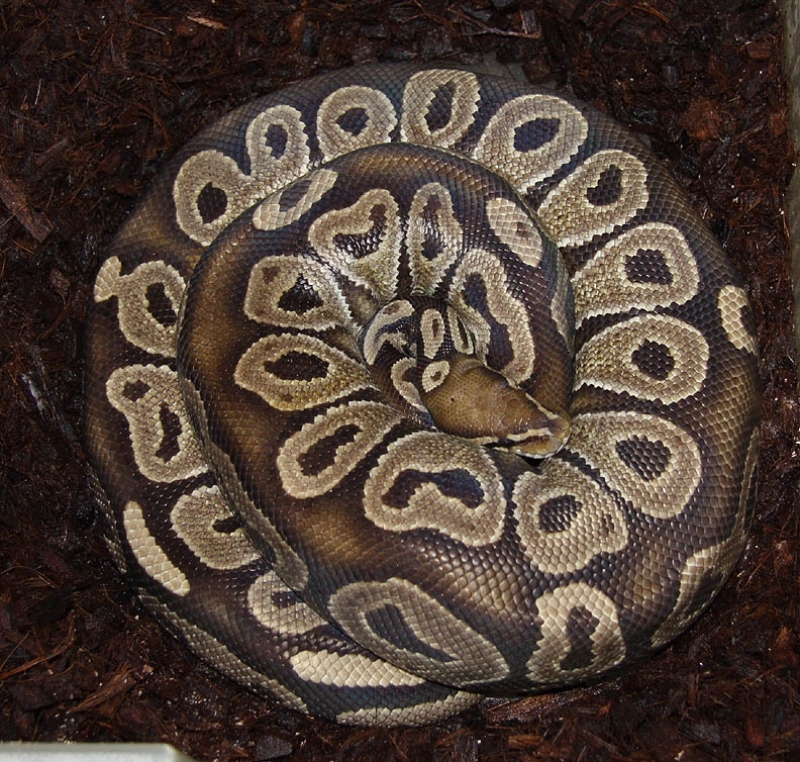 Description: Pastel Caramel Het RA 1/11 x Het RA Het Caramel 2/09. 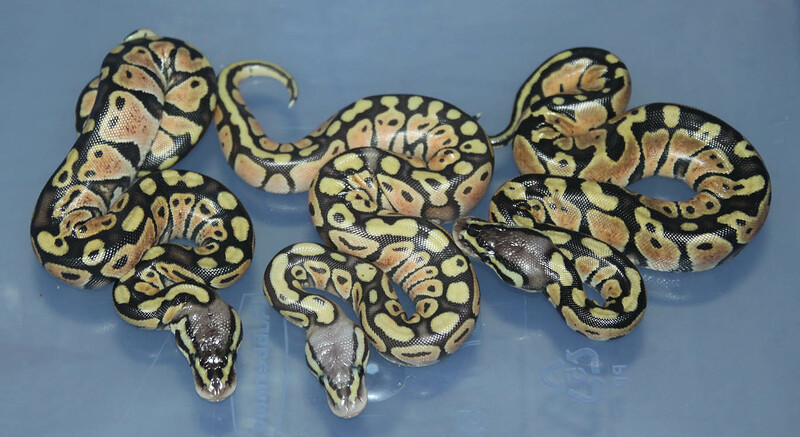 All in all an amazing season!! 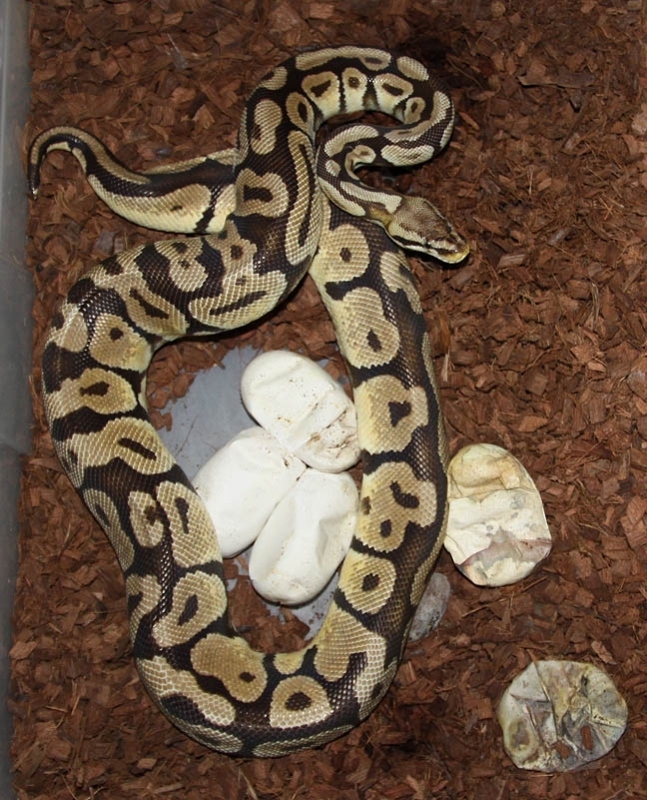 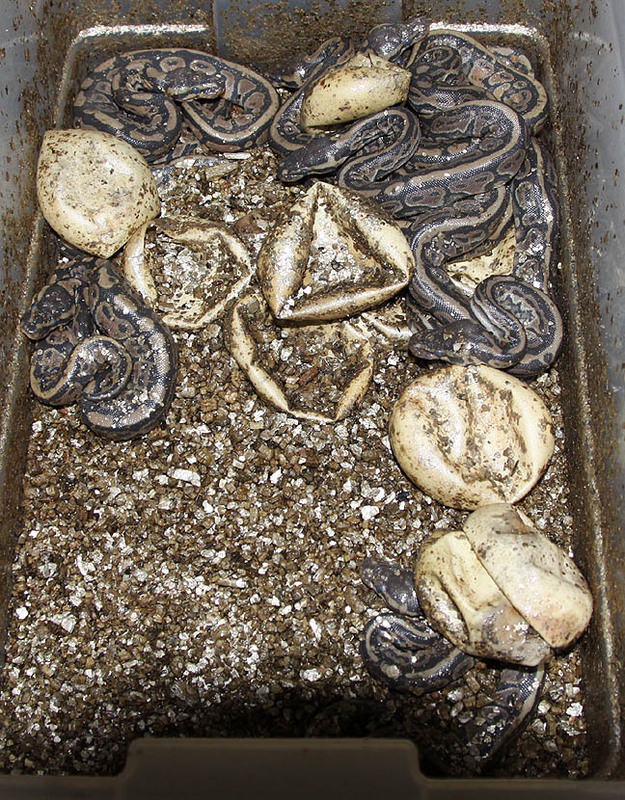 If you are interested in animals from clutch #250 please email or call 519-824-7377.